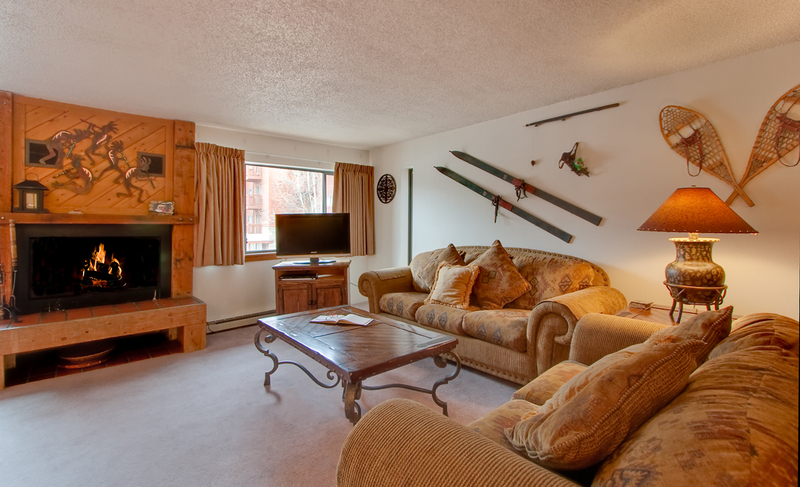 NEW THIS WINTER: Free shuttle to slopes! 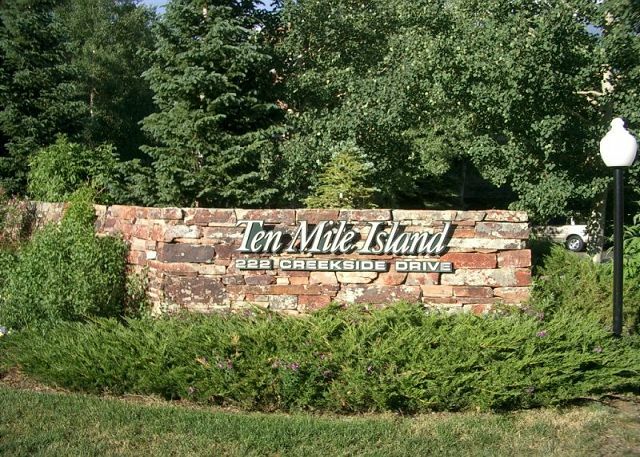 There’s a new shuttle stop less than 50 yards from the driveway. 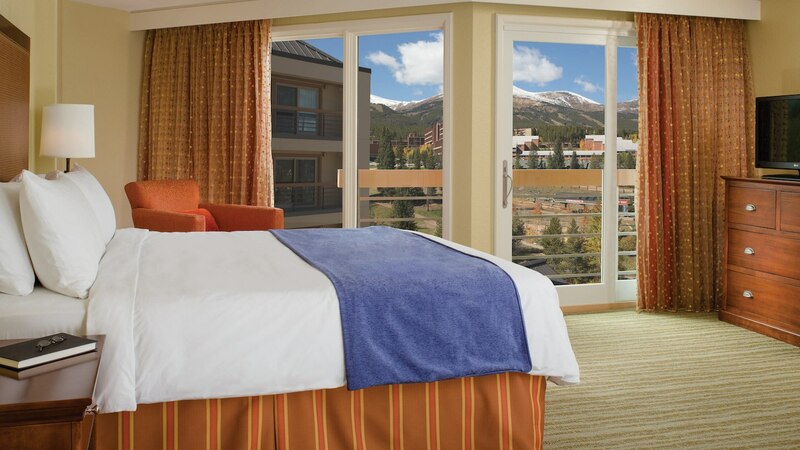 Take the shuttle to the Marriot on Columbine Rd. 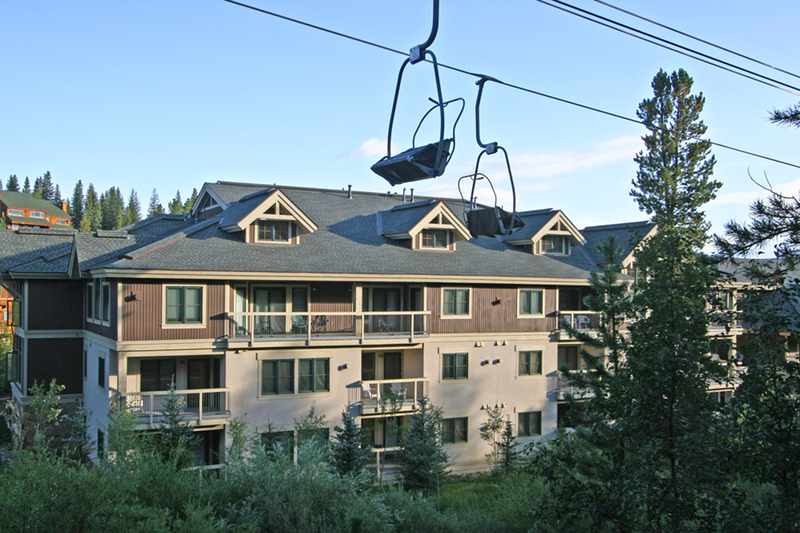 From there, it’s just a five-minute walk to the Quicksilver Lift at the base of Peak 9. 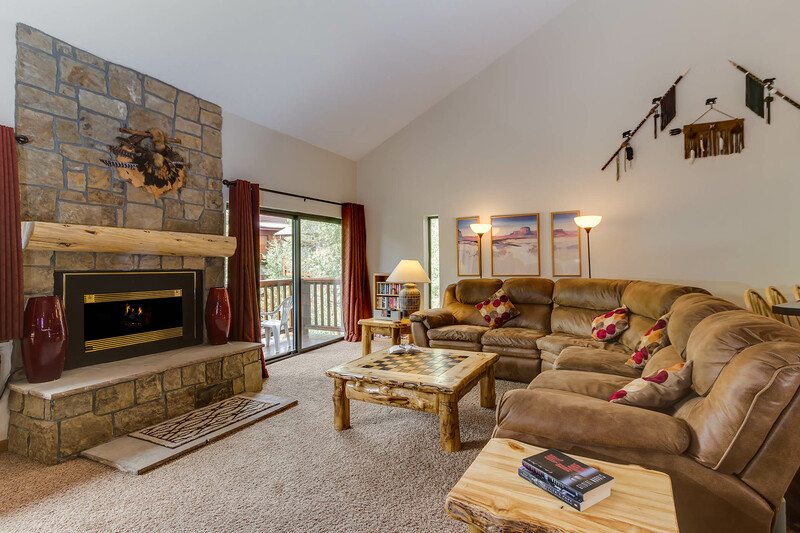 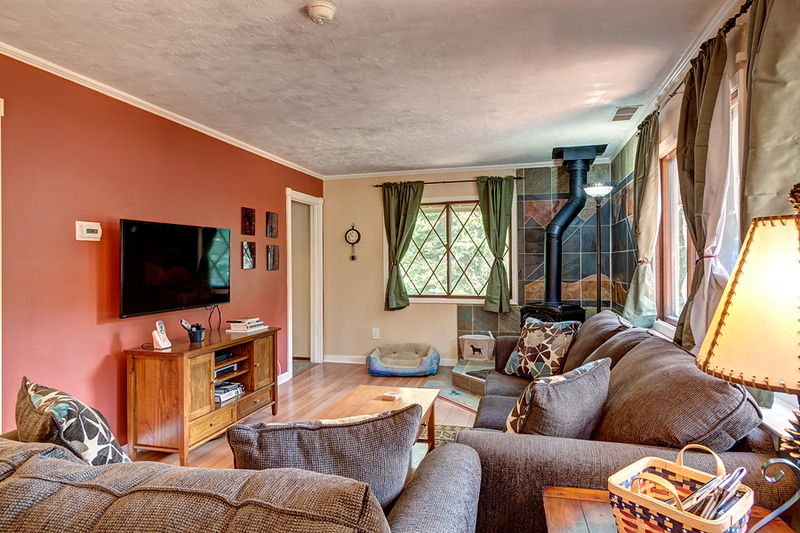 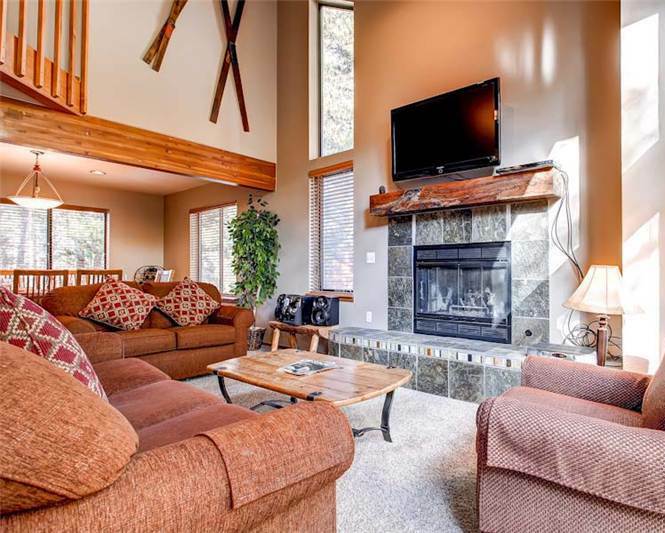 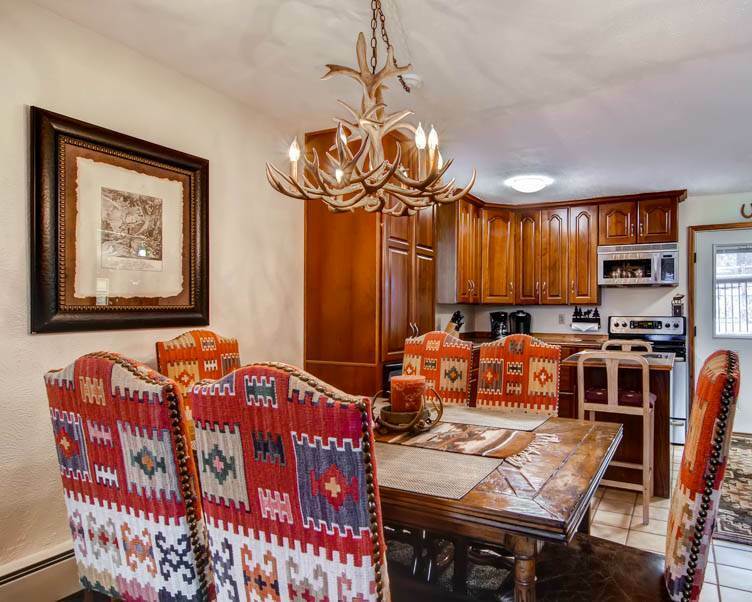 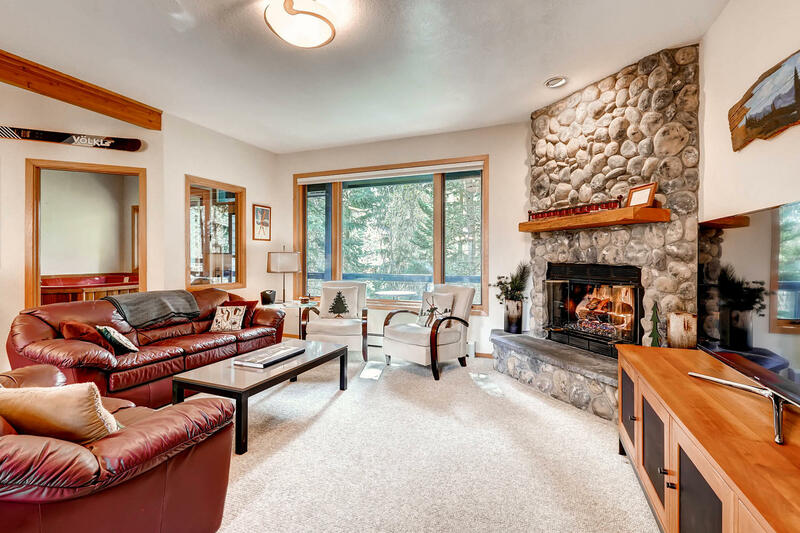 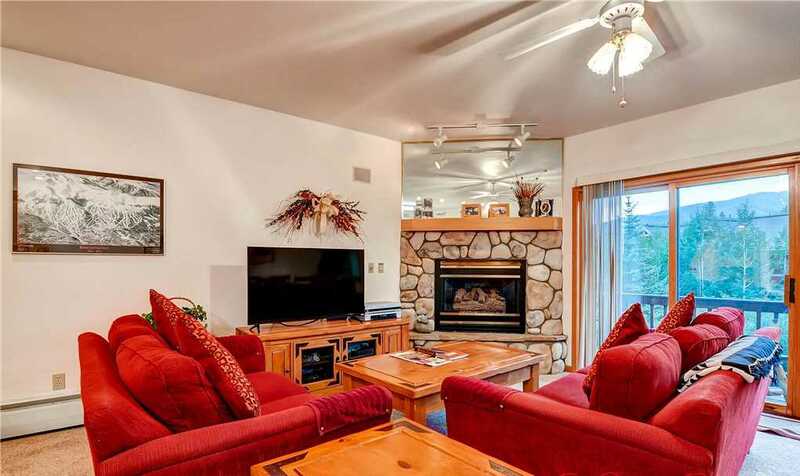 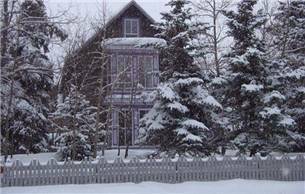 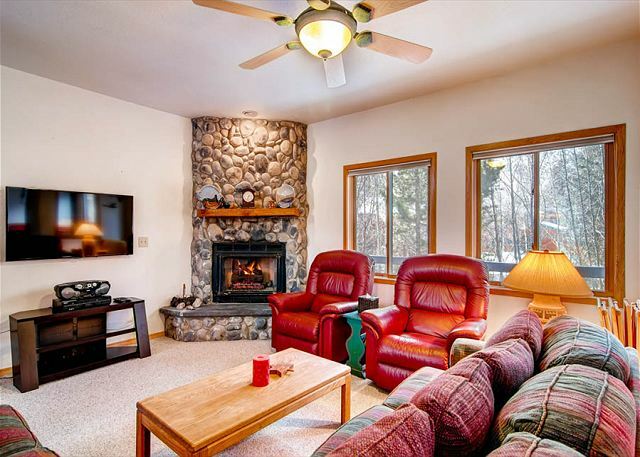 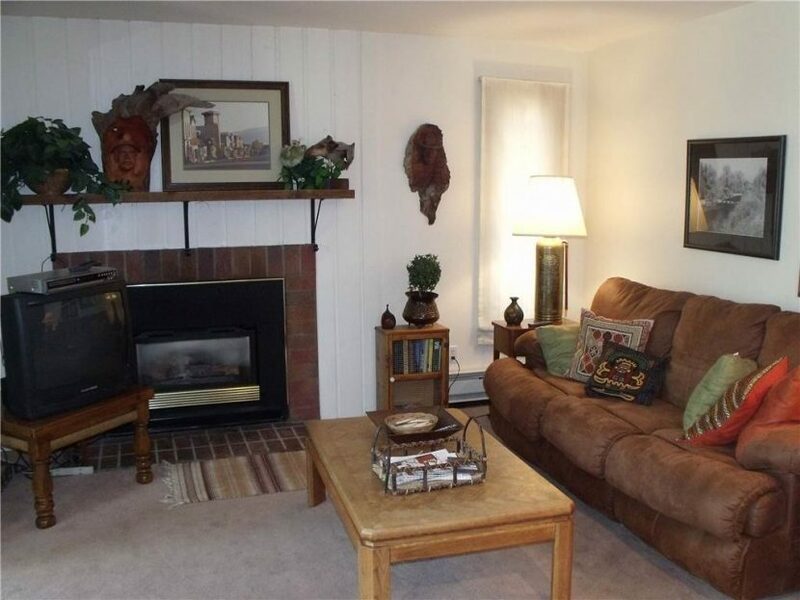 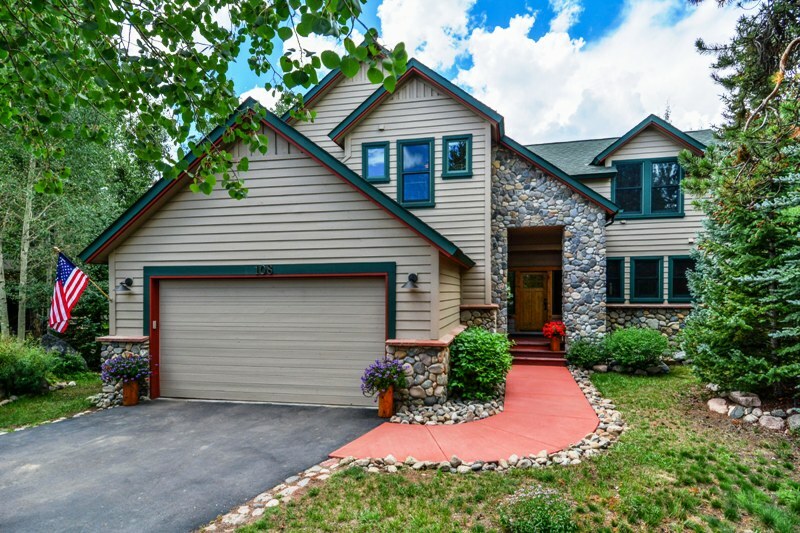 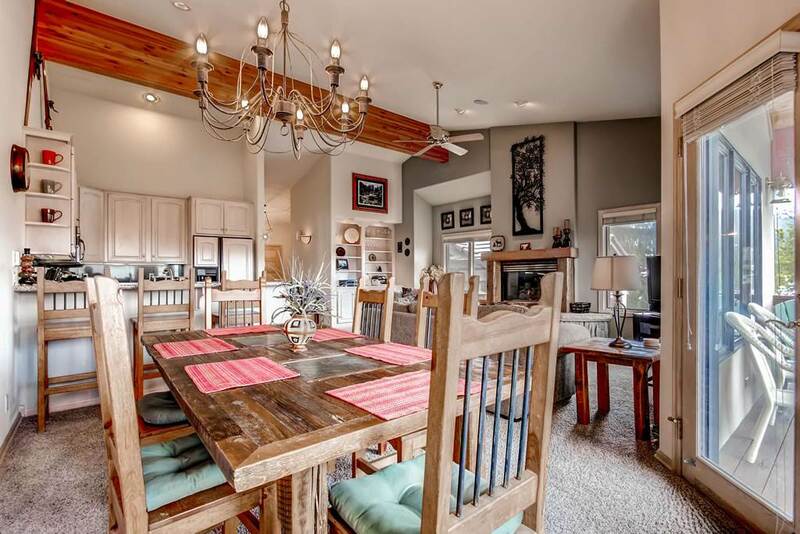 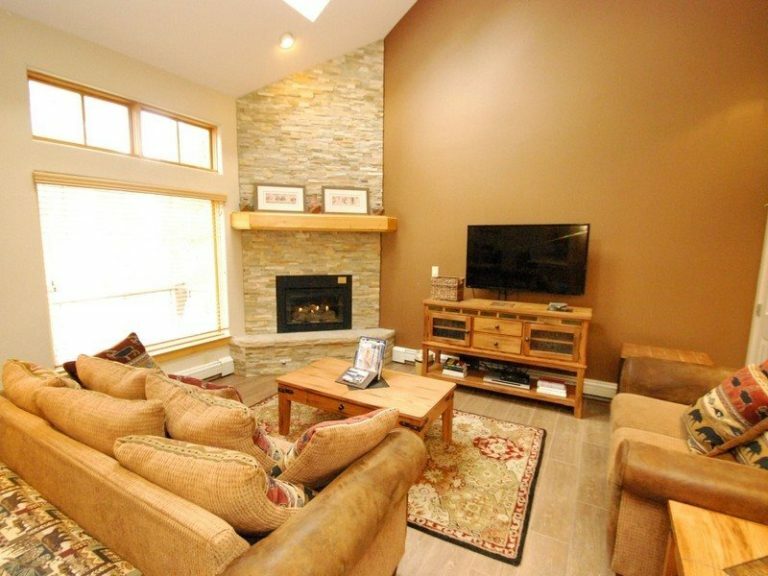 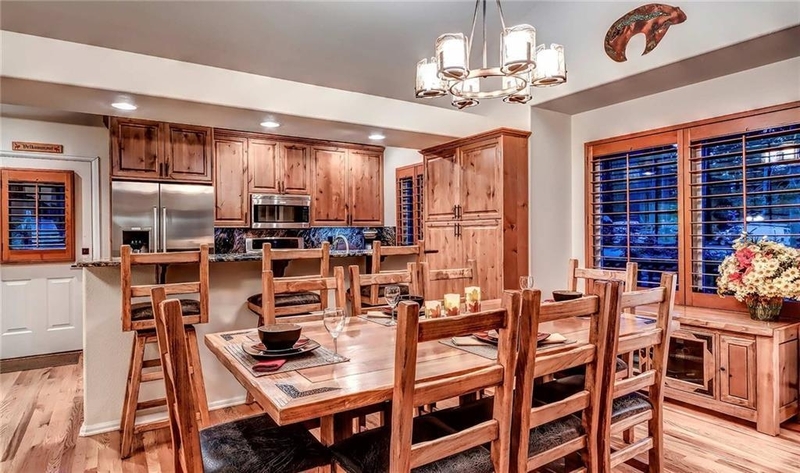 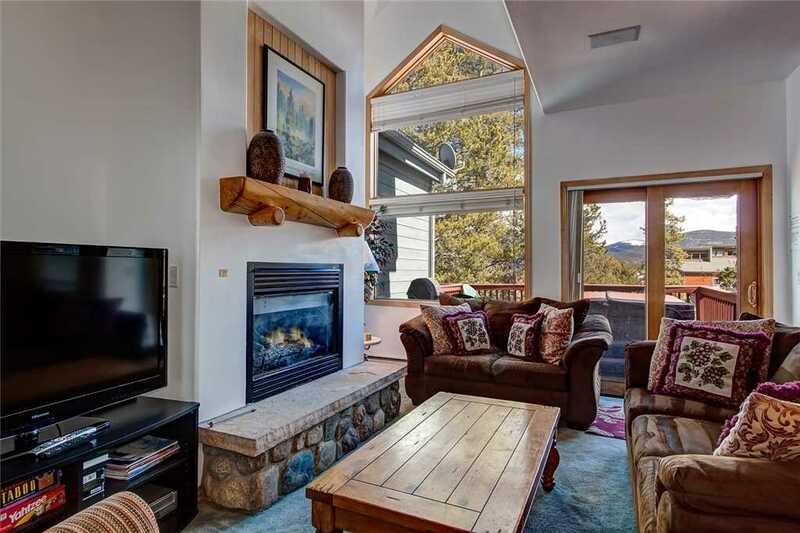 Here’s a real find for large groups and family gatherings: A spacious (4,300 square feet) five-bedroom, five-bathroom mountain home that can accommodate up to 20 guests — at a great price! 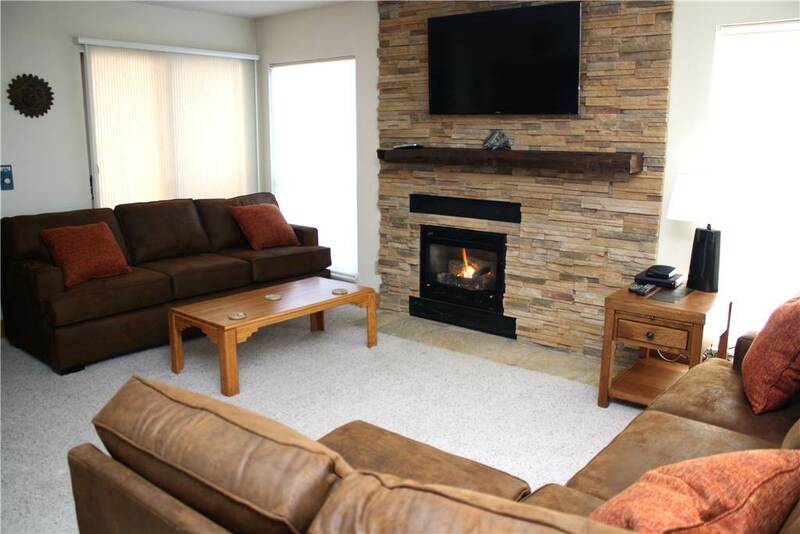 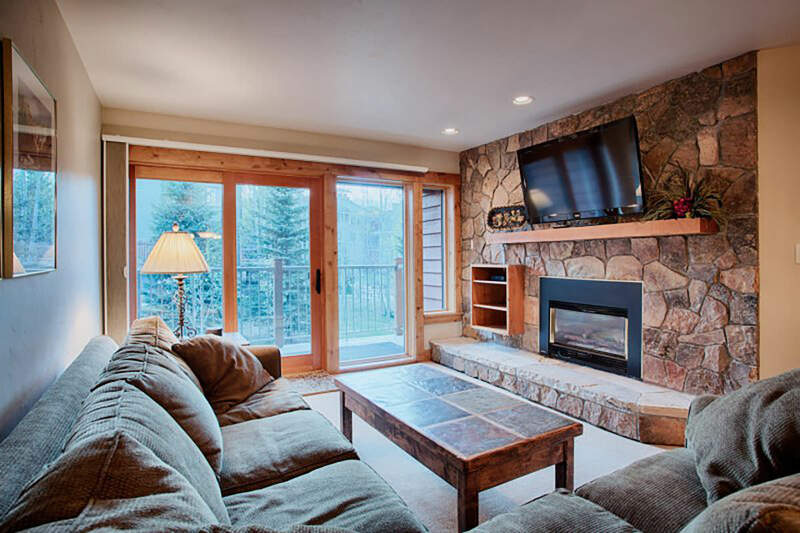 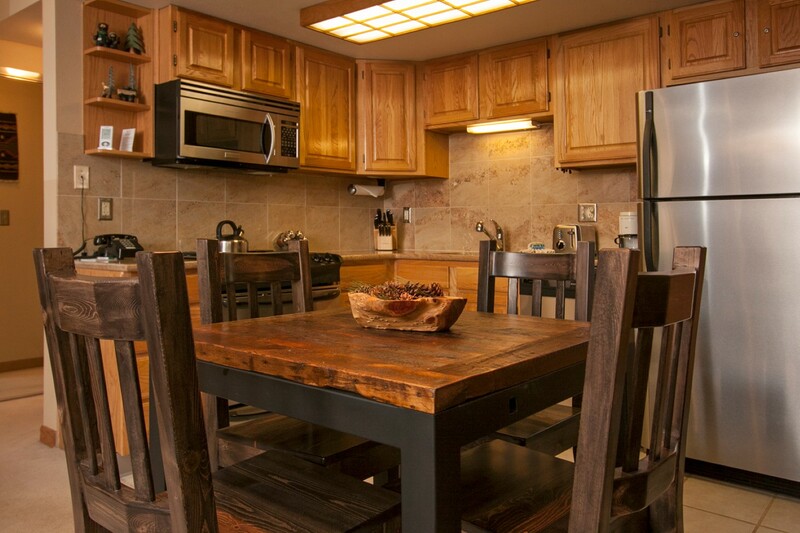 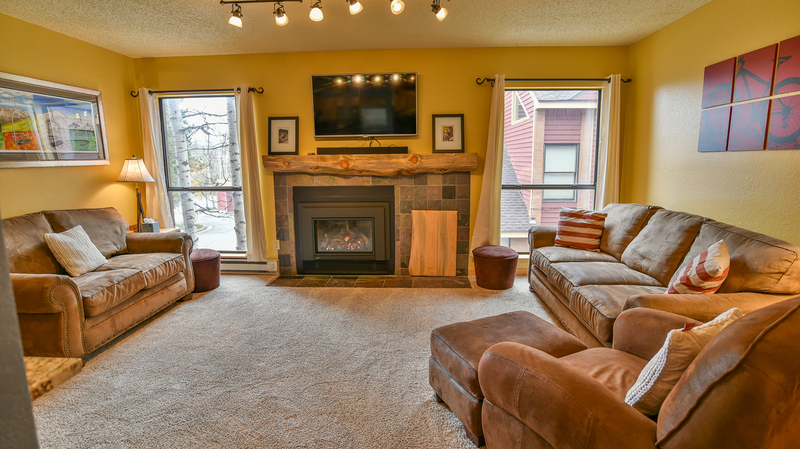 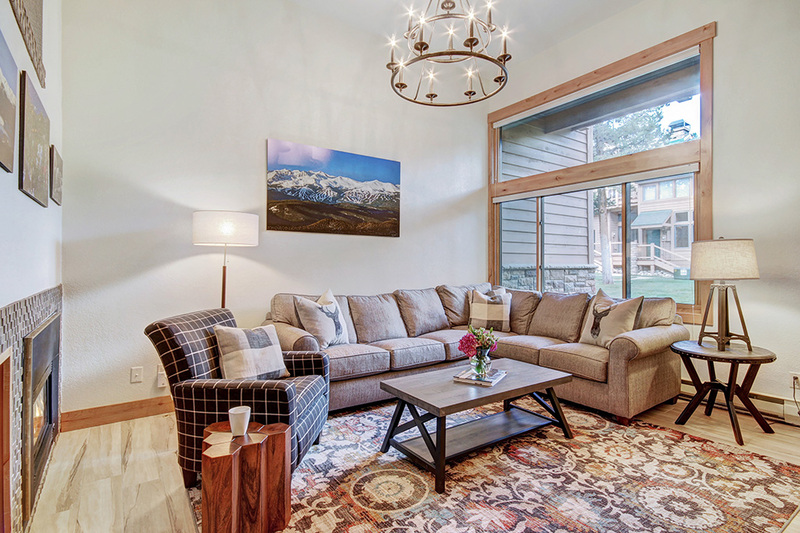 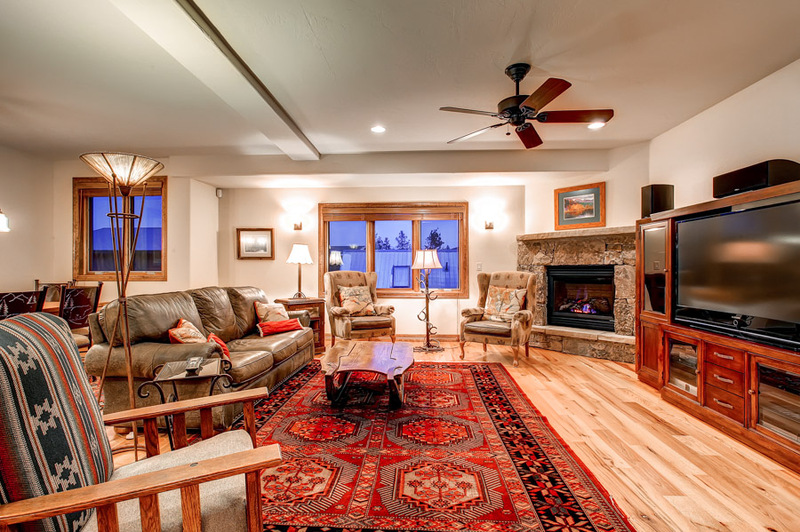 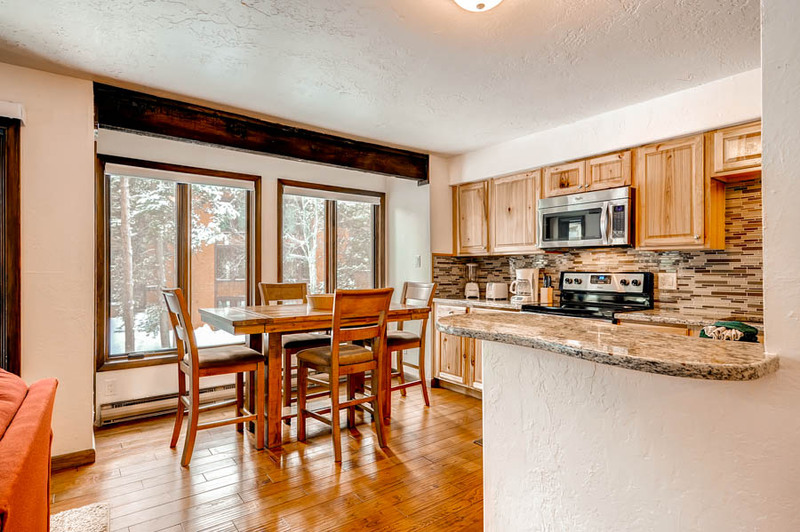 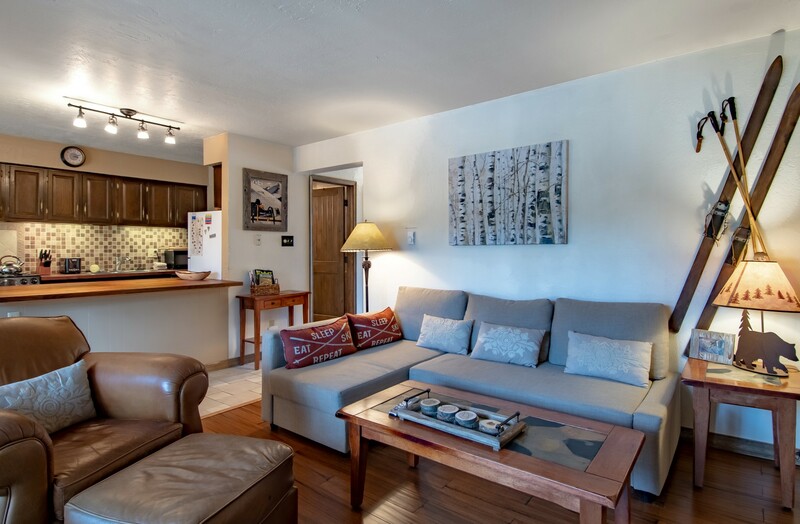 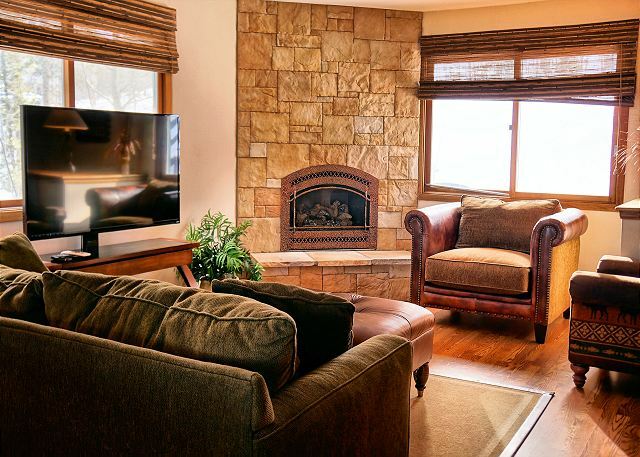 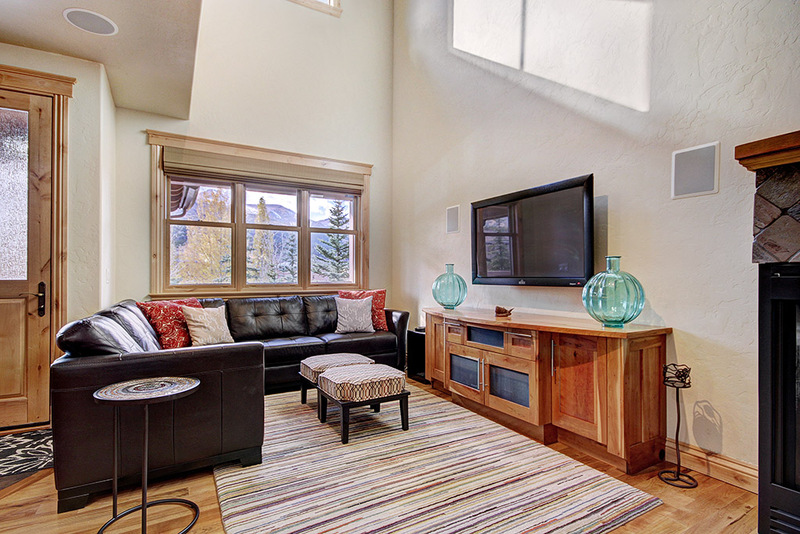 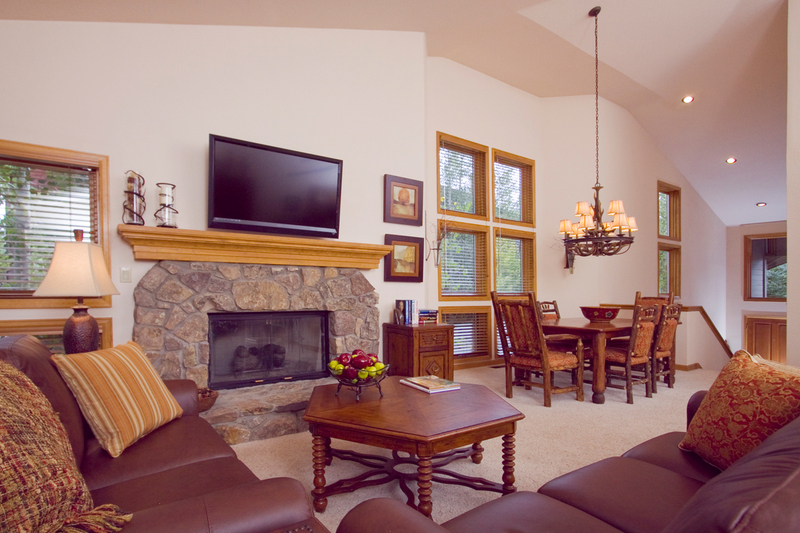 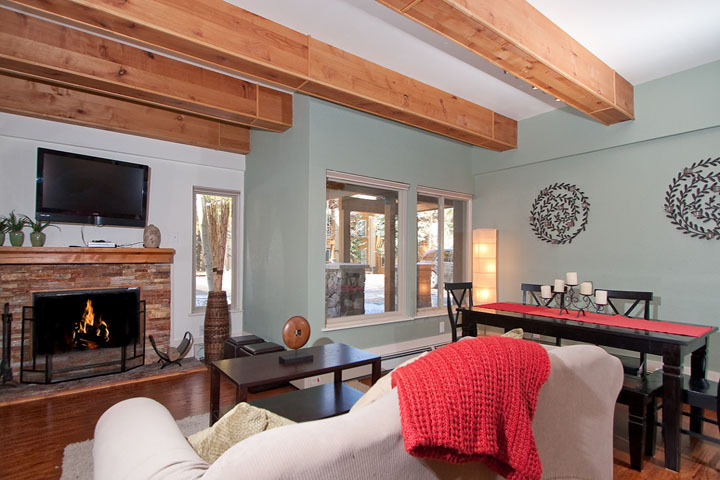 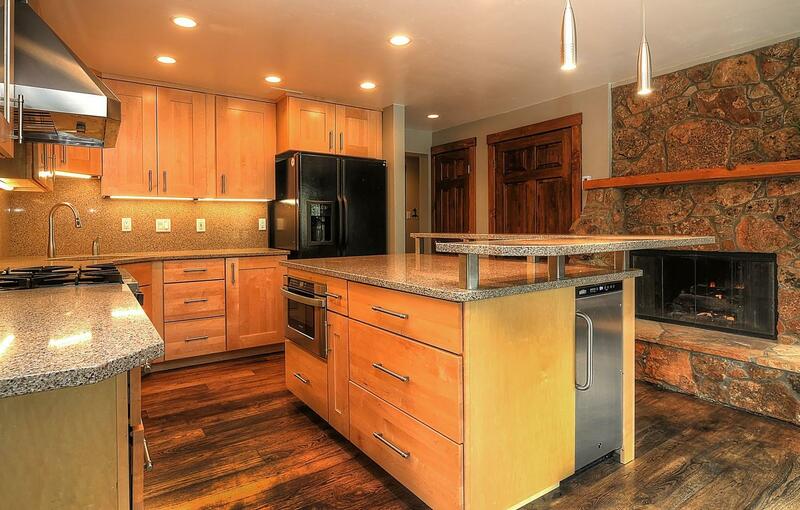 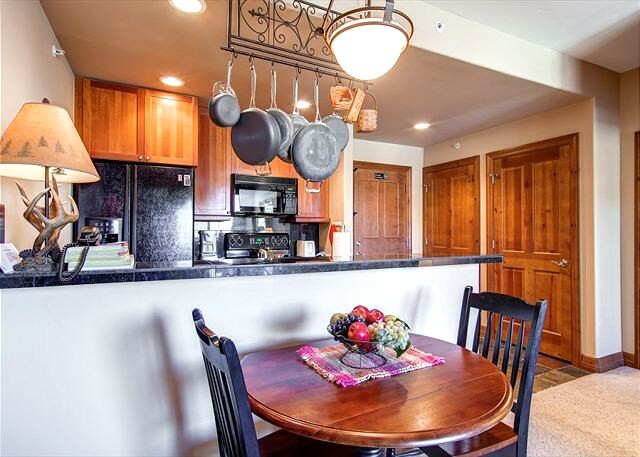 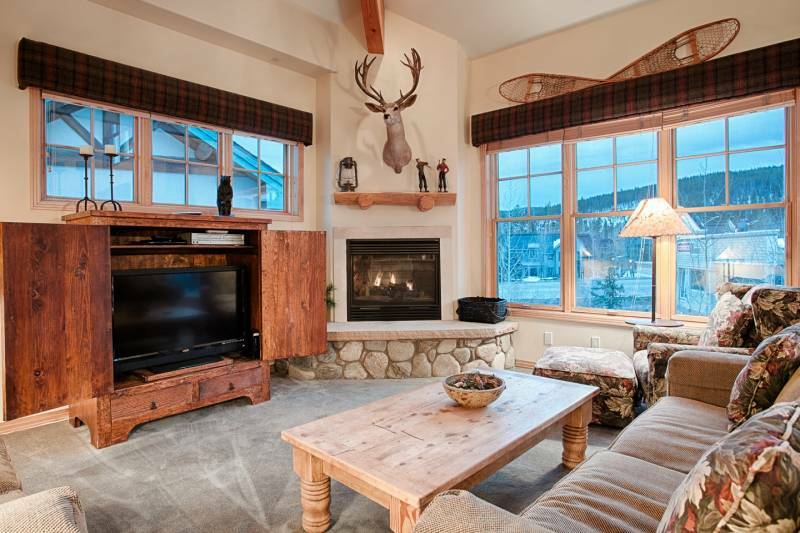 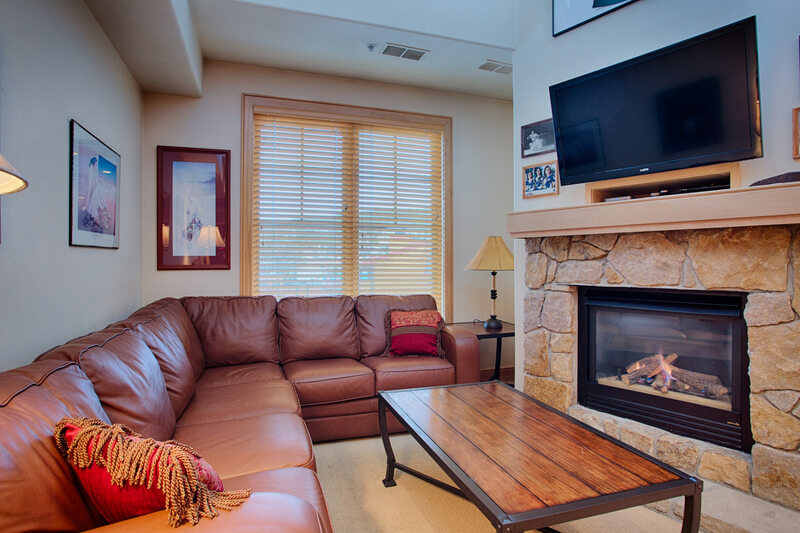 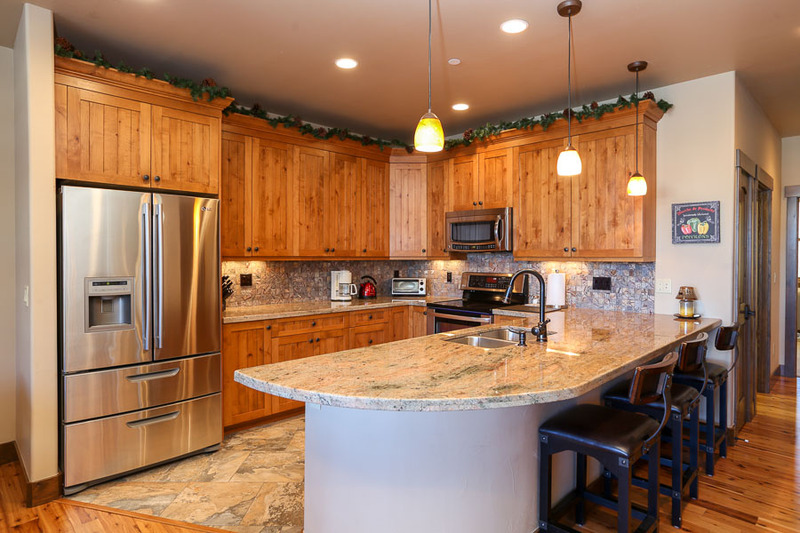 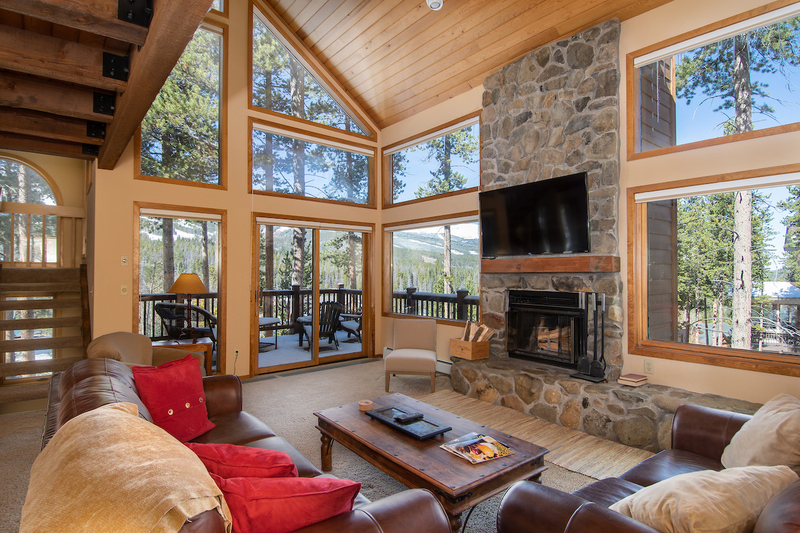 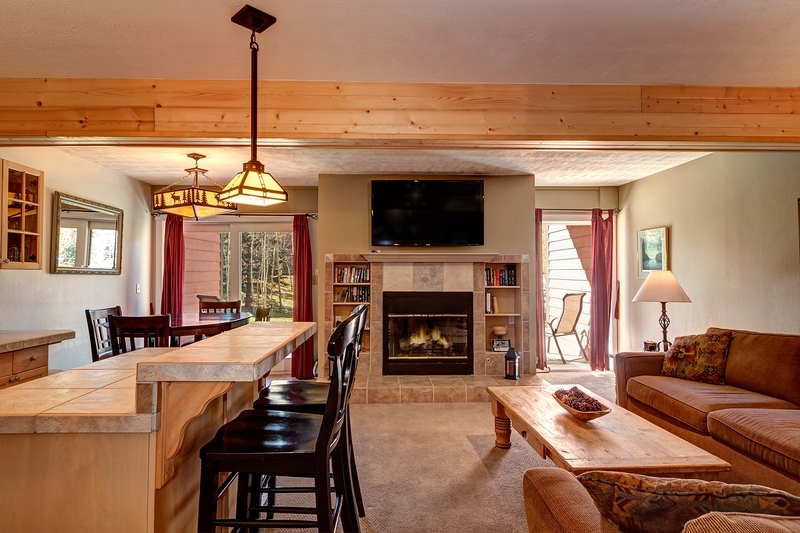 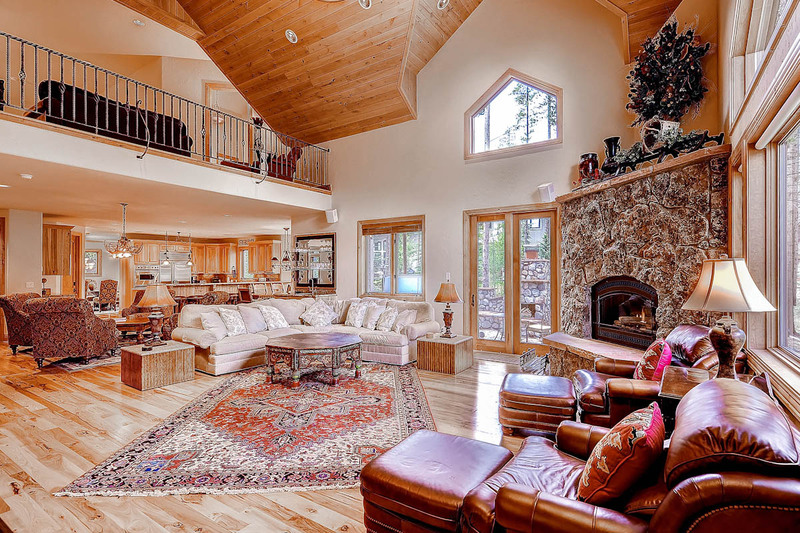 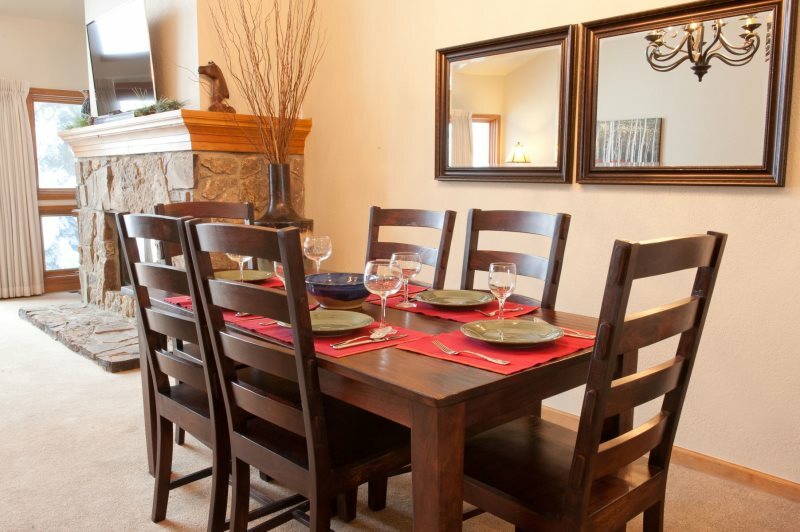 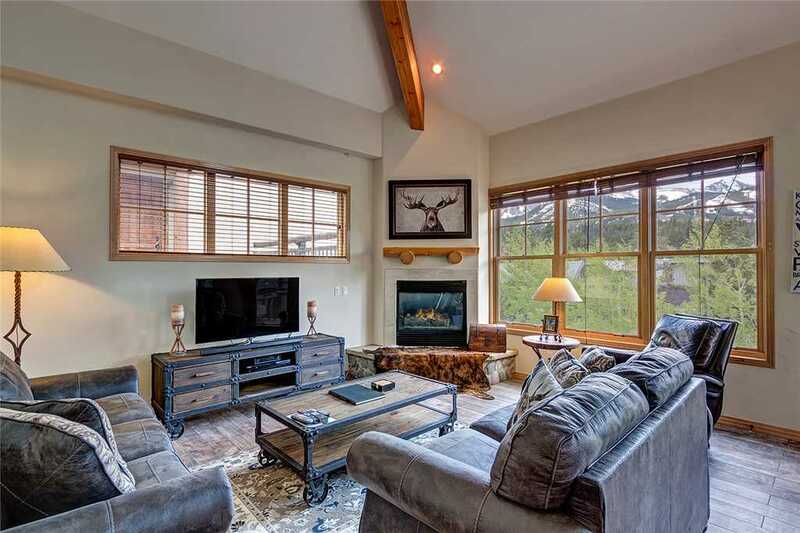 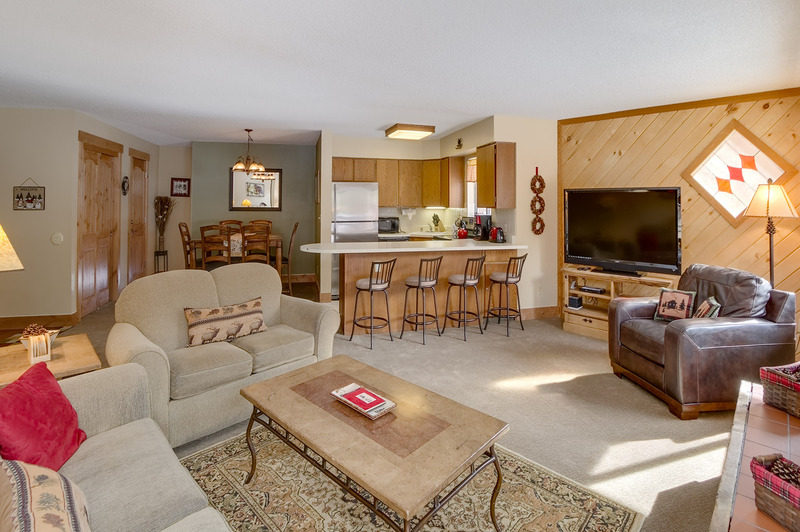 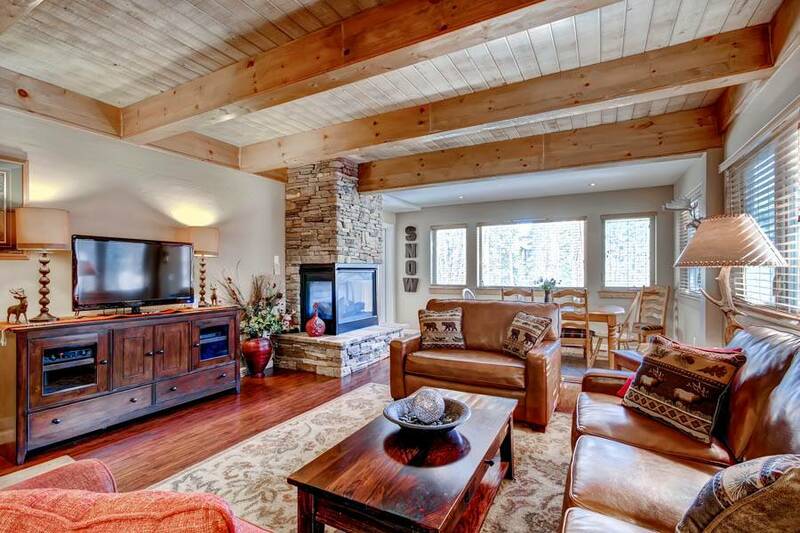 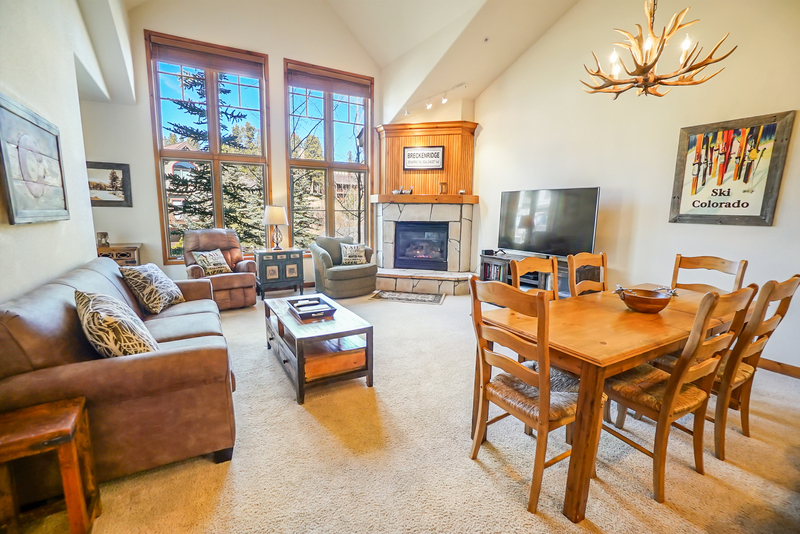 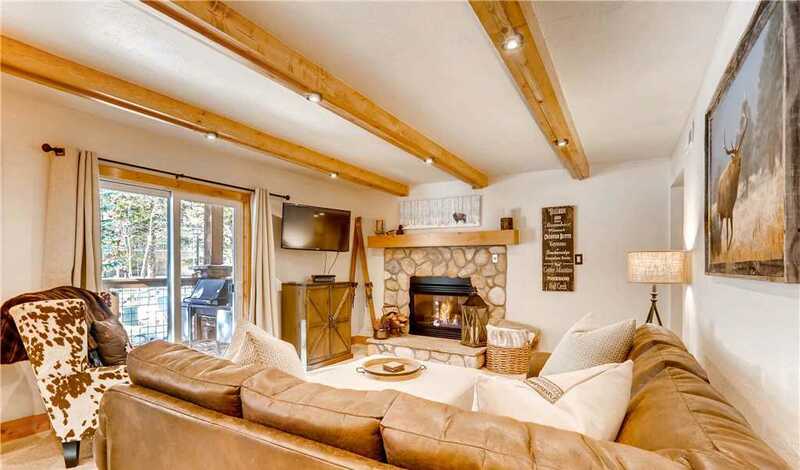 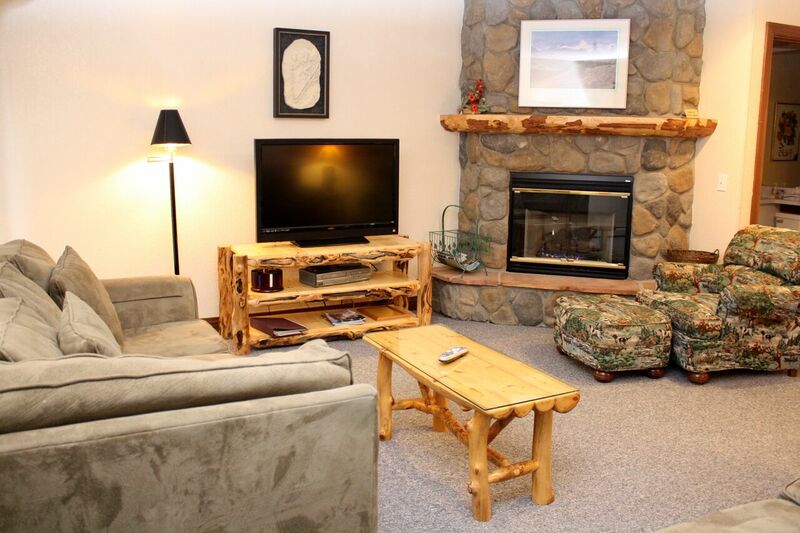 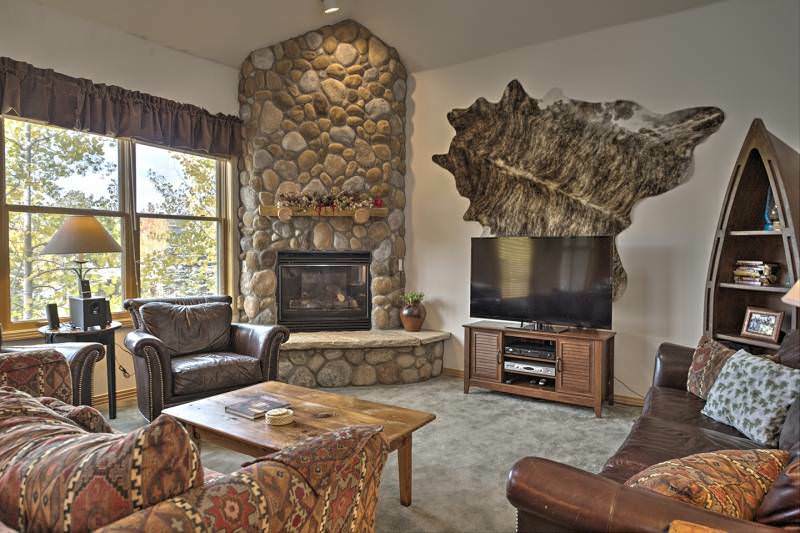 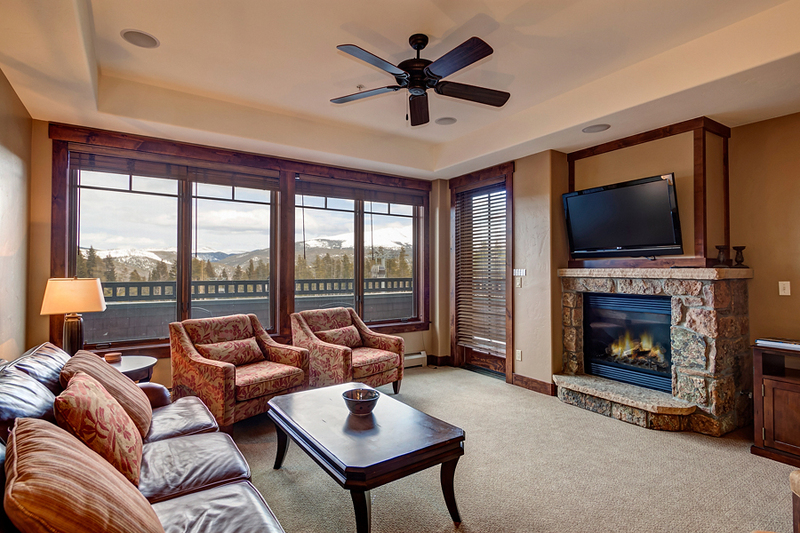 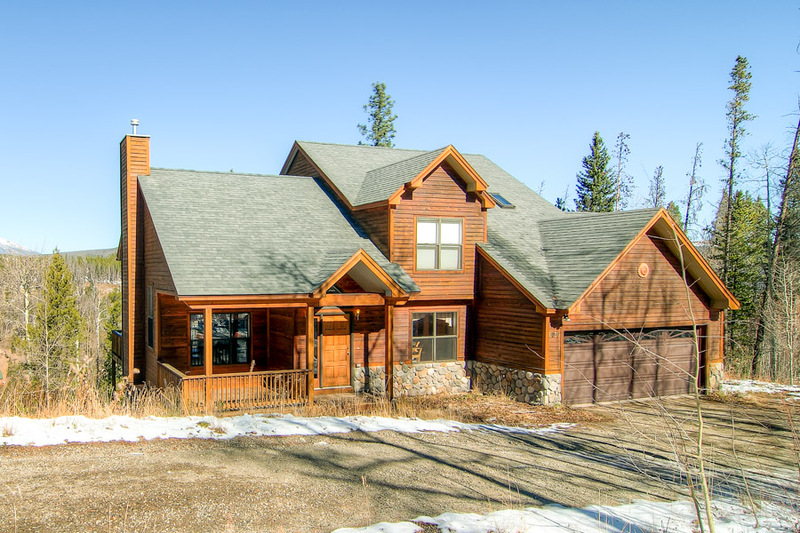 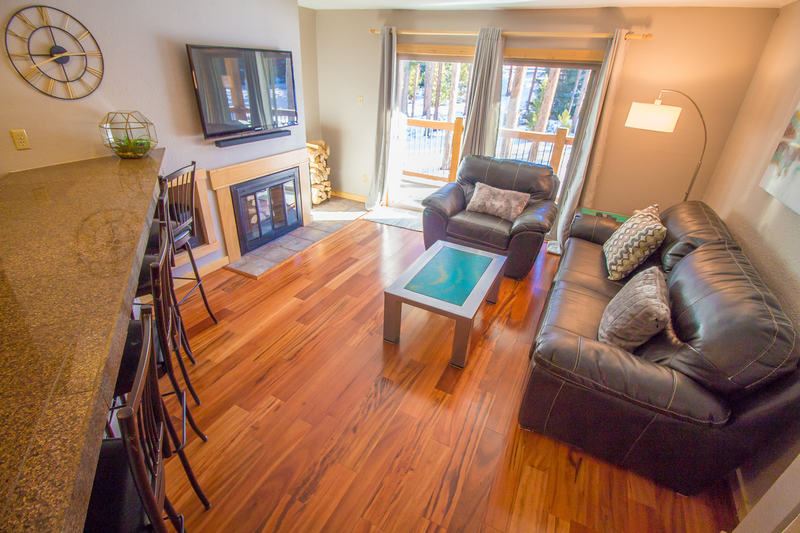 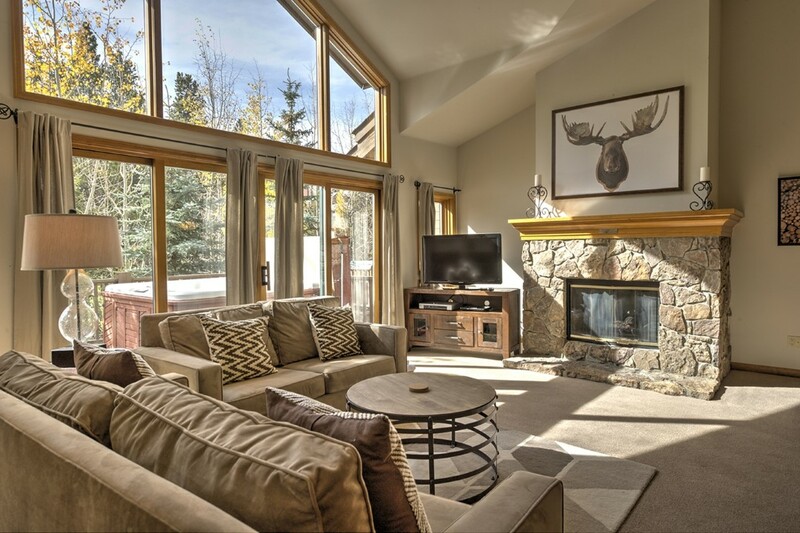 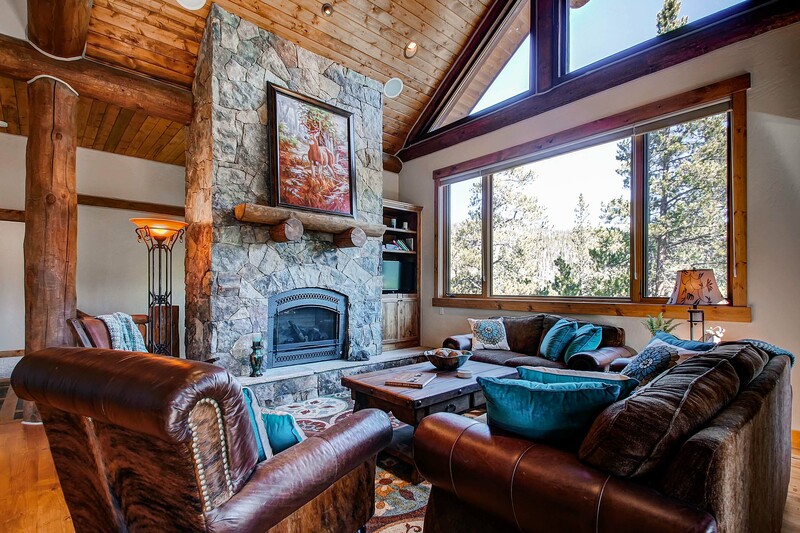 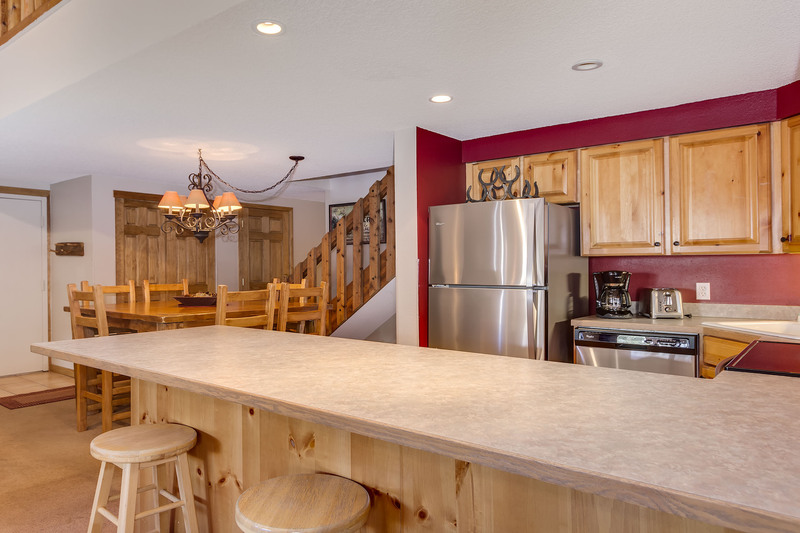 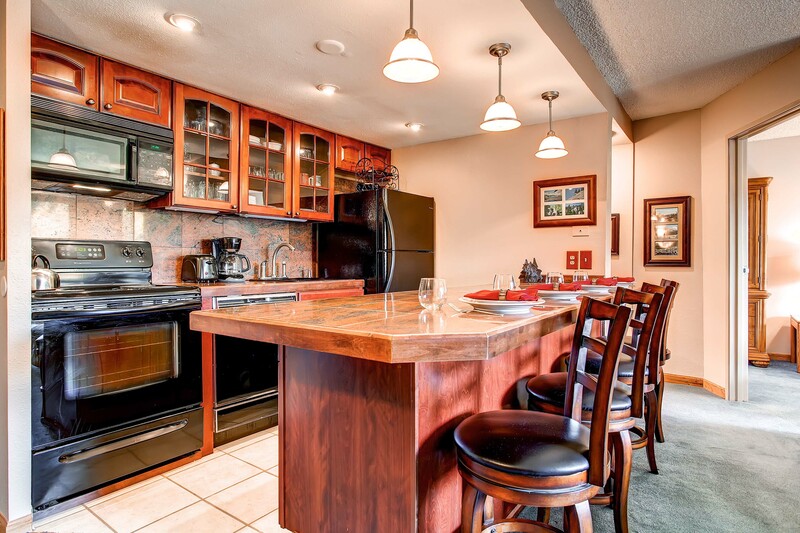 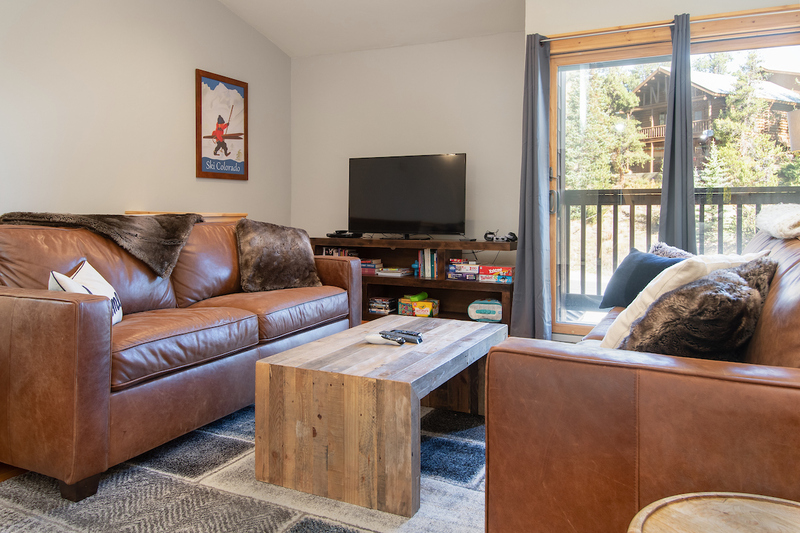 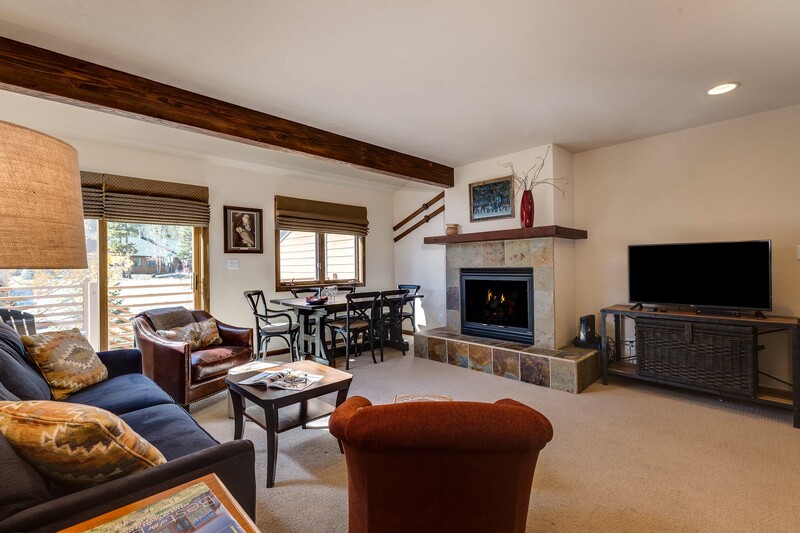 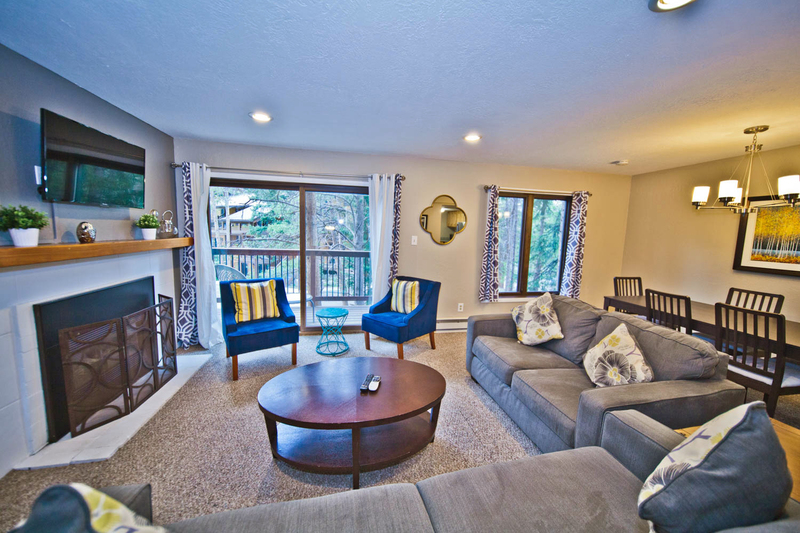 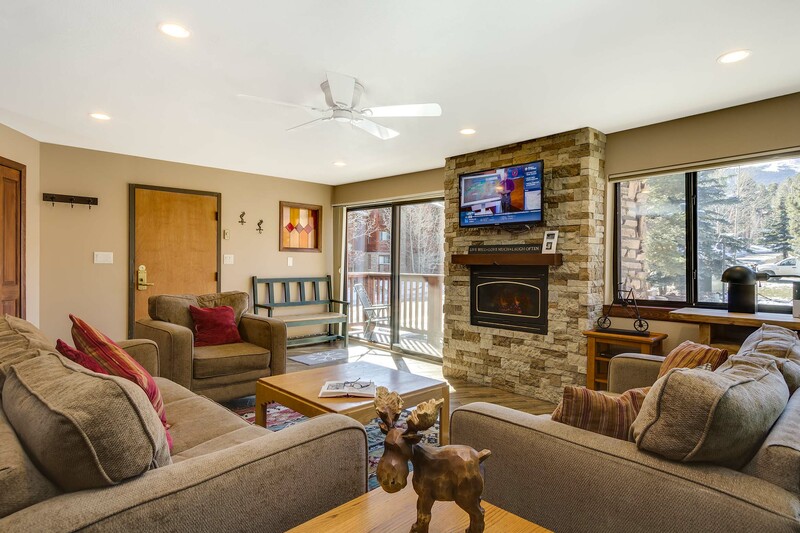 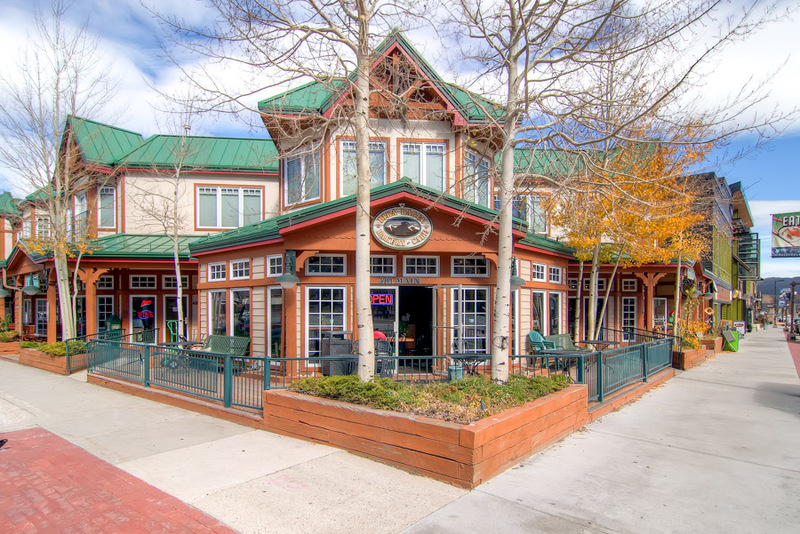 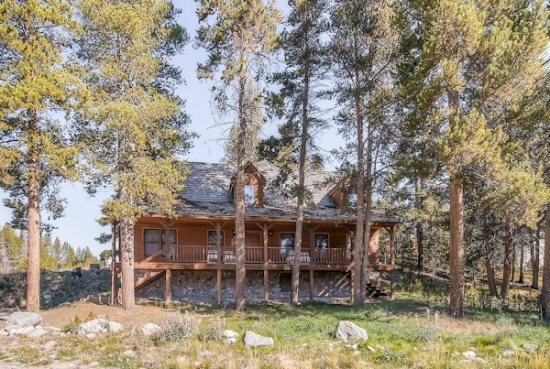 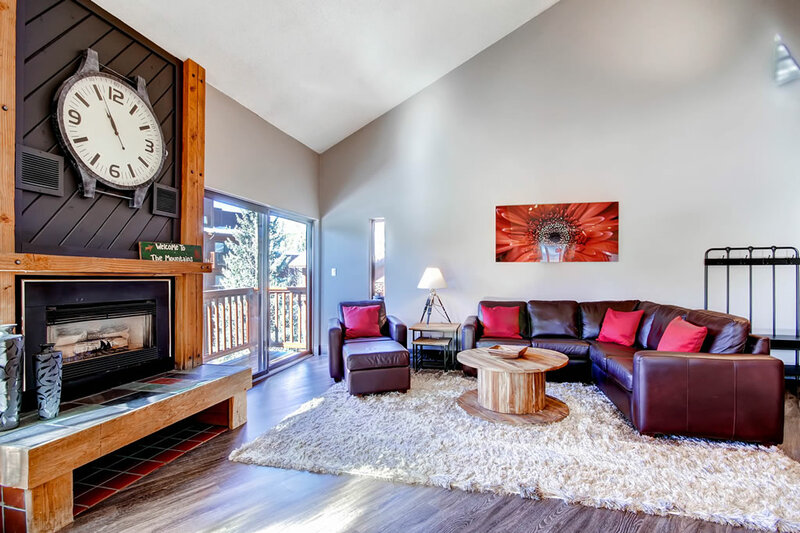 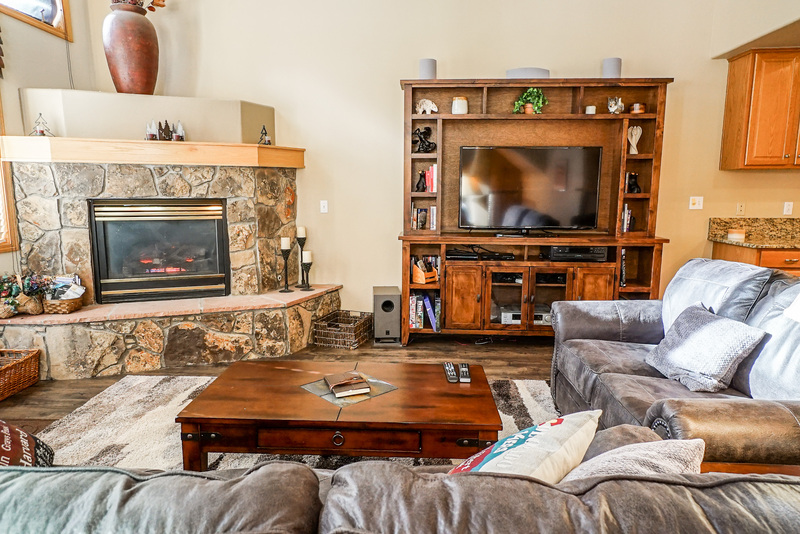 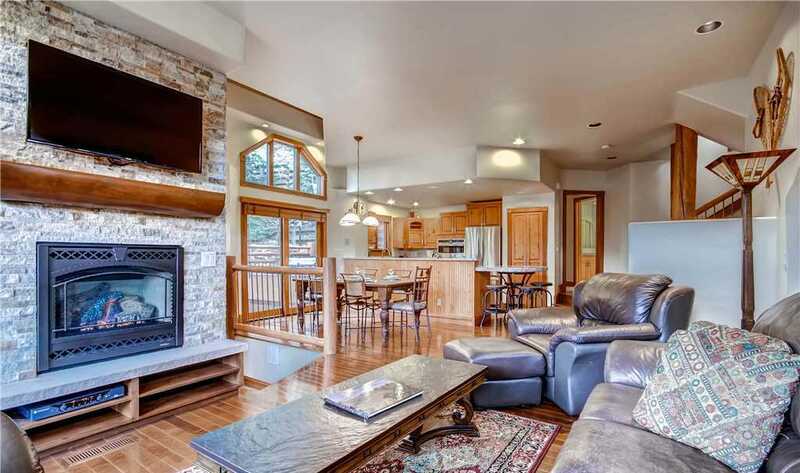 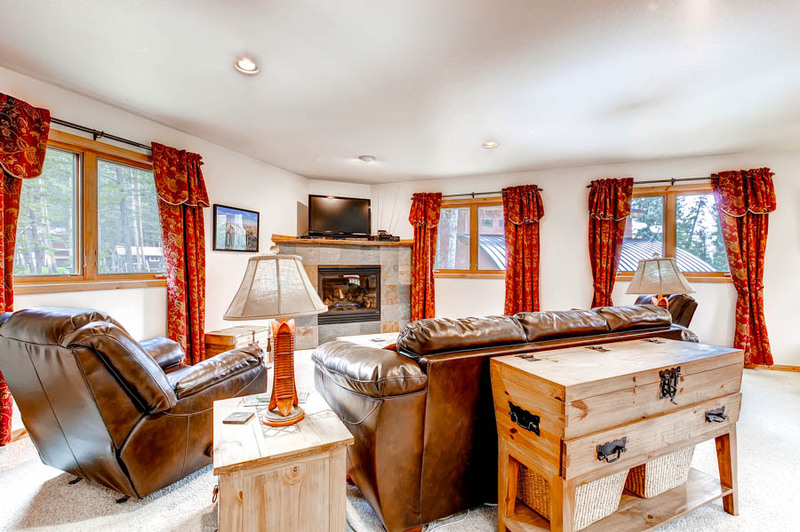 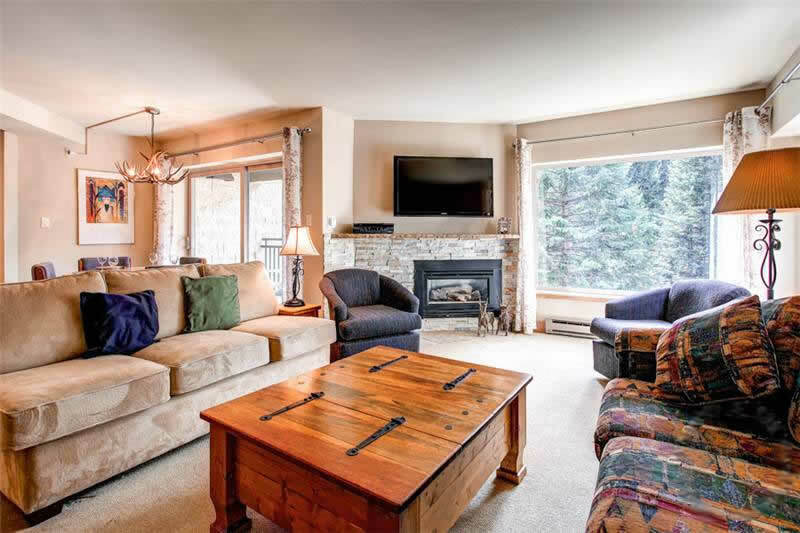 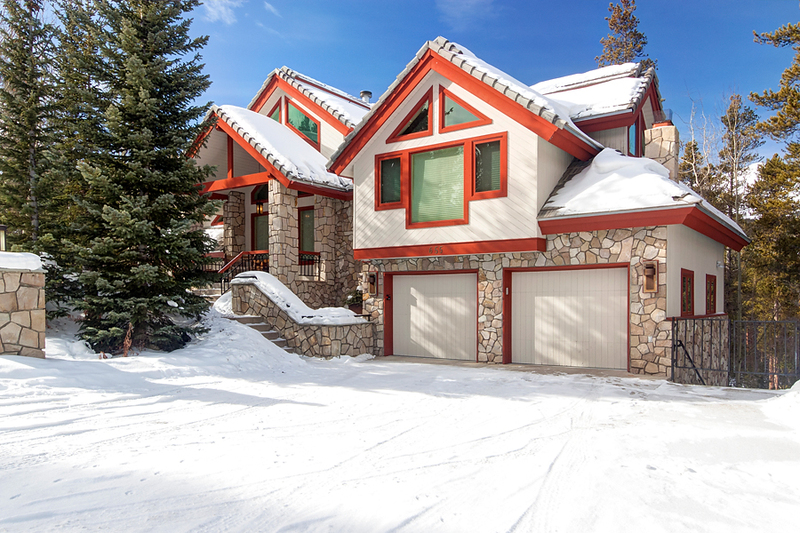 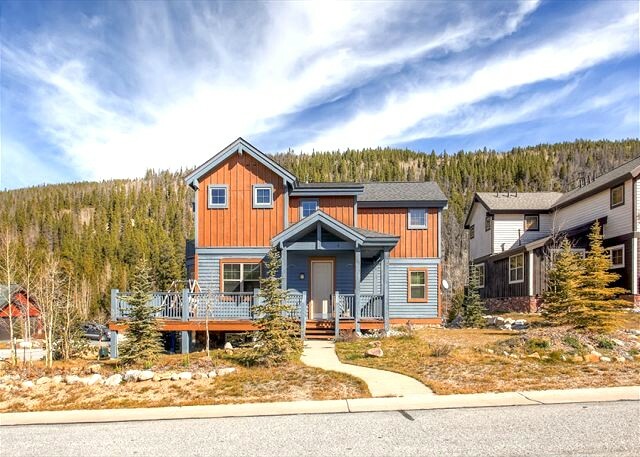 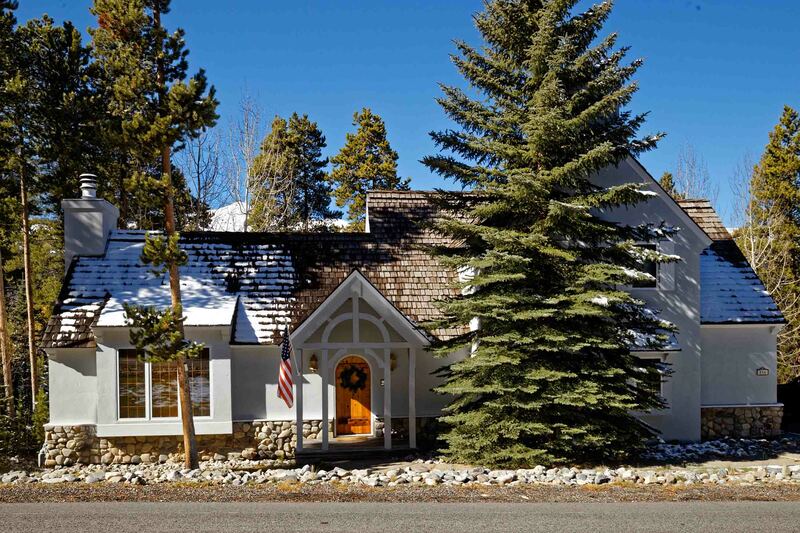 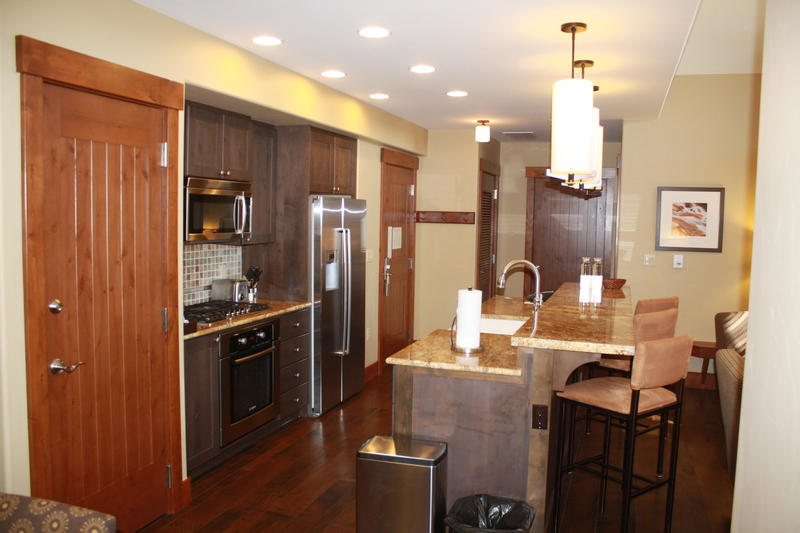 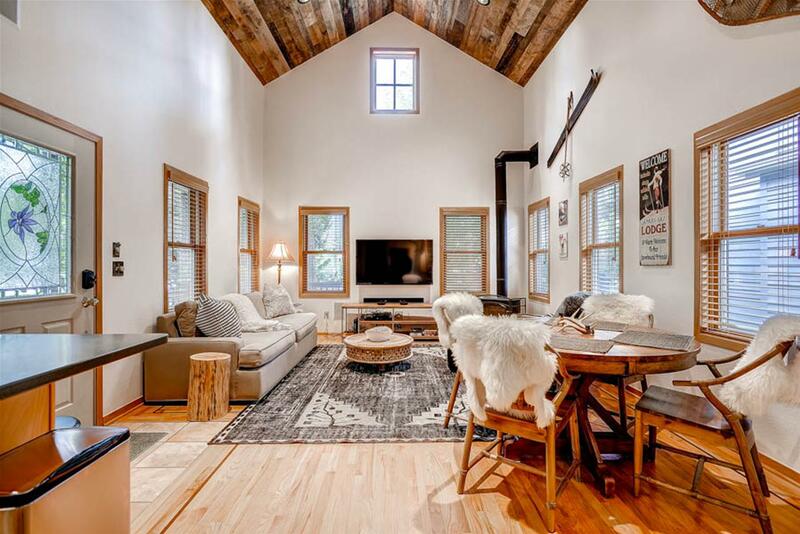 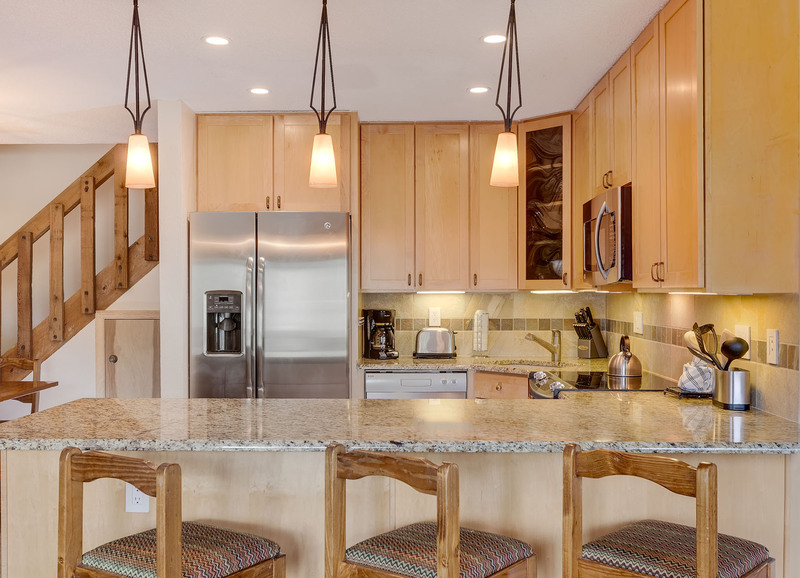 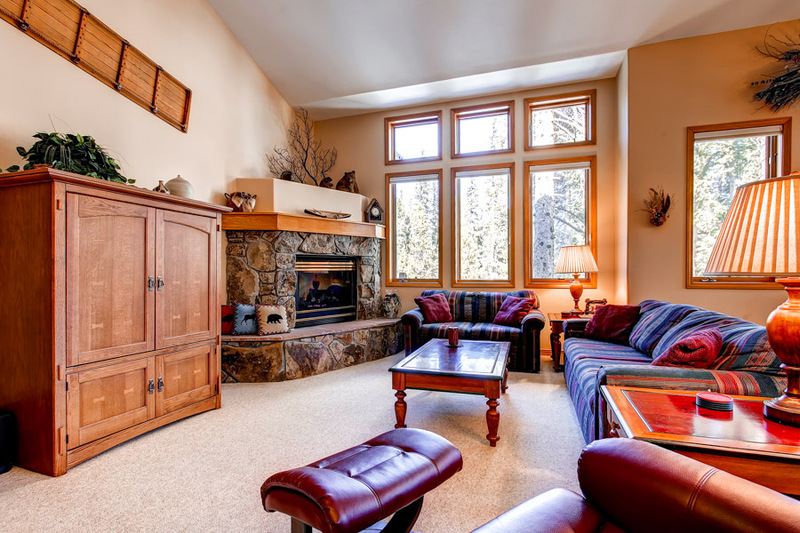 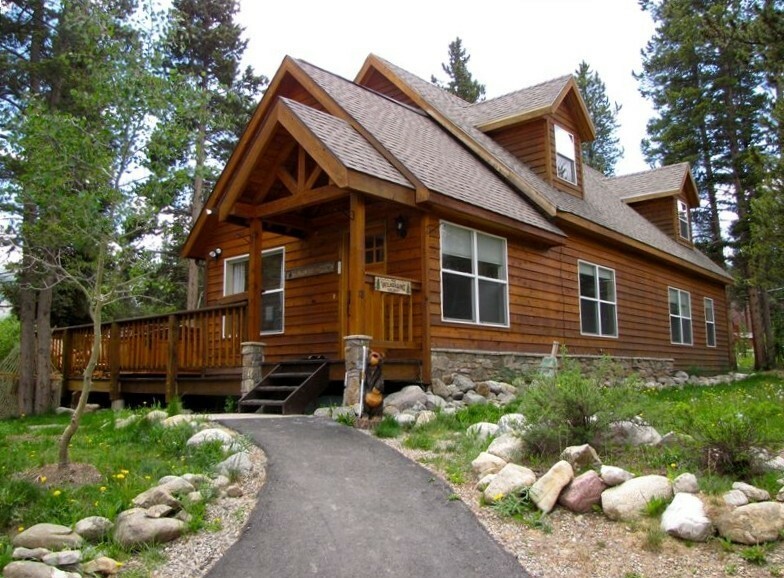 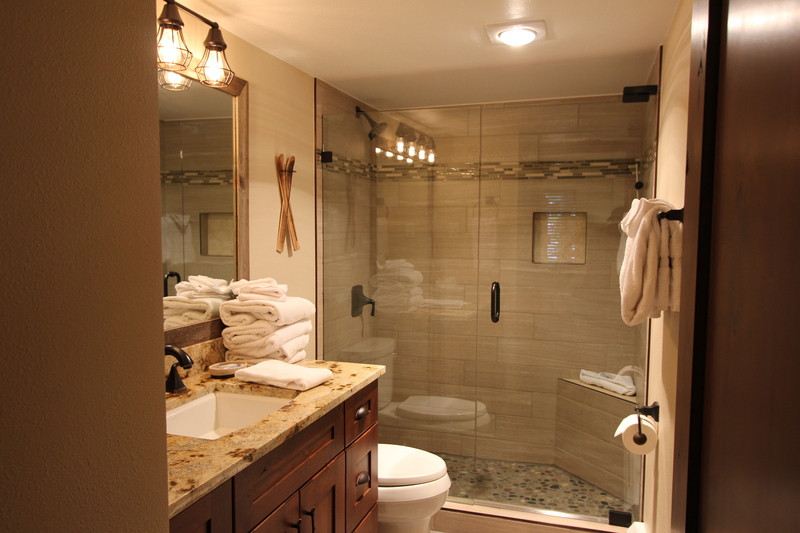 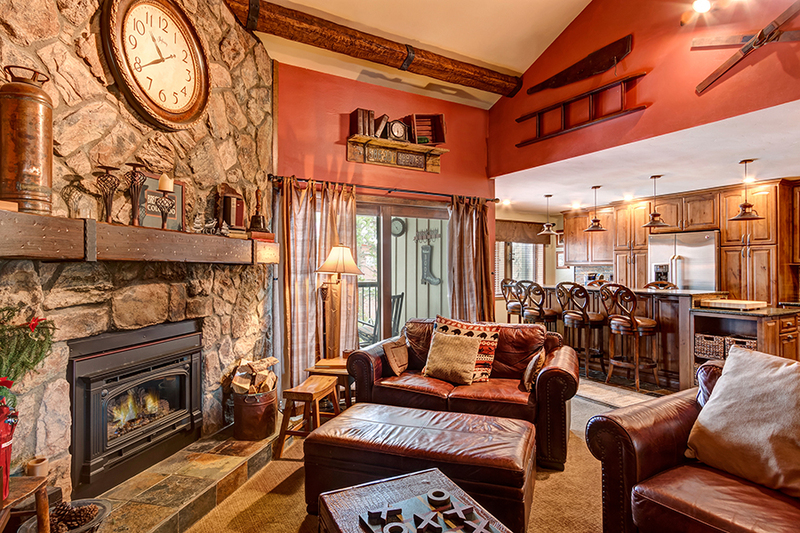 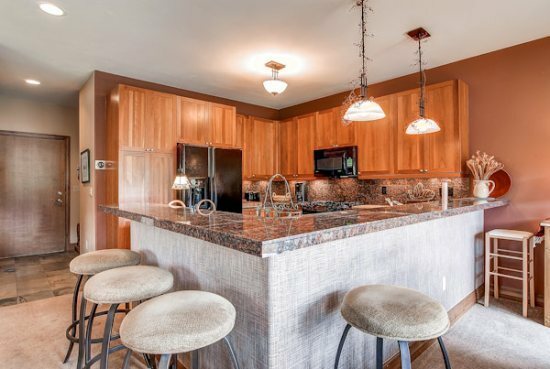 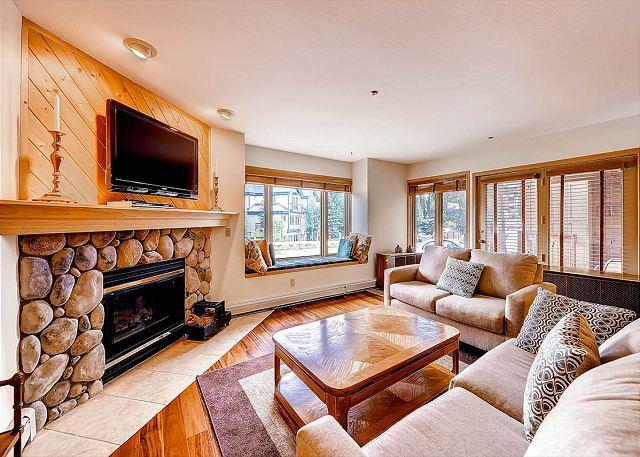 Nestled among 70-foot pine trees above Breckenridge, Pine Station House underwent an extensive remodel in 2012 including a beautiful new kitchen, hardwood floors and huge new TVs throughout the house. 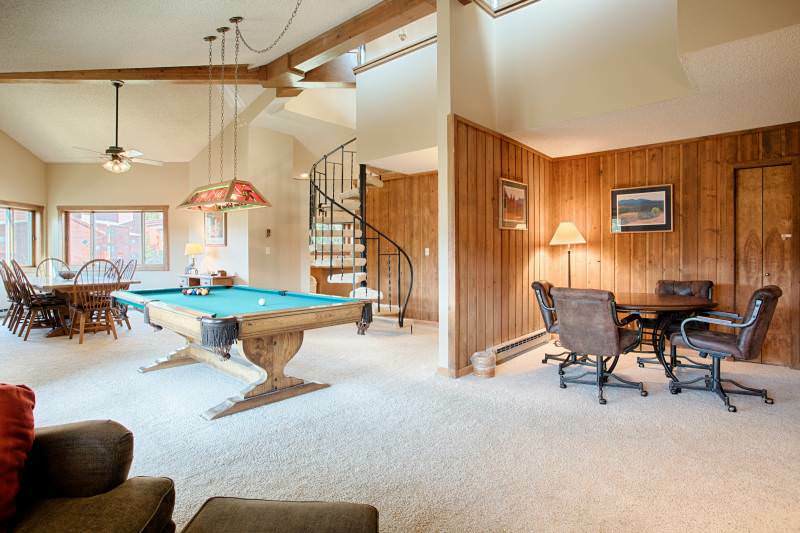 There’s even a private hot tub and a pool table to keep everyone in your group entertained! 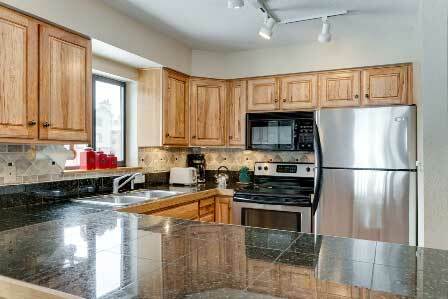 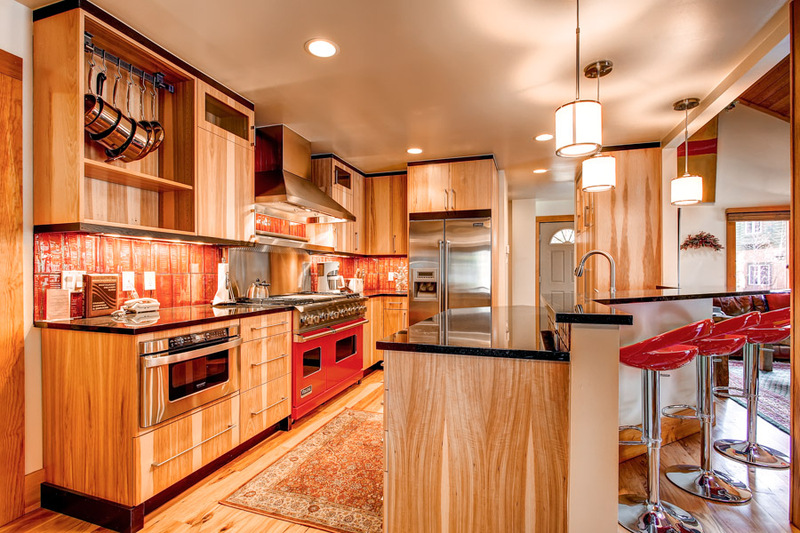 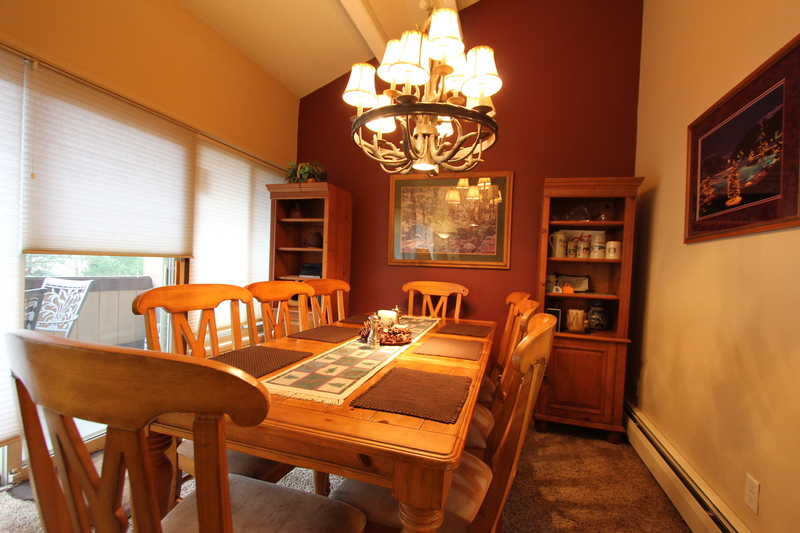 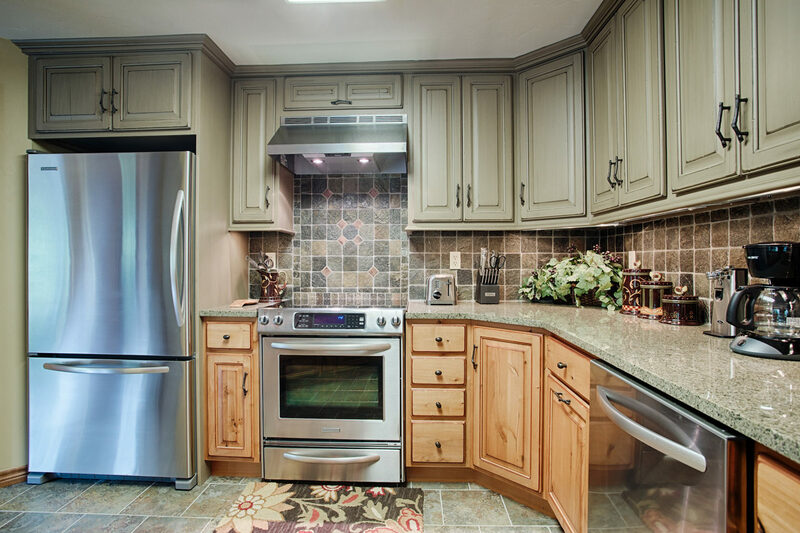 The multilevel layout features great options for multiple families. 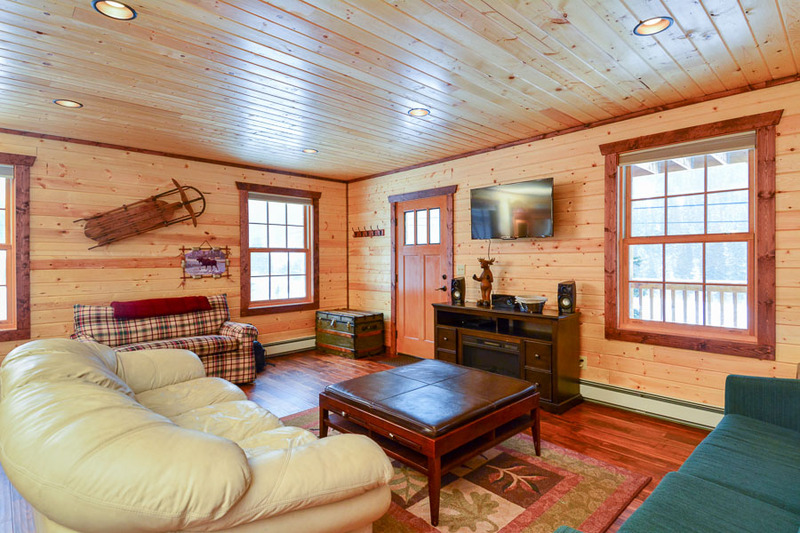 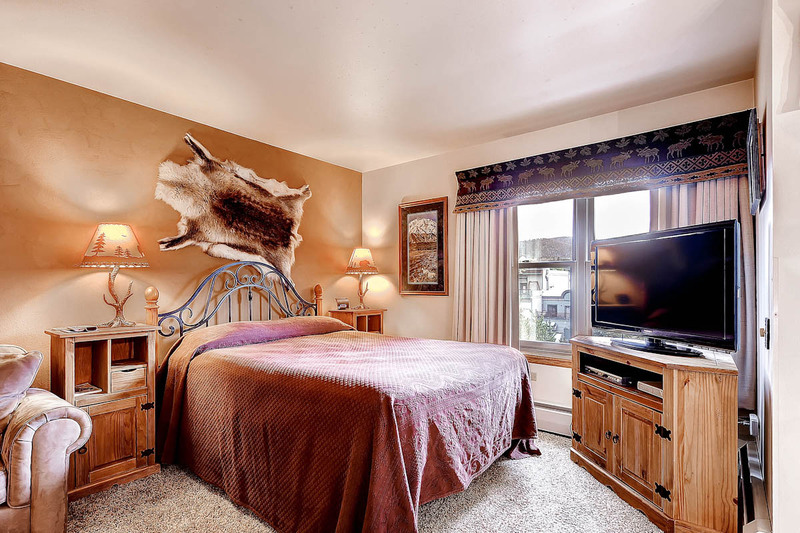 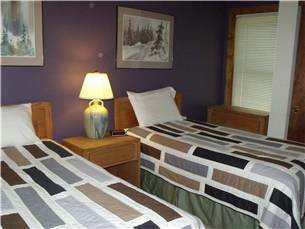 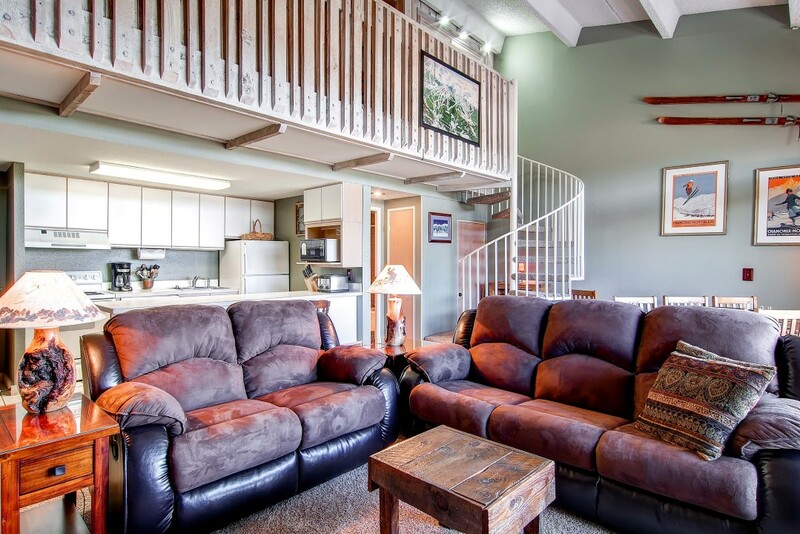 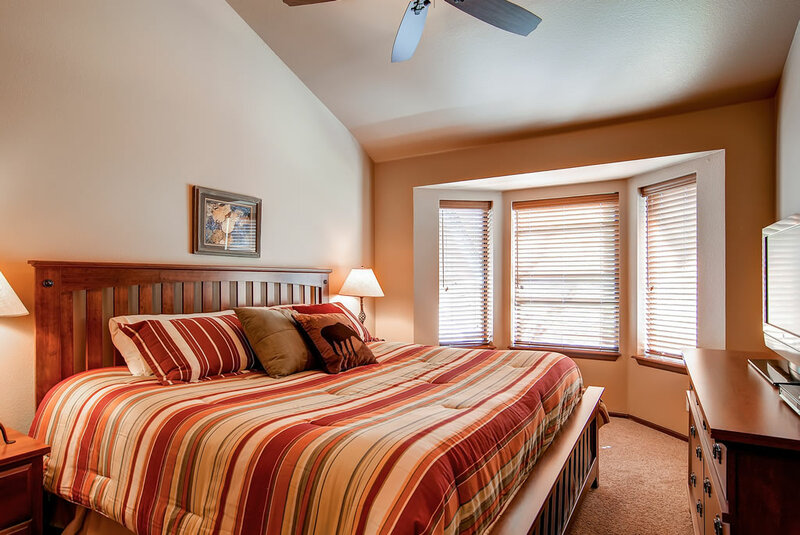 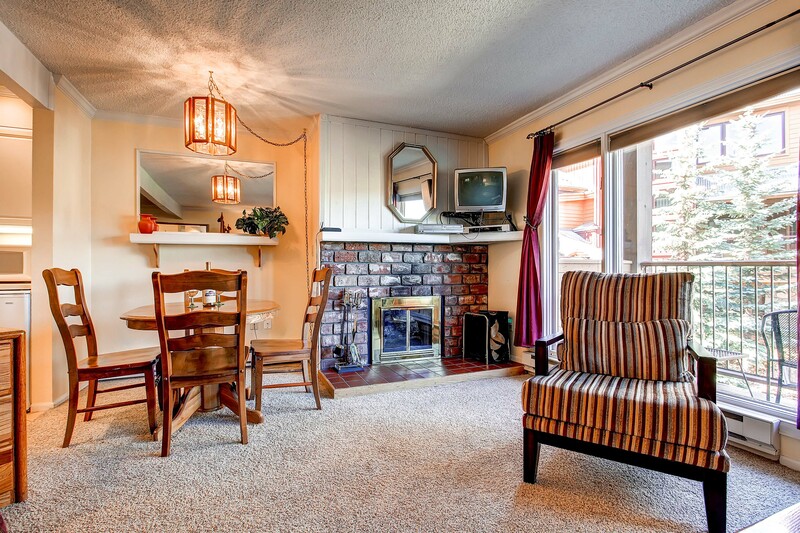 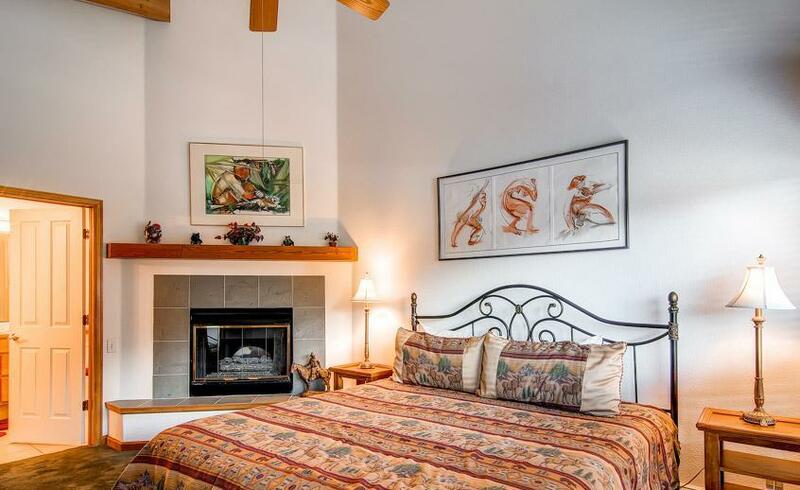 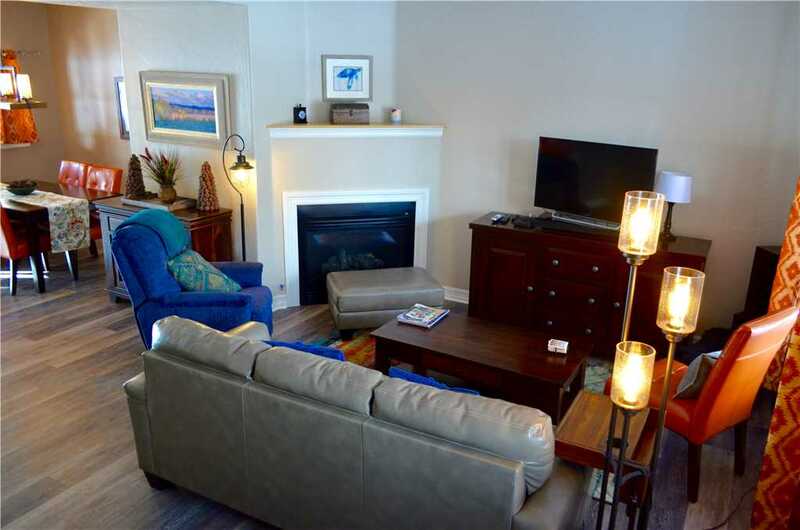 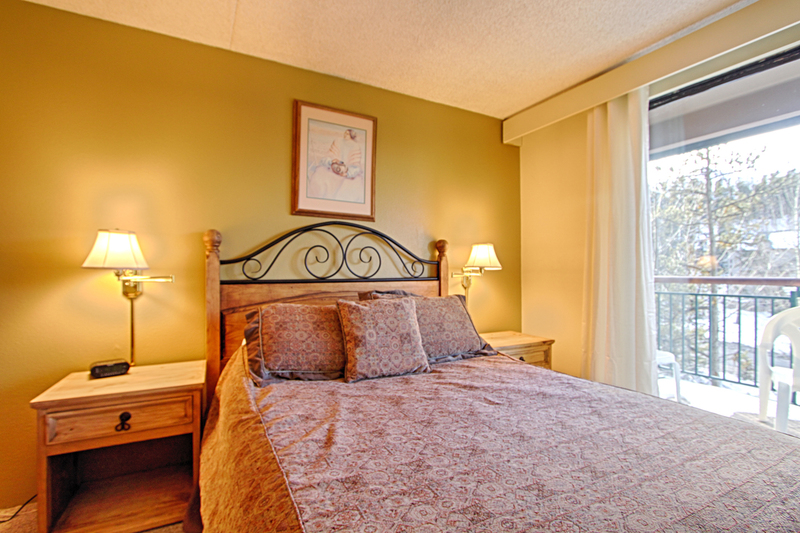 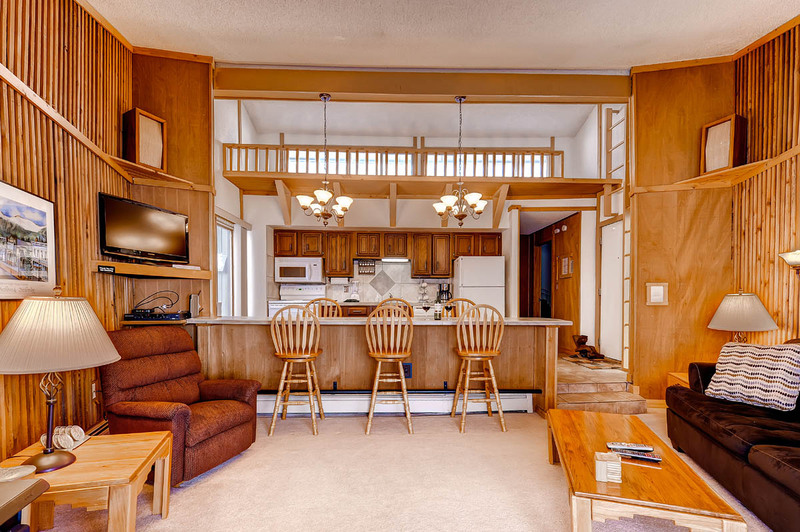 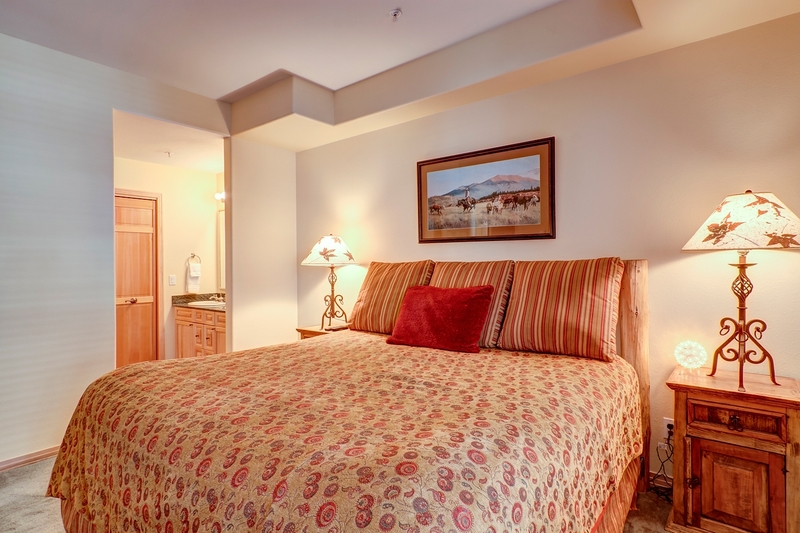 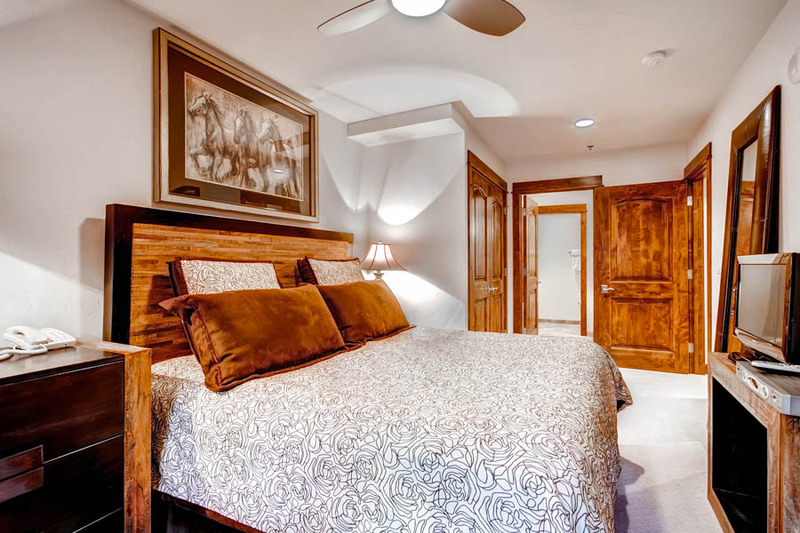 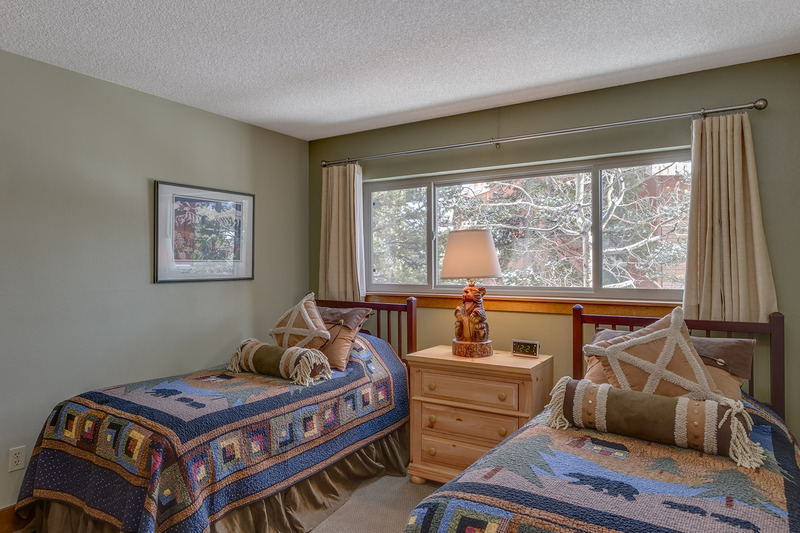 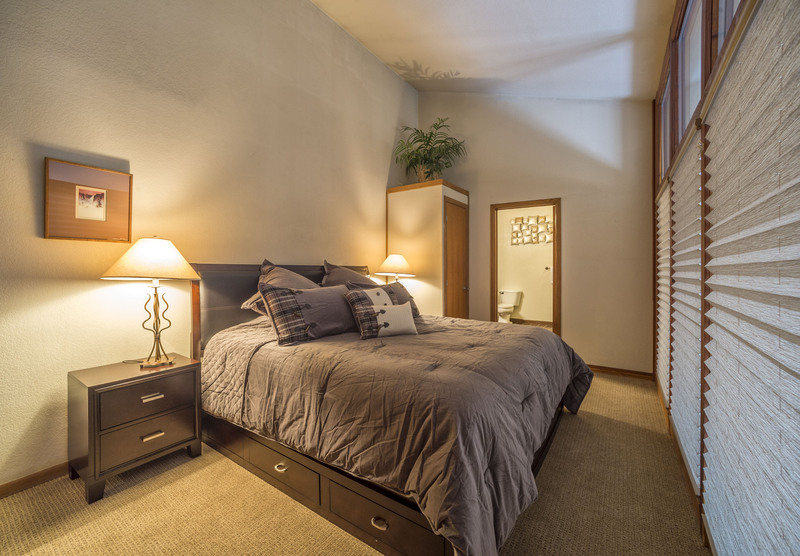 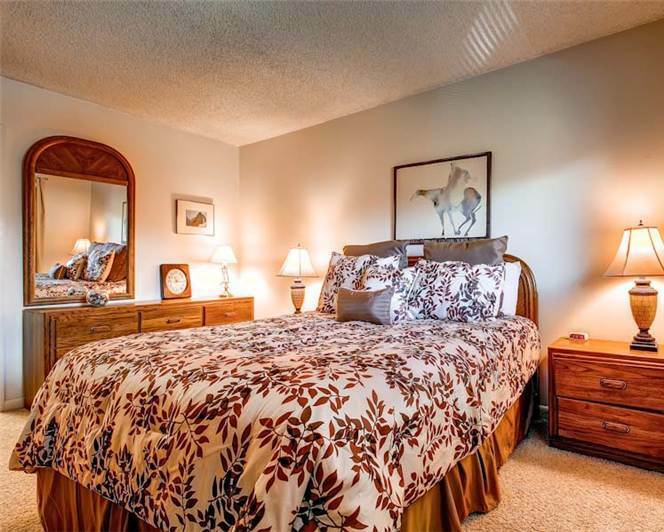 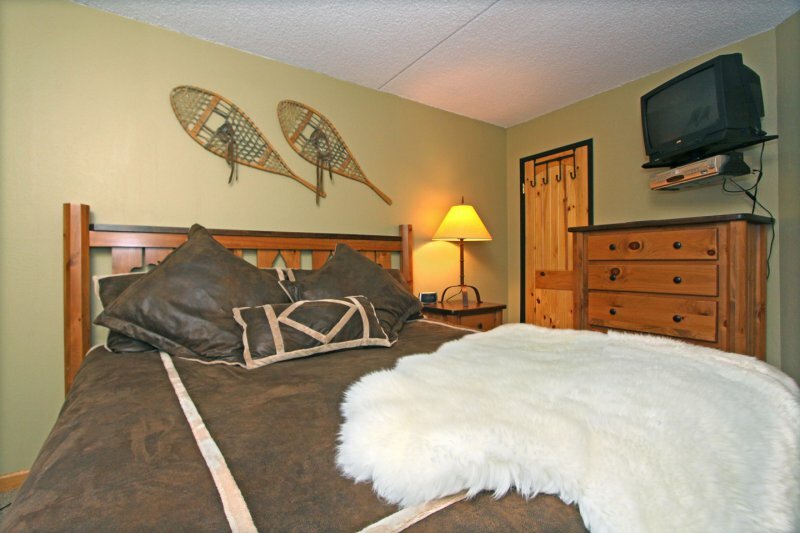 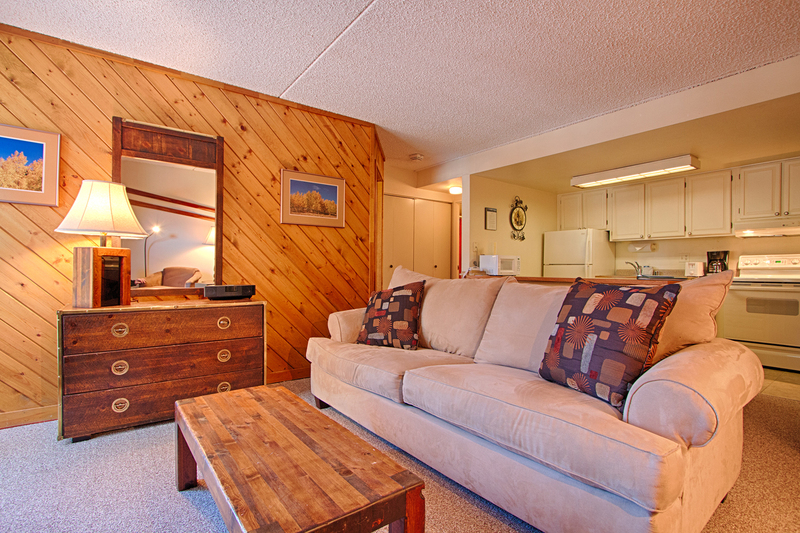 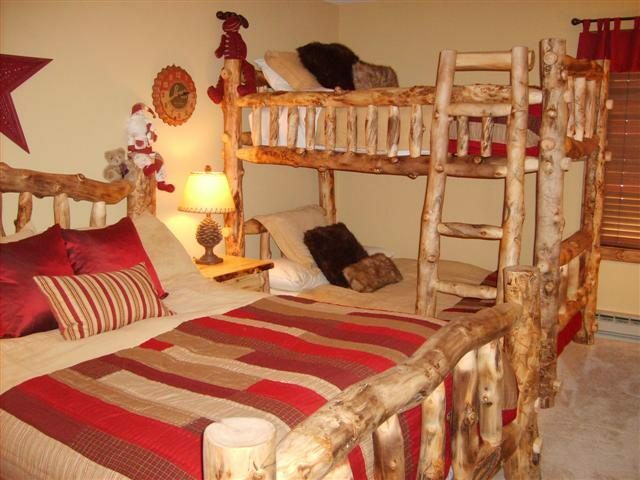 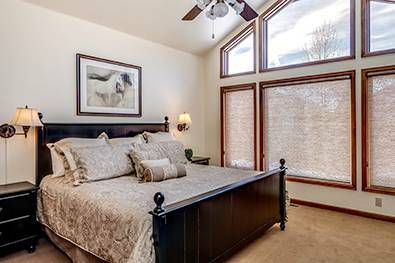 The master suite upstairs offers privacy, luxury and space: a log king bed, a fantastic in-suite bathroom with a soaking tub and skylight and, just outside the door, a den/loft with a table for six, couches and a 45-inch LCD TV with DVD player. 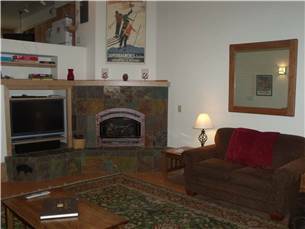 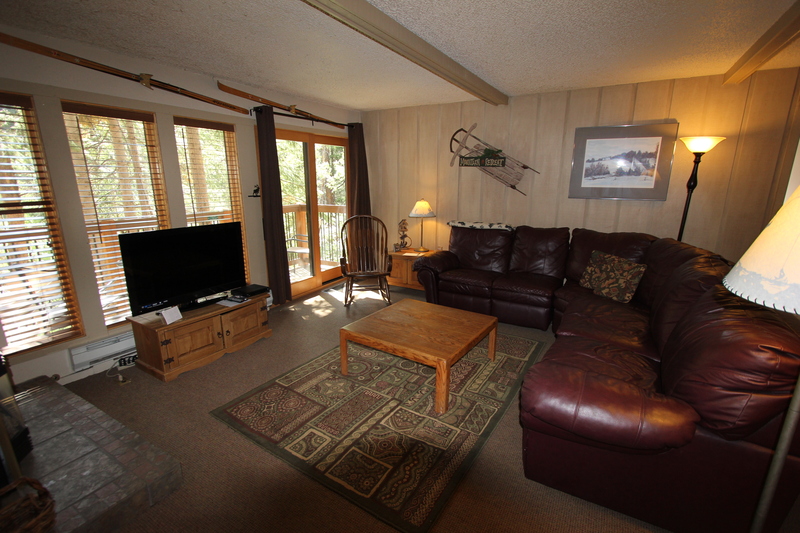 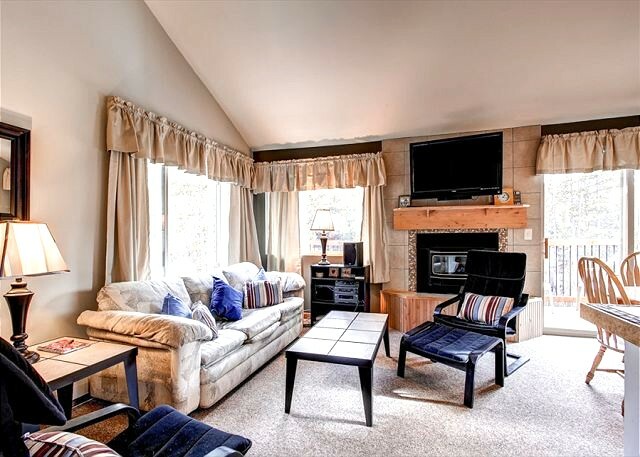 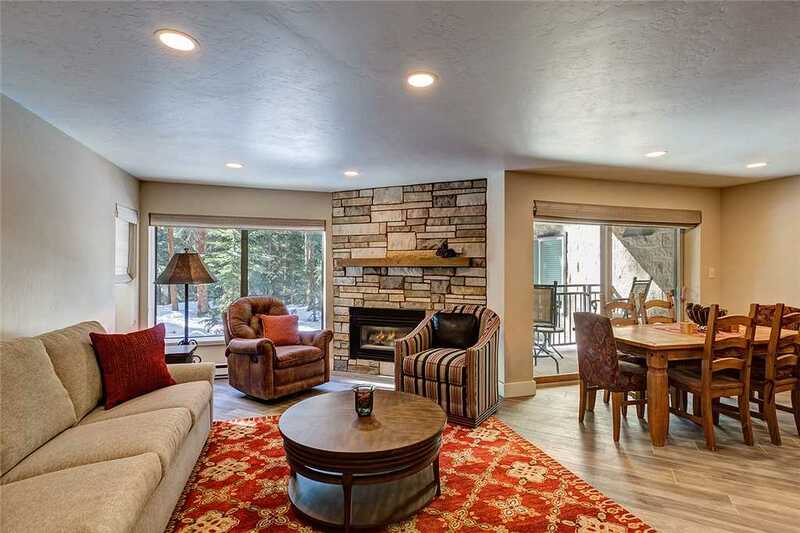 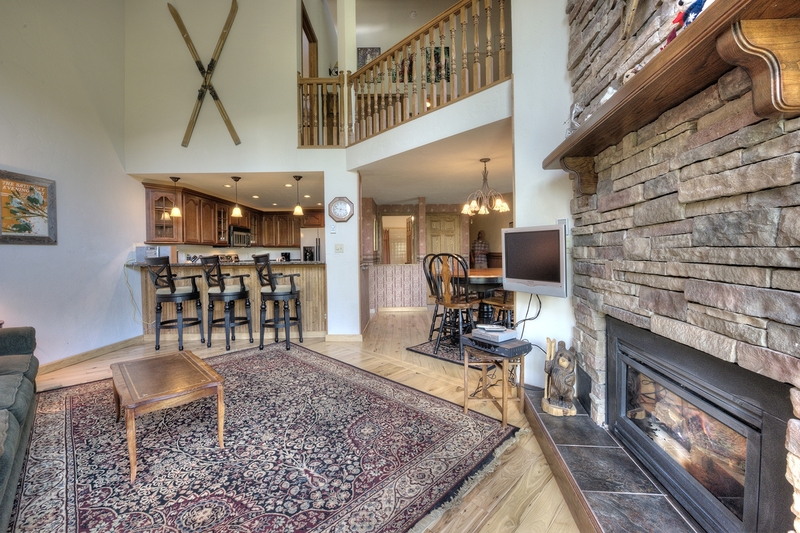 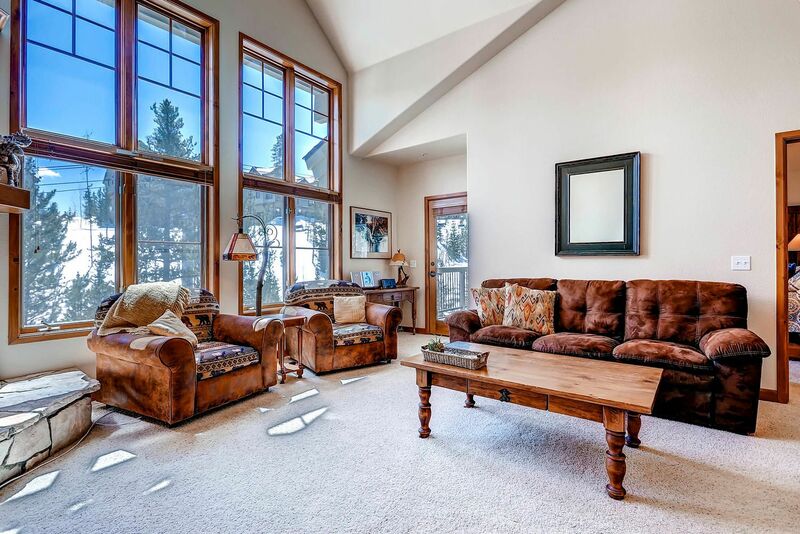 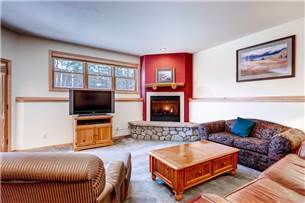 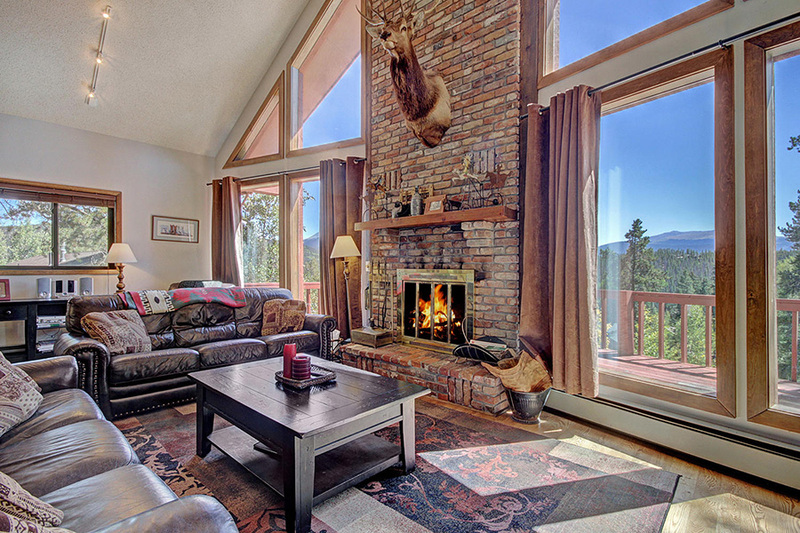 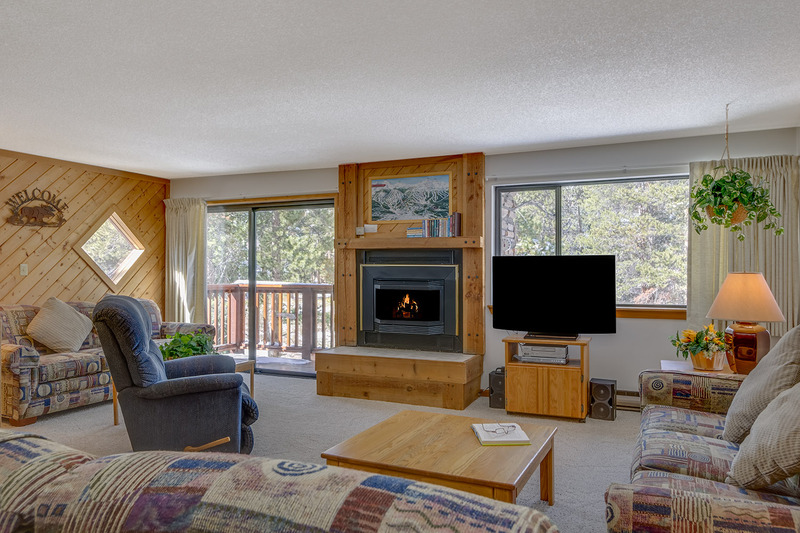 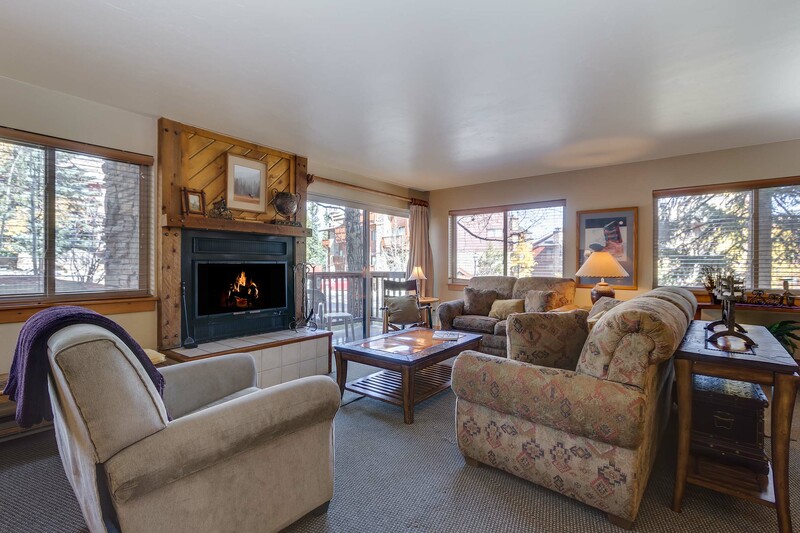 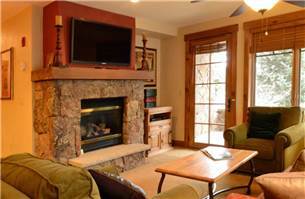 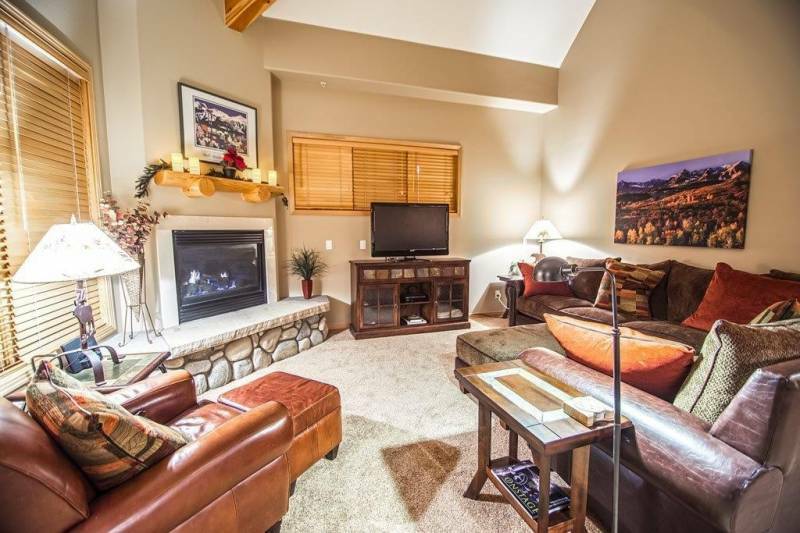 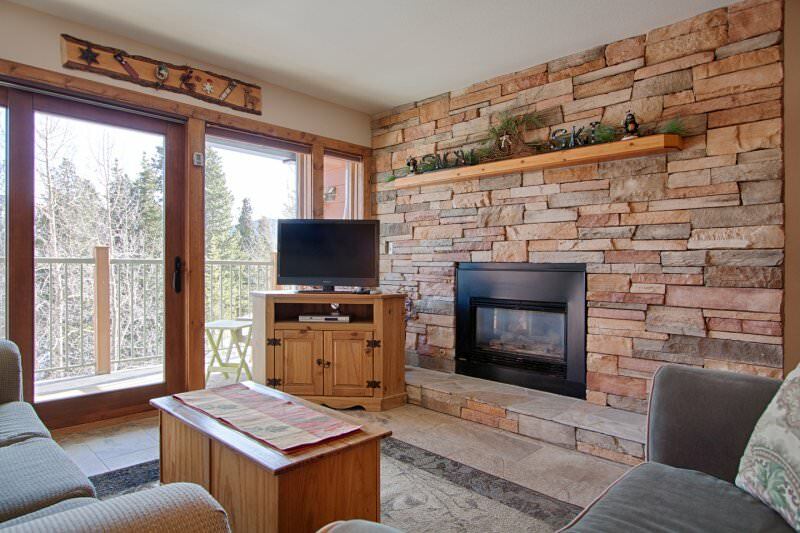 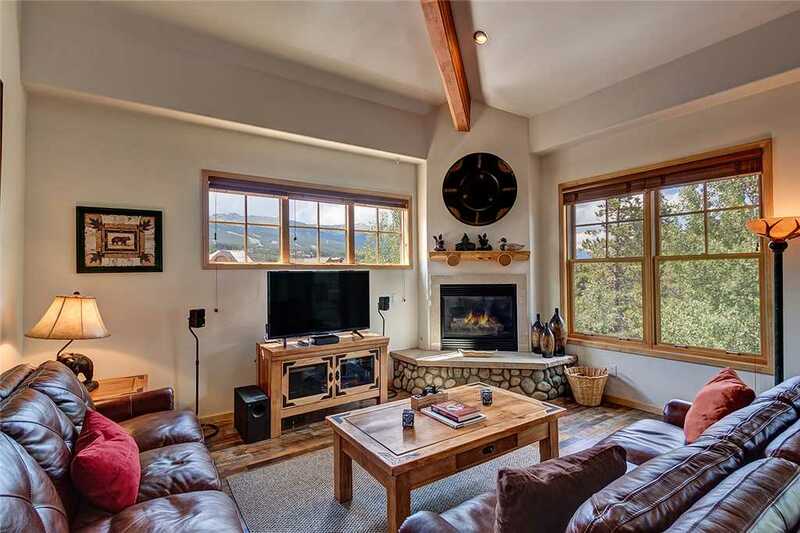 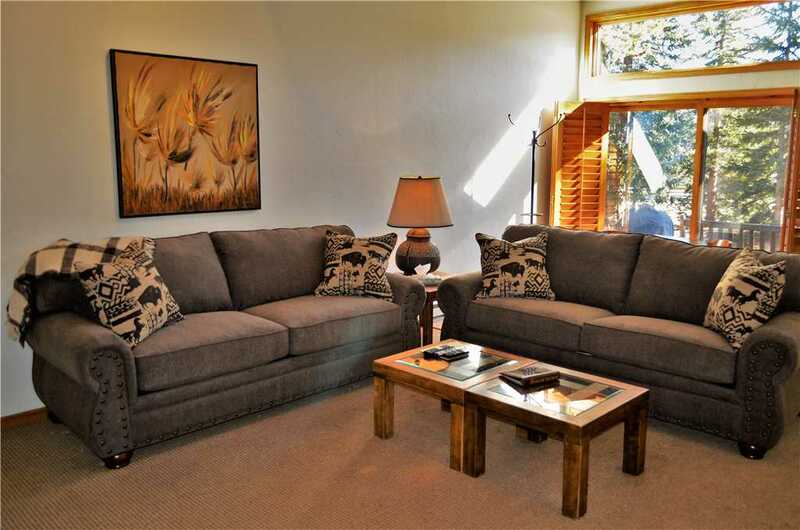 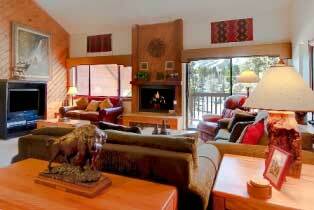 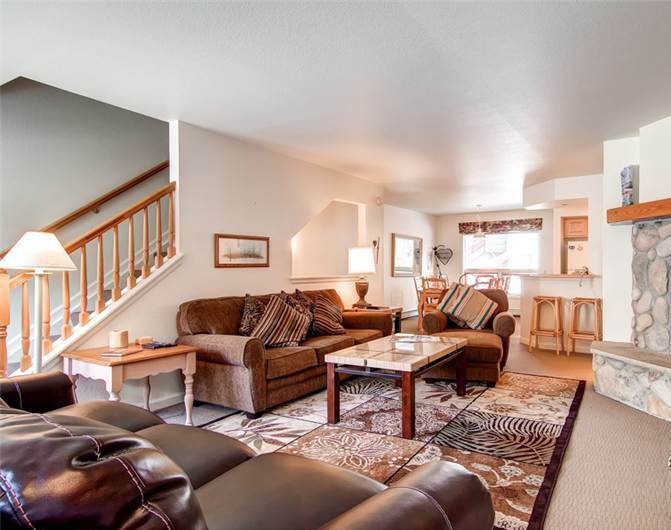 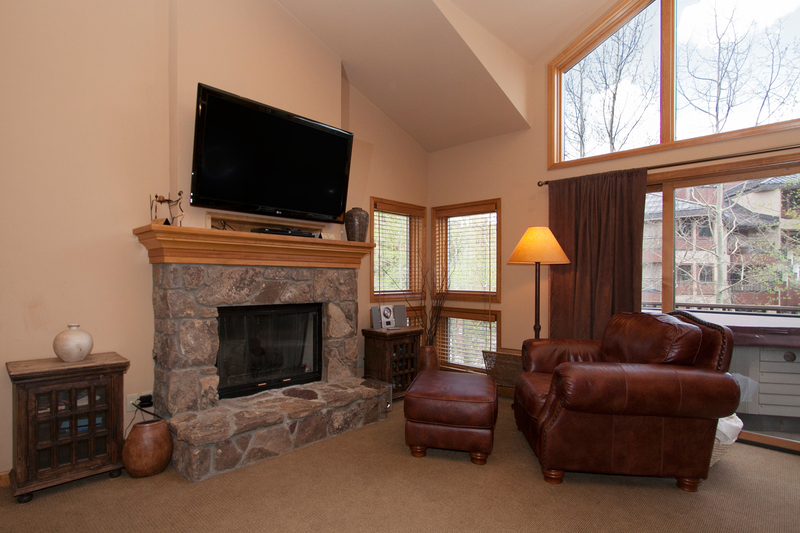 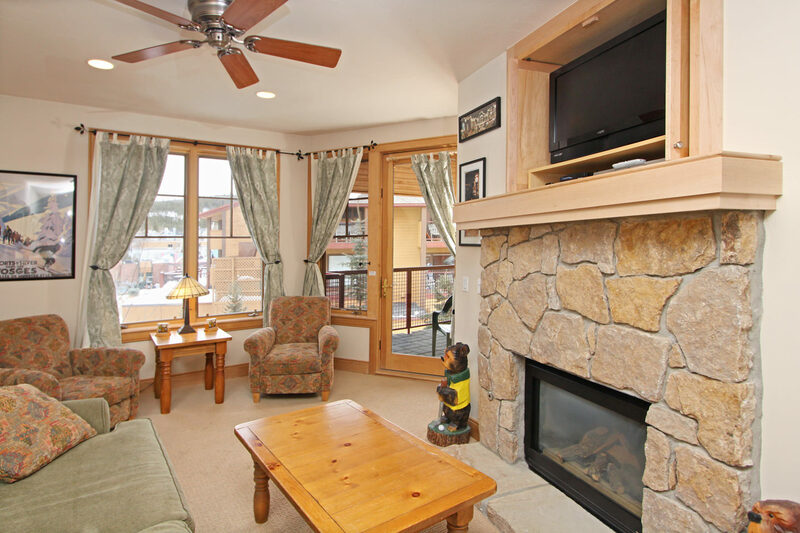 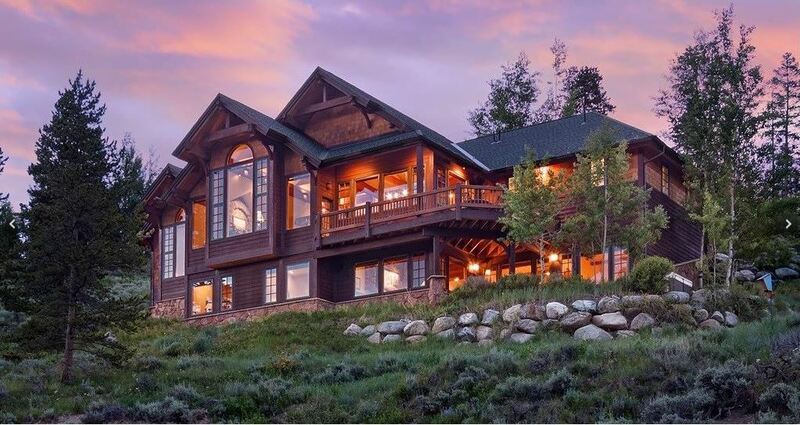 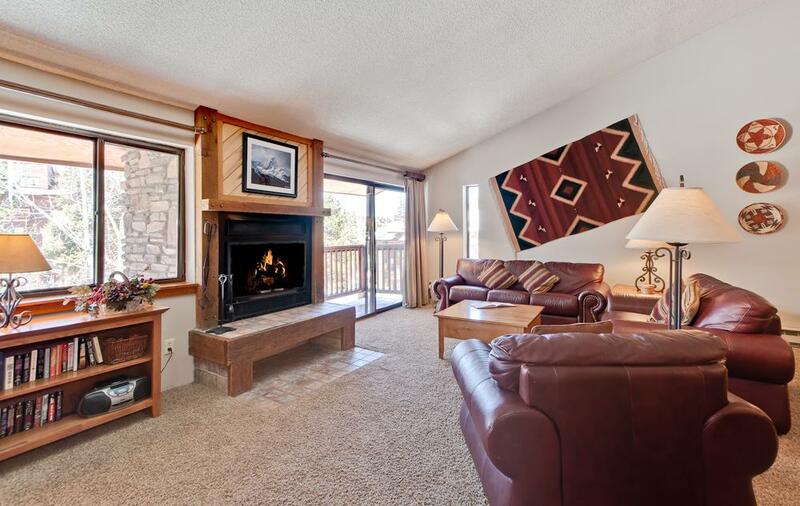 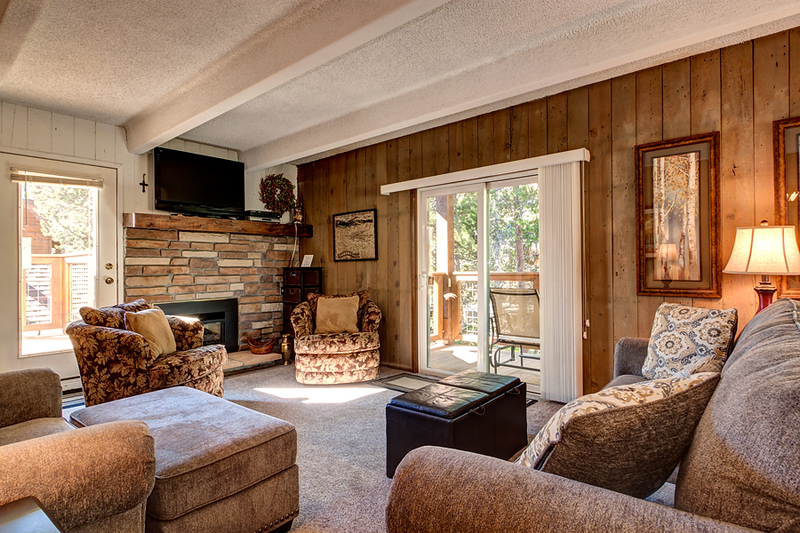 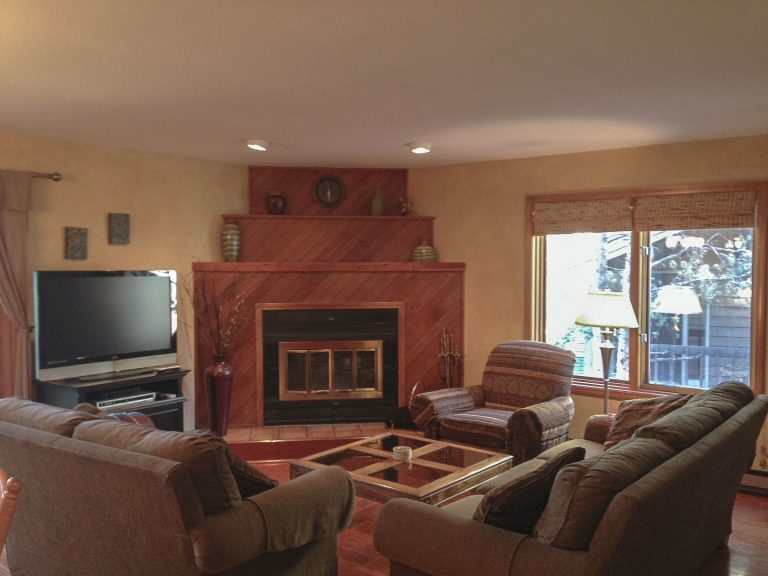 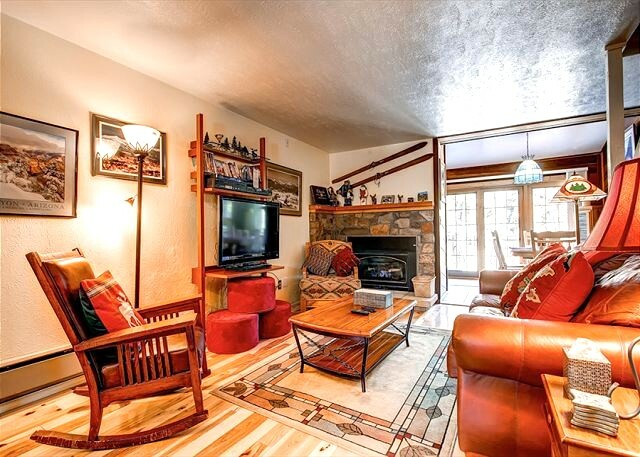 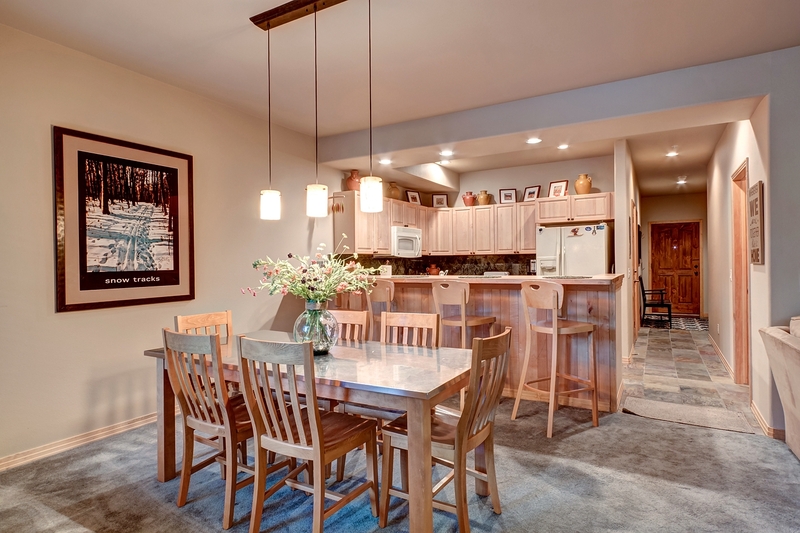 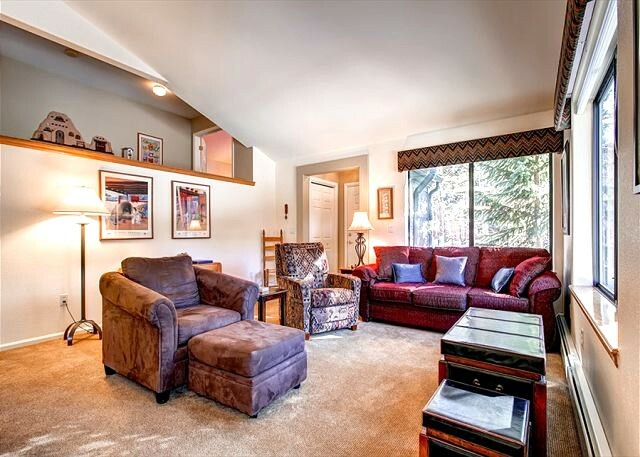 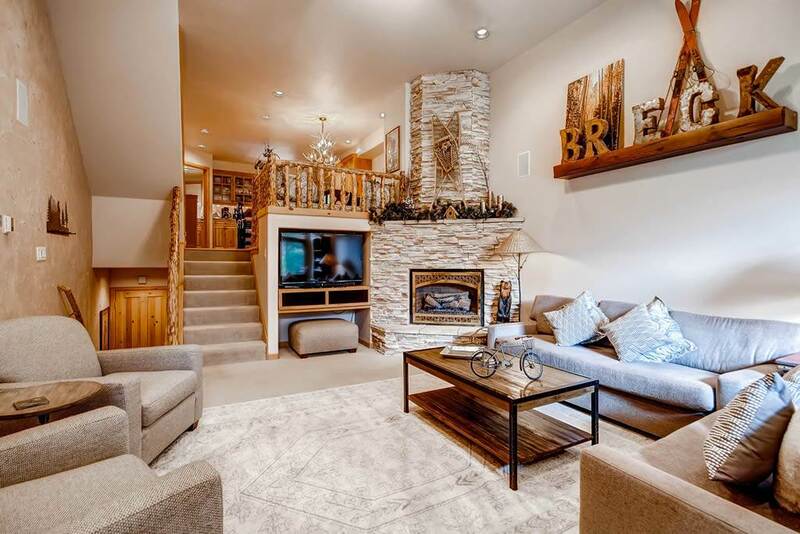 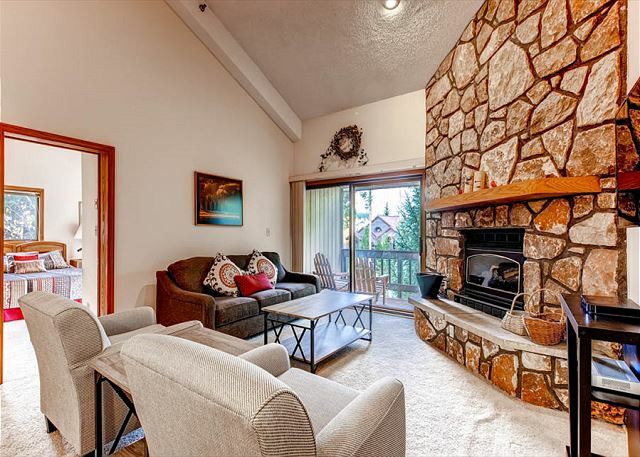 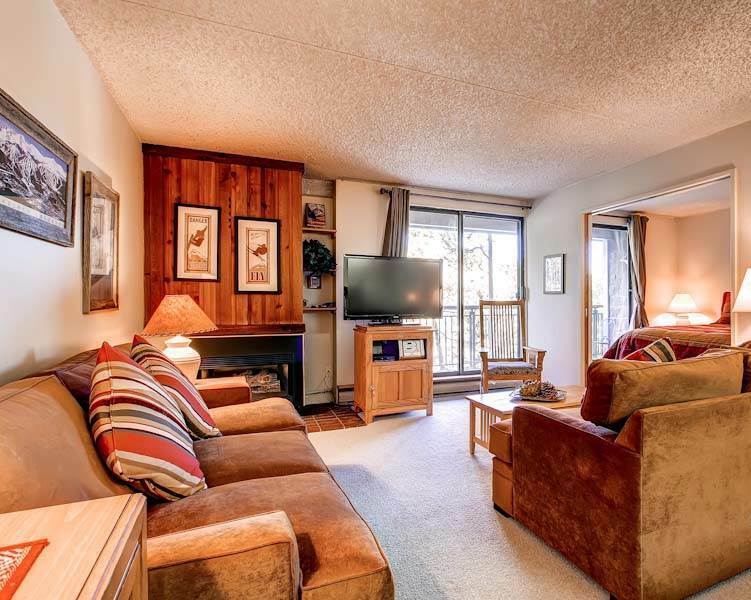 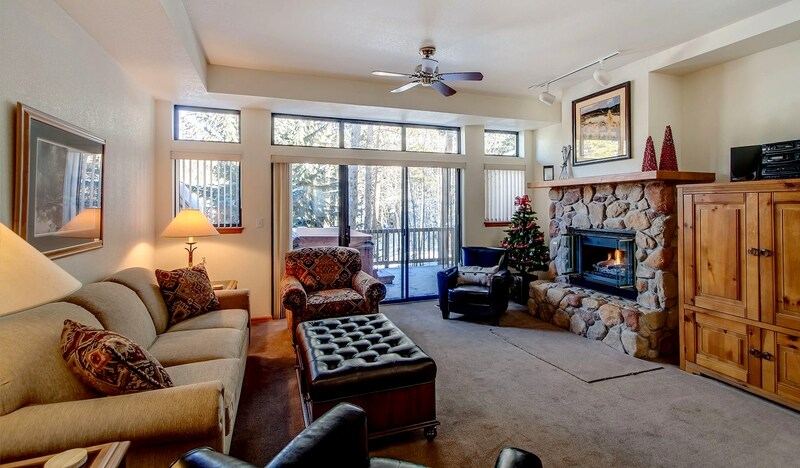 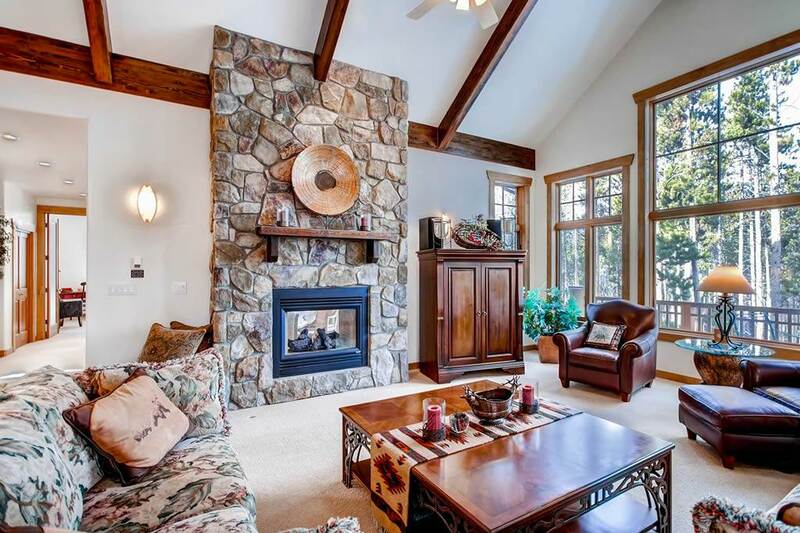 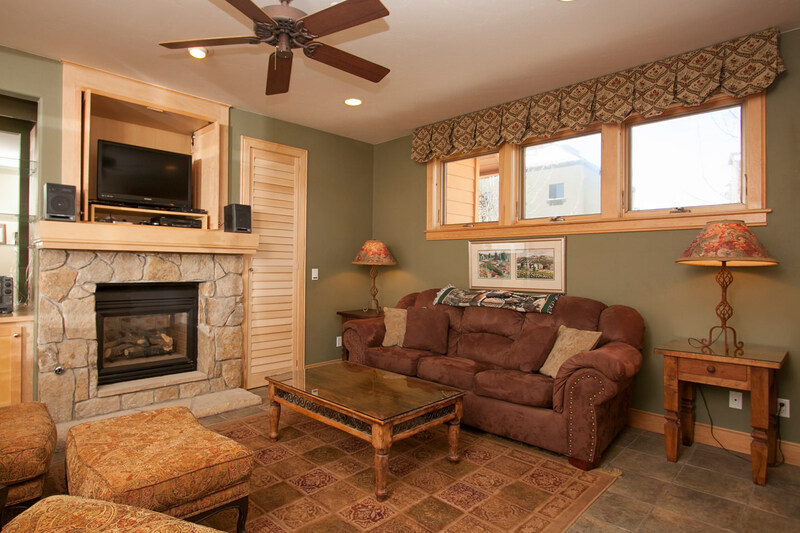 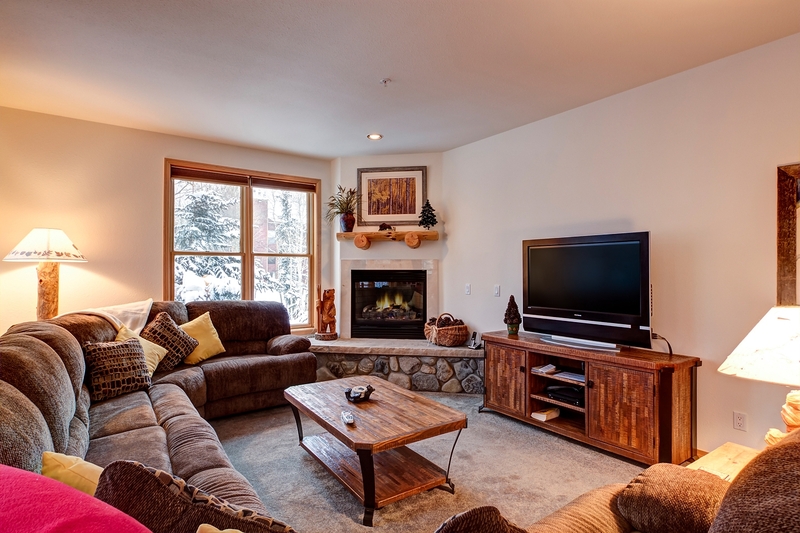 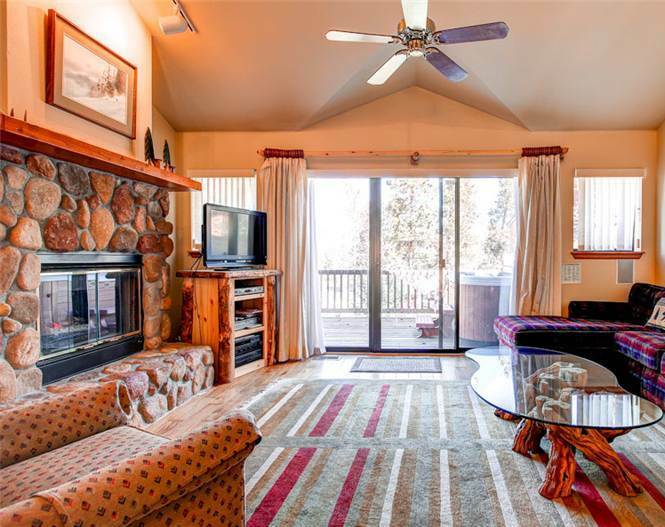 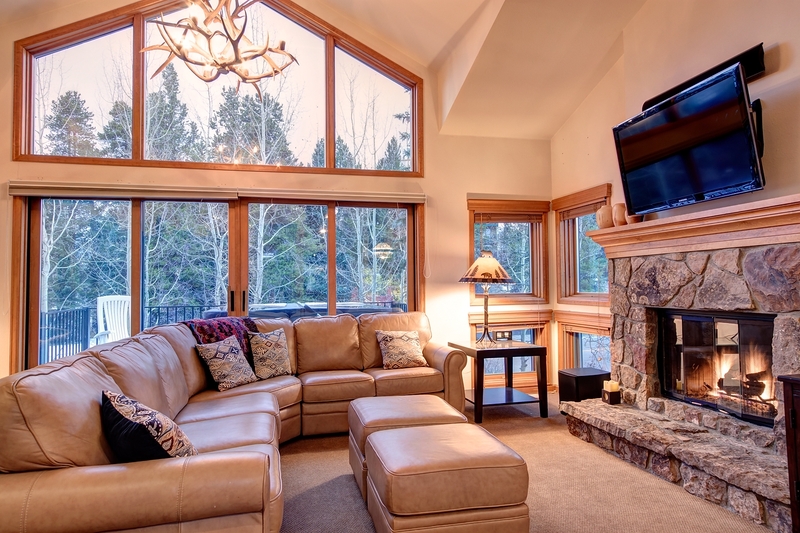 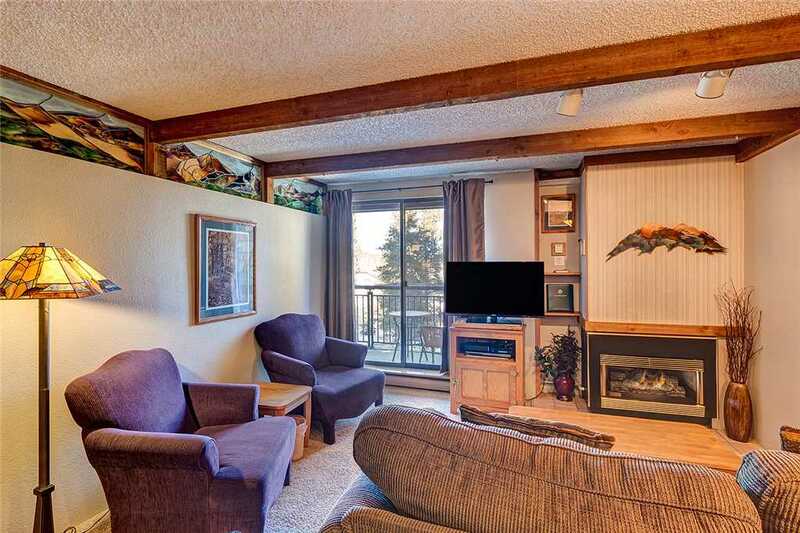 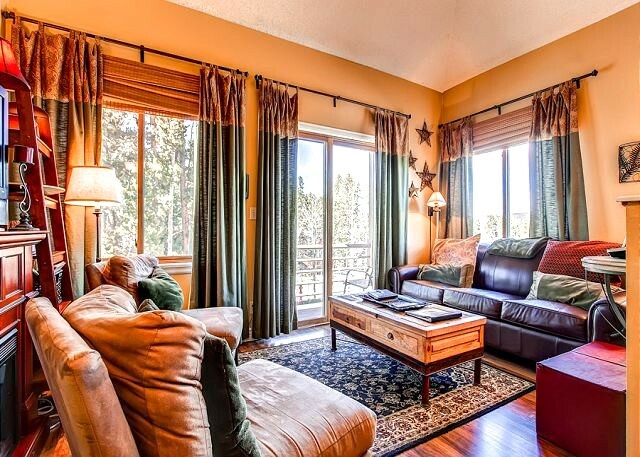 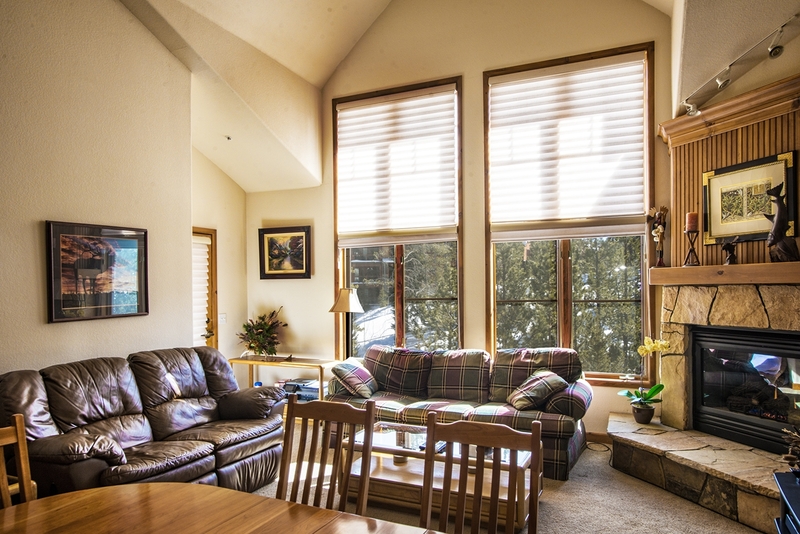 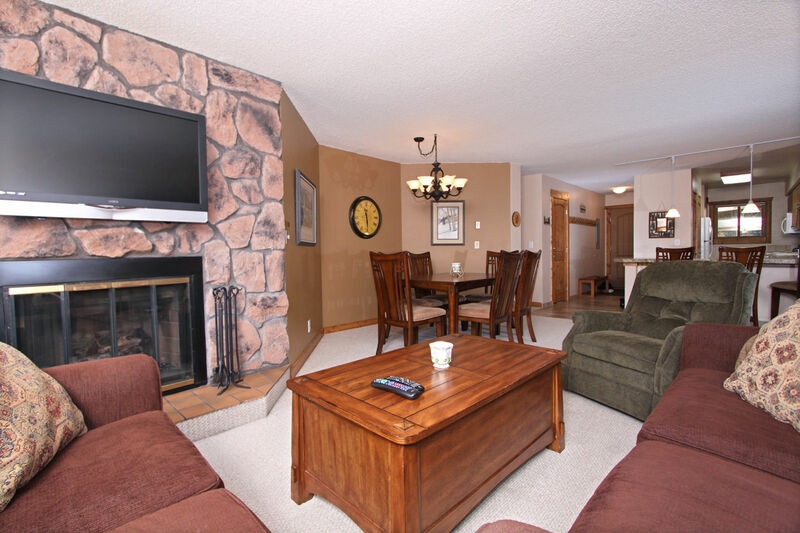 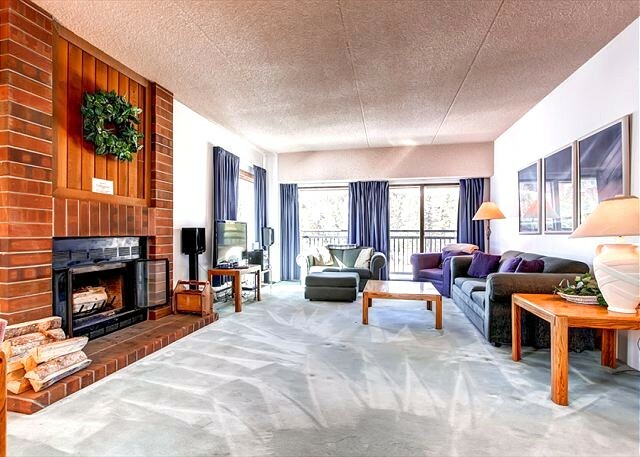 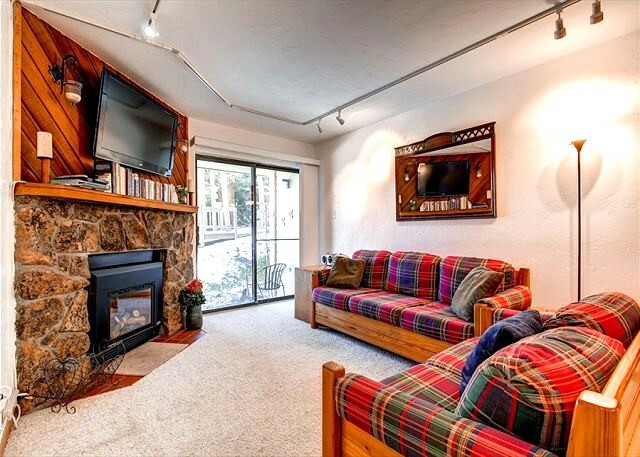 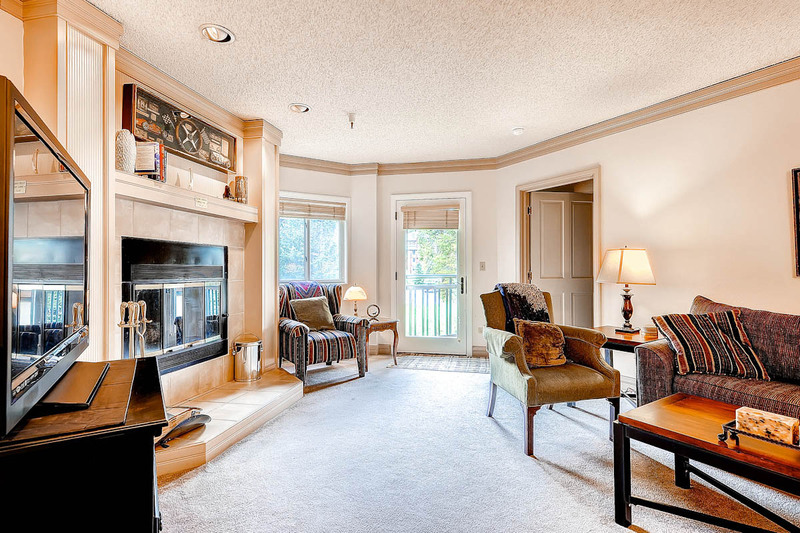 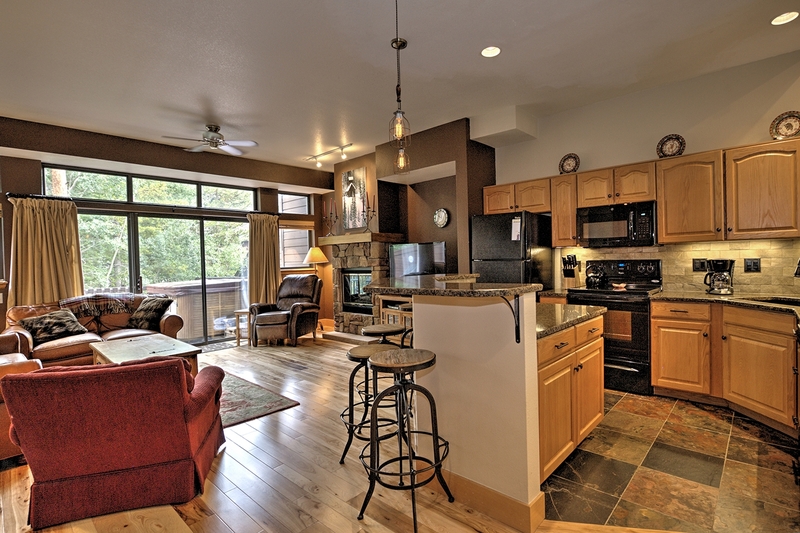 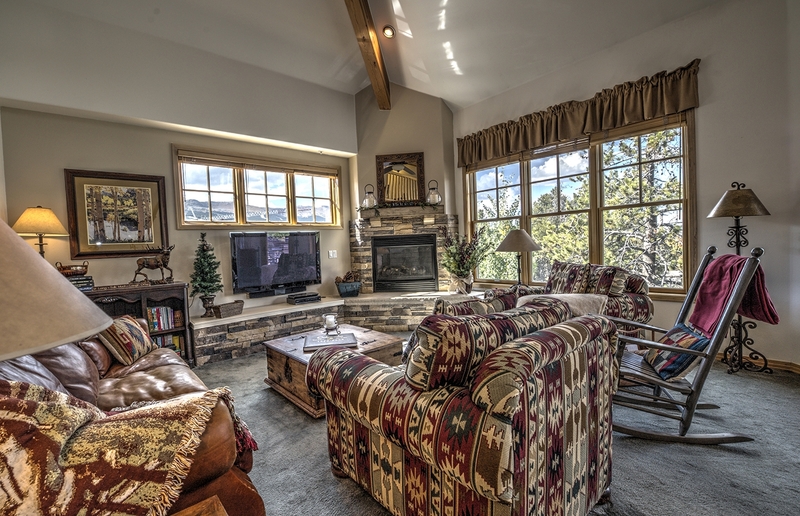 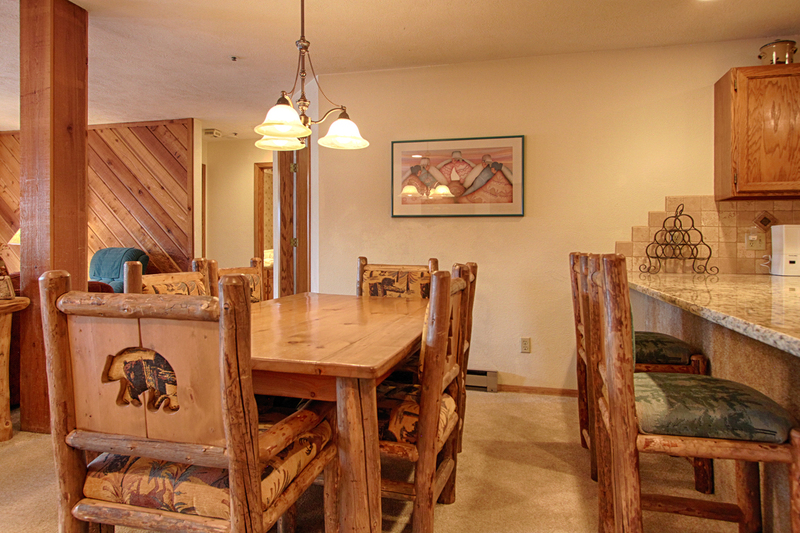 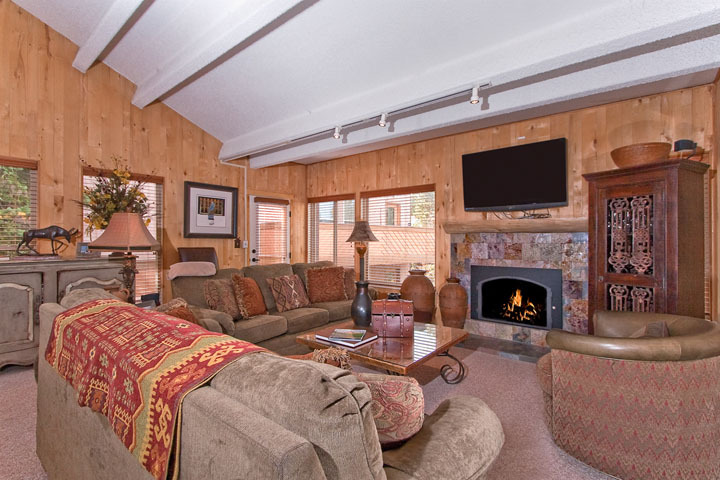 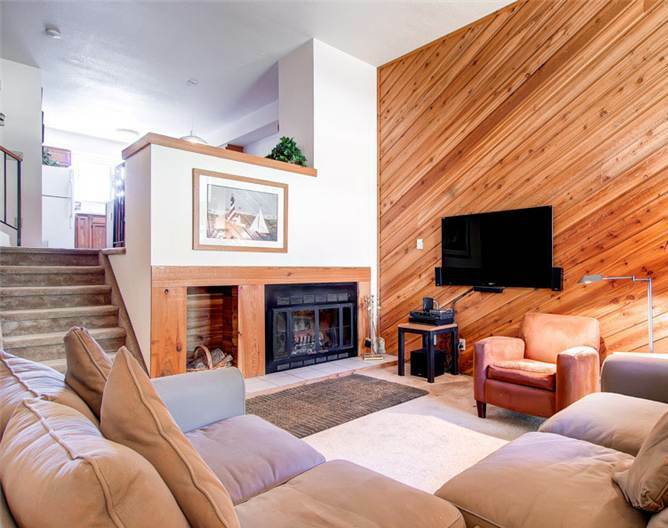 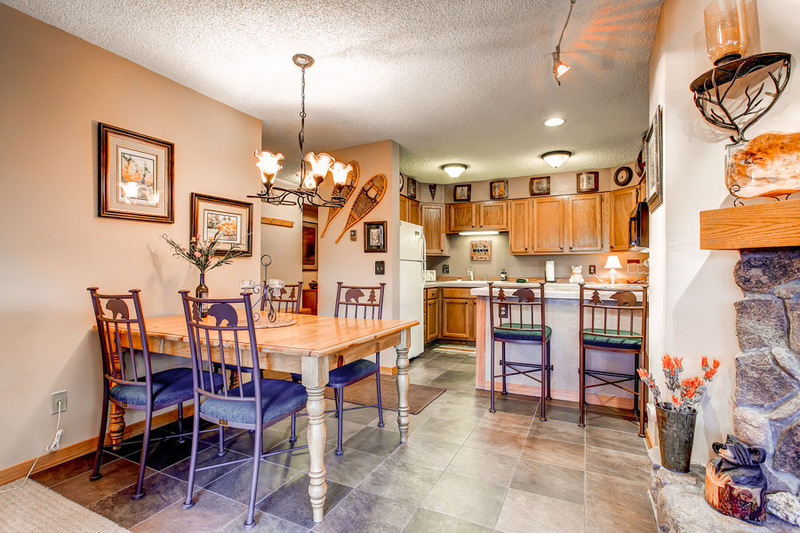 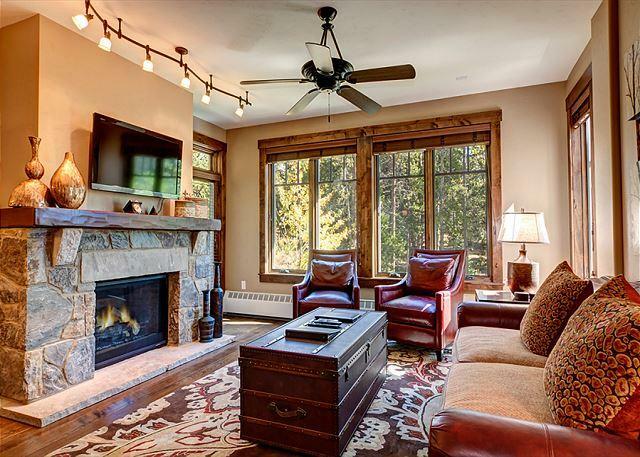 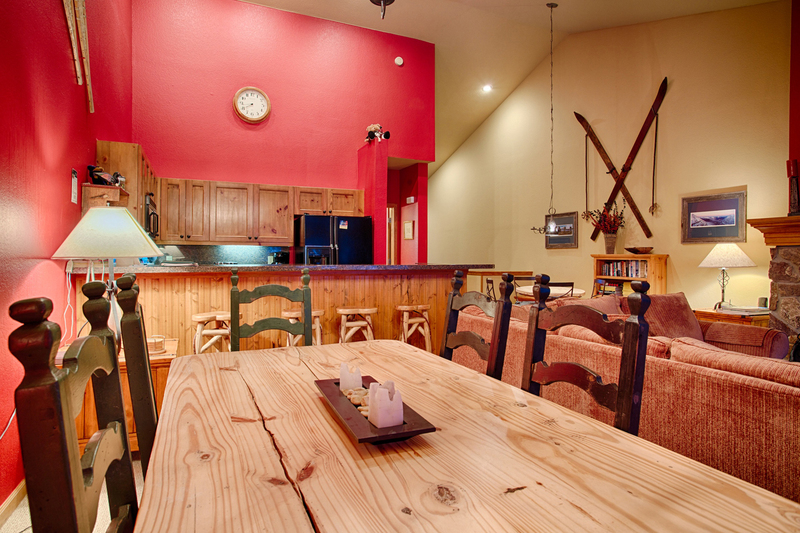 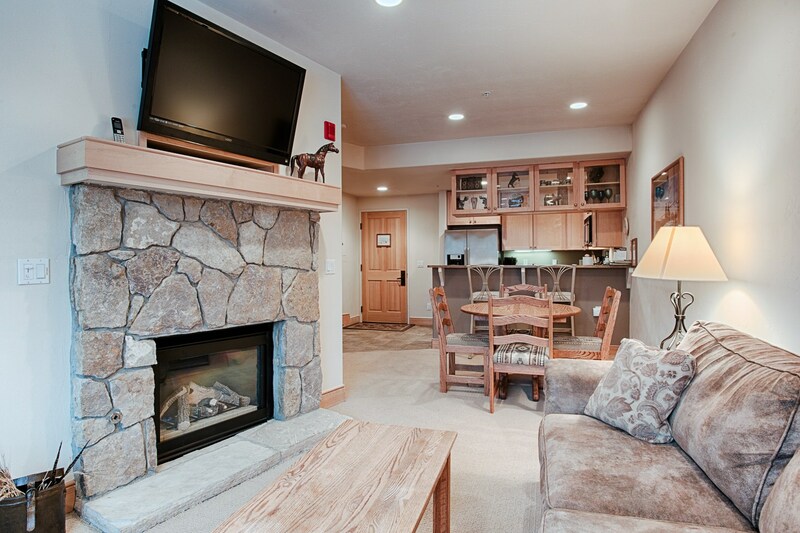 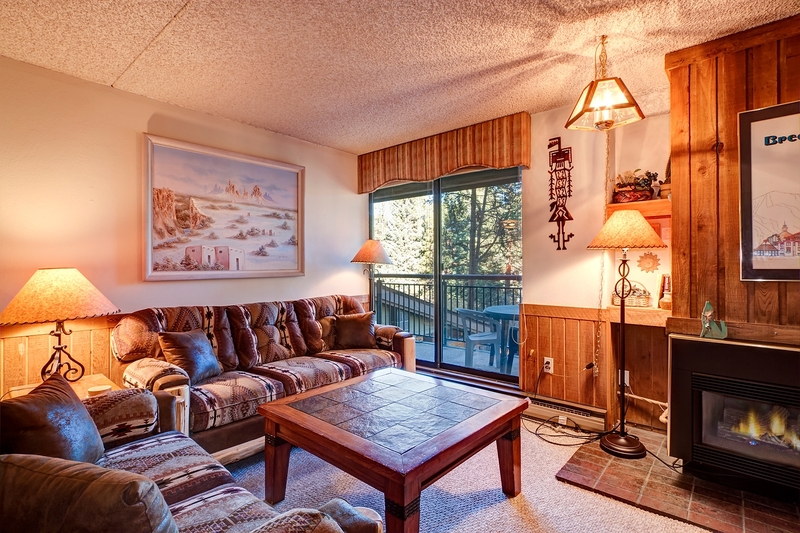 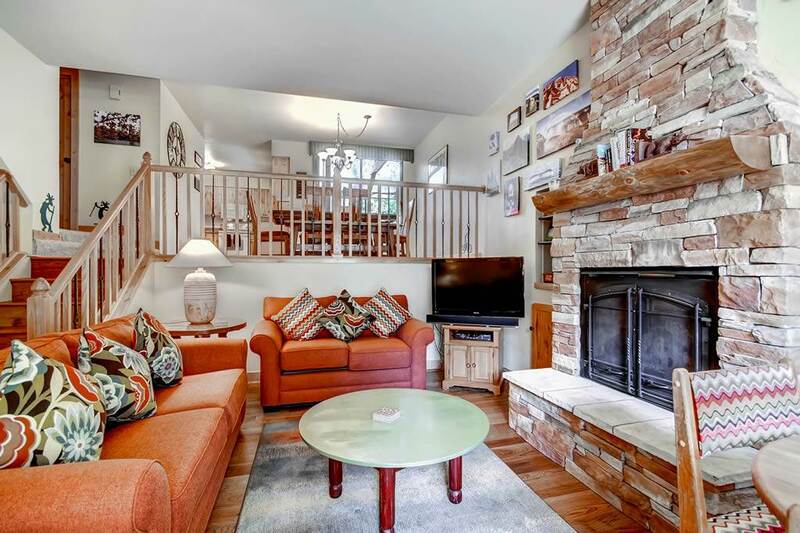 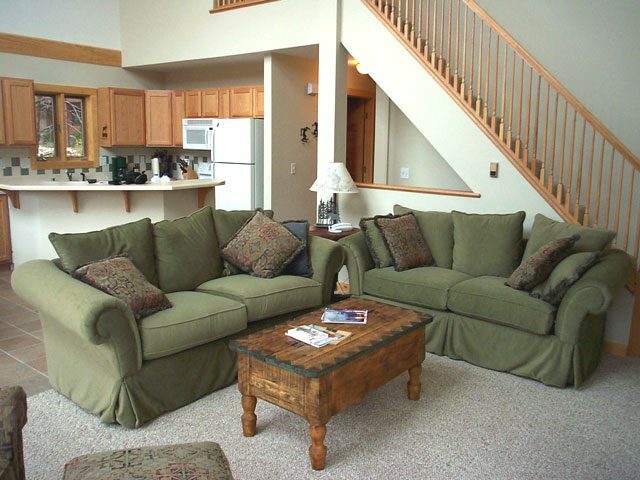 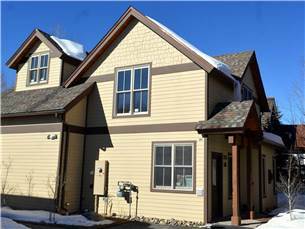 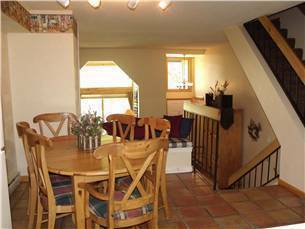 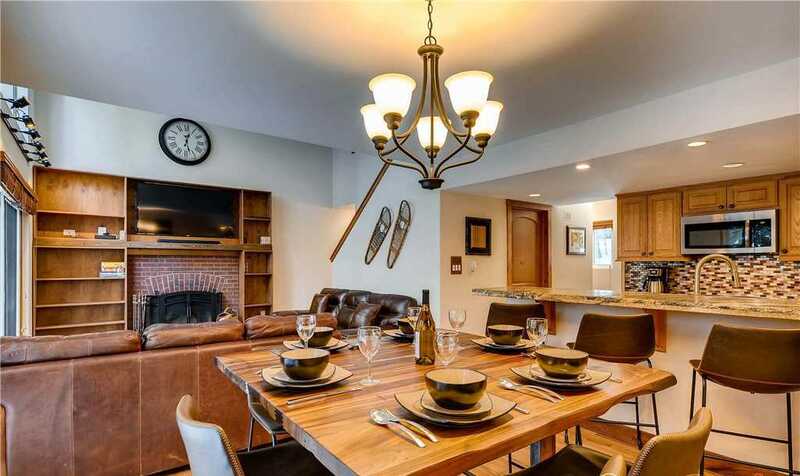 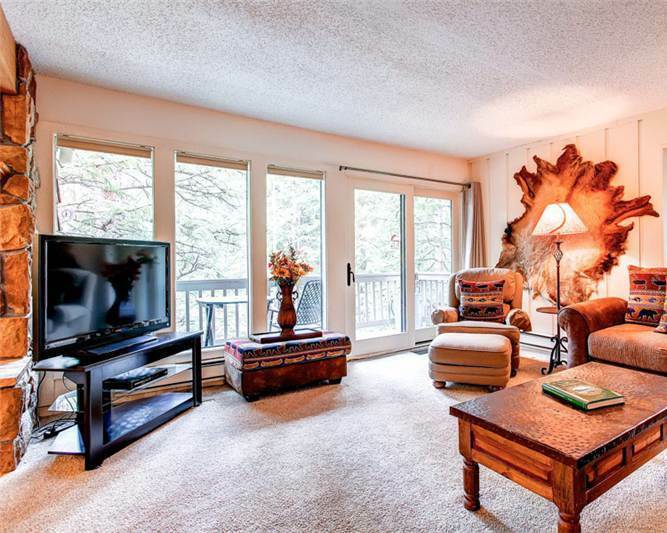 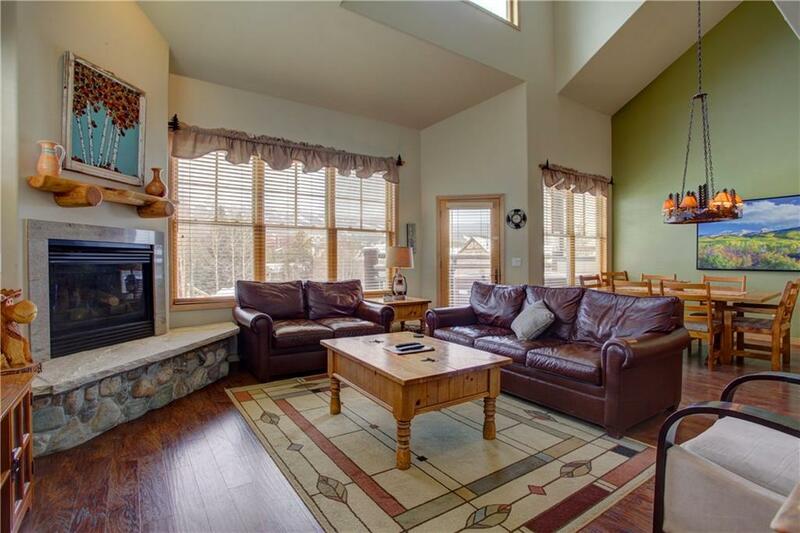 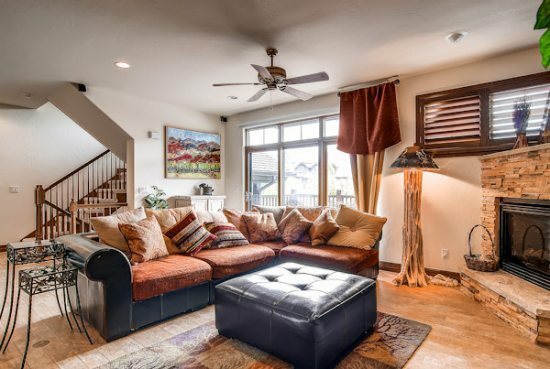 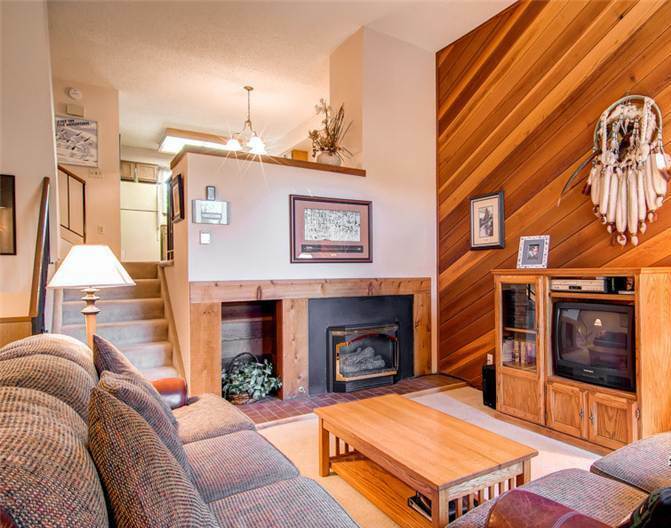 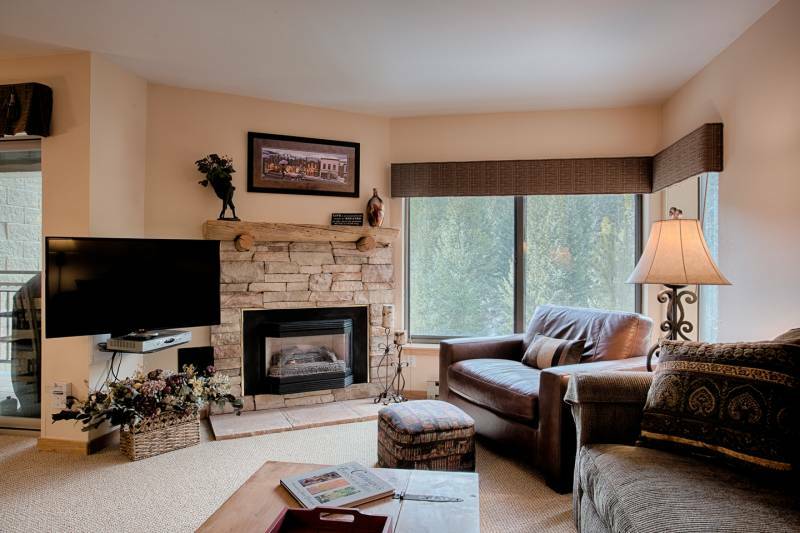 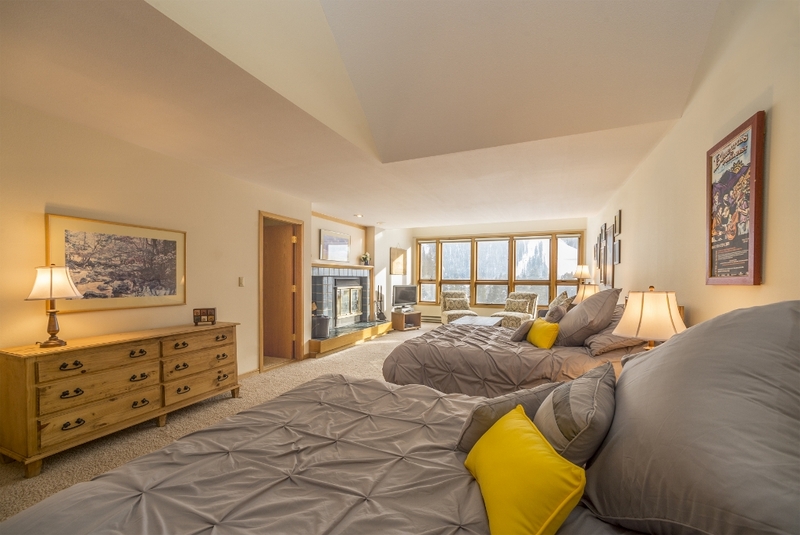 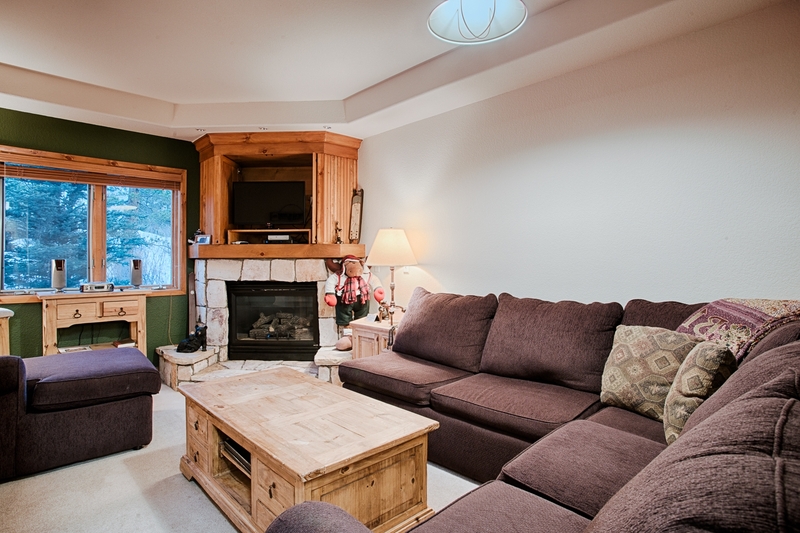 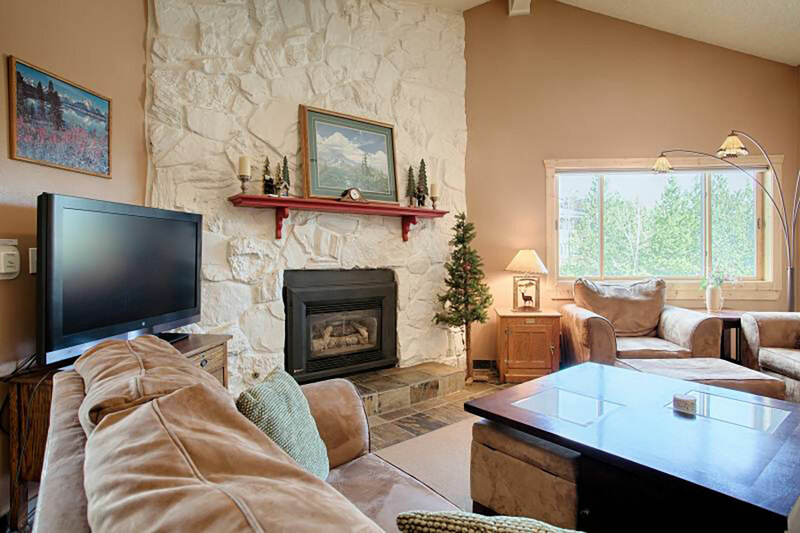 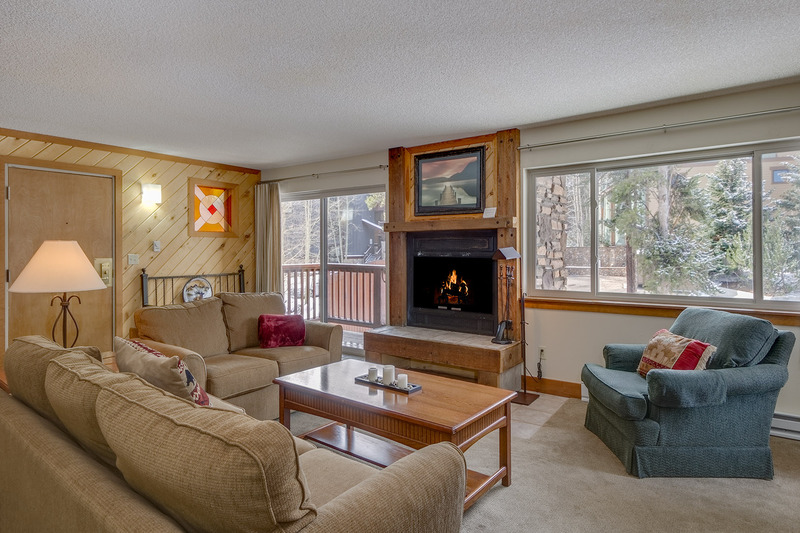 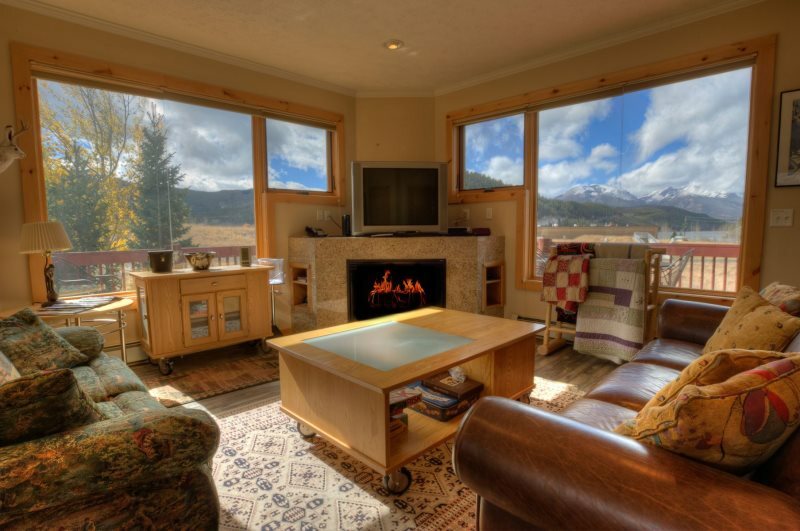 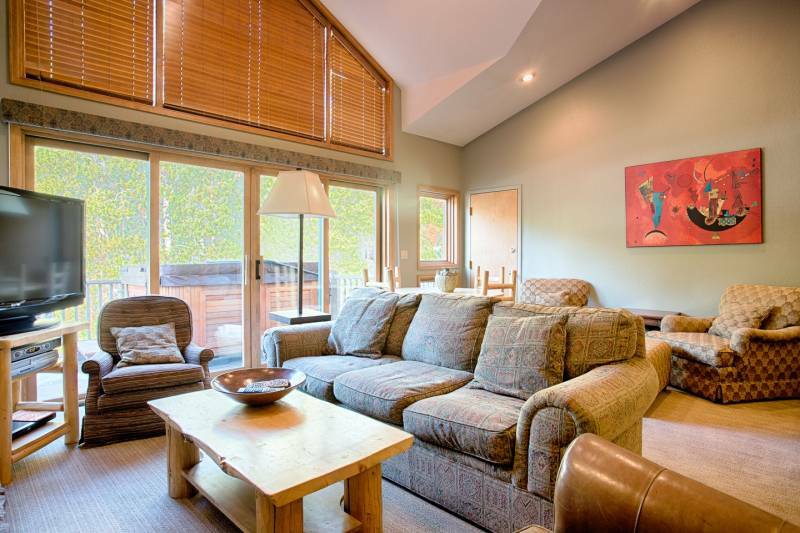 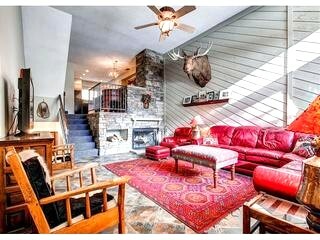 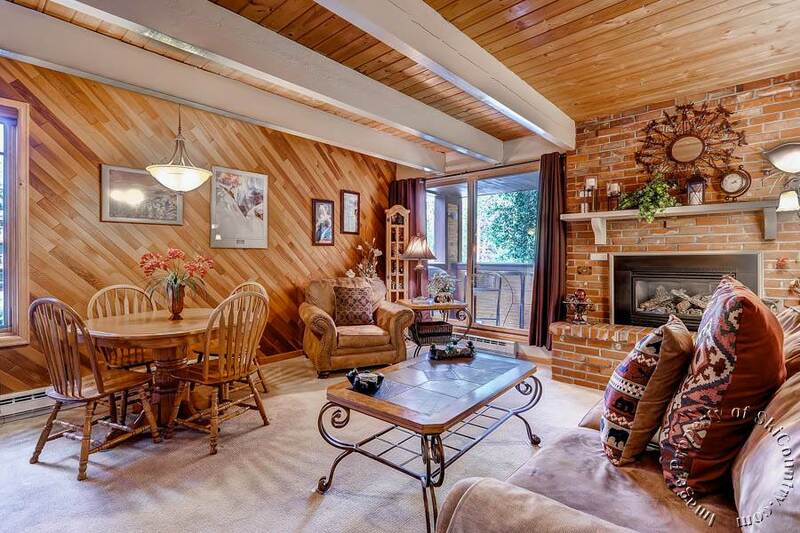 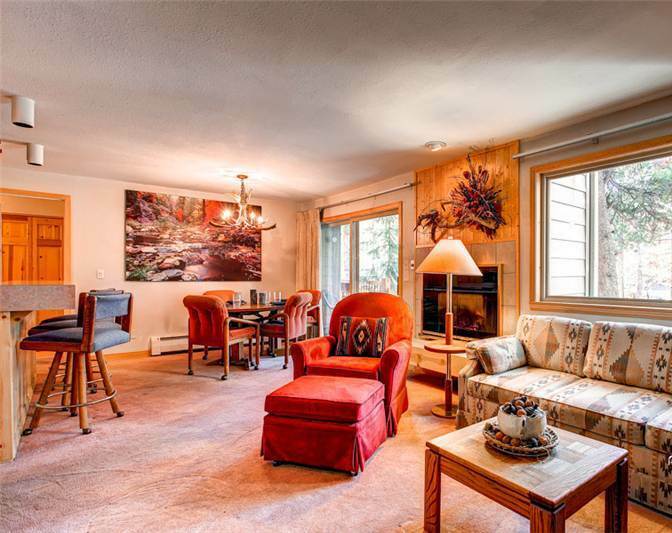 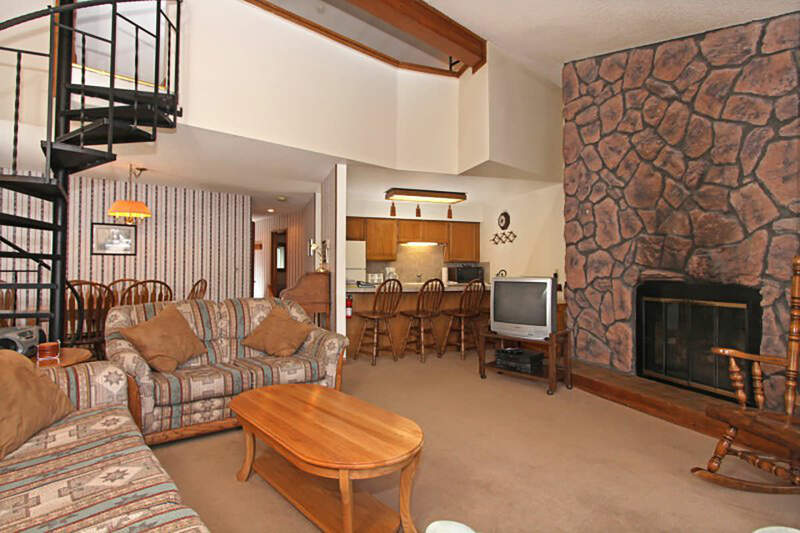 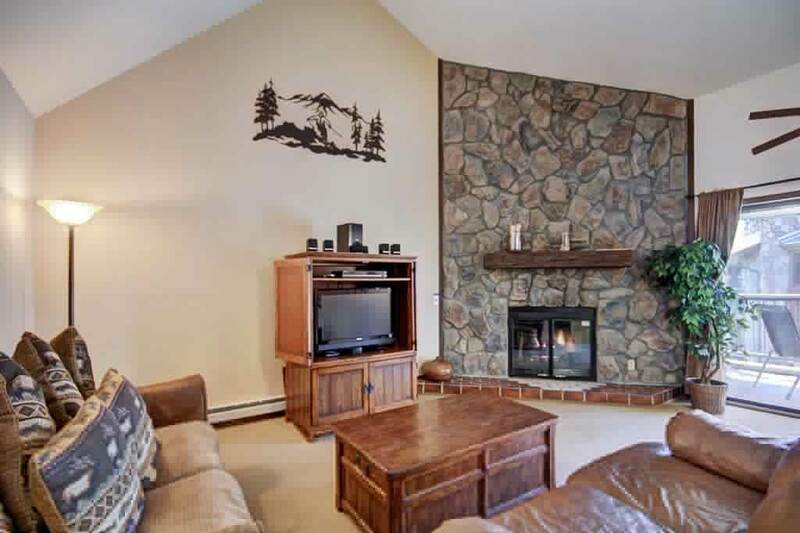 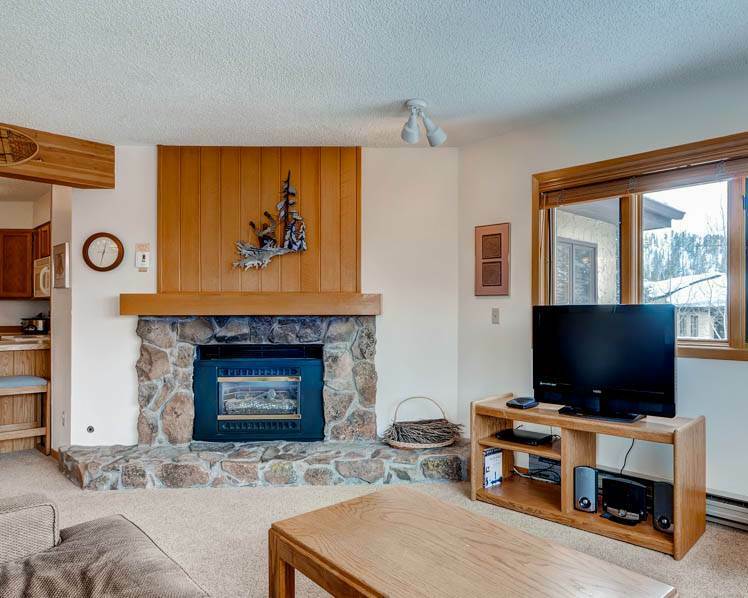 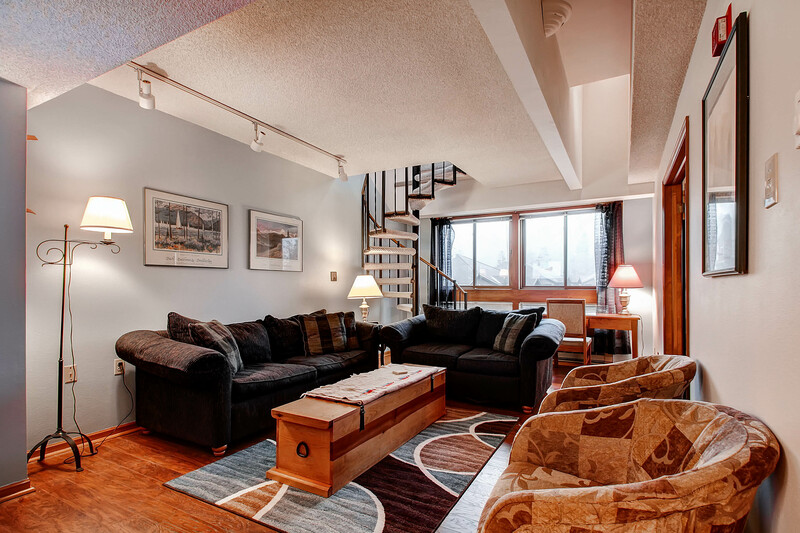 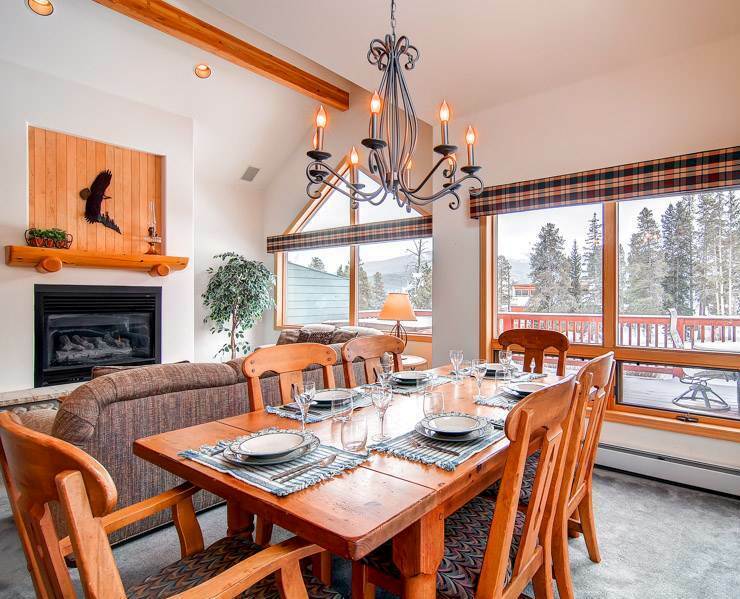 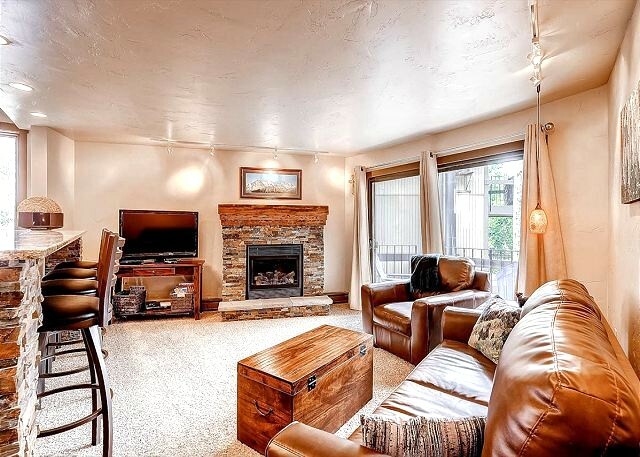 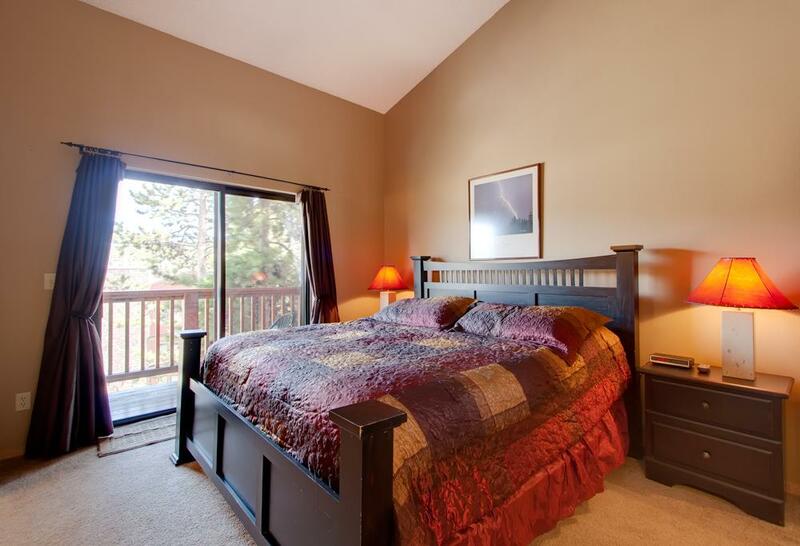 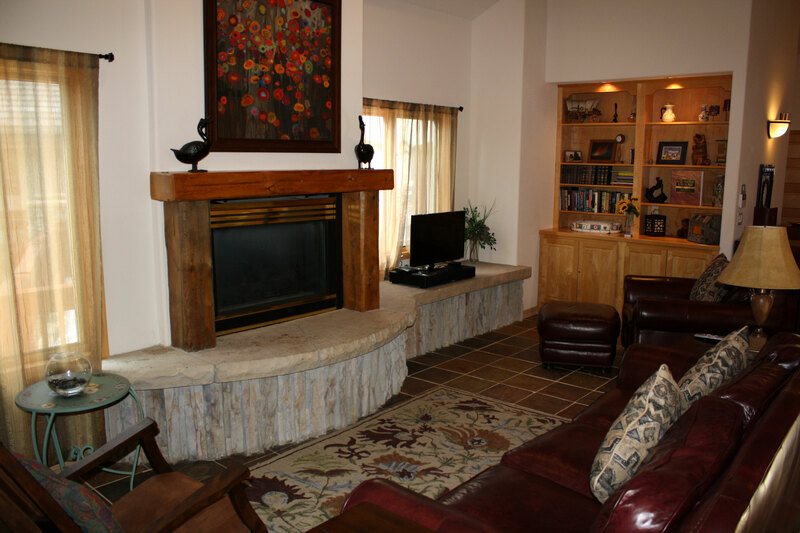 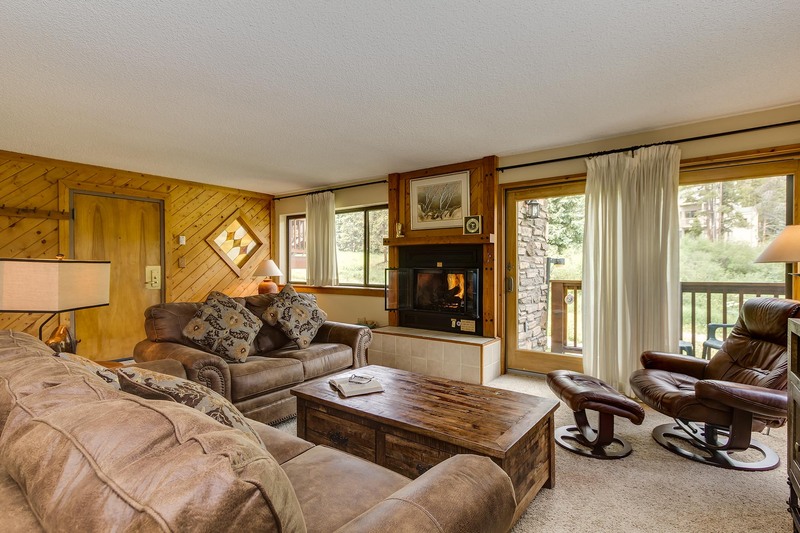 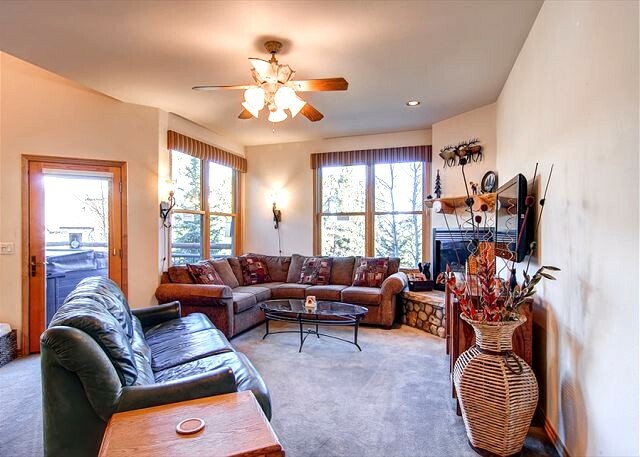 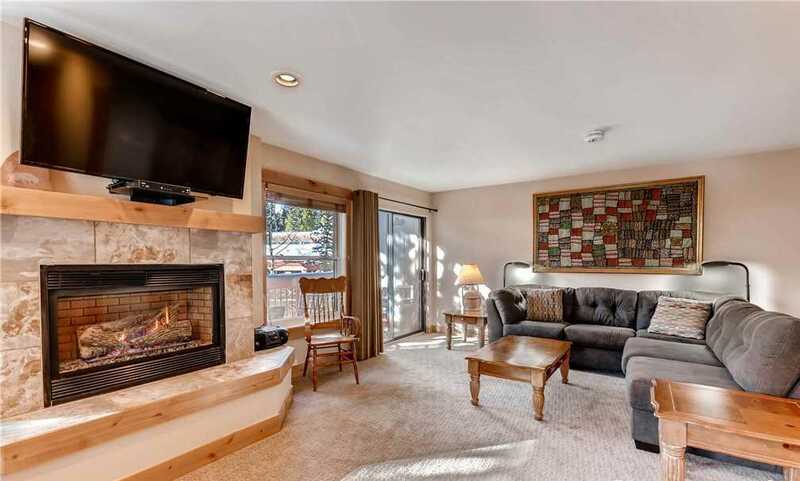 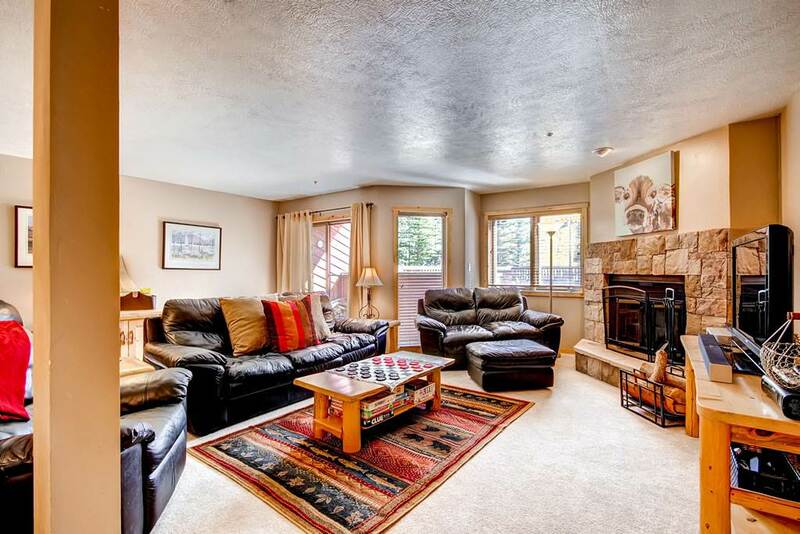 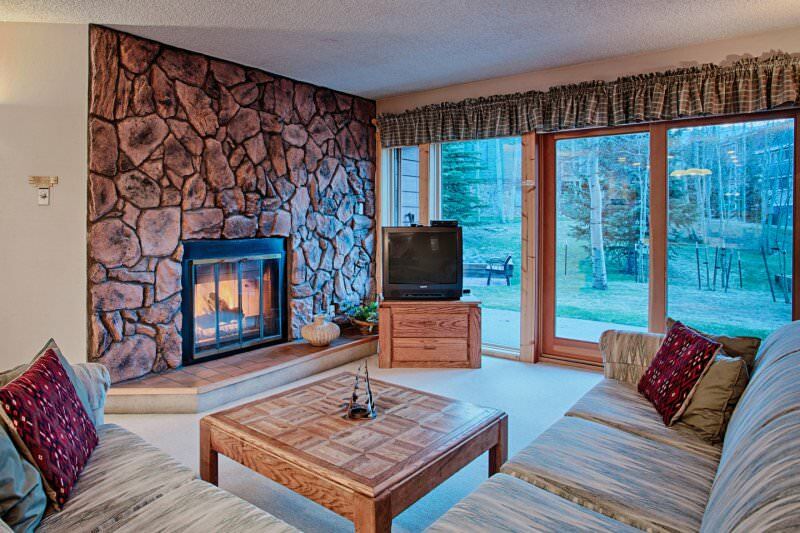 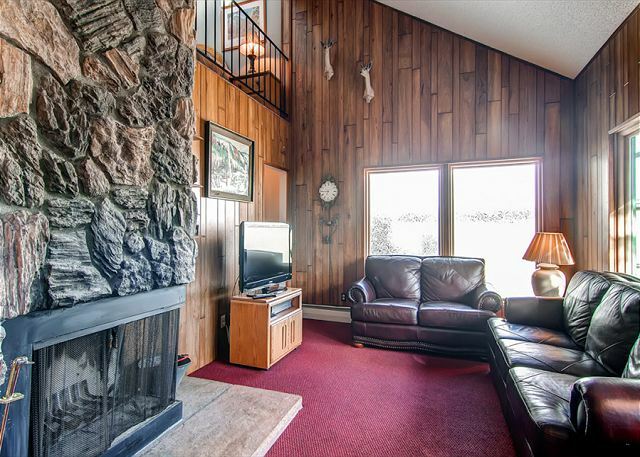 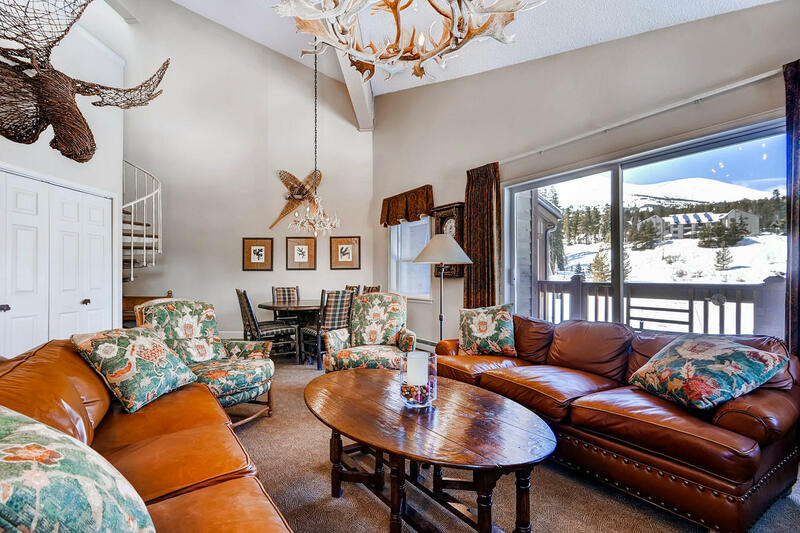 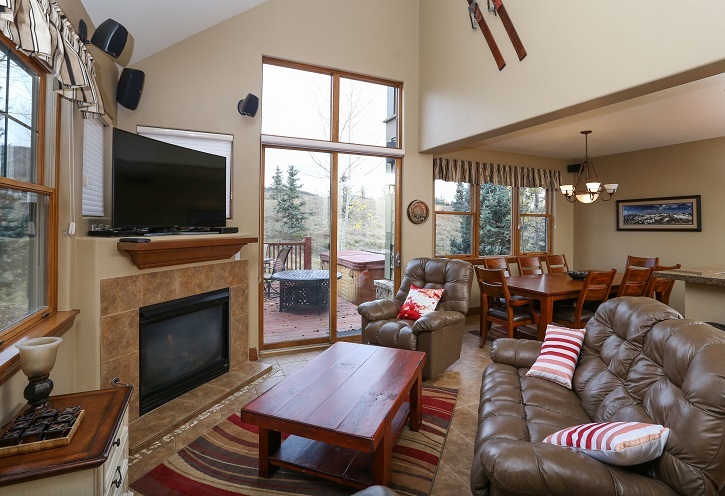 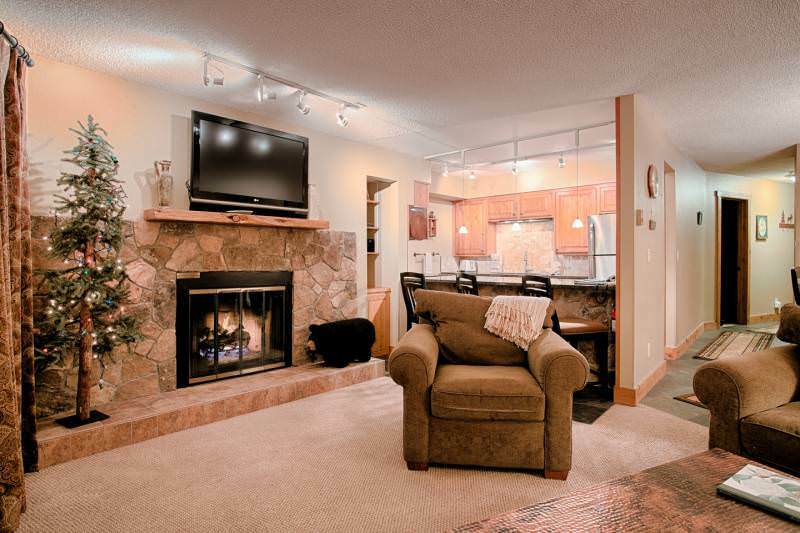 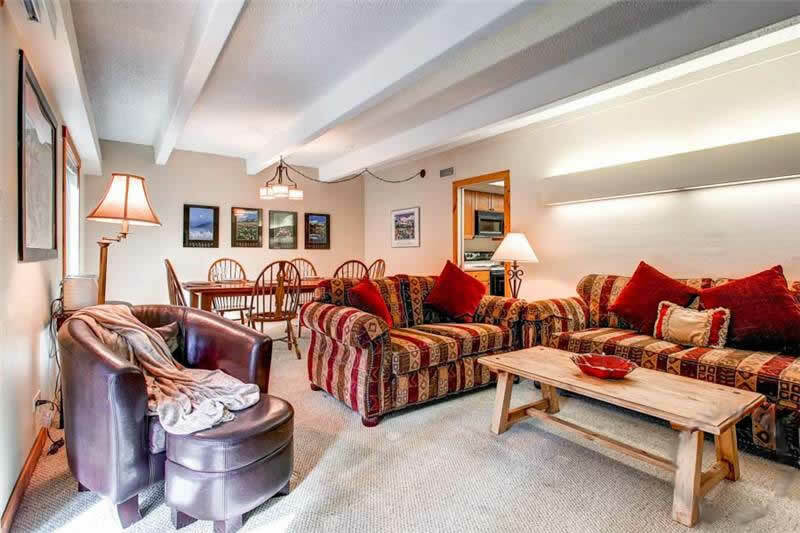 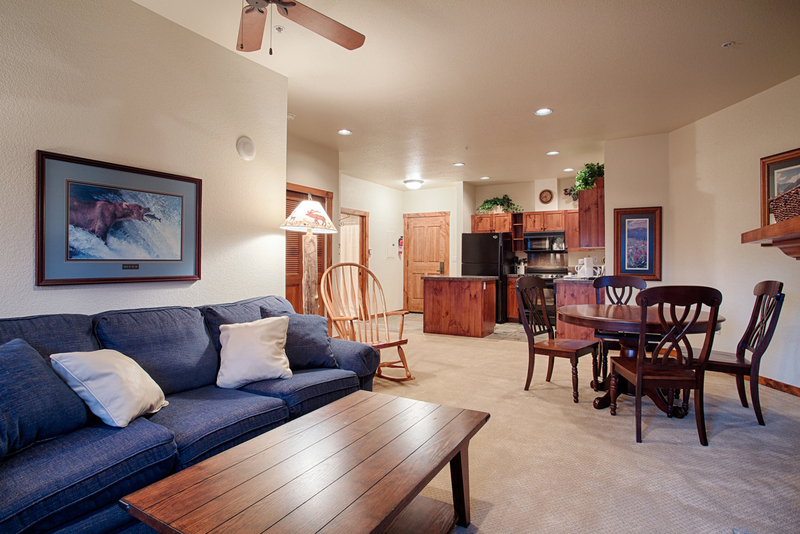 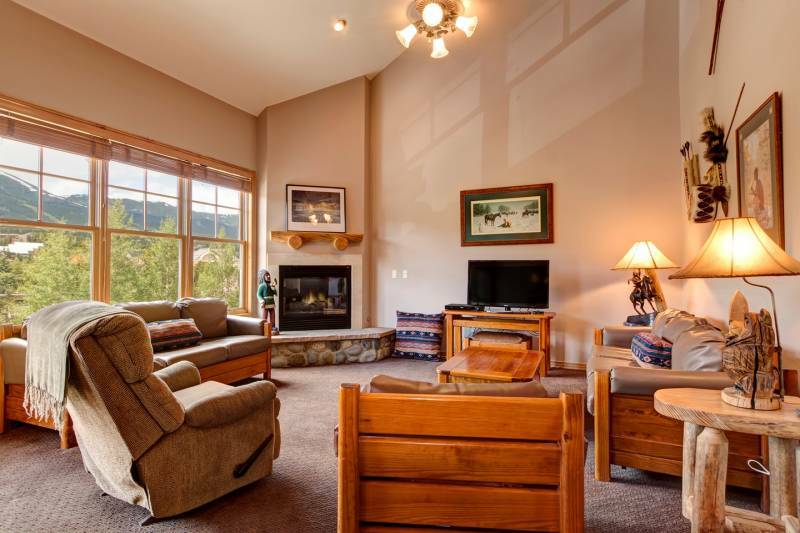 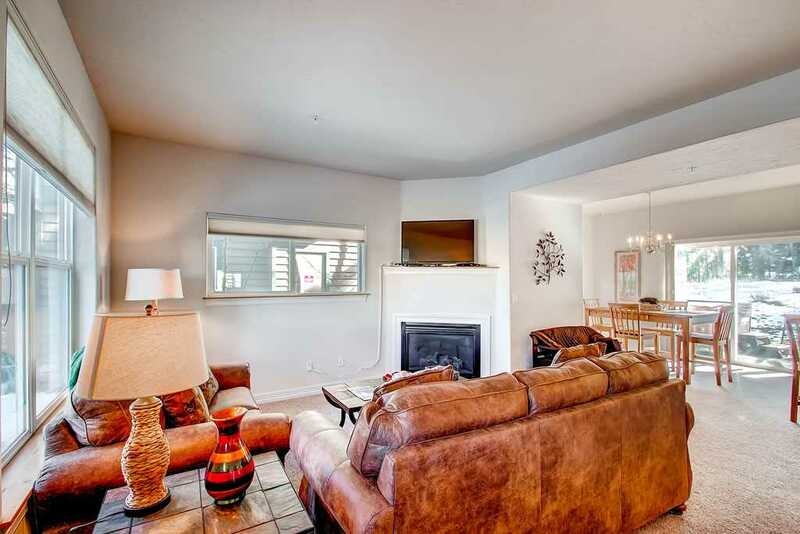 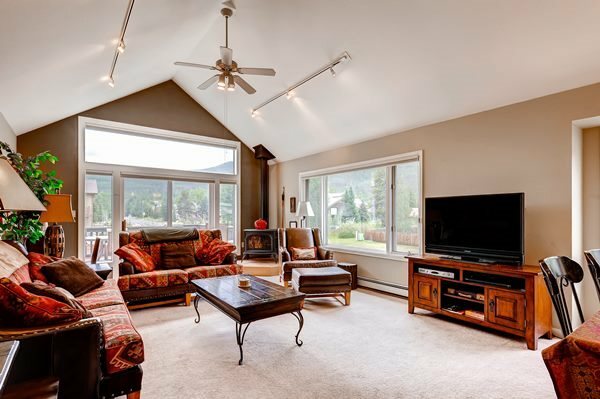 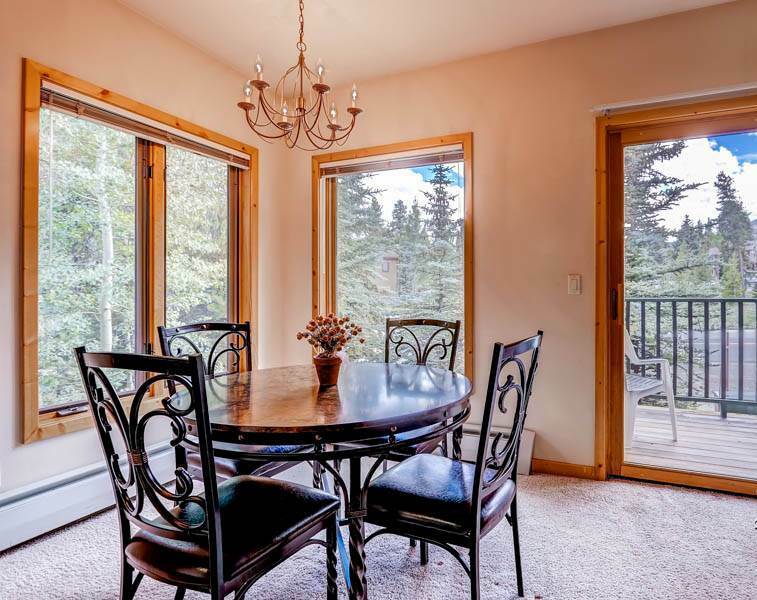 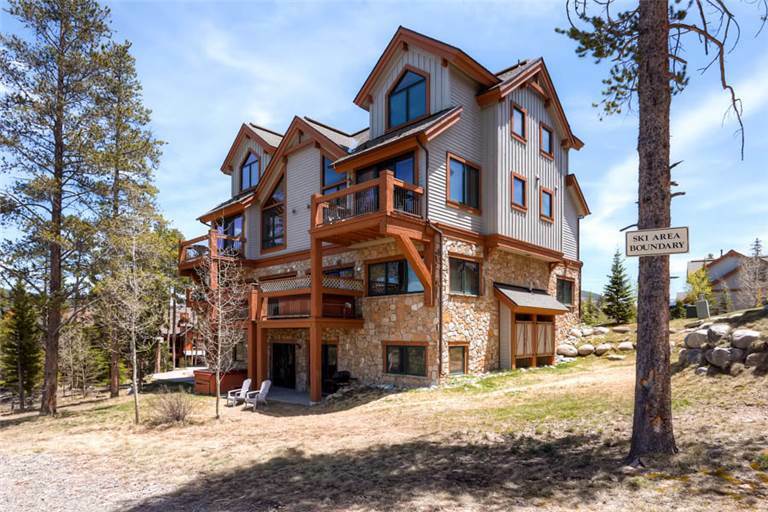 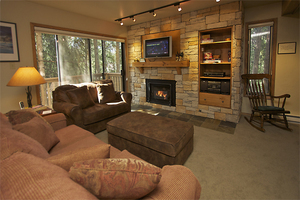 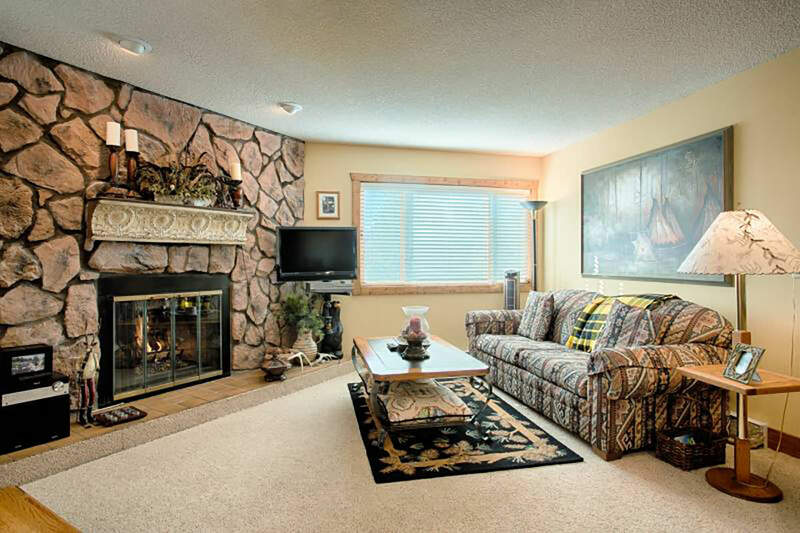 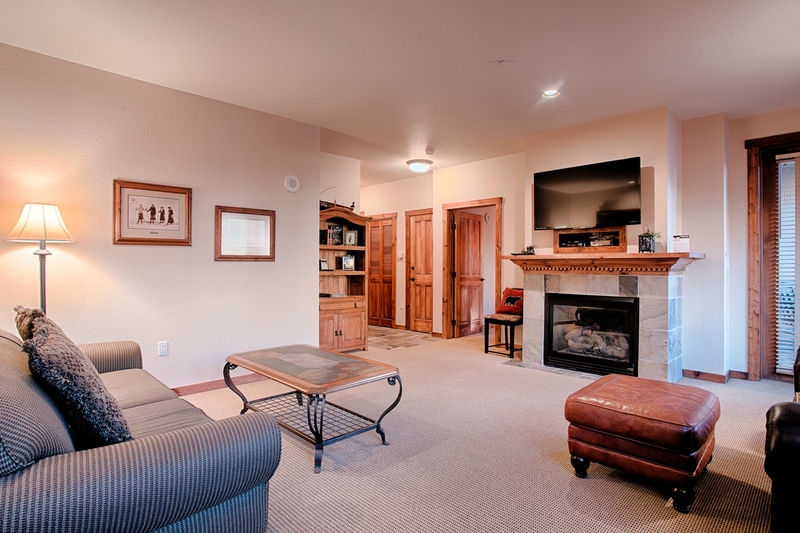 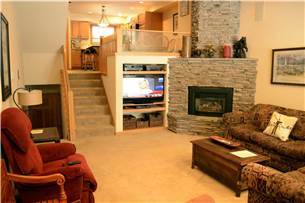 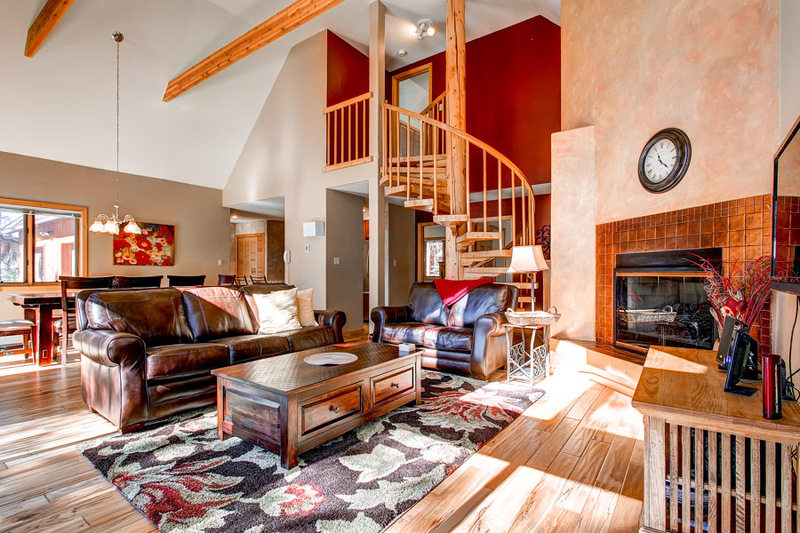 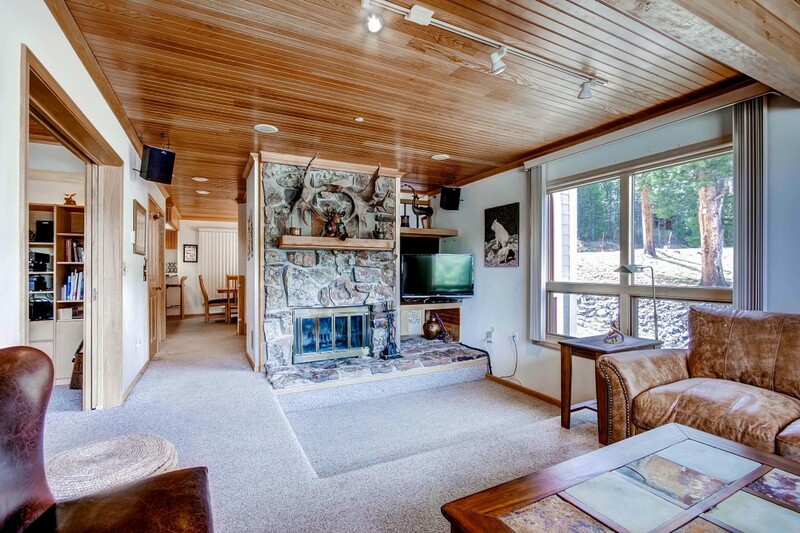 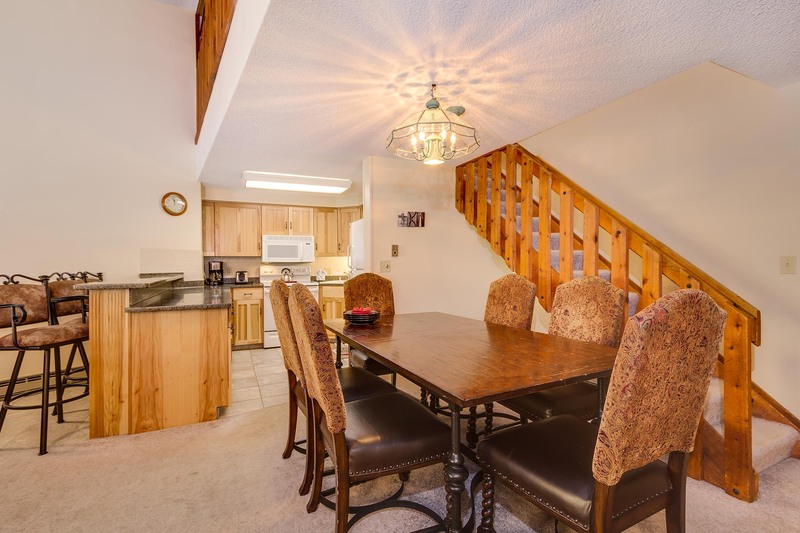 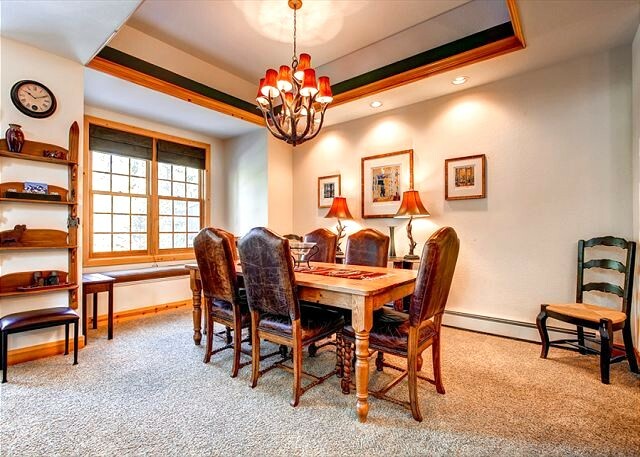 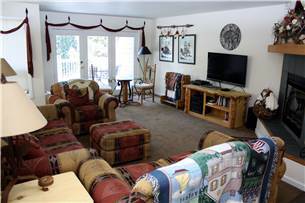 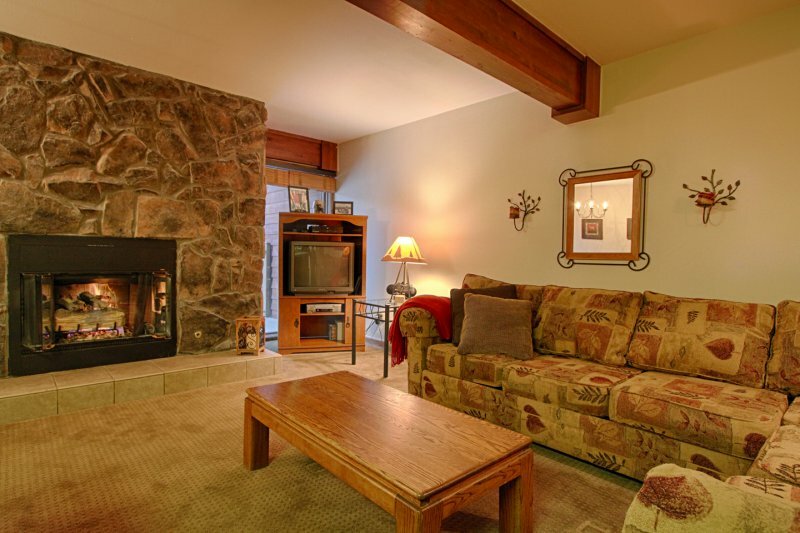 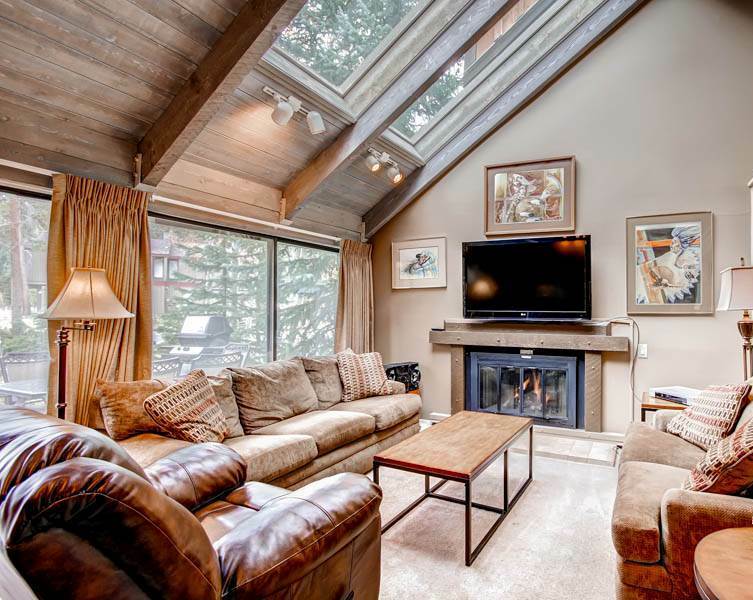 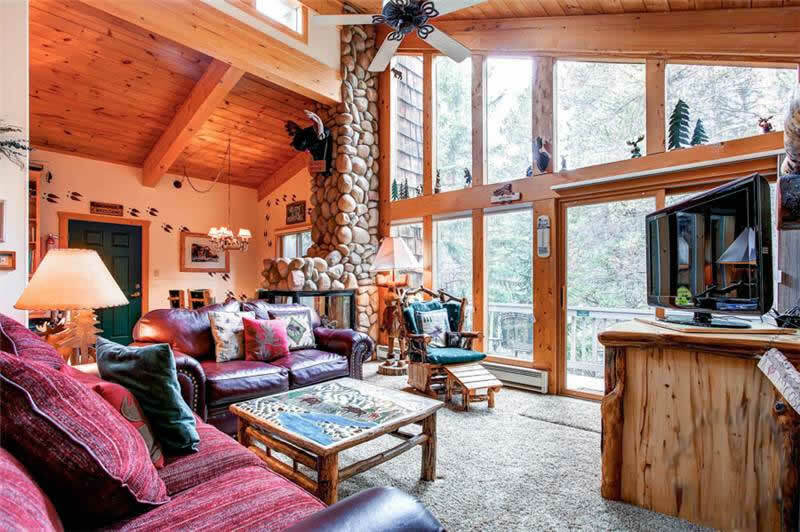 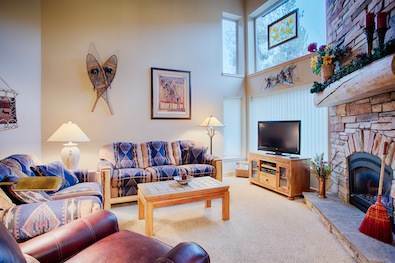 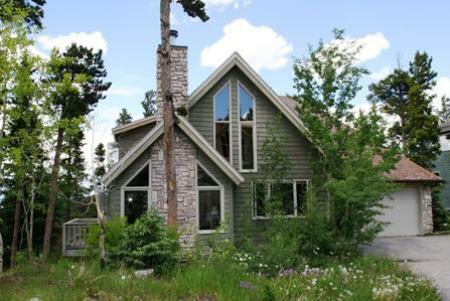 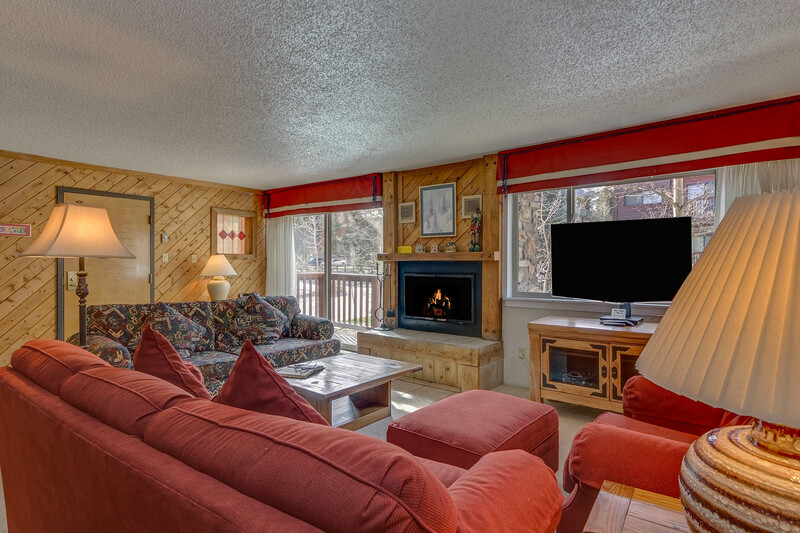 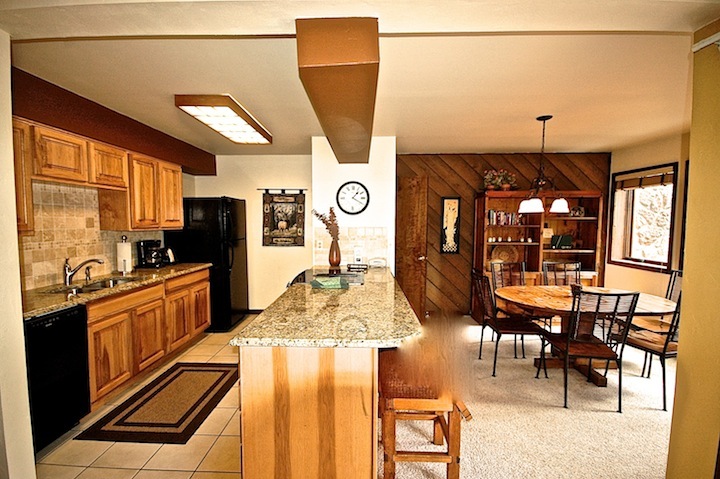 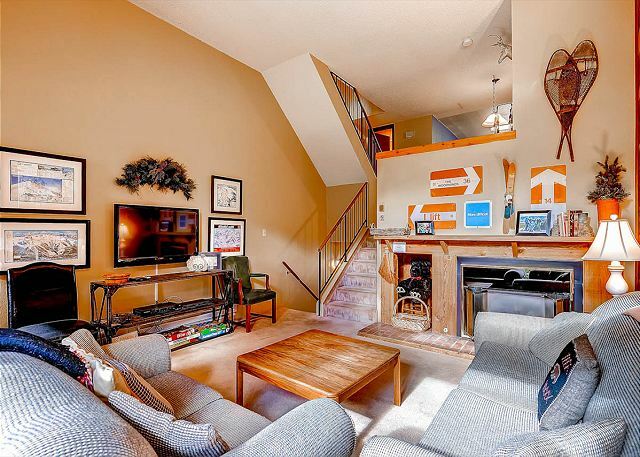 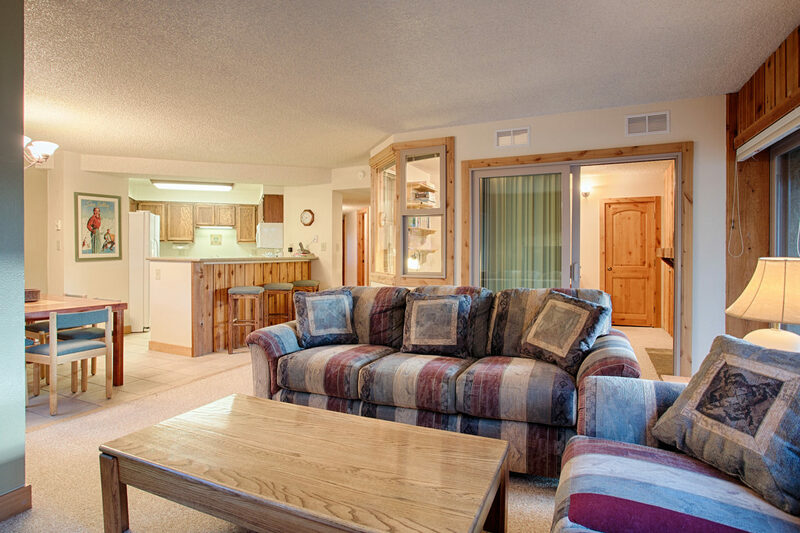 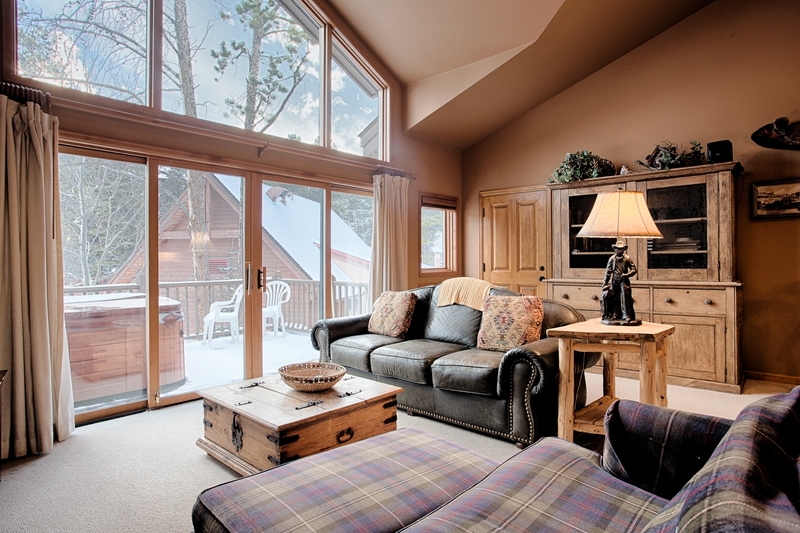 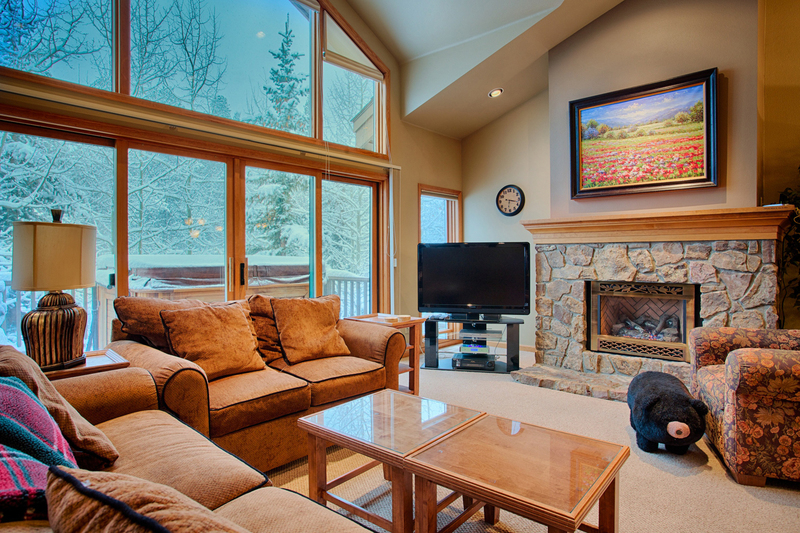 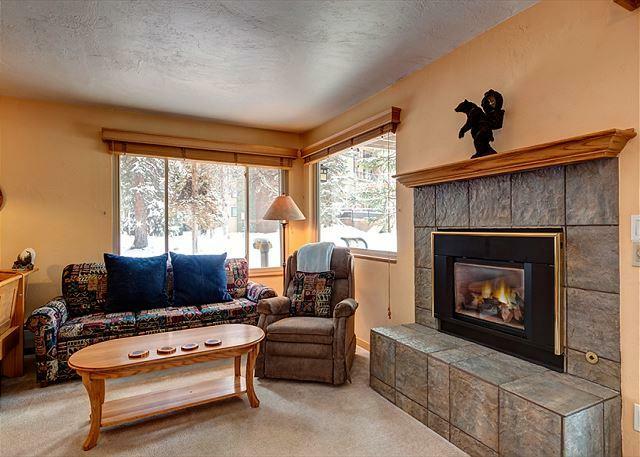 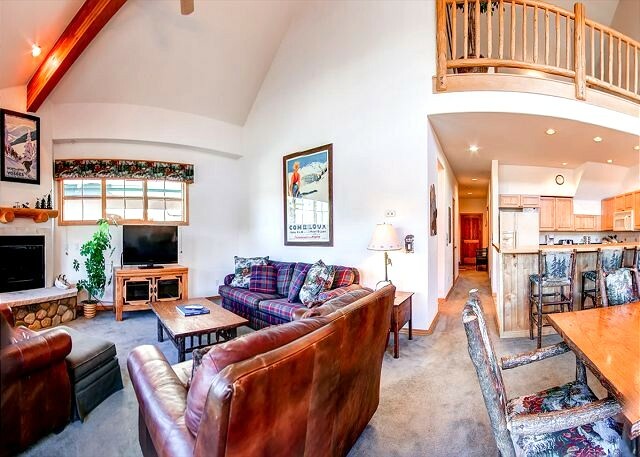 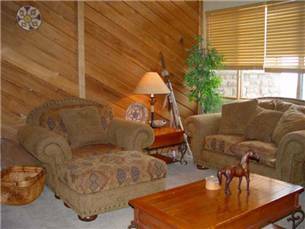 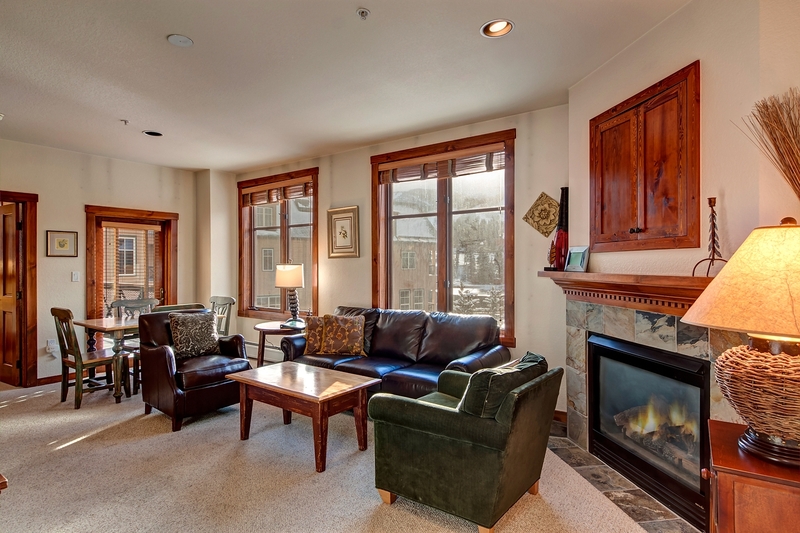 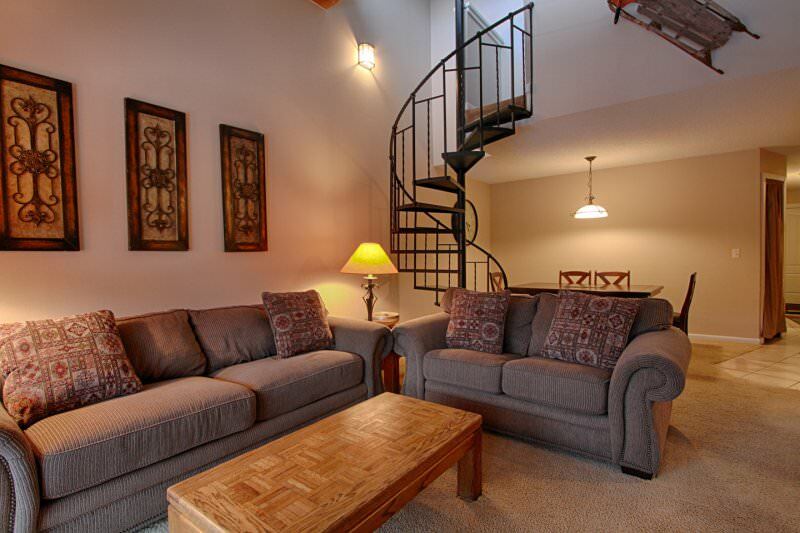 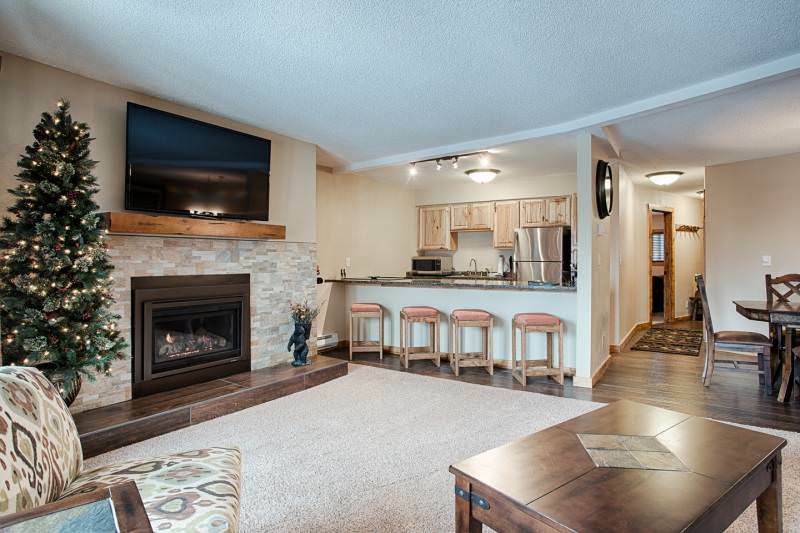 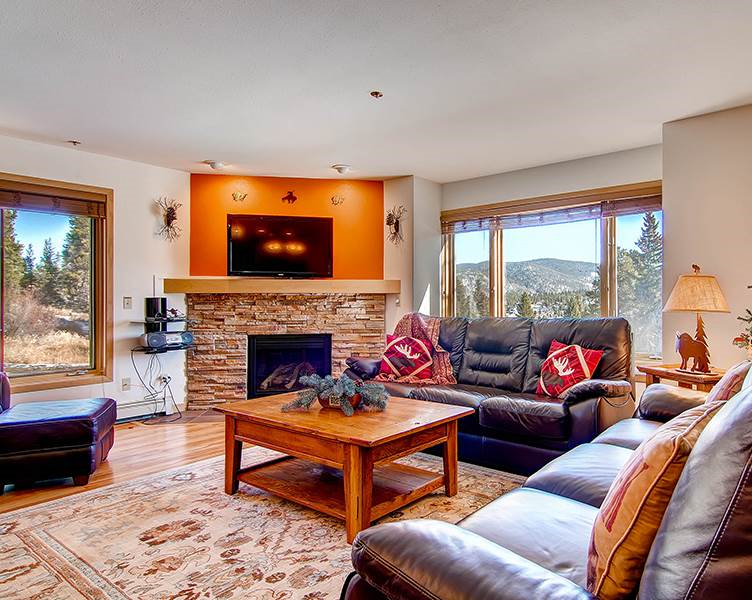 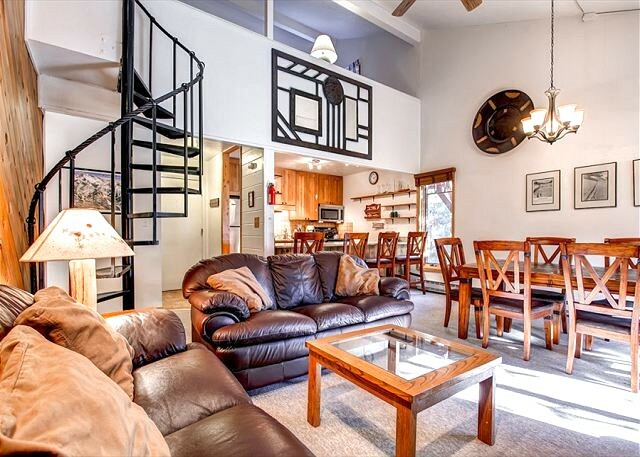 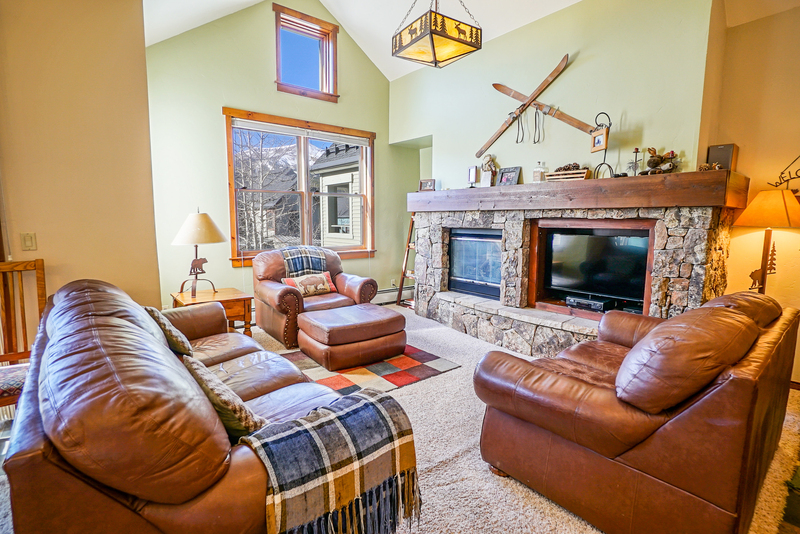 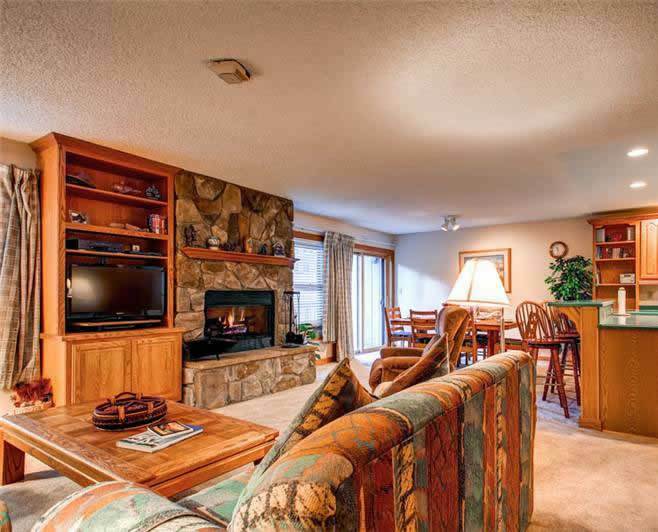 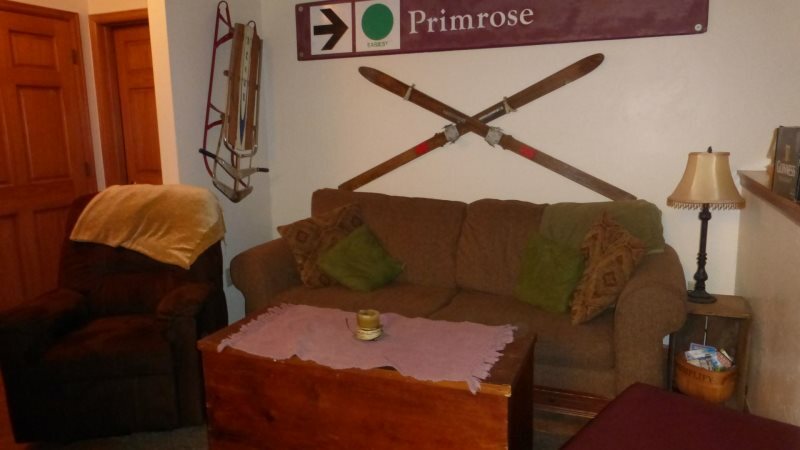 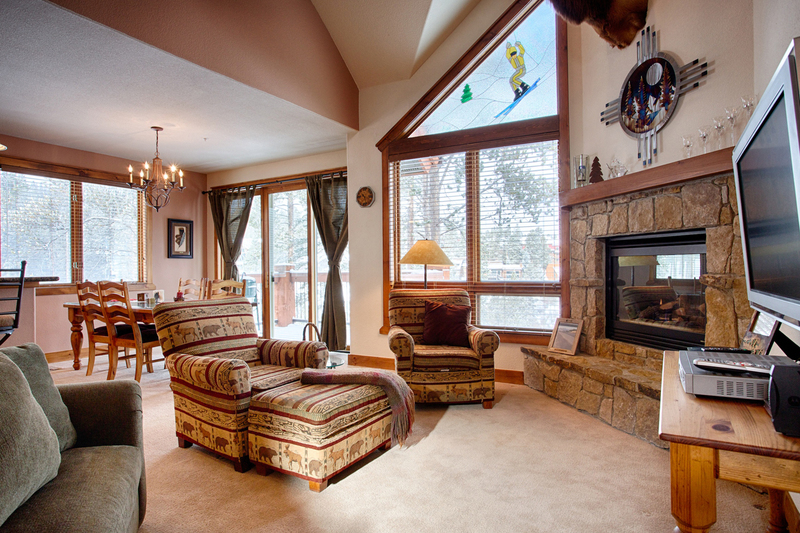 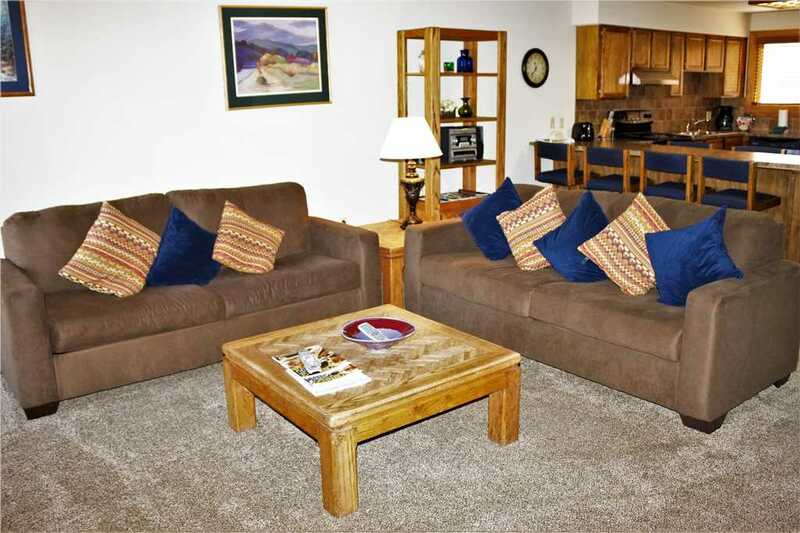 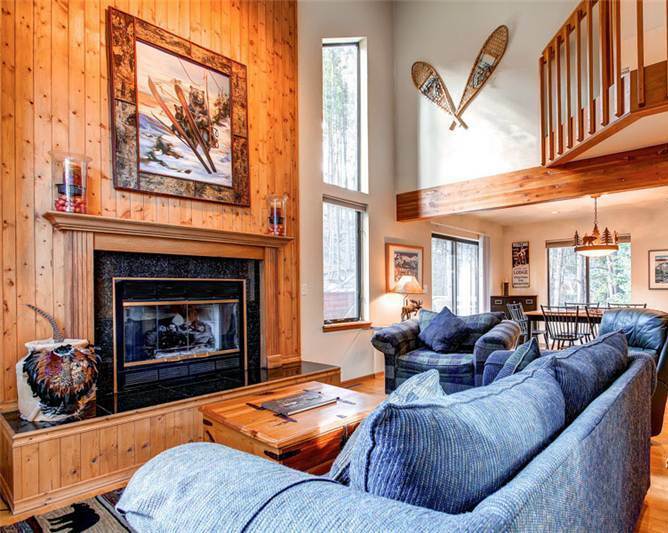 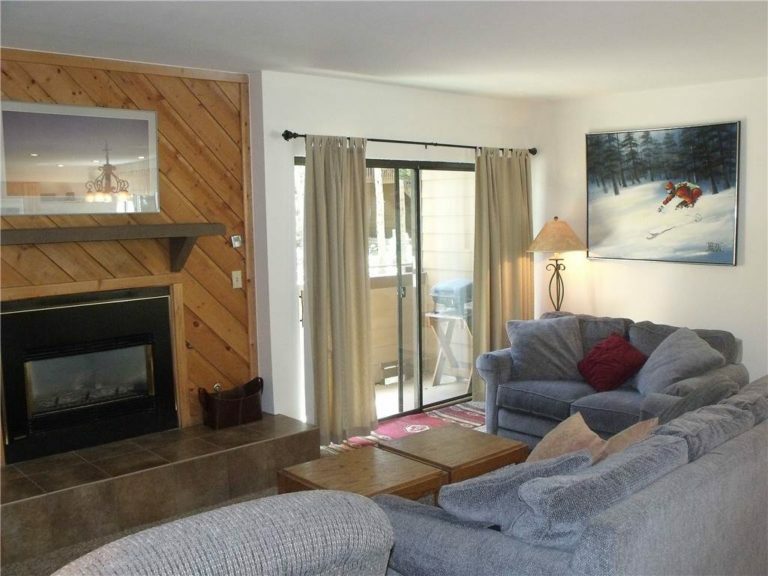 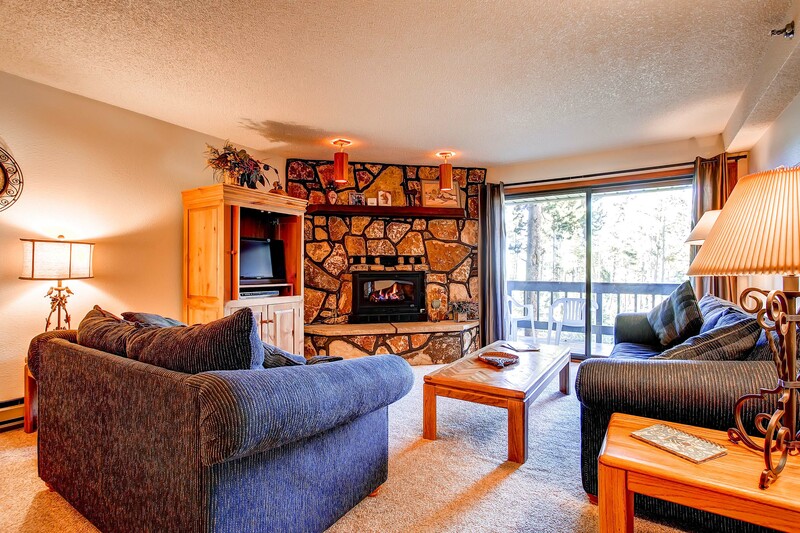 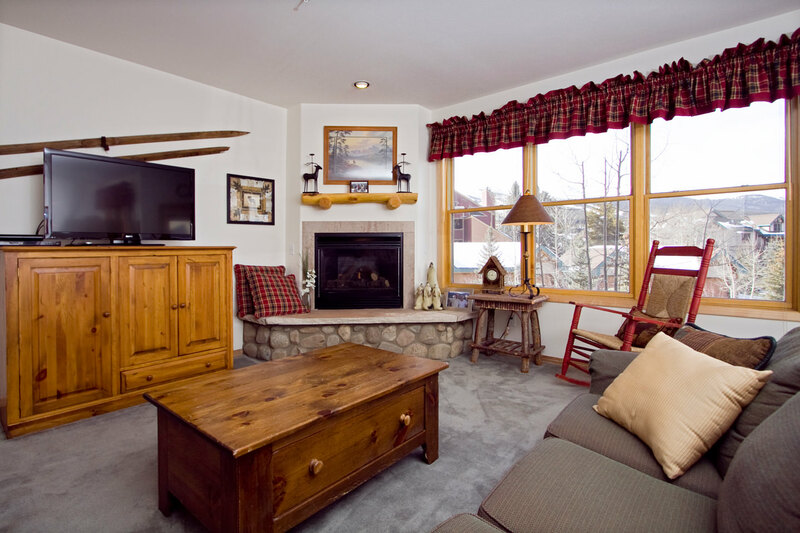 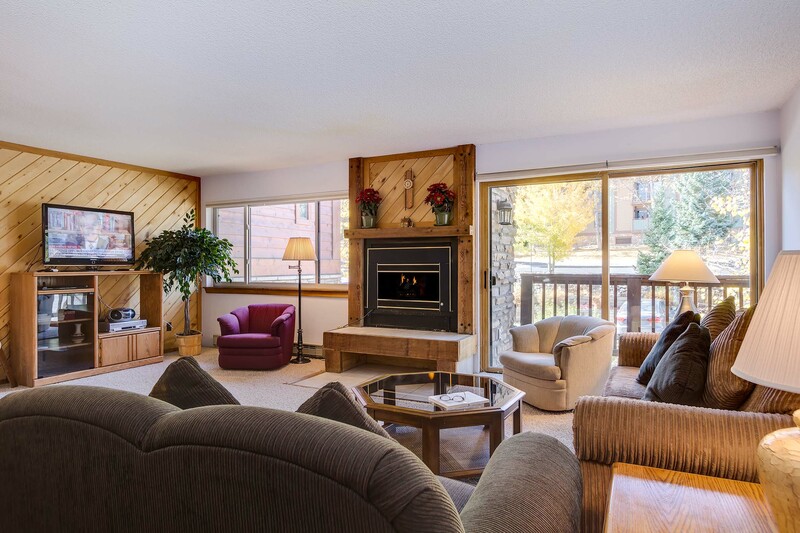 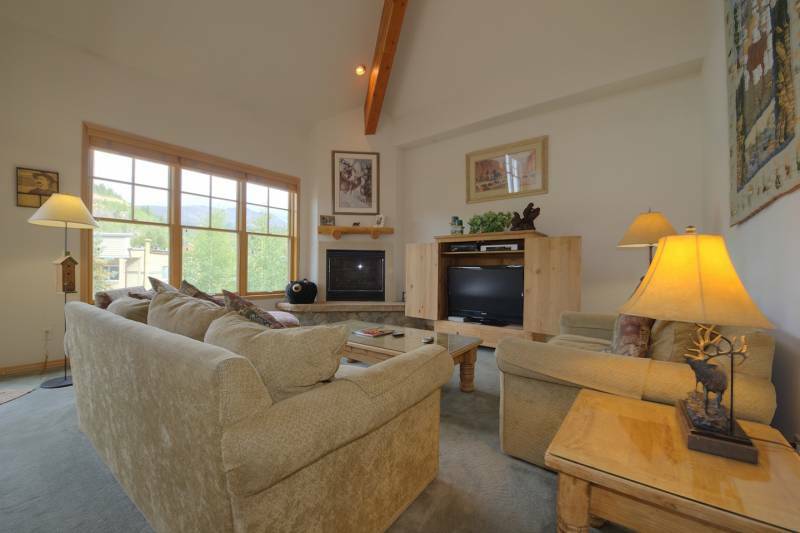 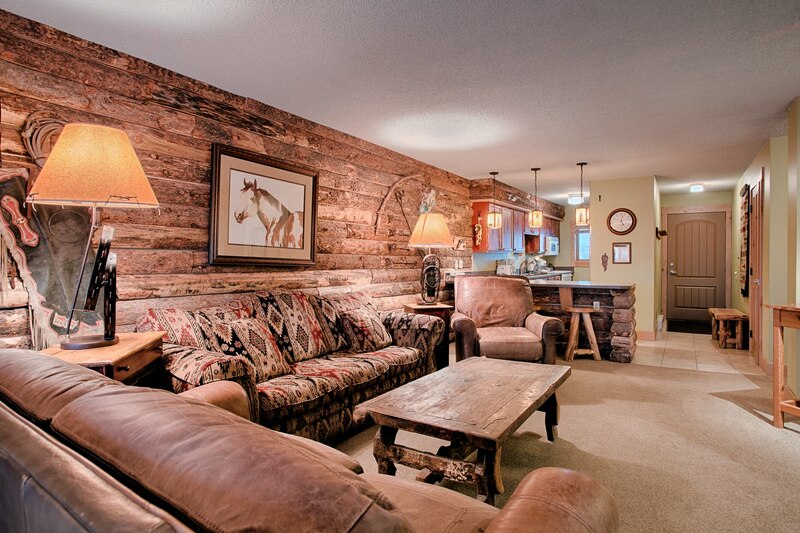 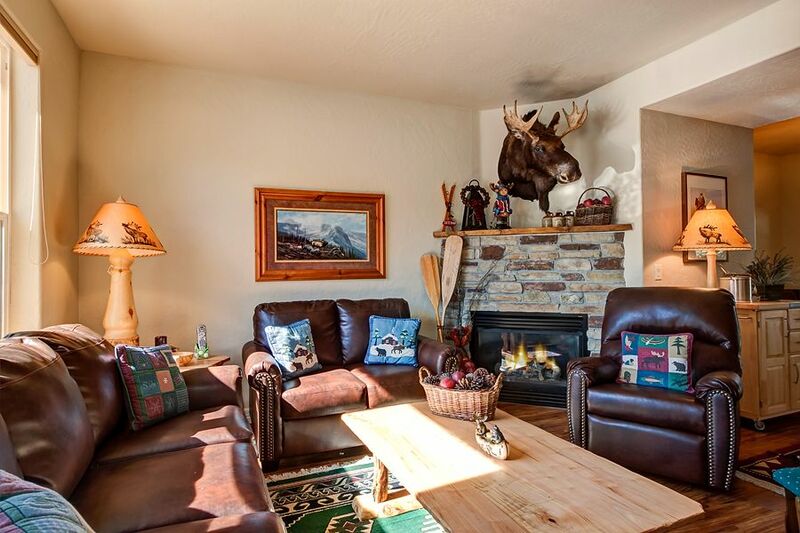 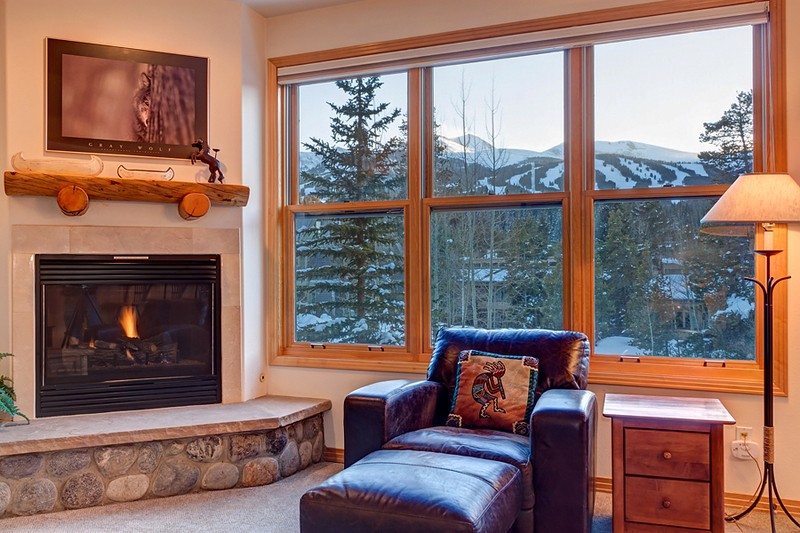 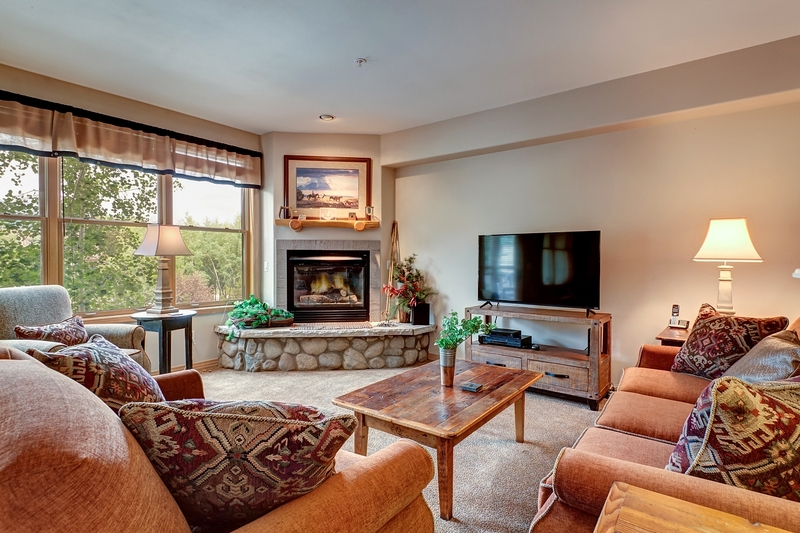 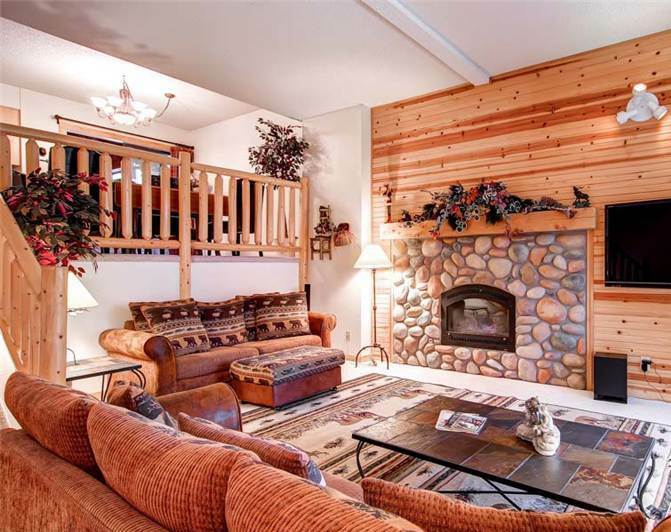 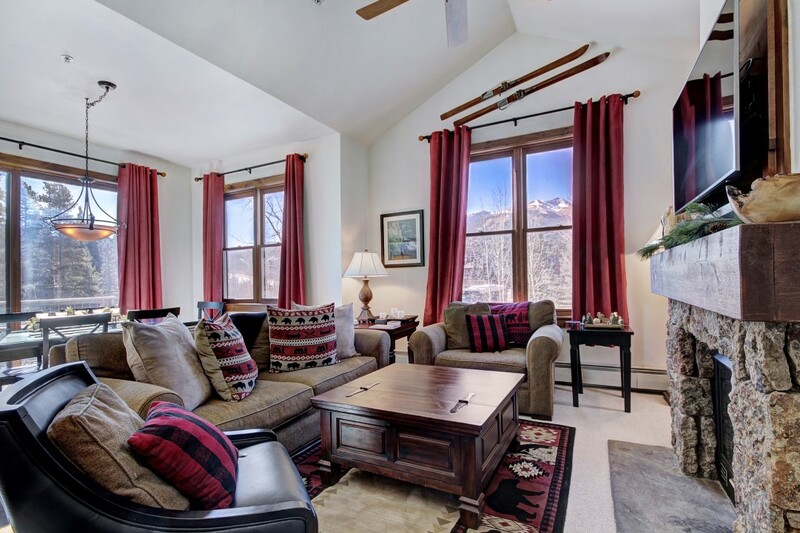 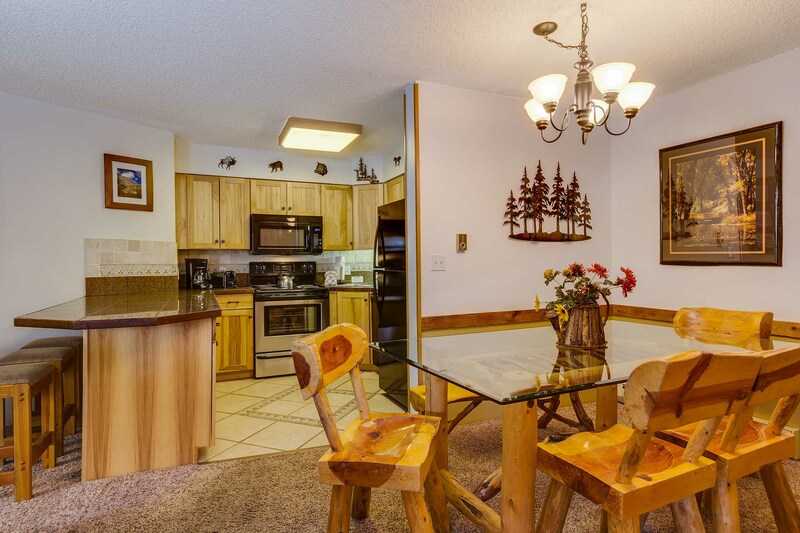 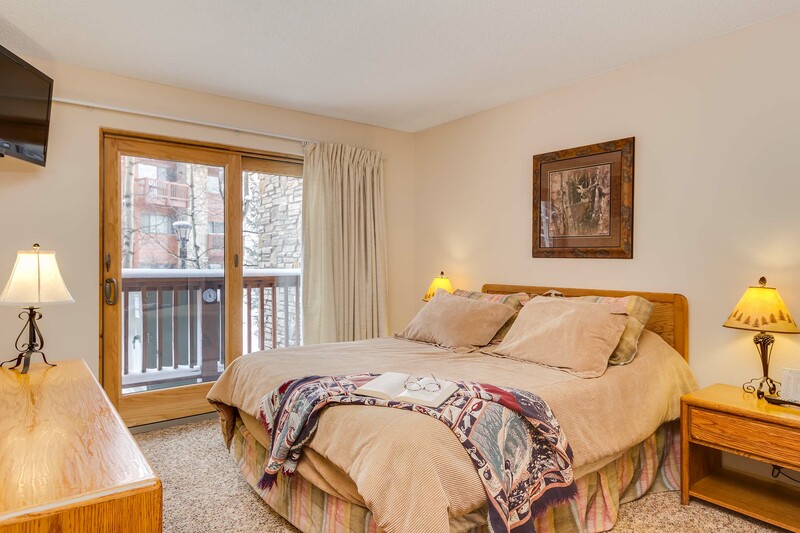 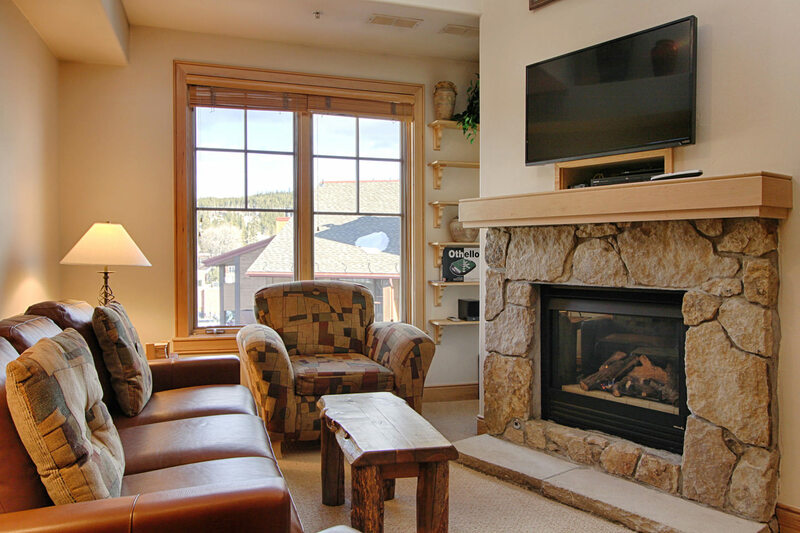 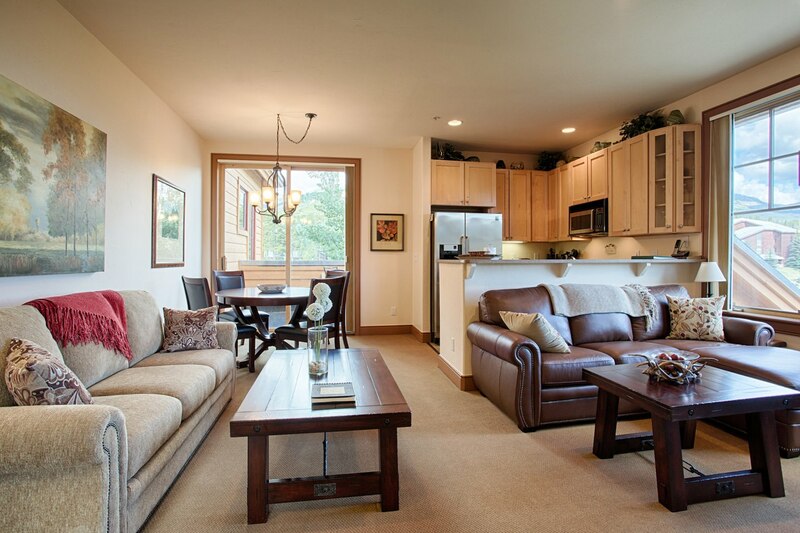 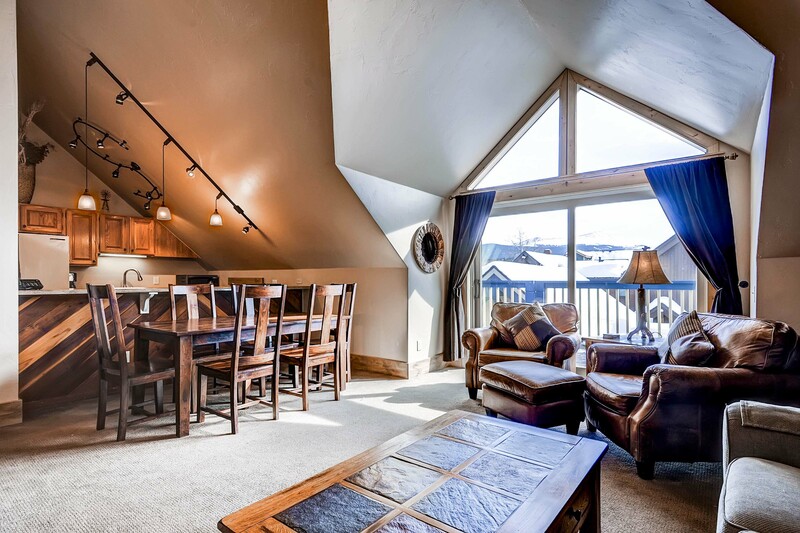 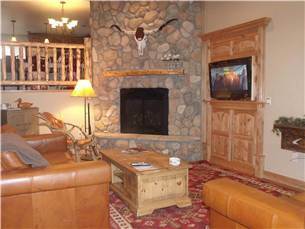 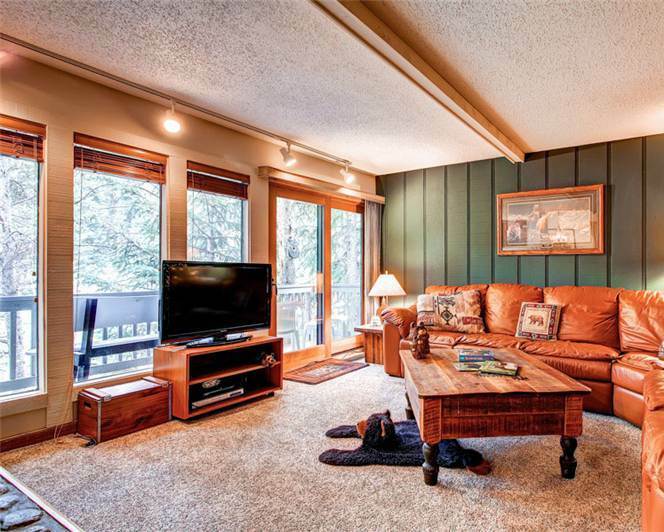 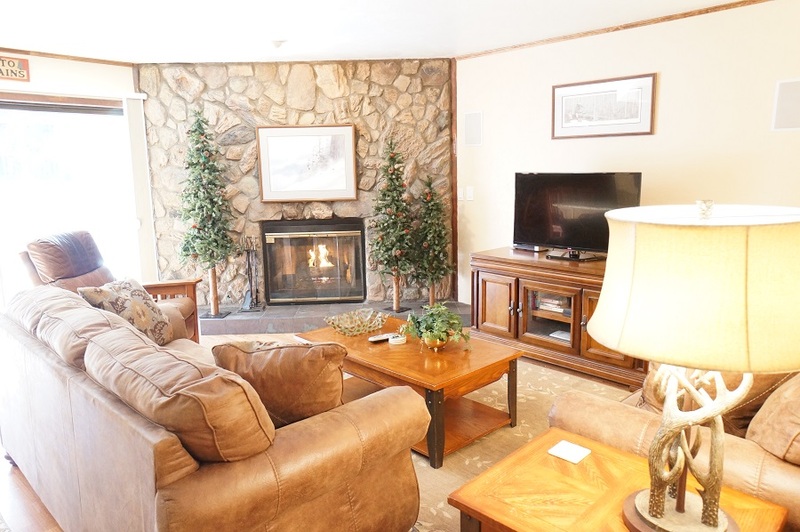 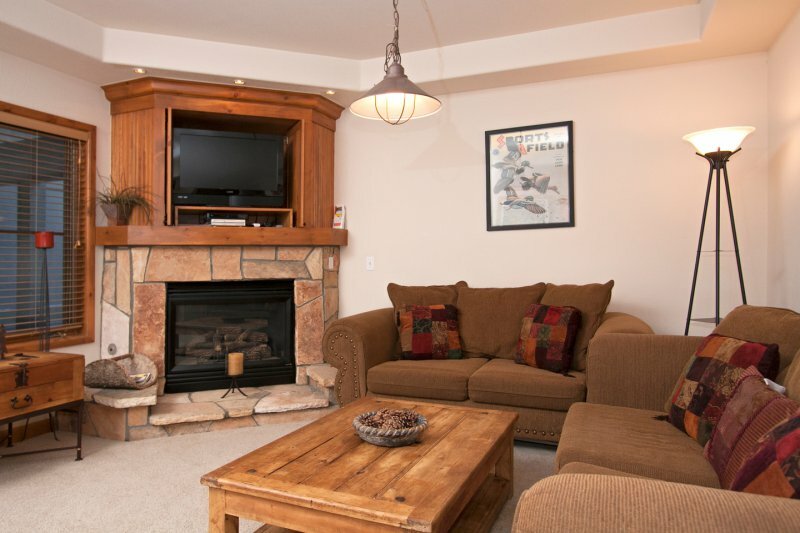 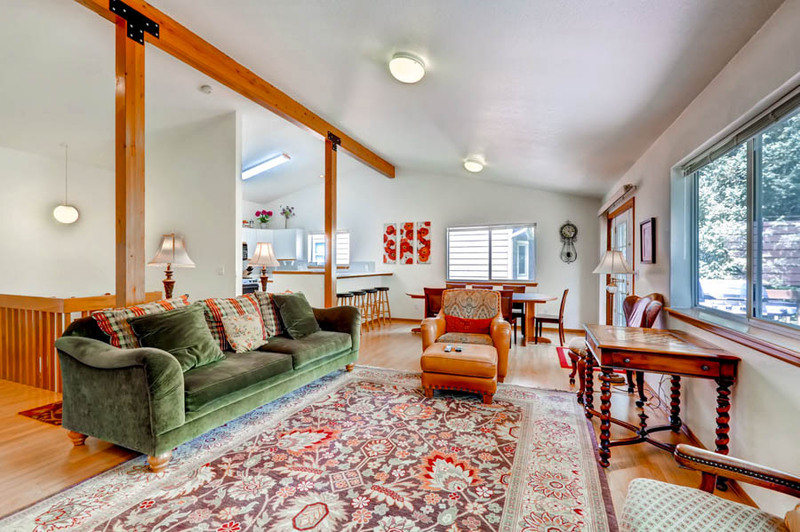 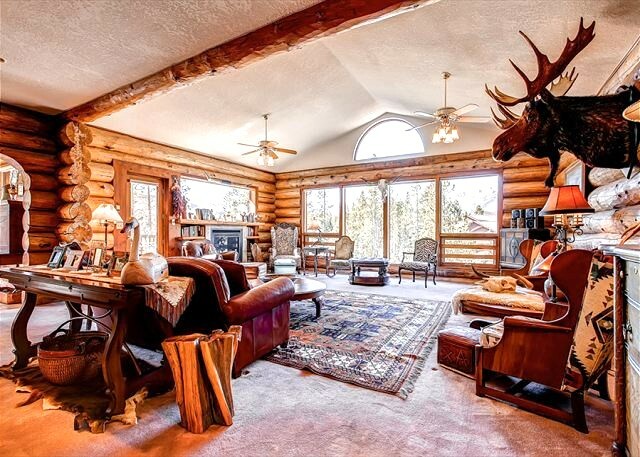 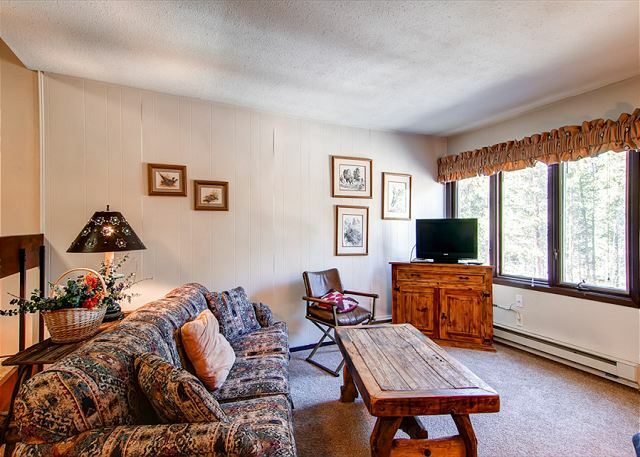 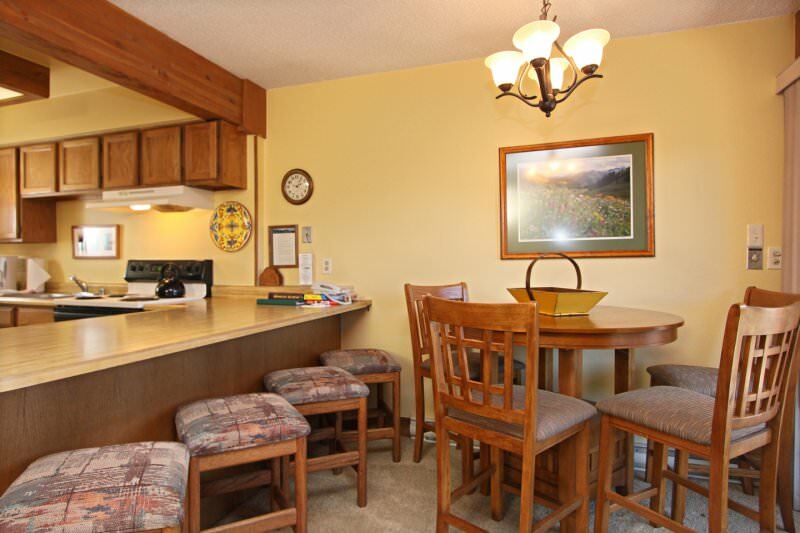 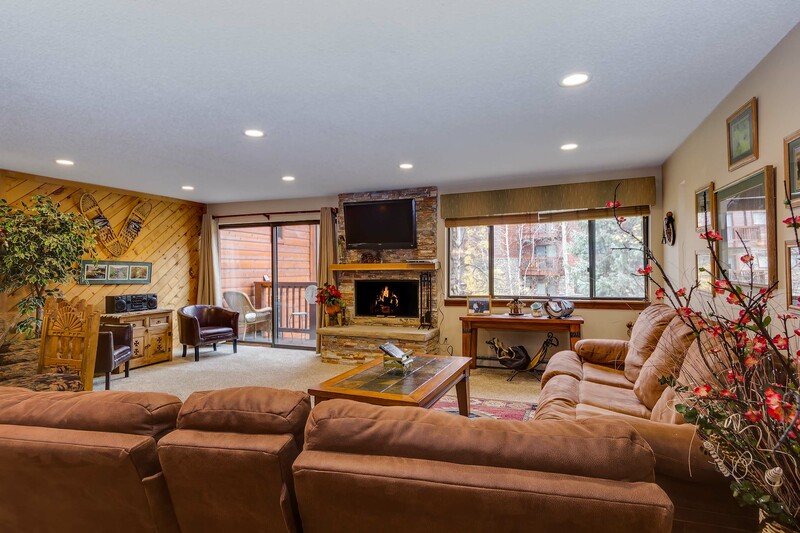 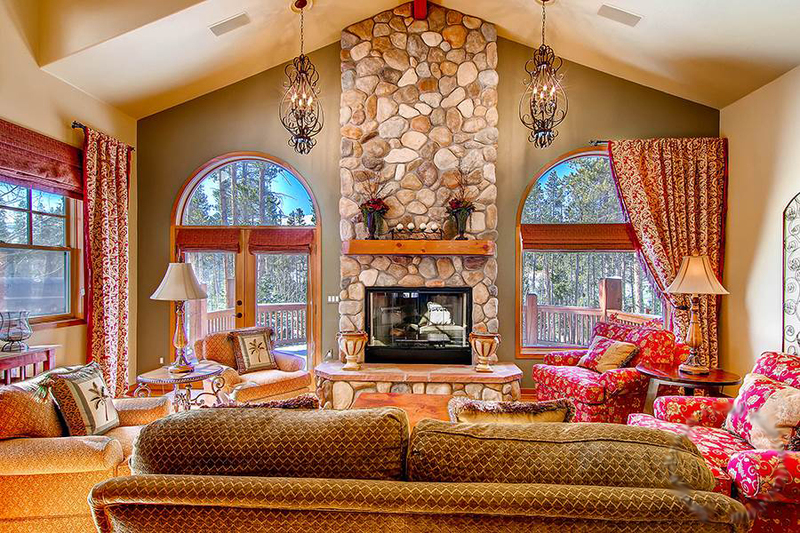 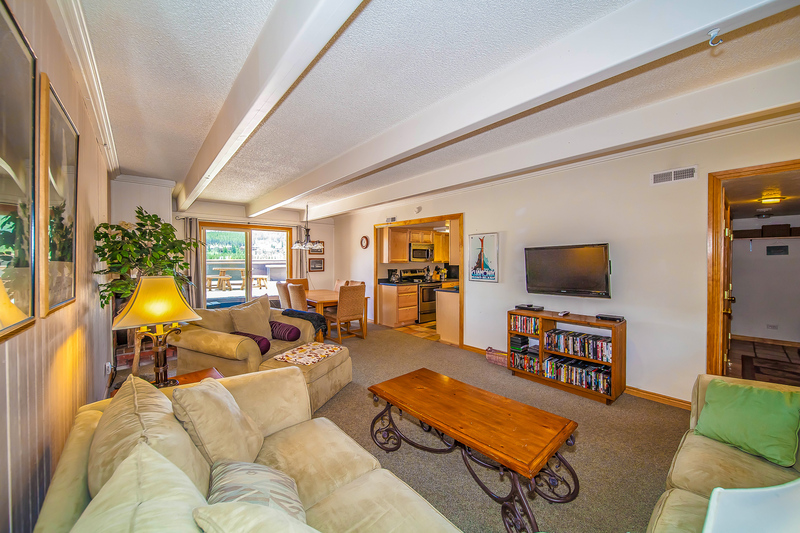 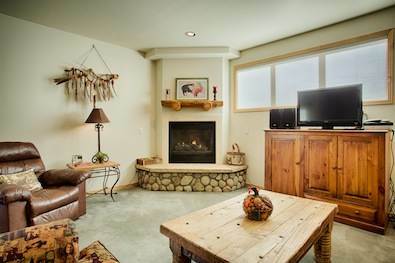 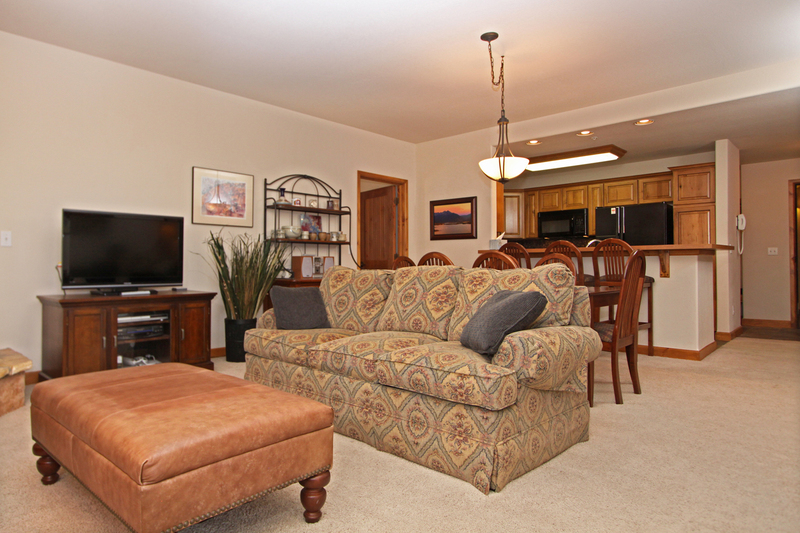 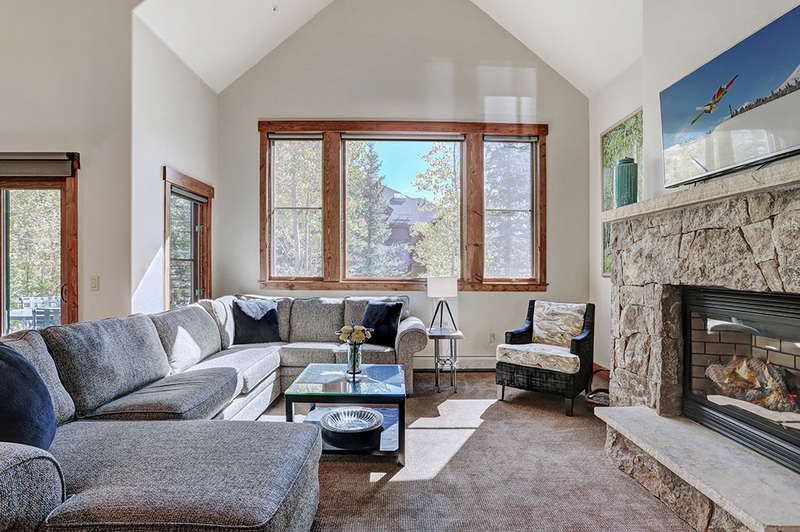 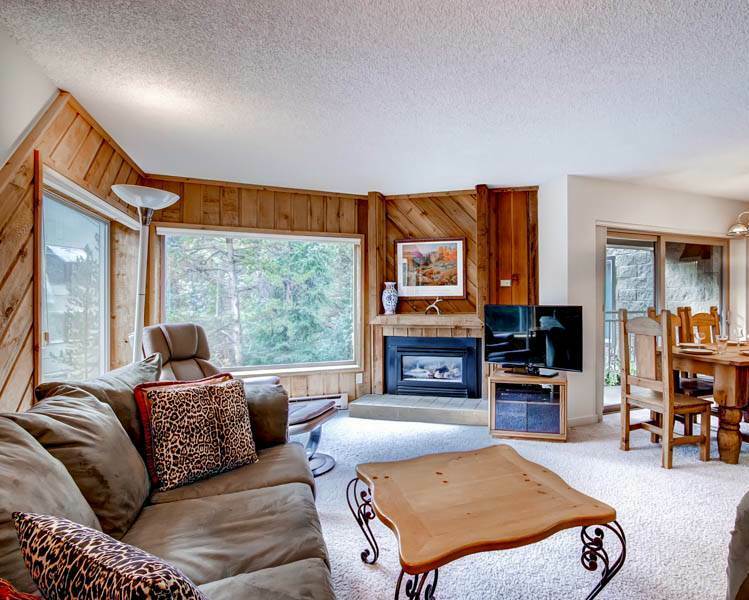 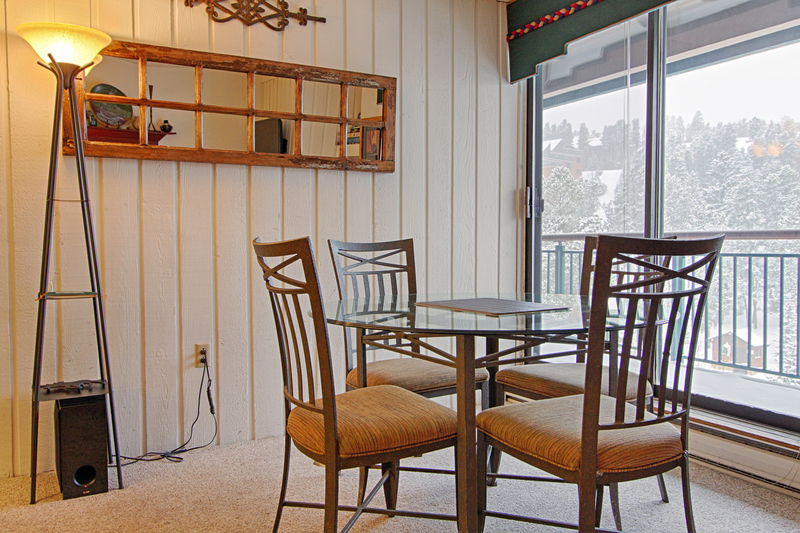 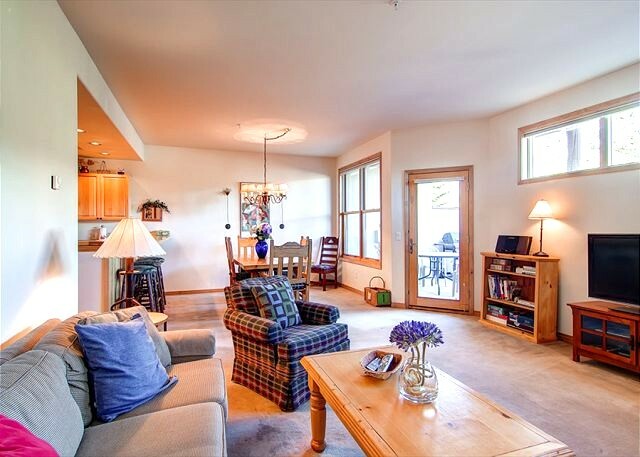 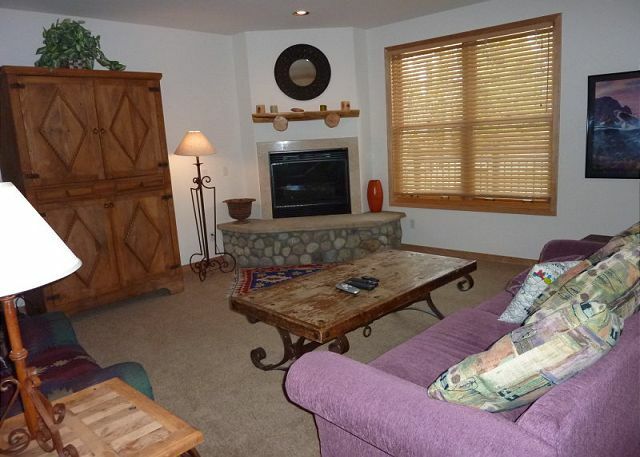 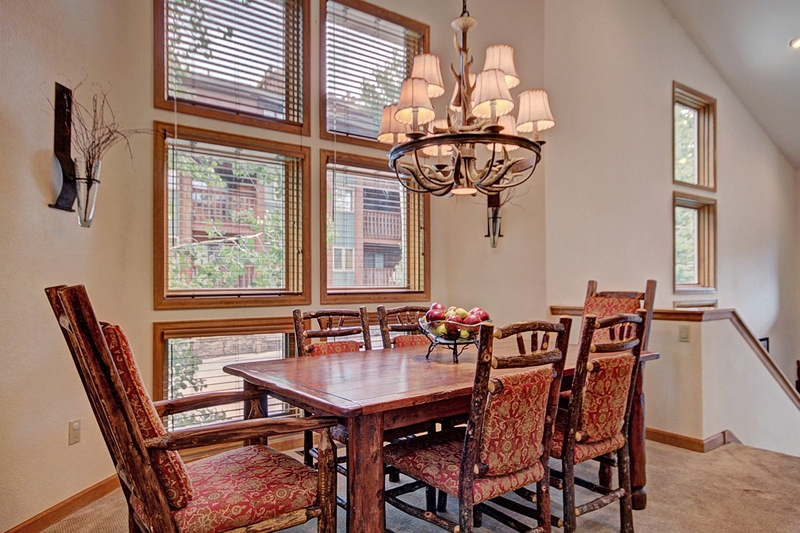 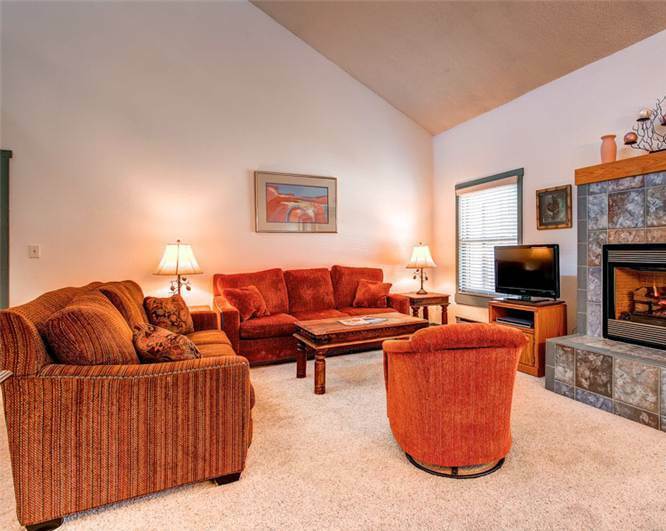 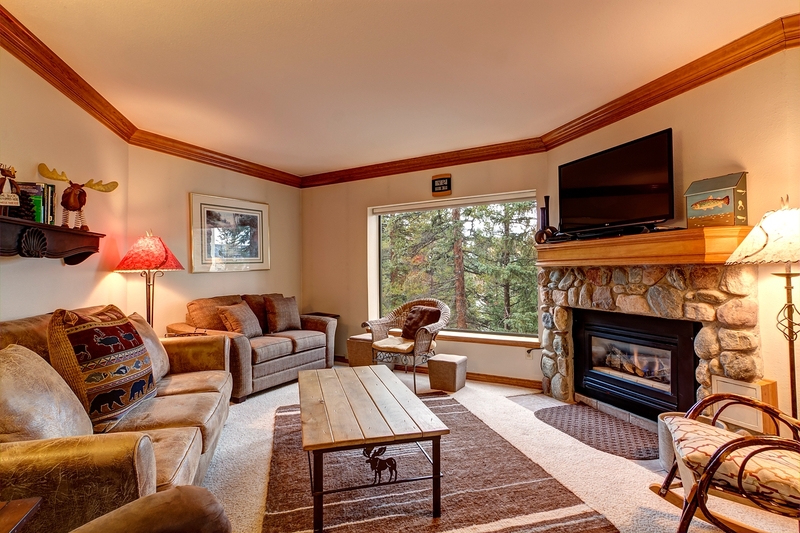 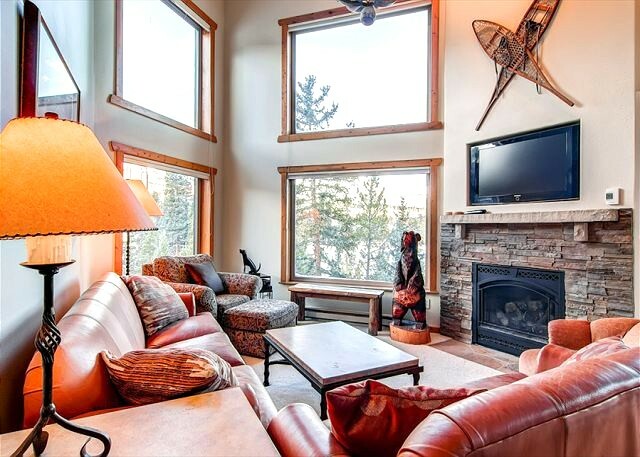 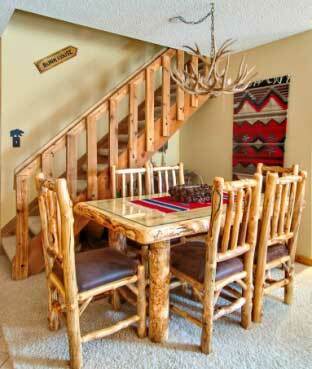 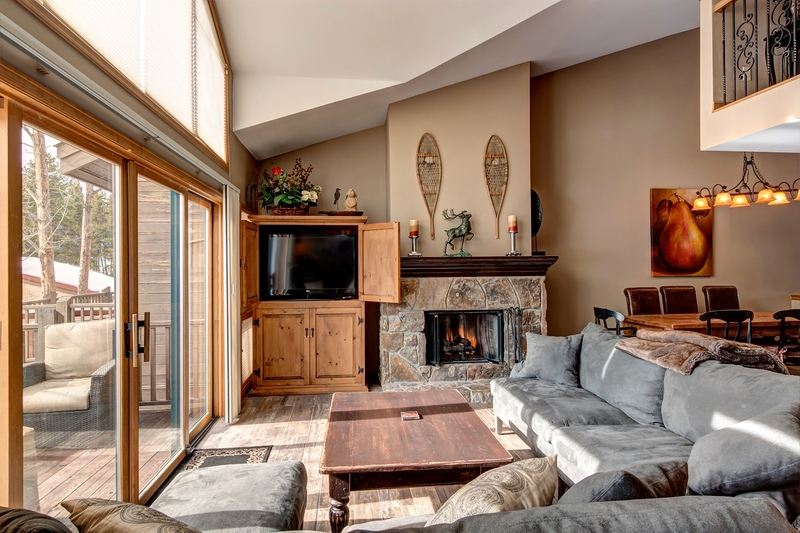 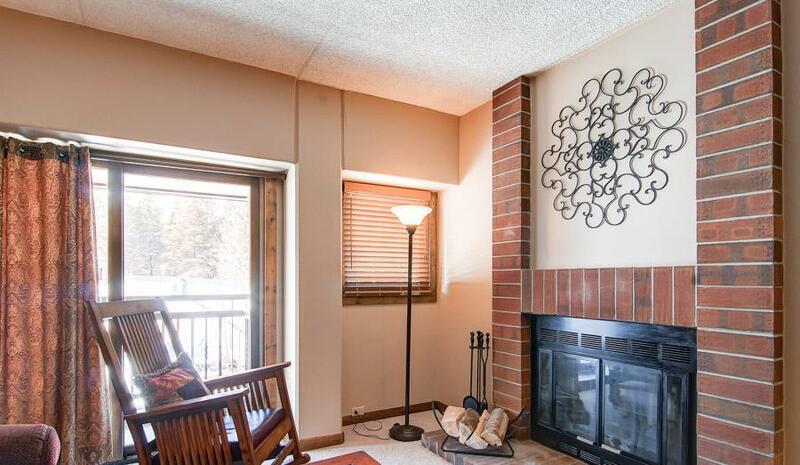 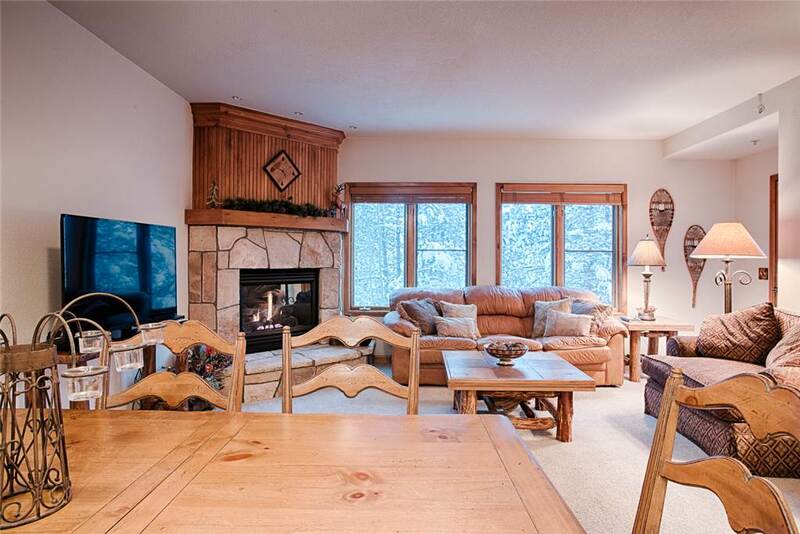 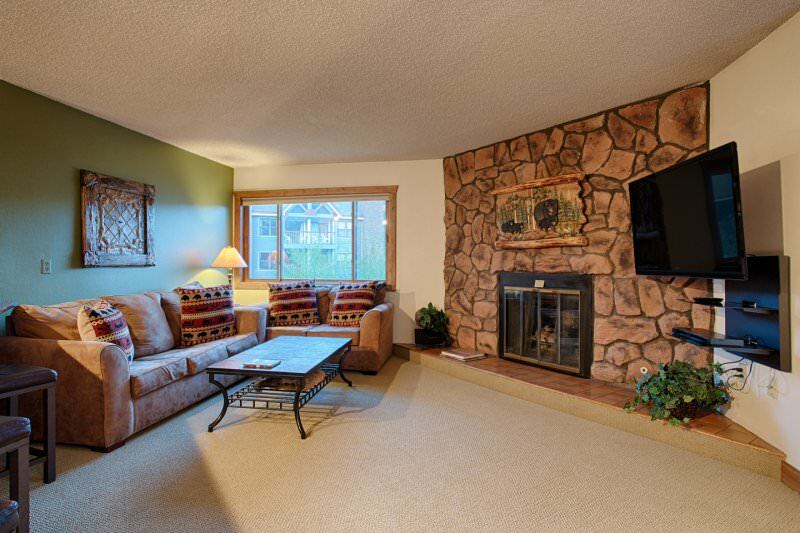 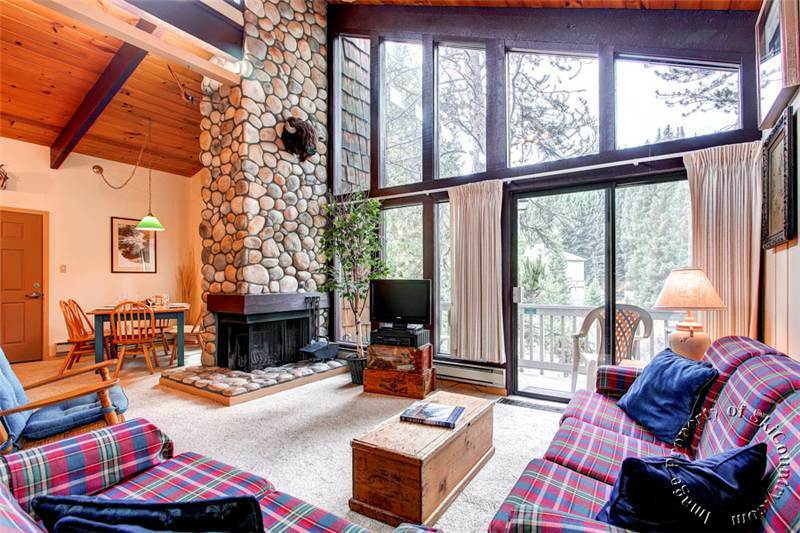 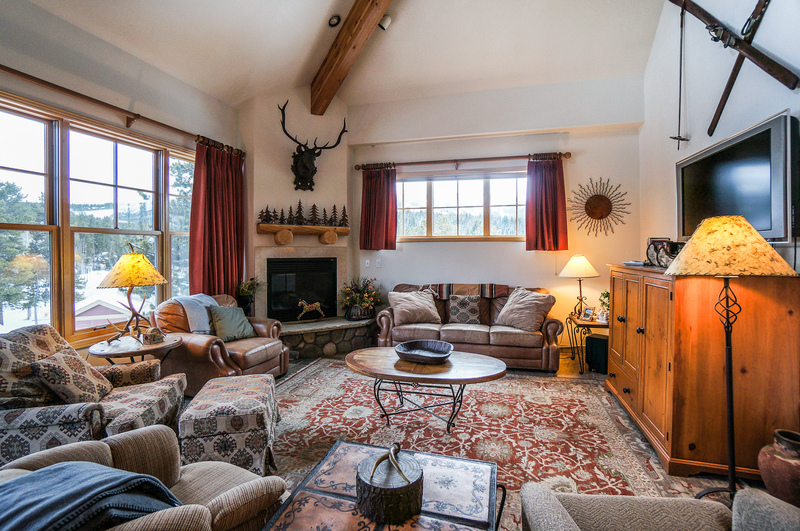 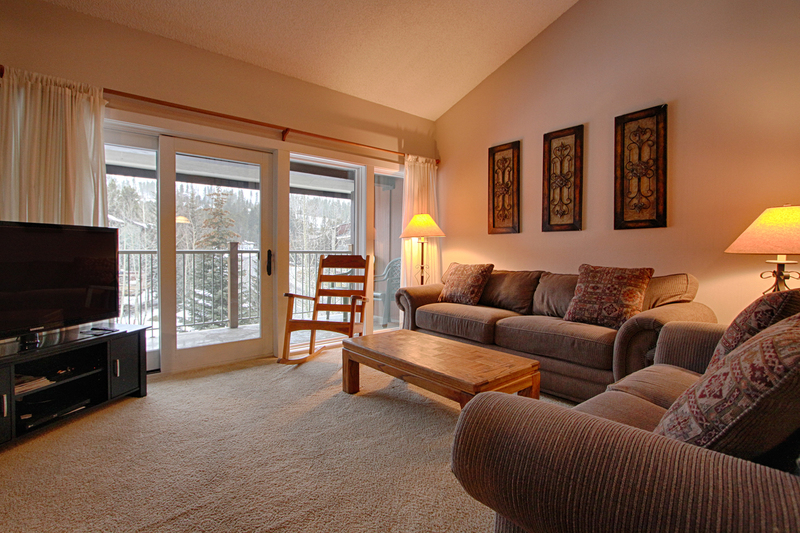 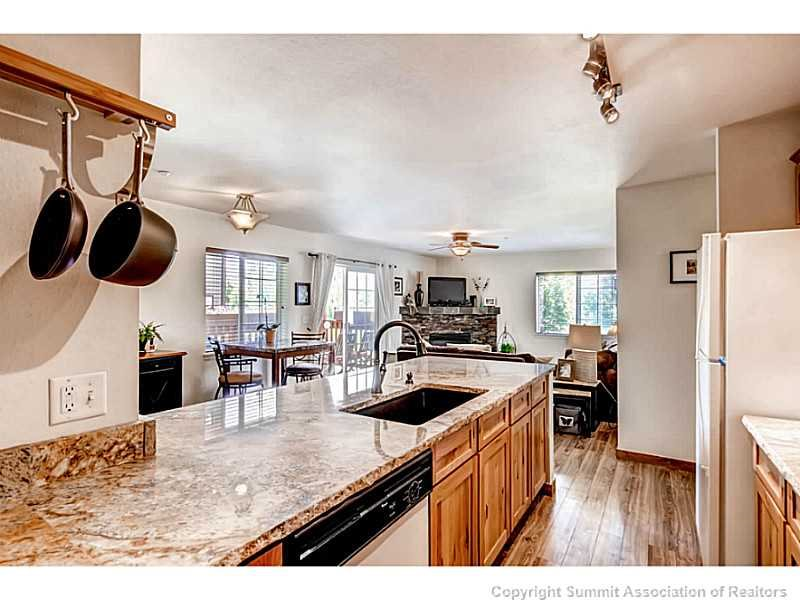 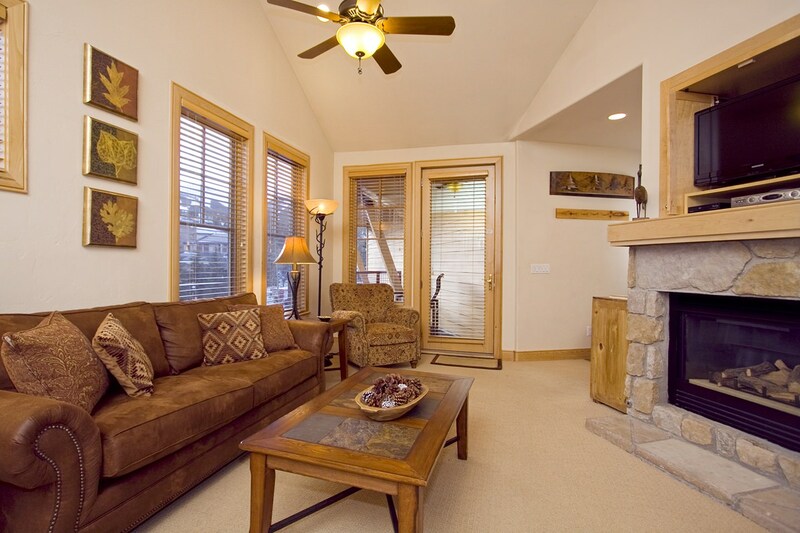 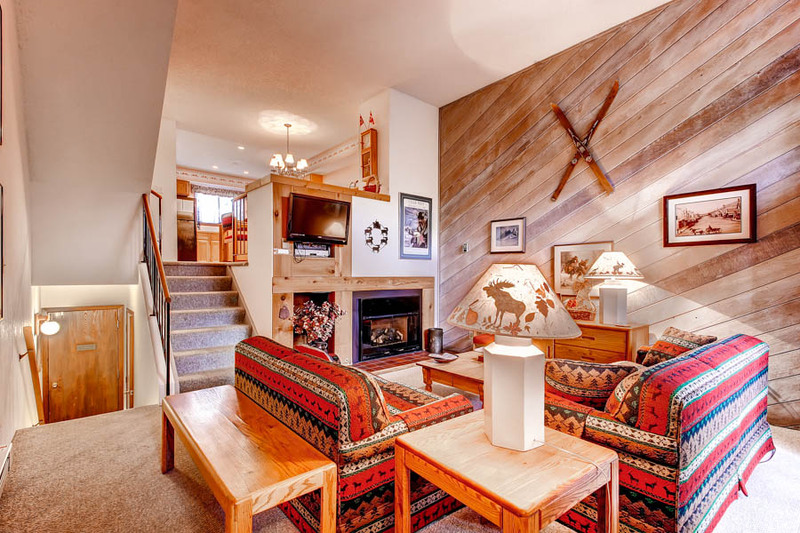 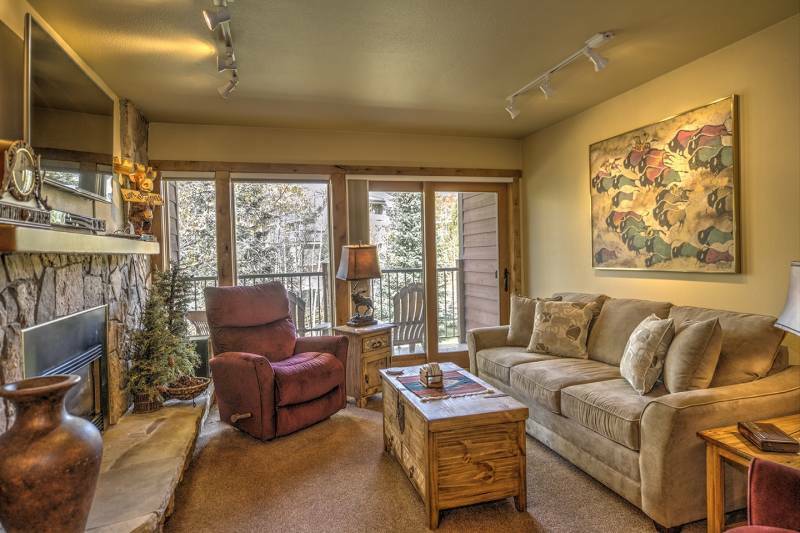 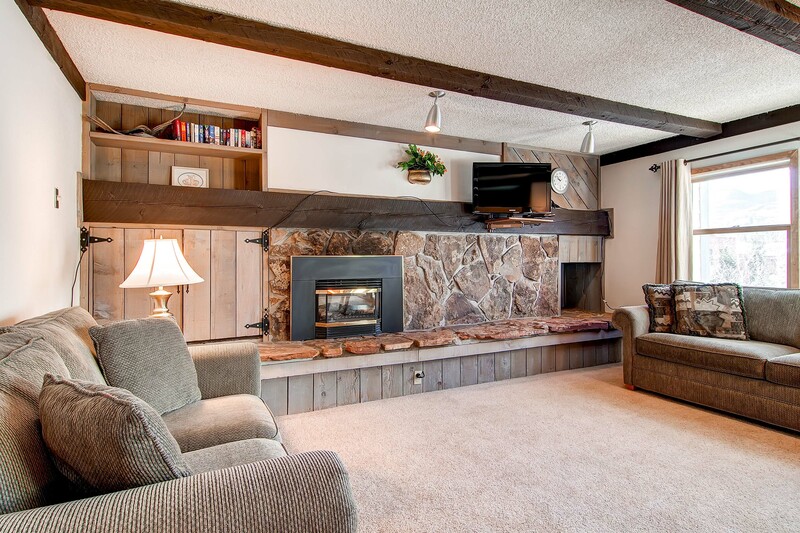 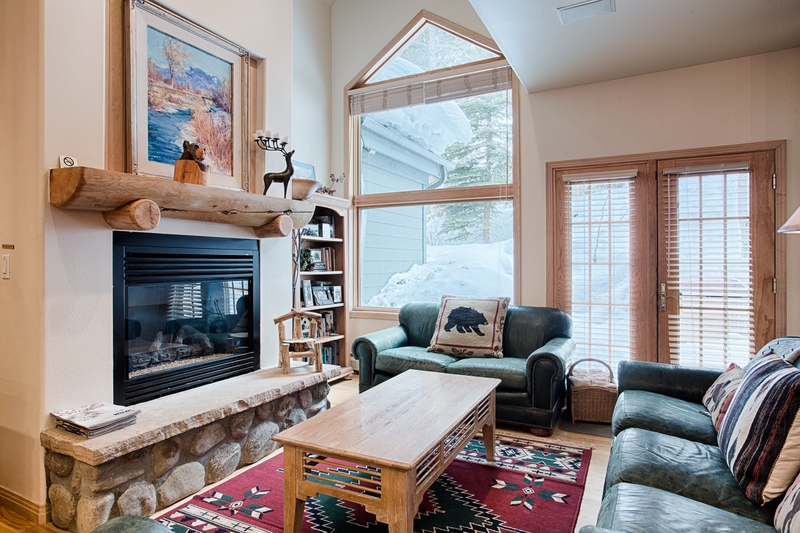 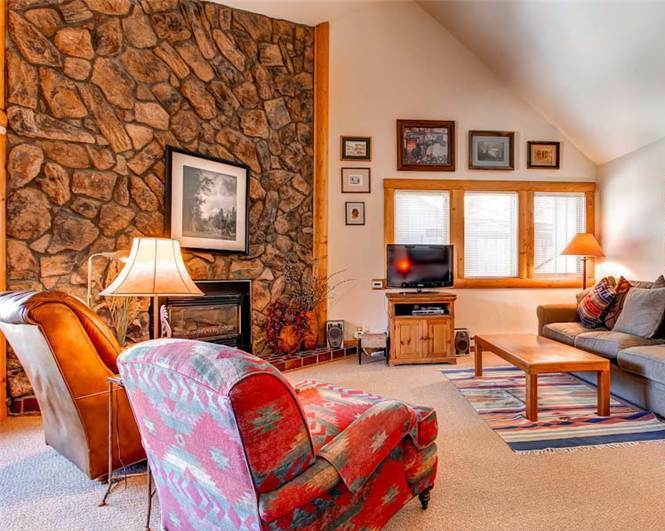 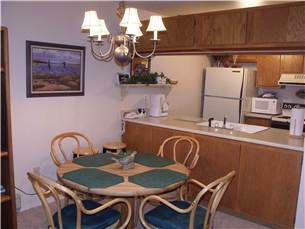 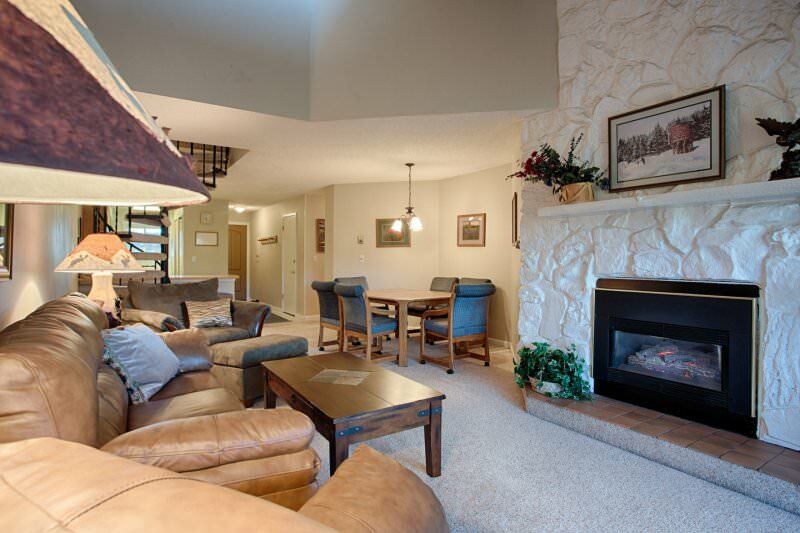 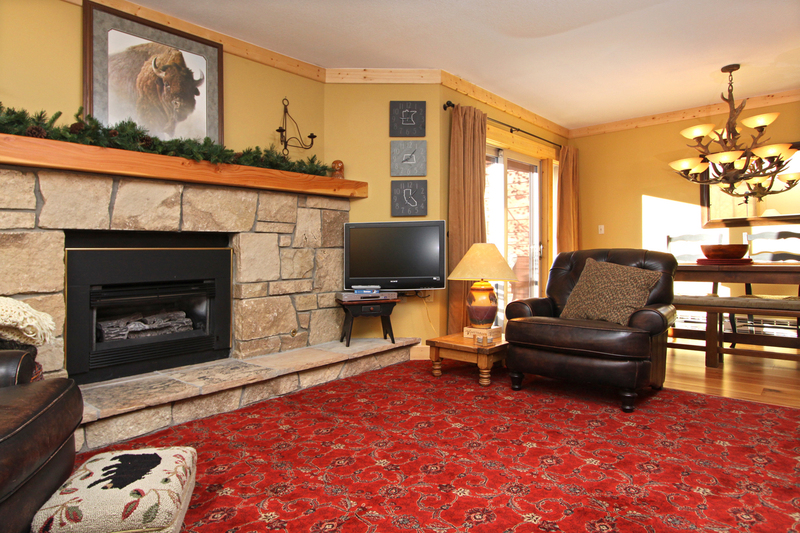 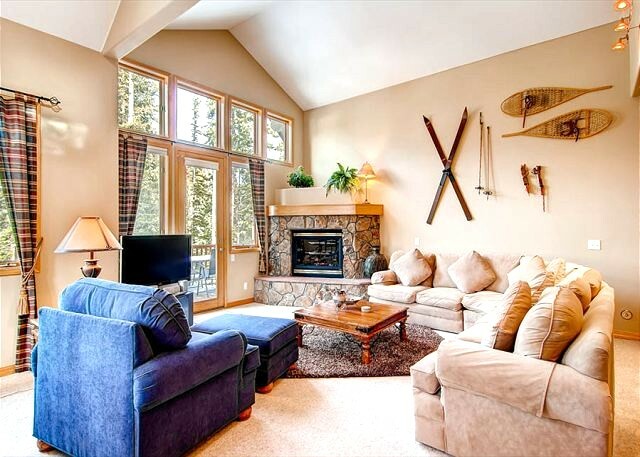 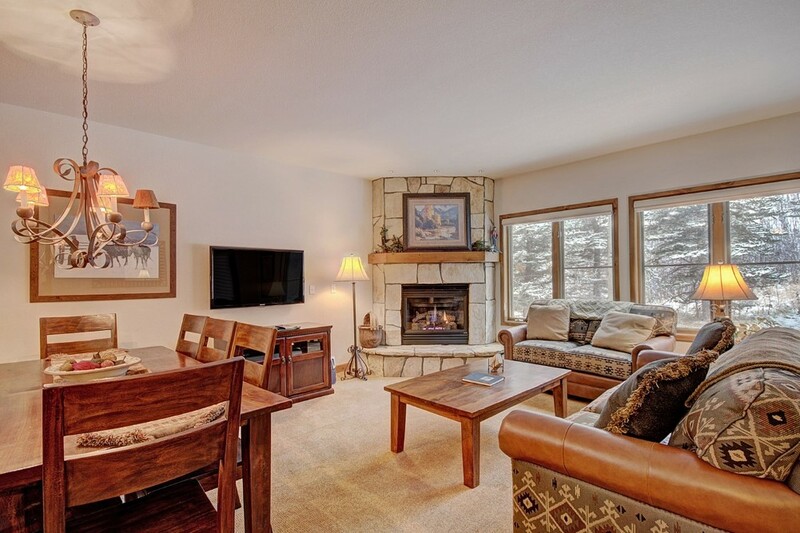 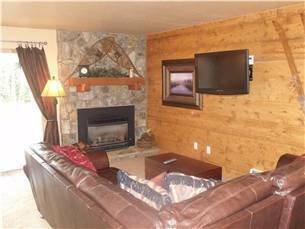 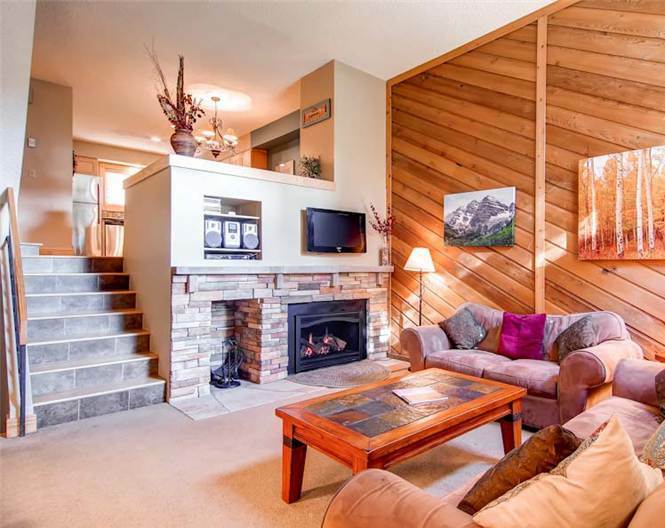 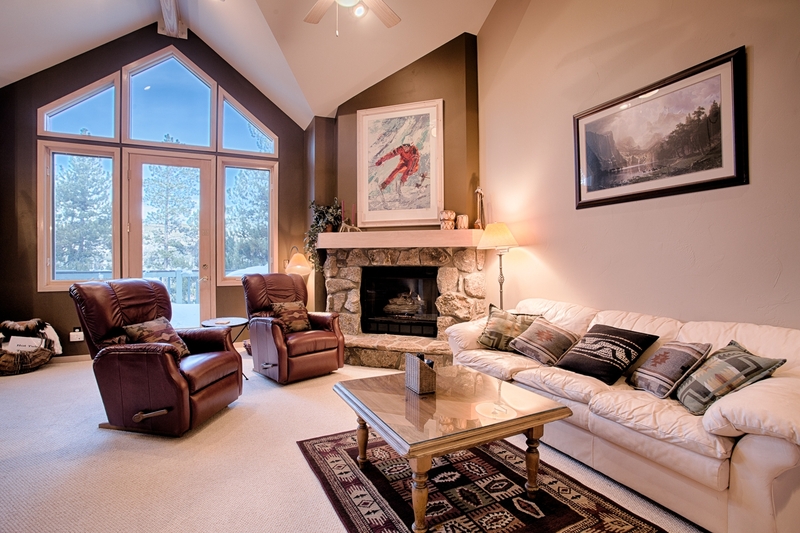 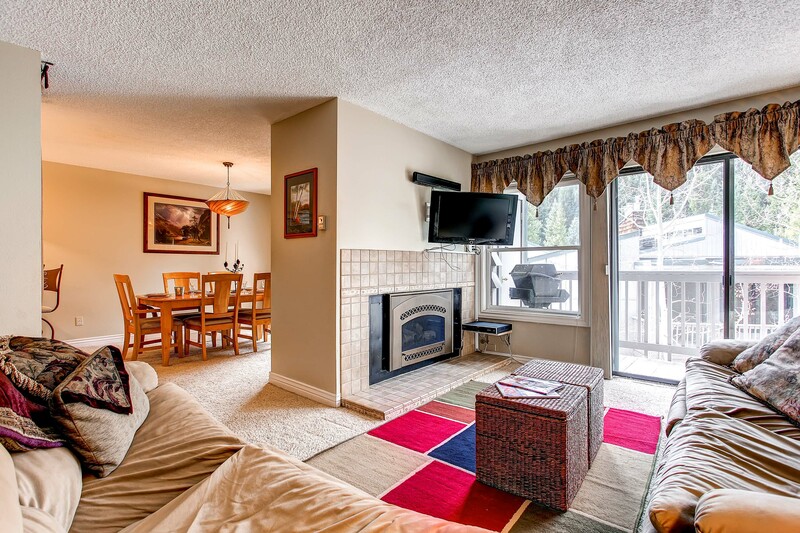 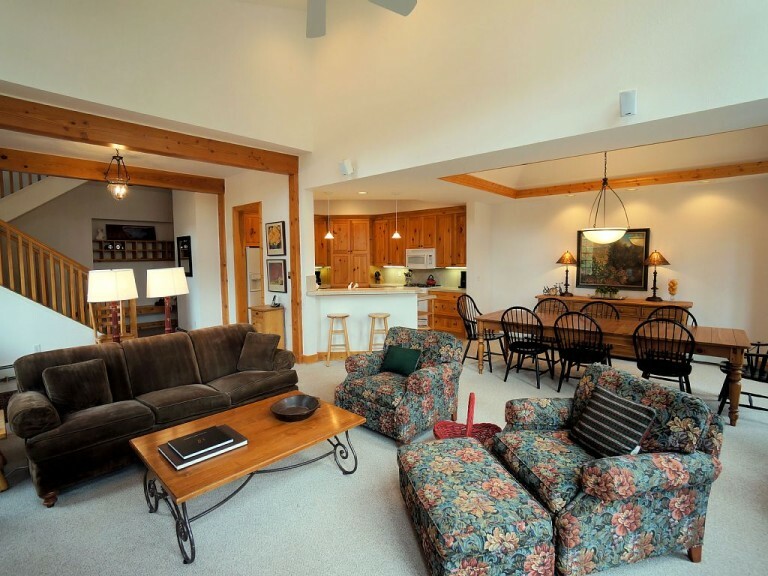 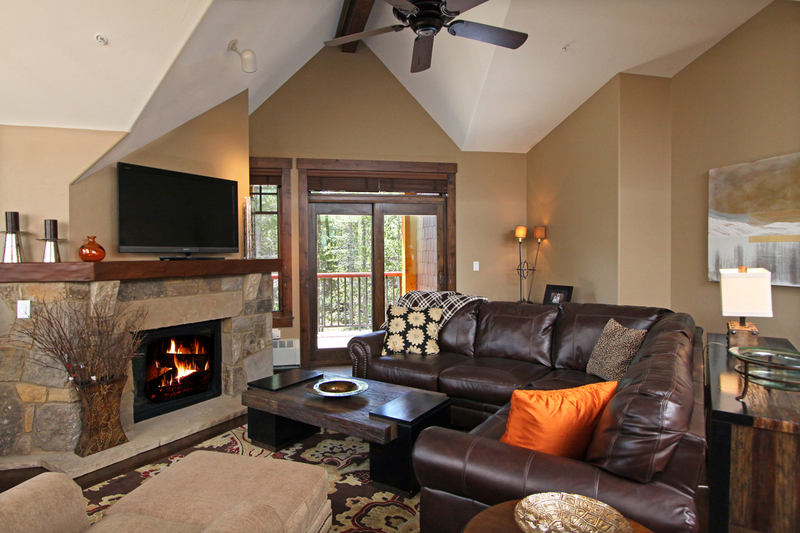 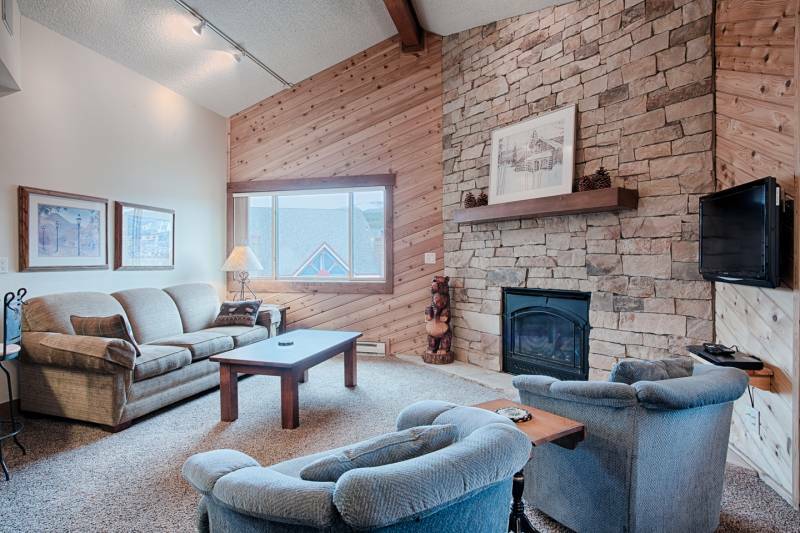 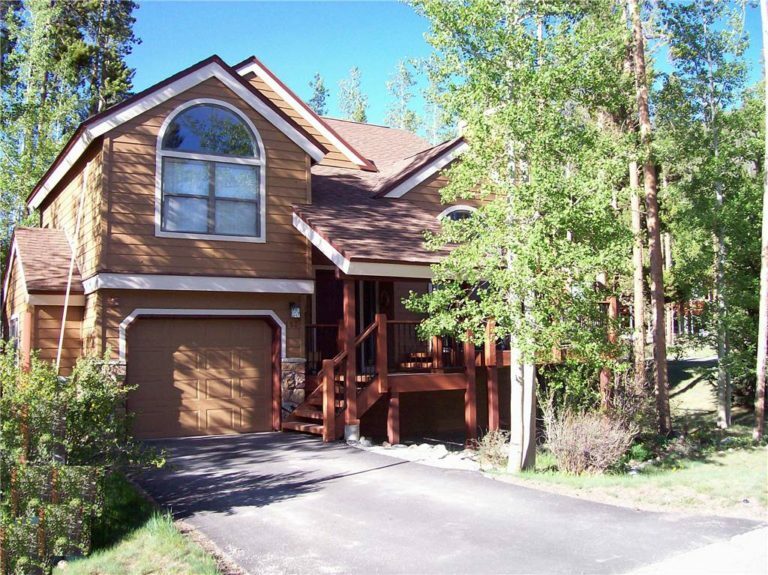 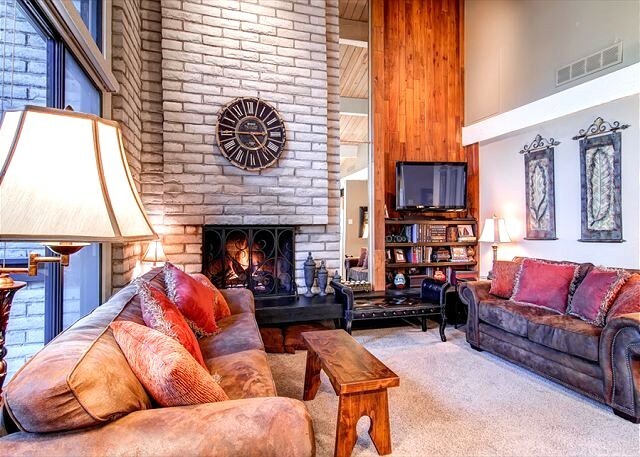 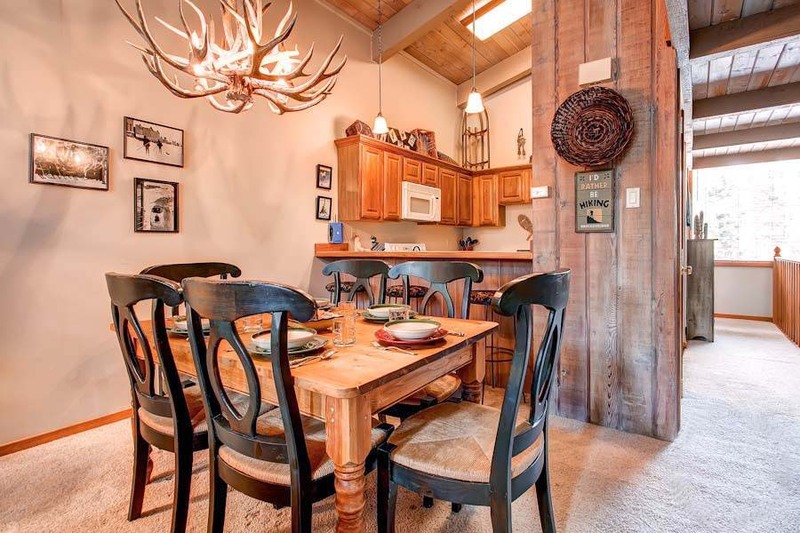 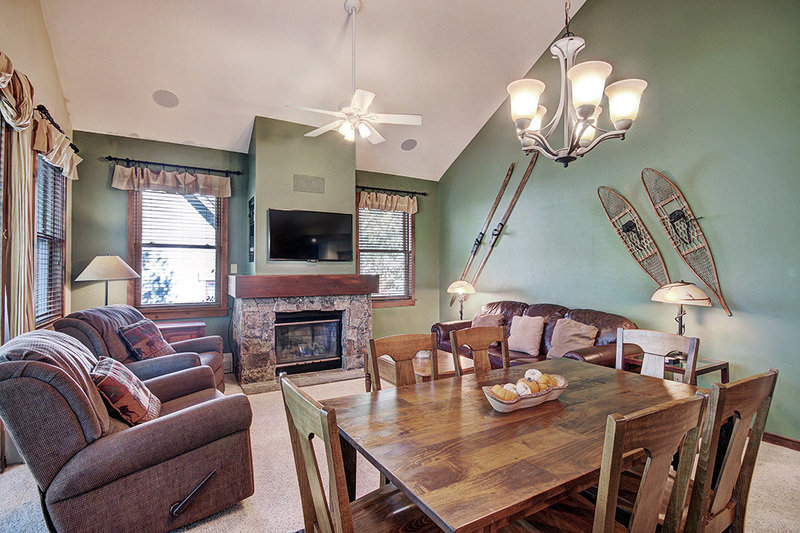 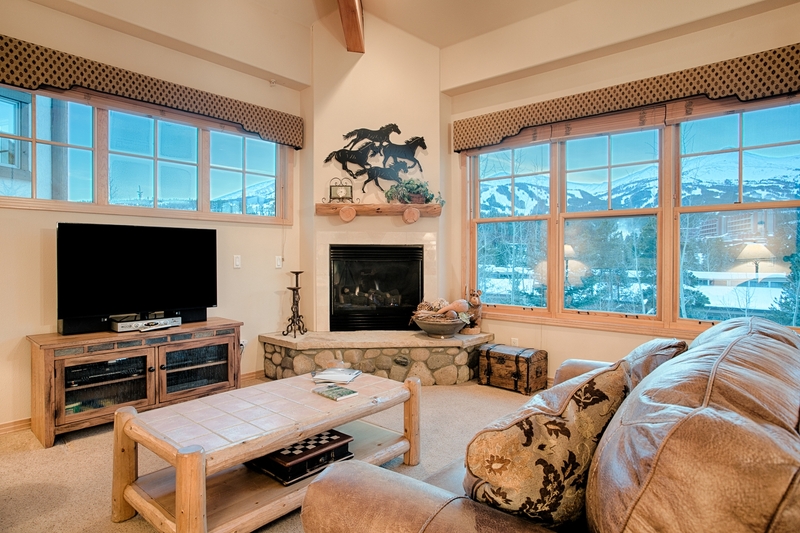 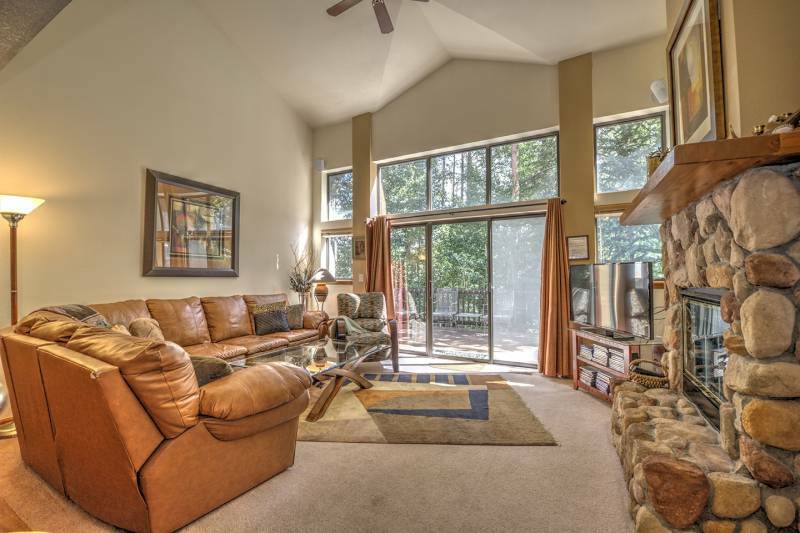 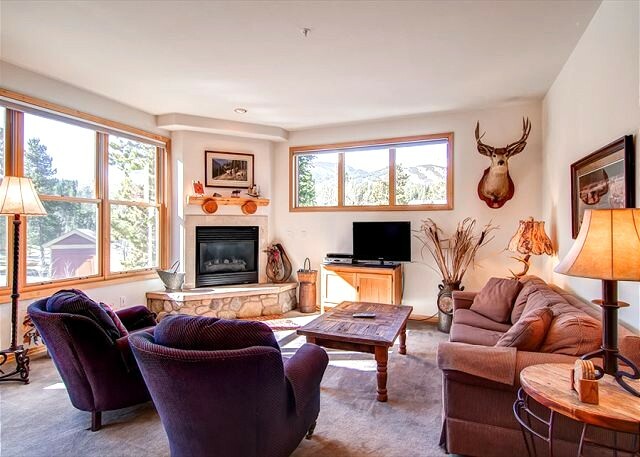 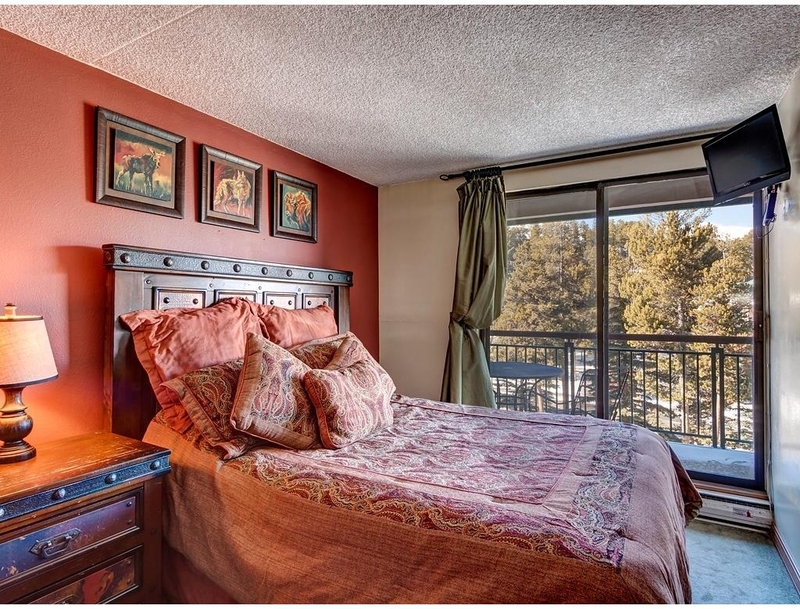 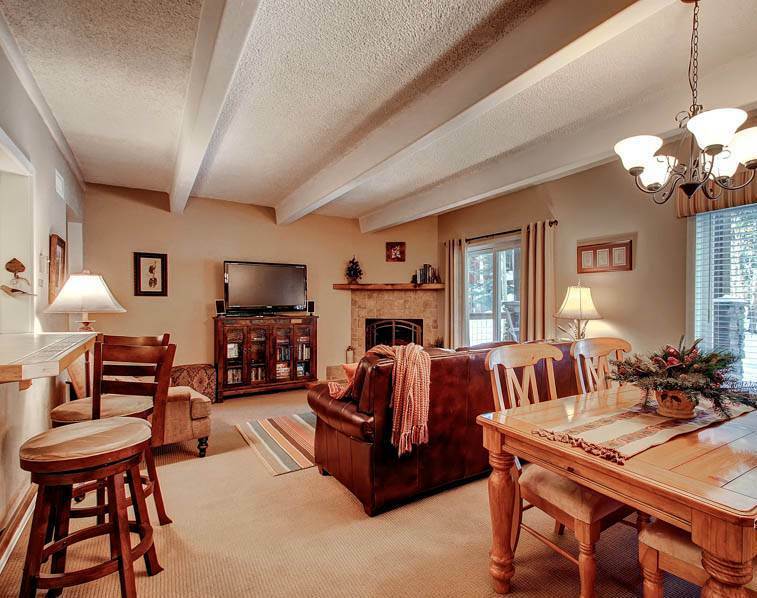 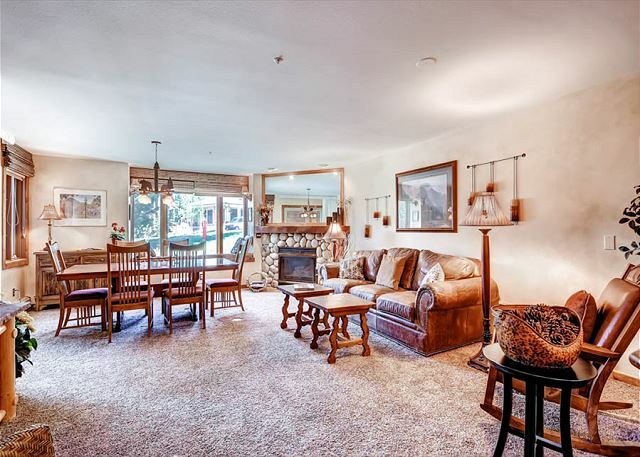 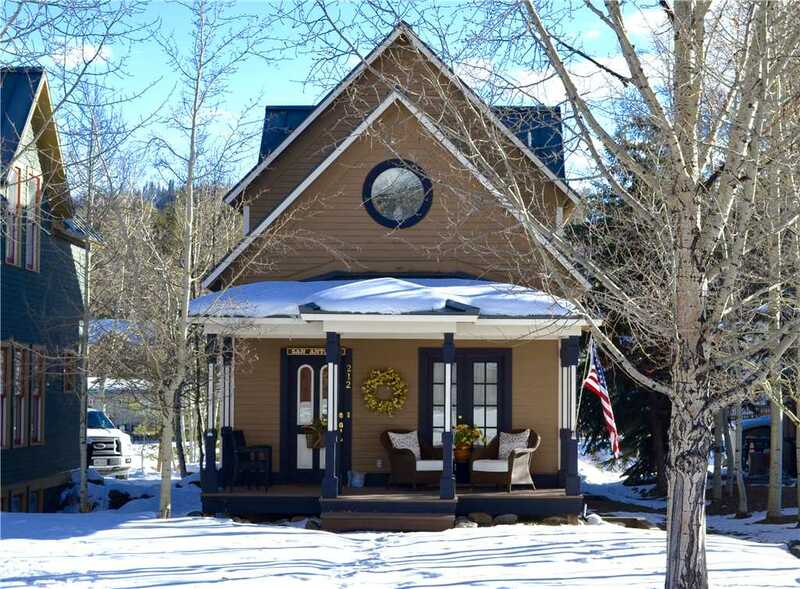 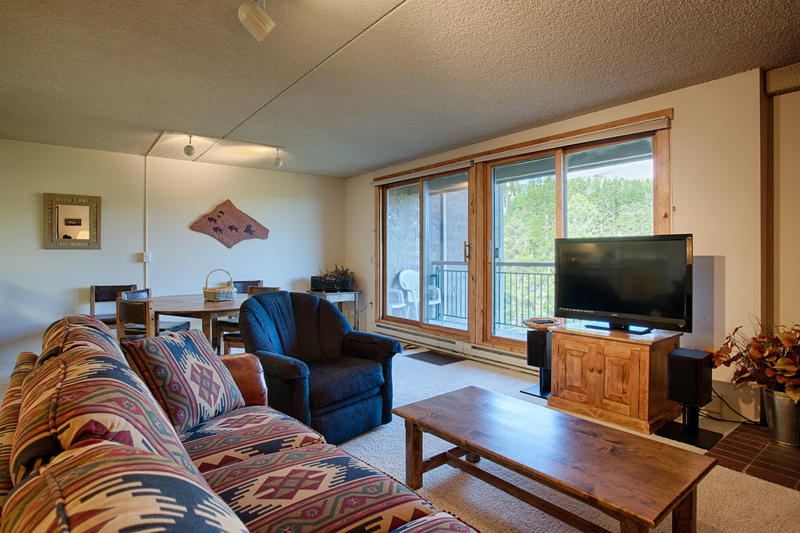 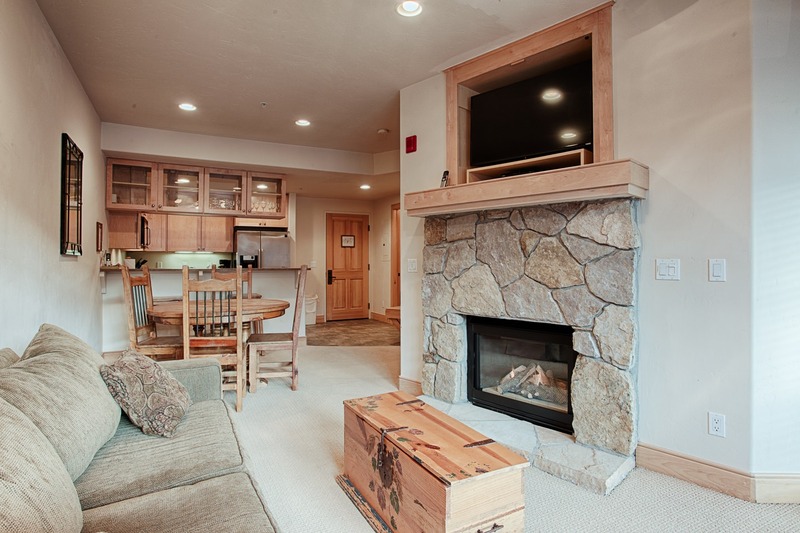 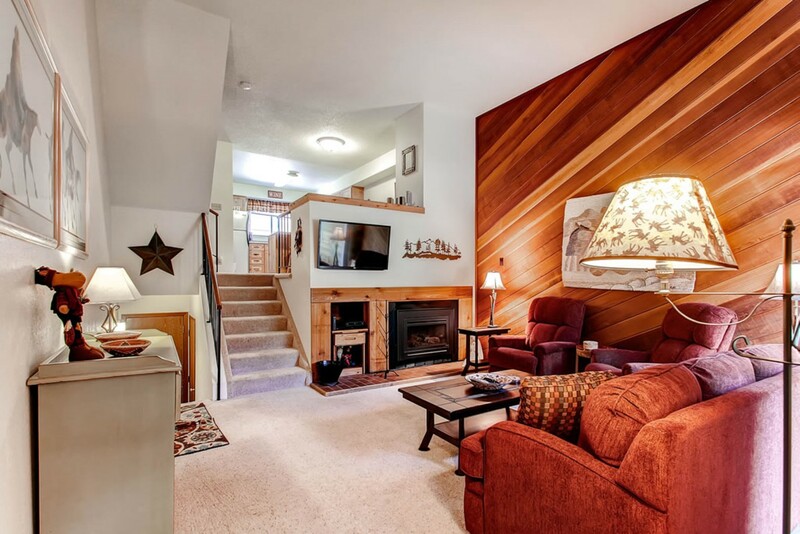 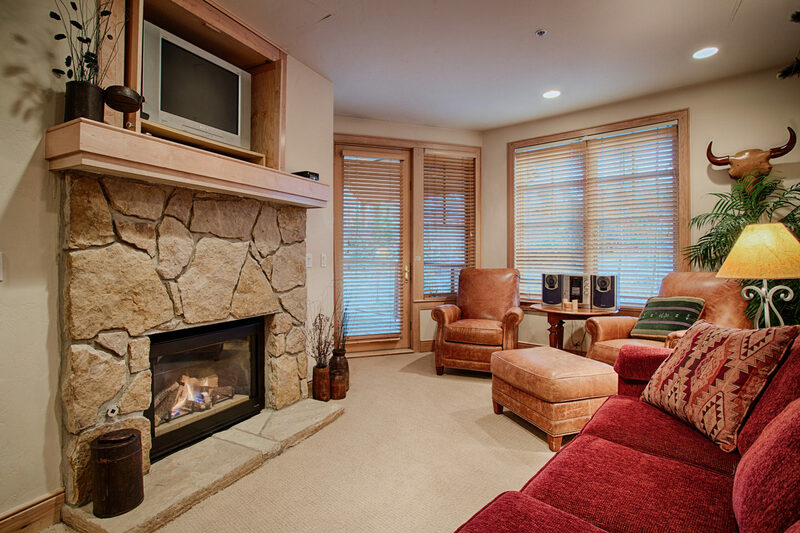 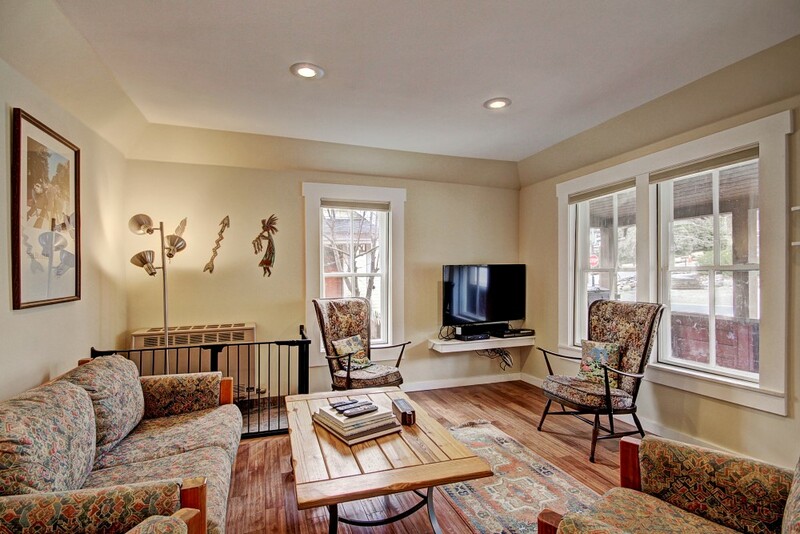 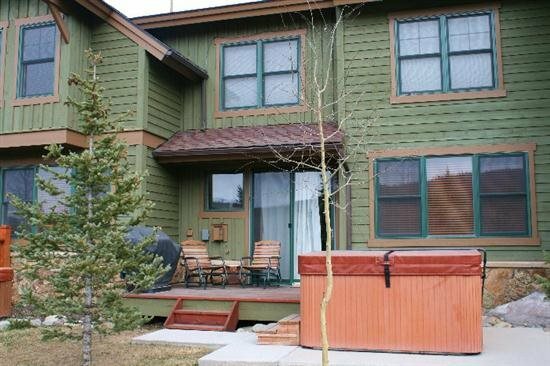 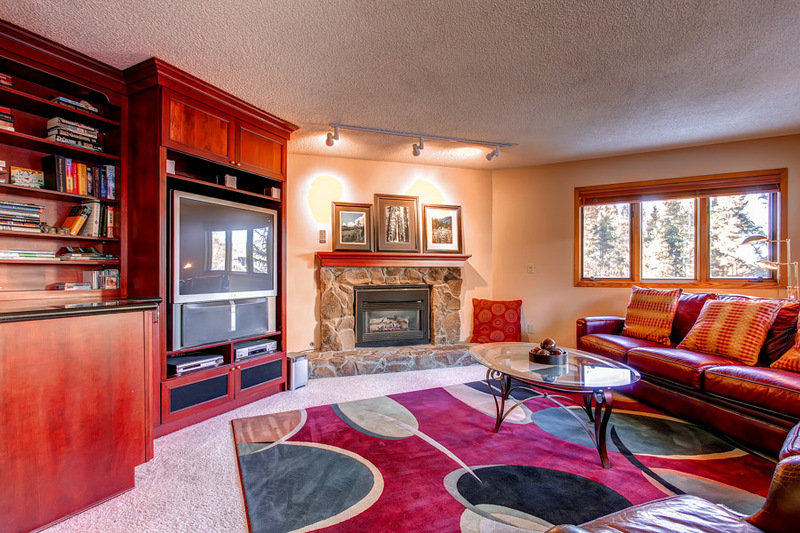 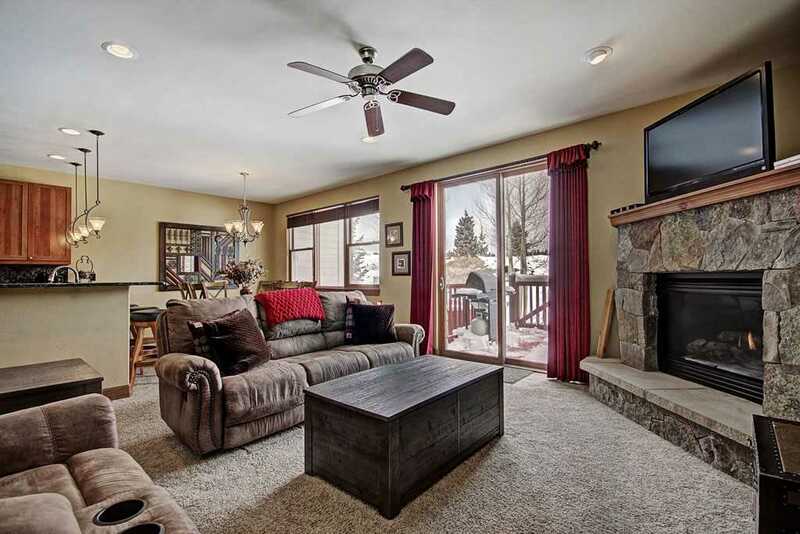 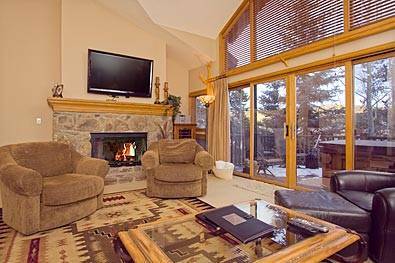 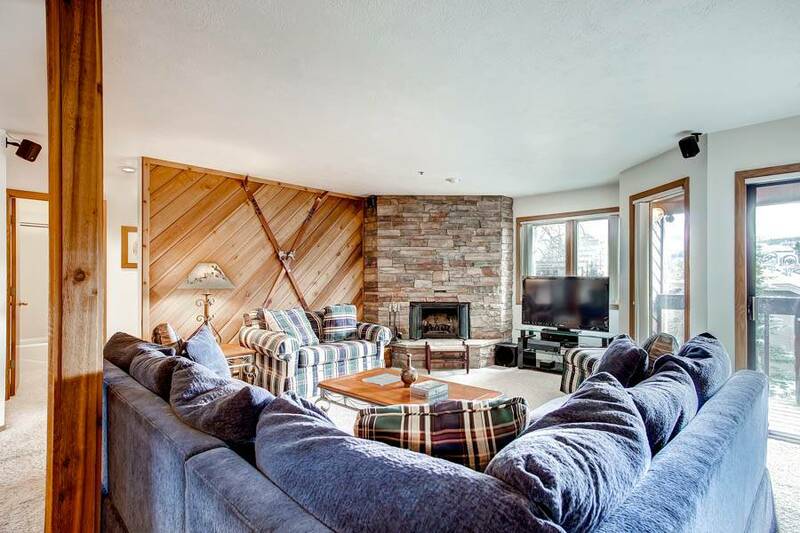 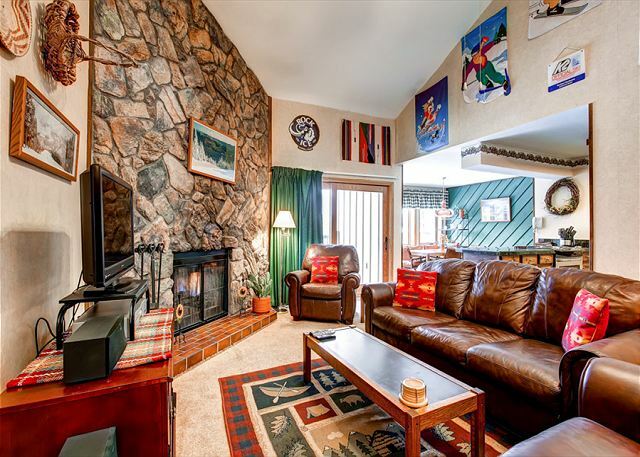 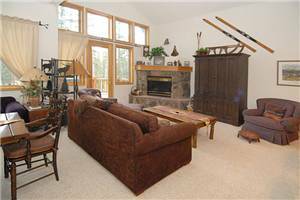 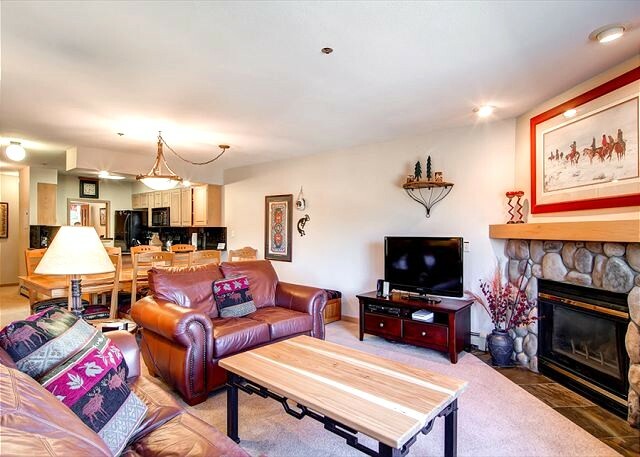 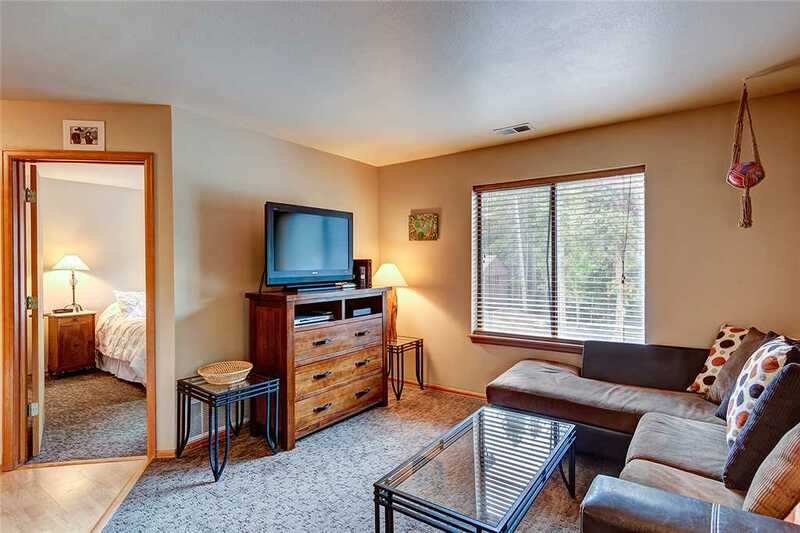 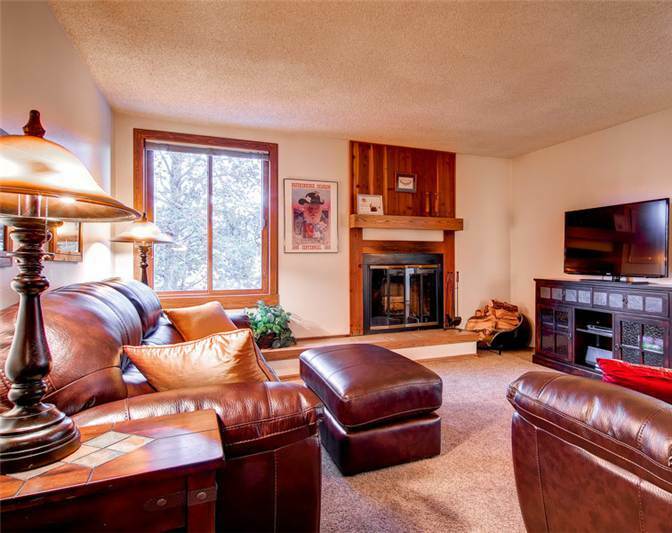 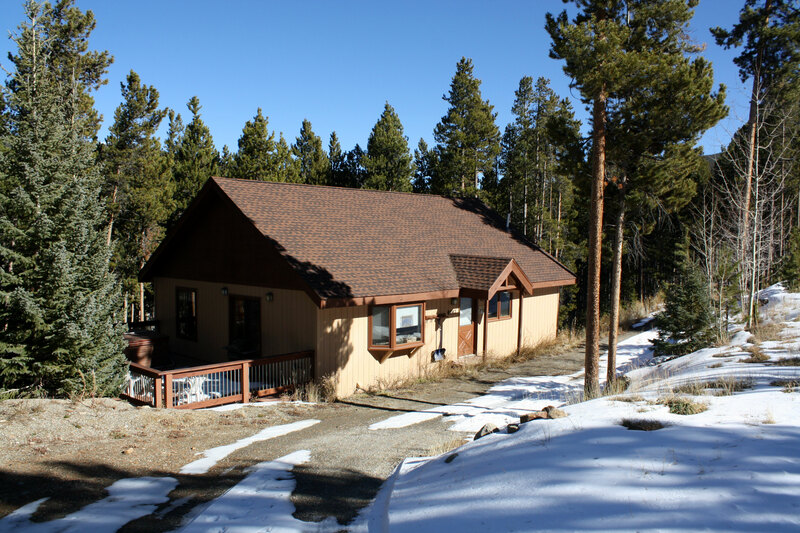 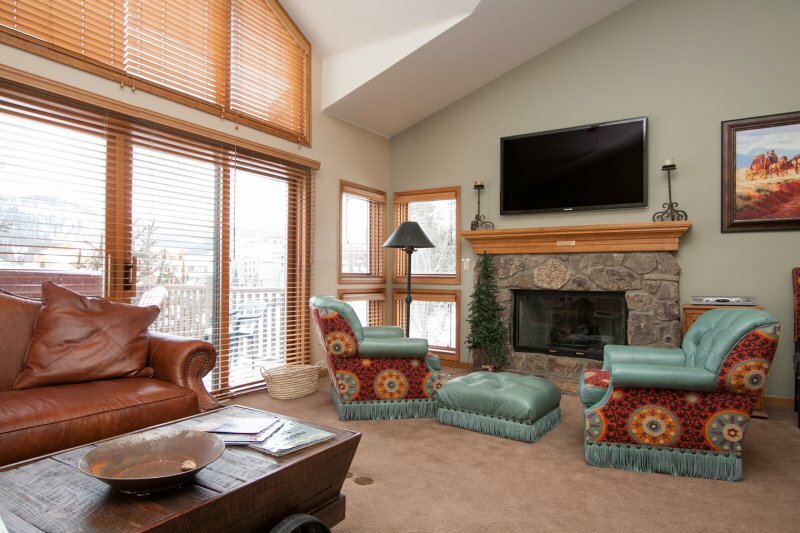 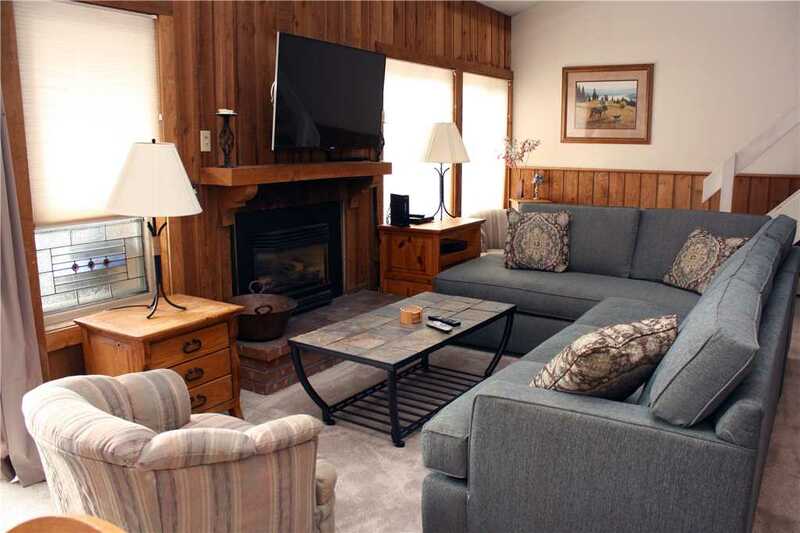 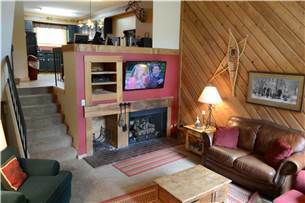 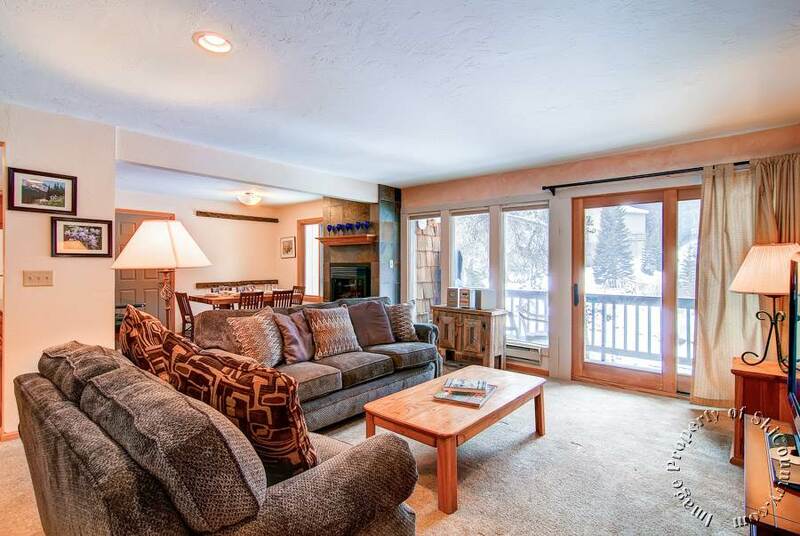 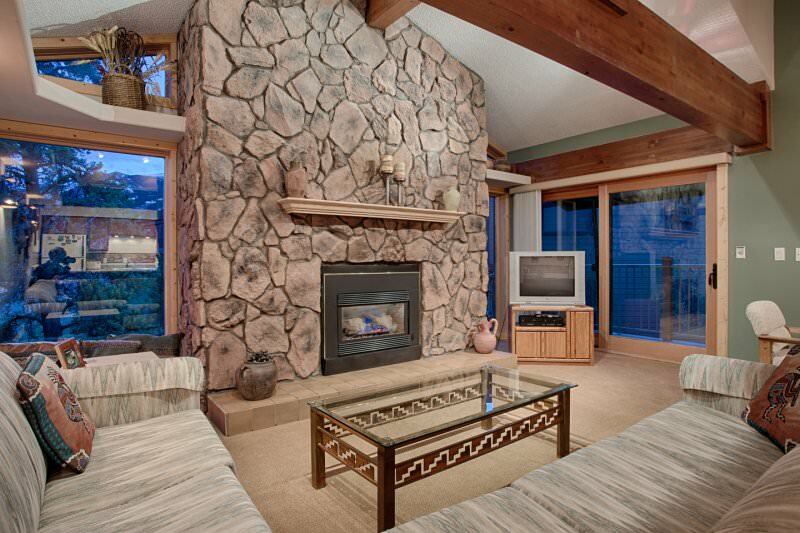 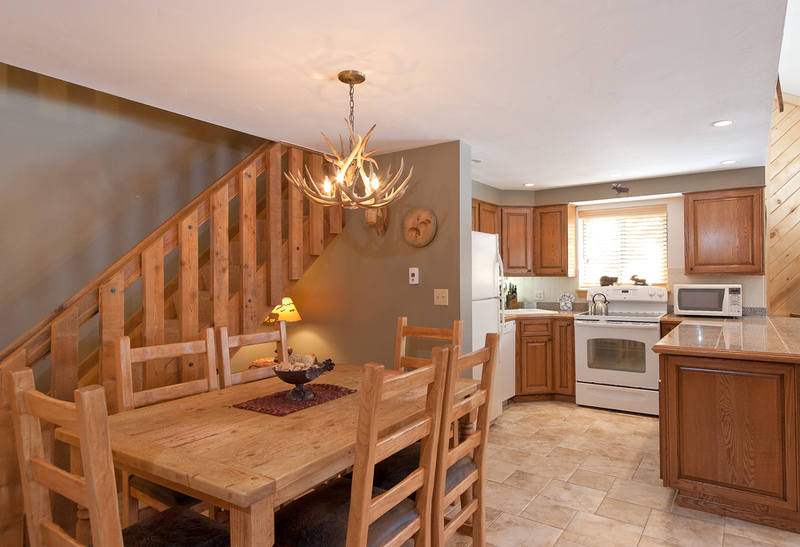 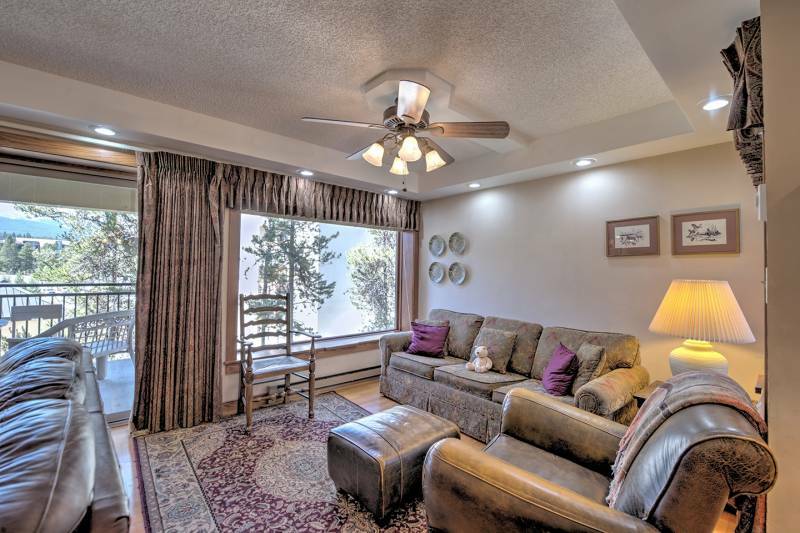 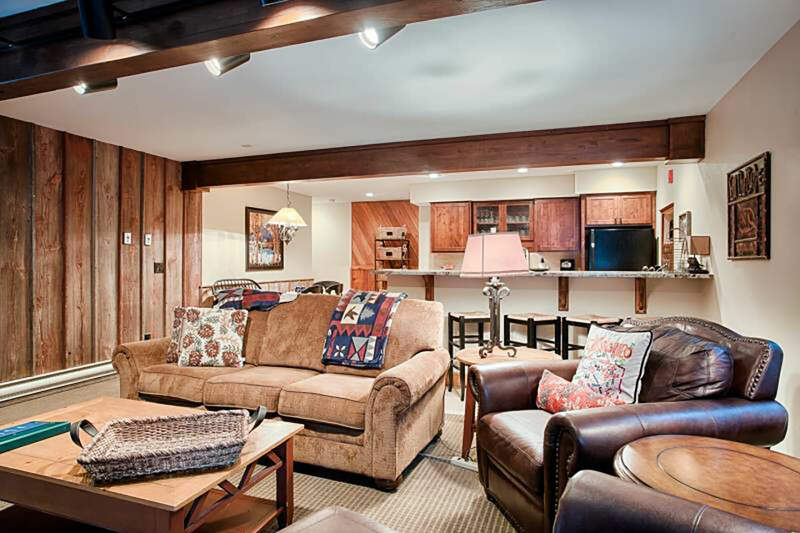 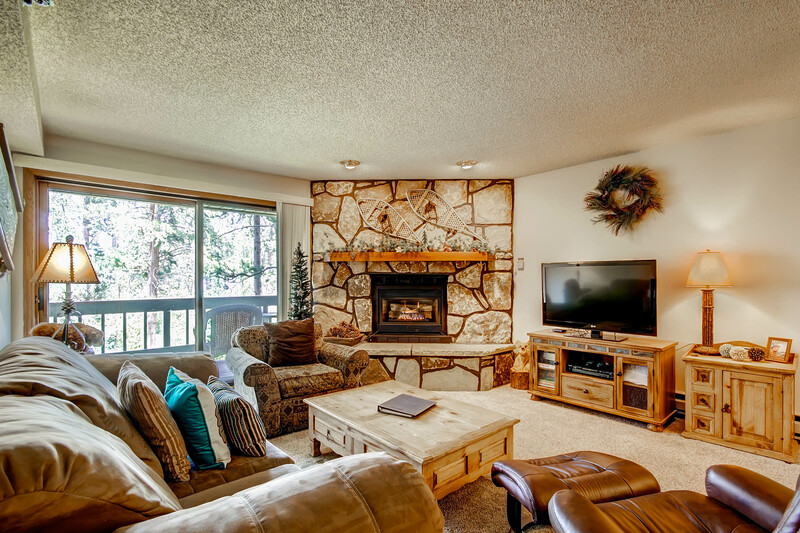 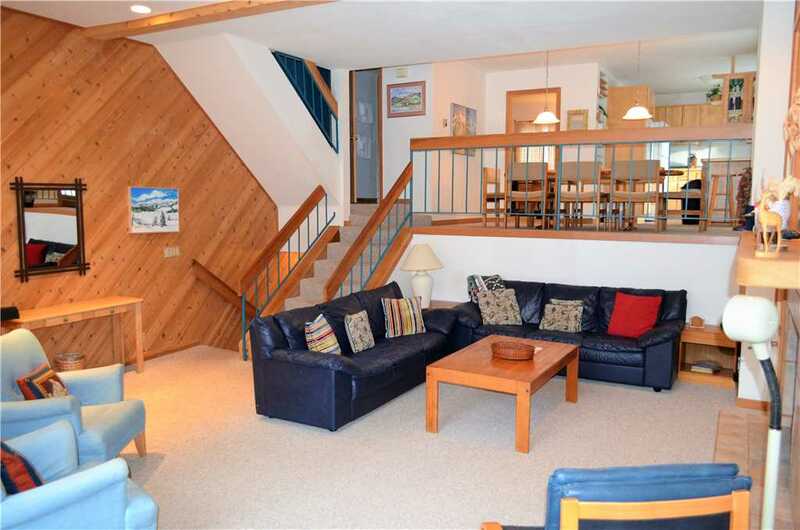 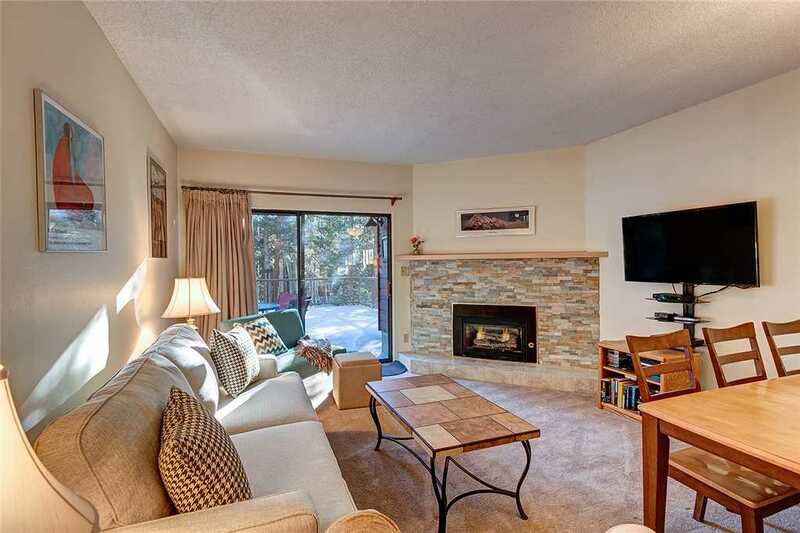 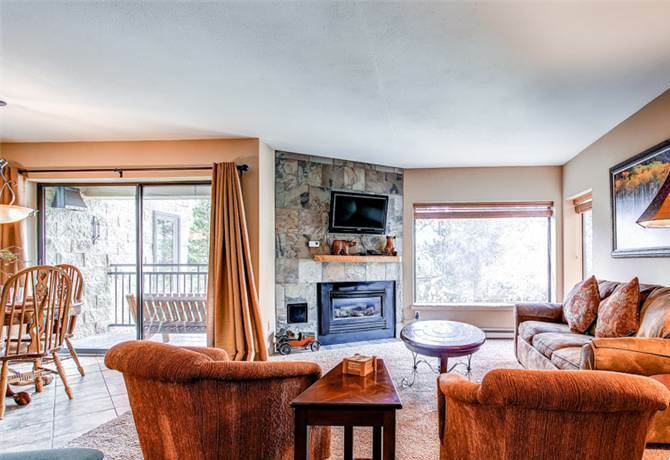 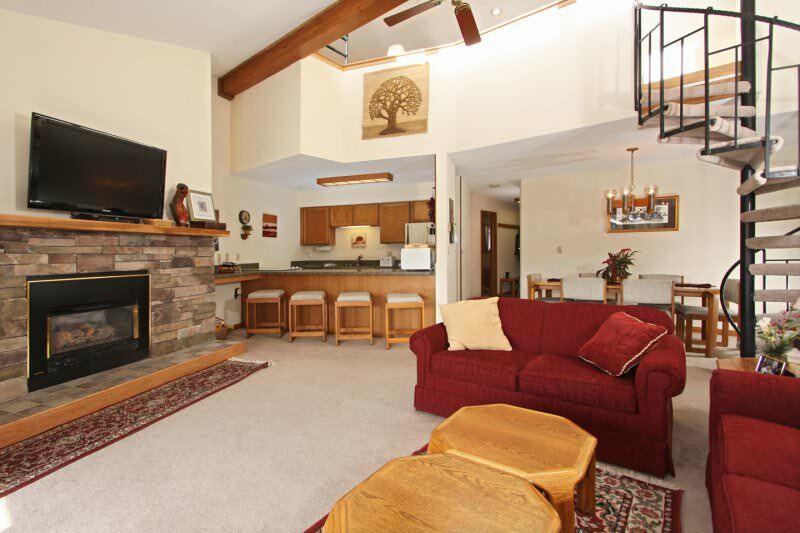 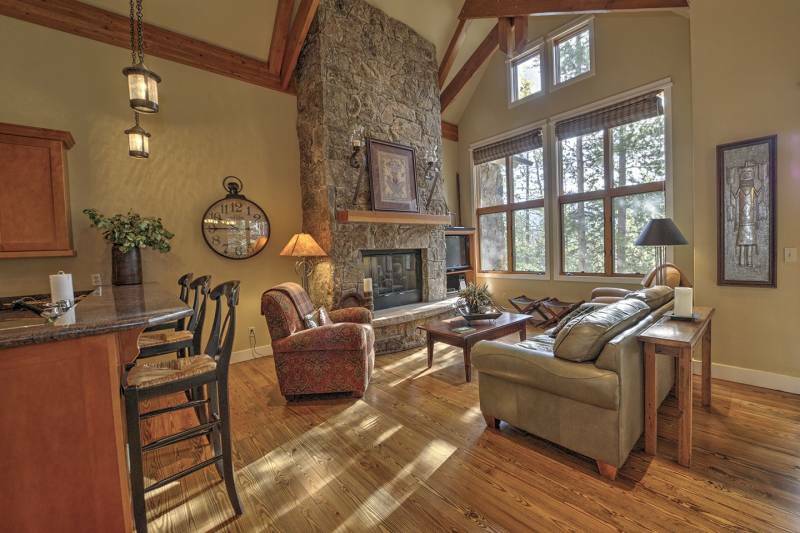 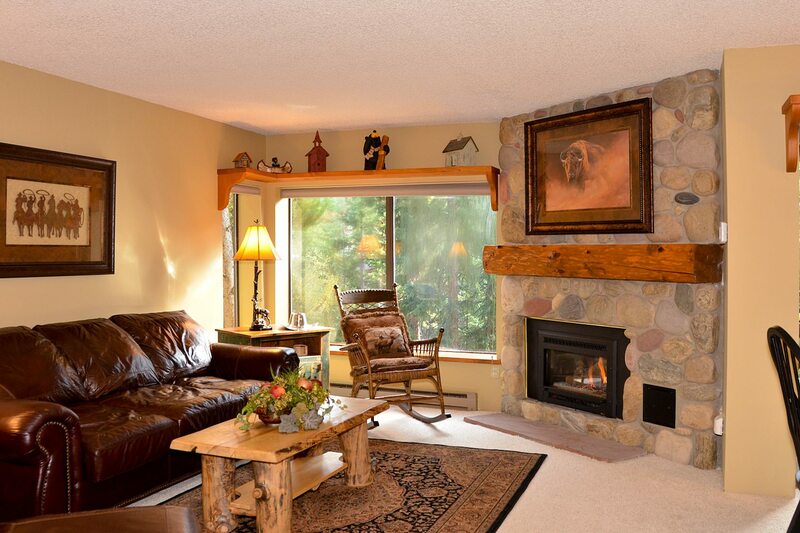 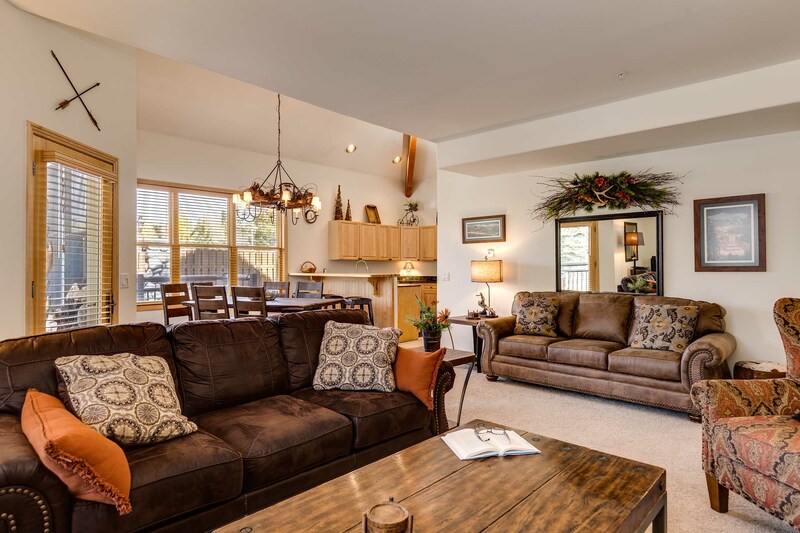 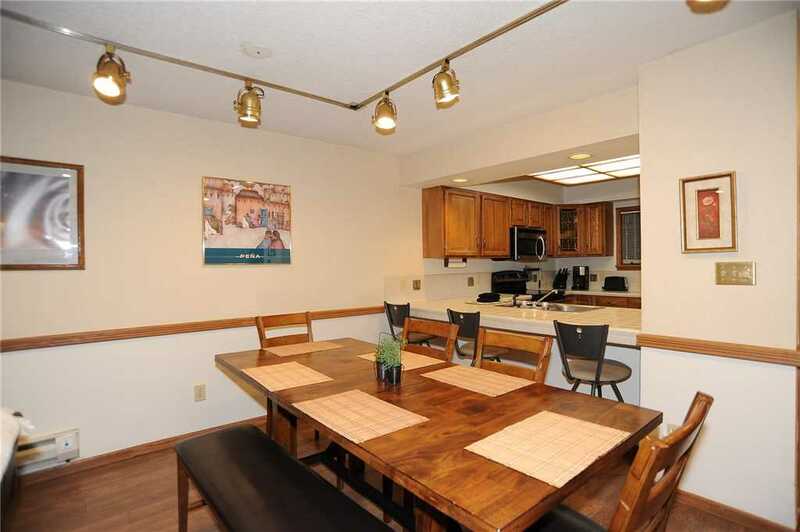 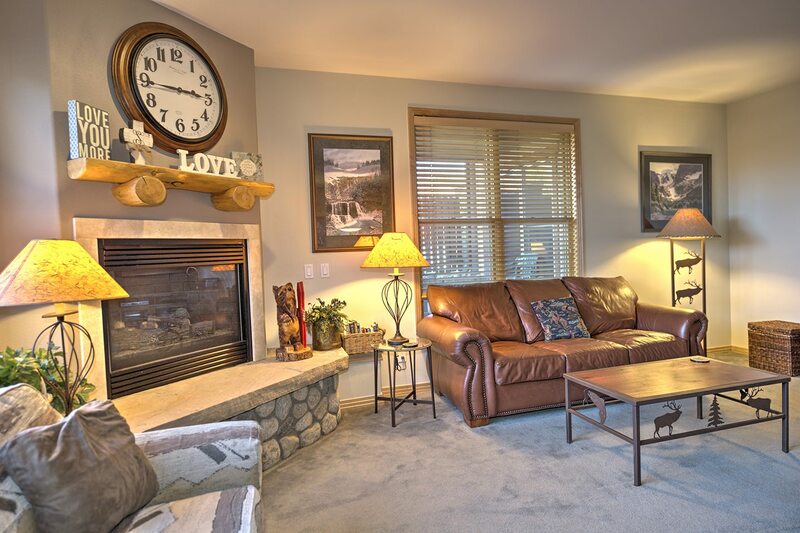 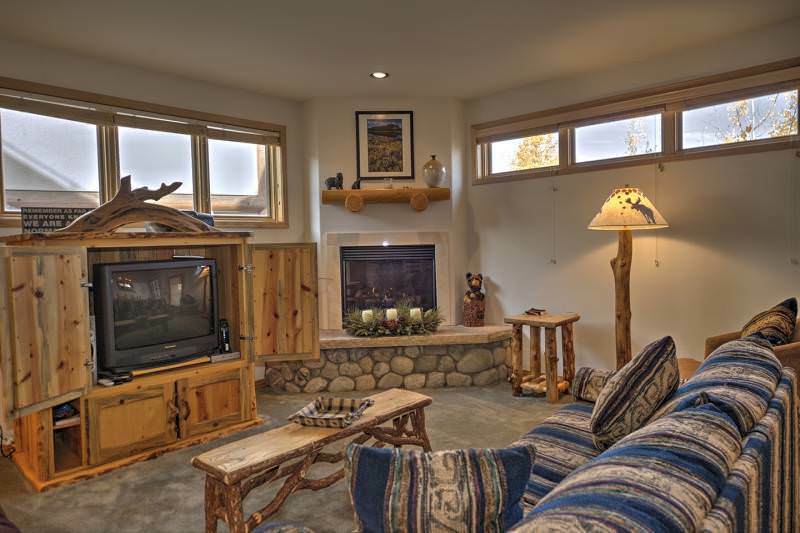 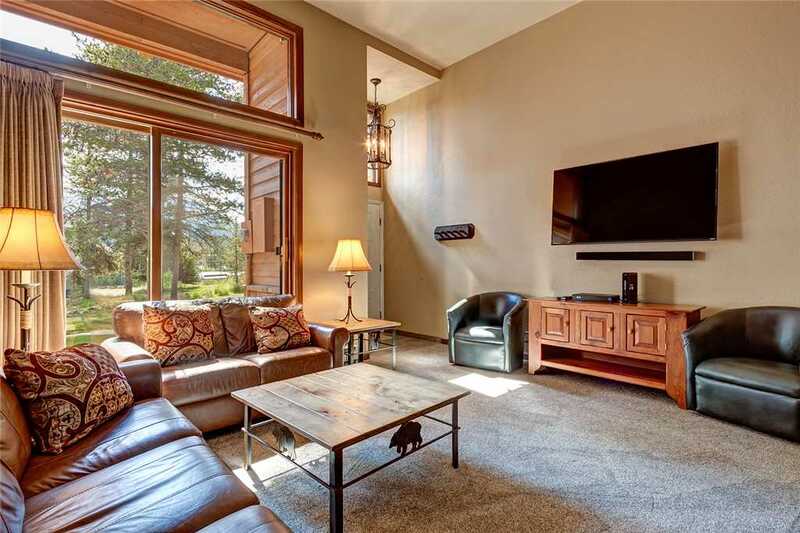 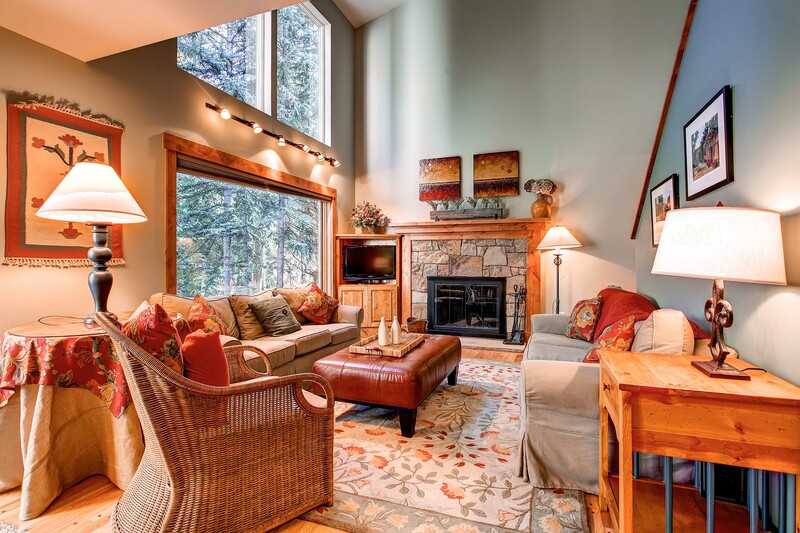 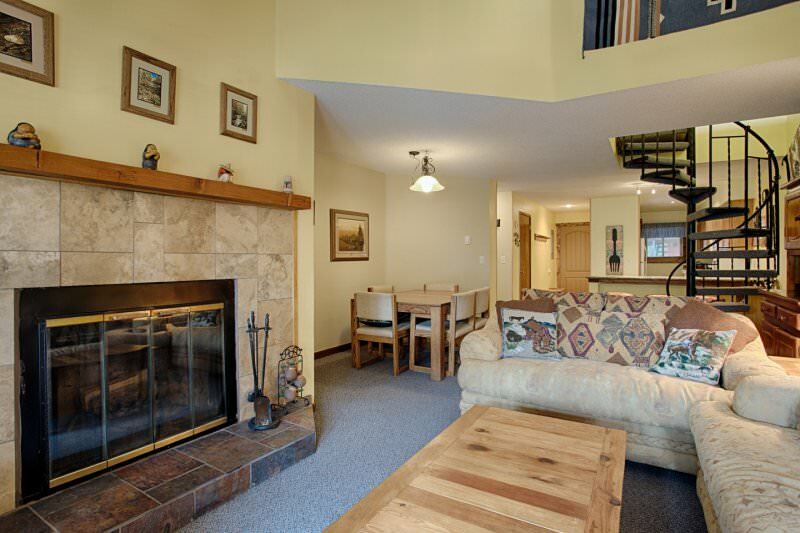 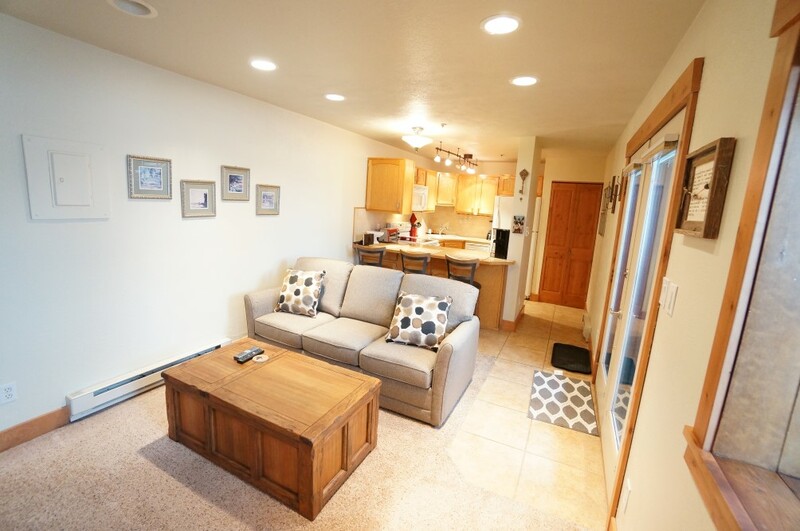 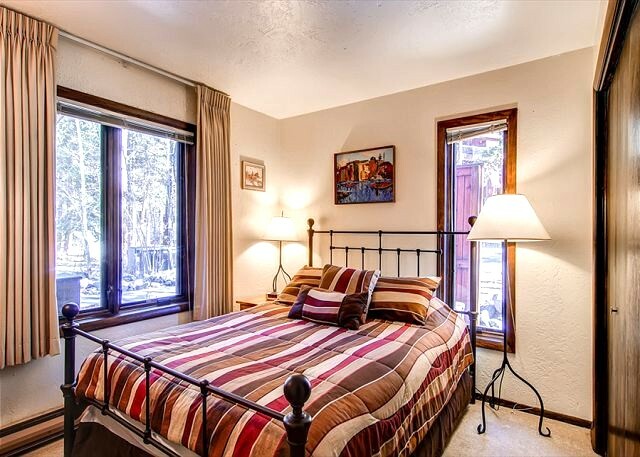 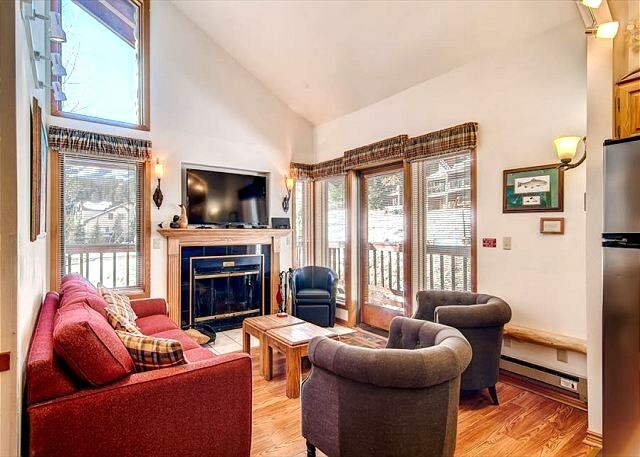 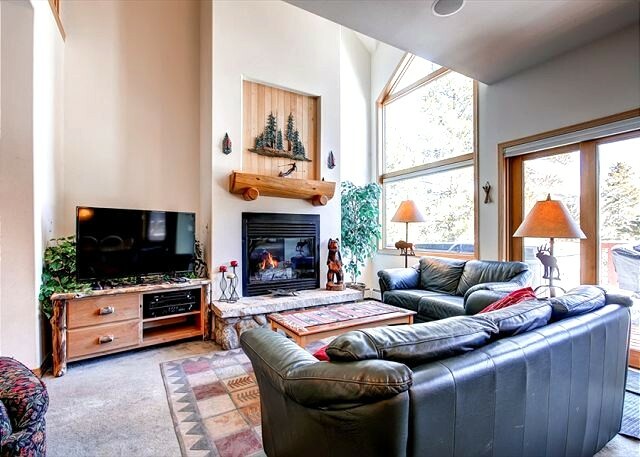 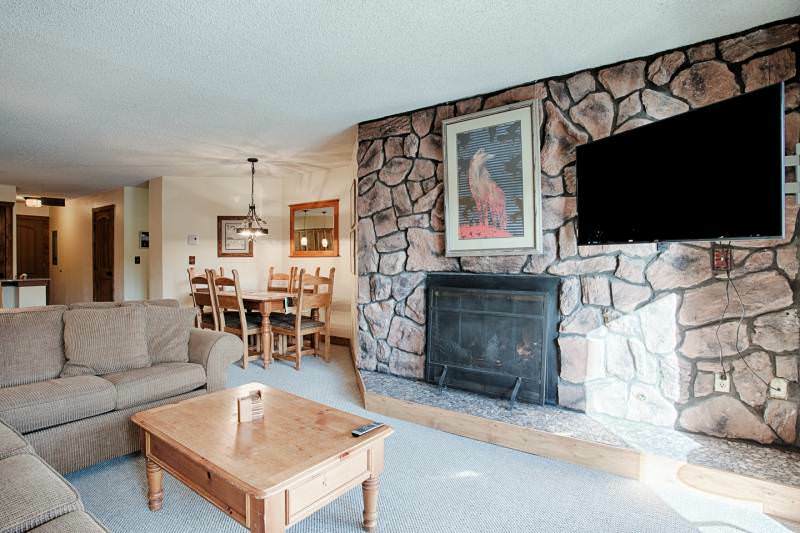 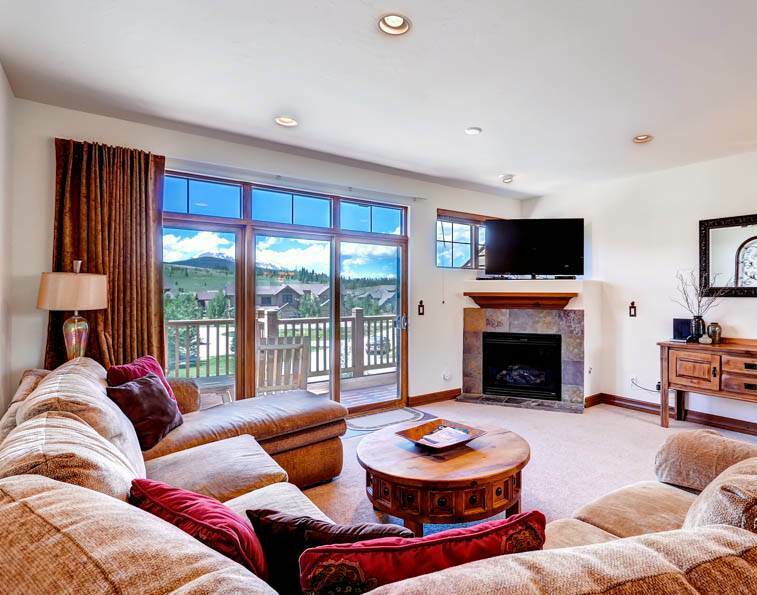 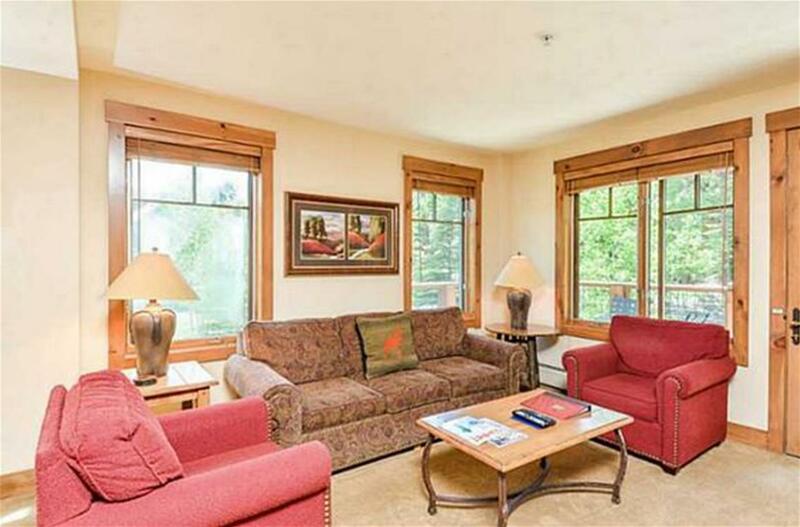 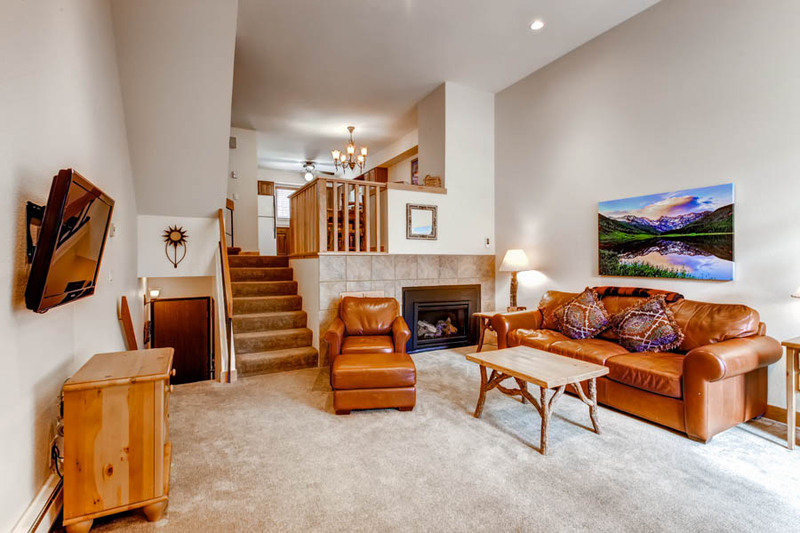 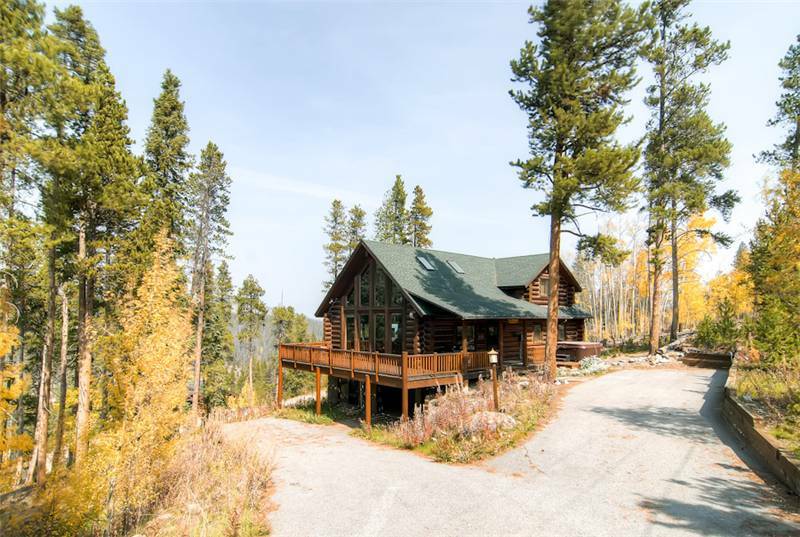 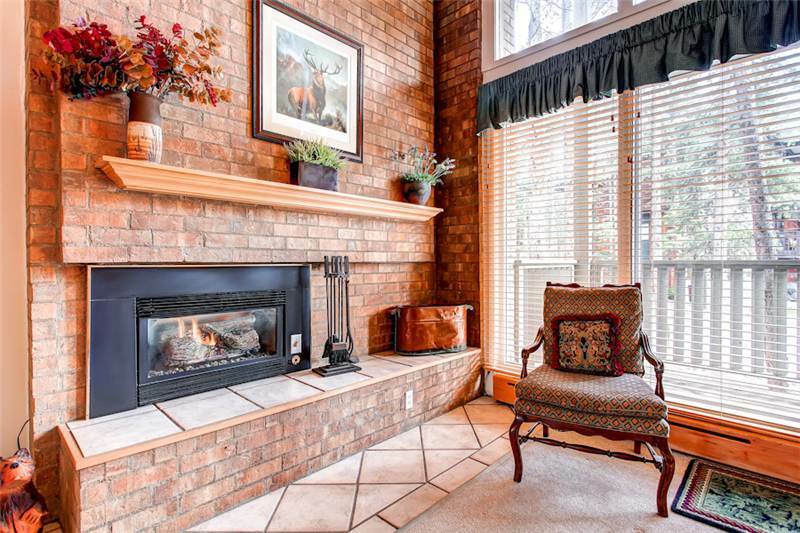 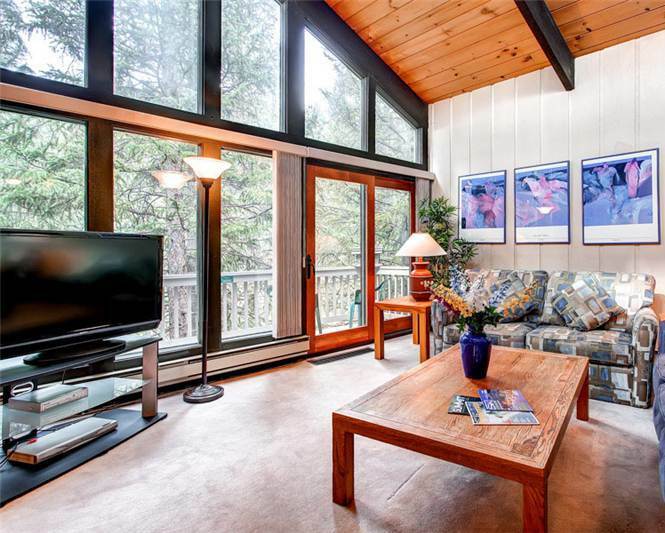 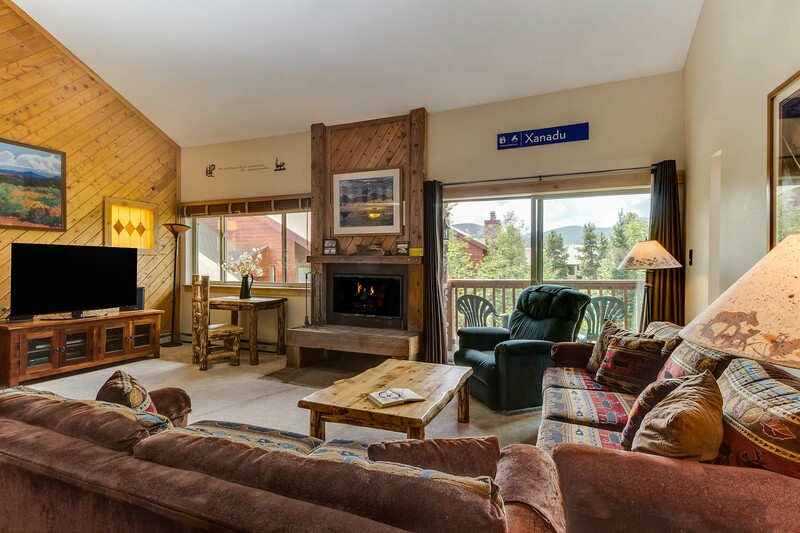 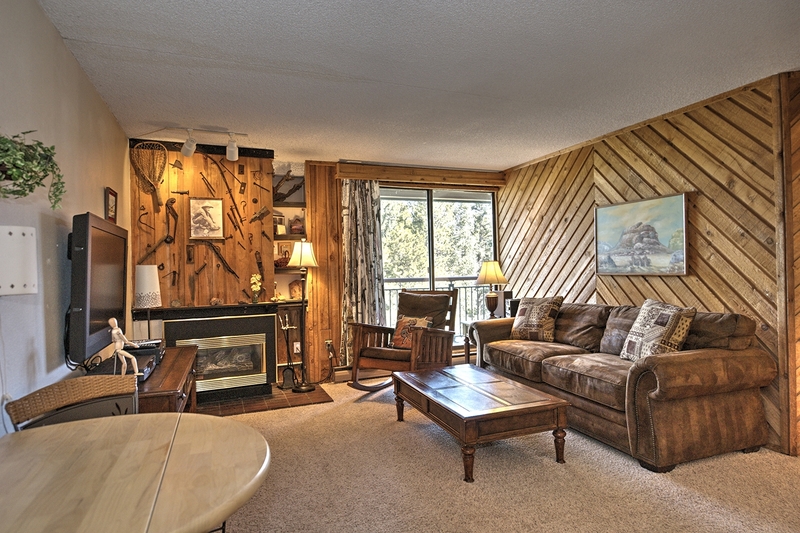 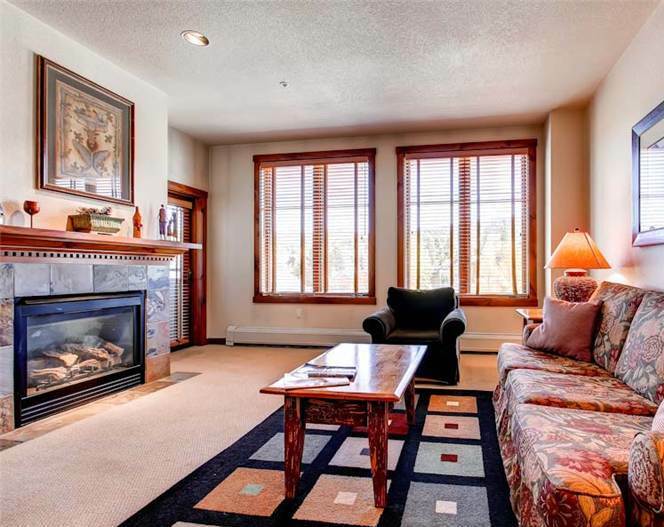 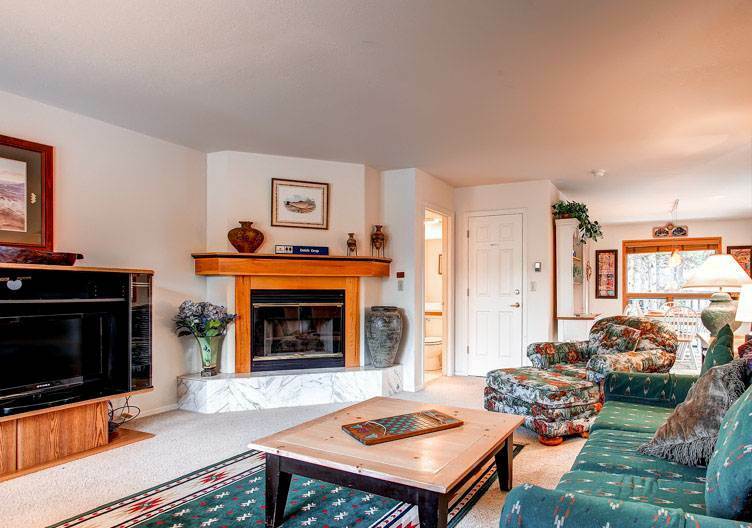 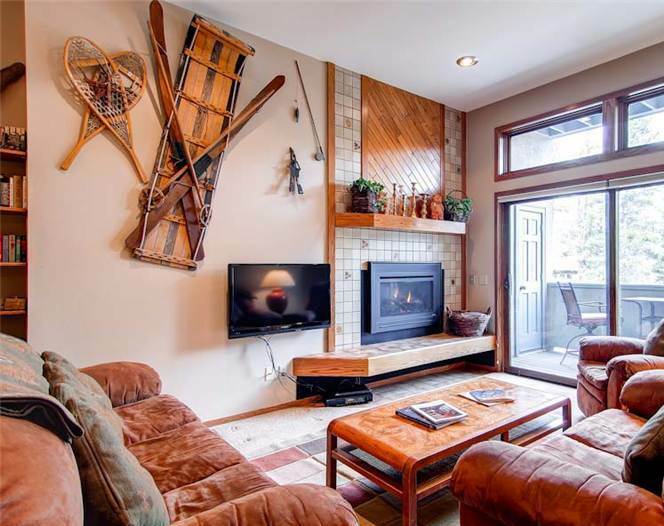 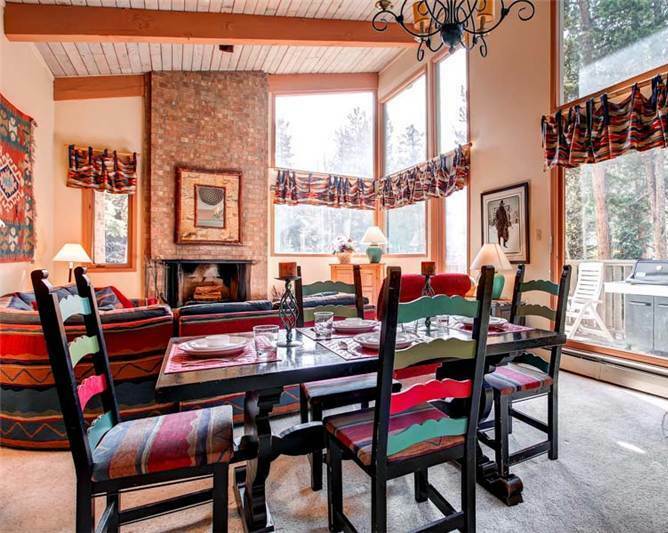 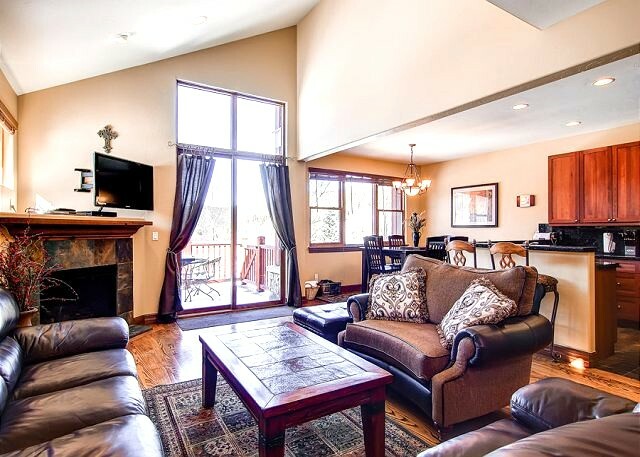 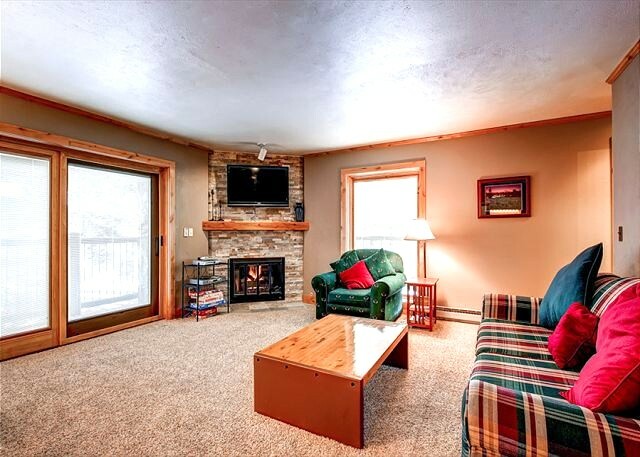 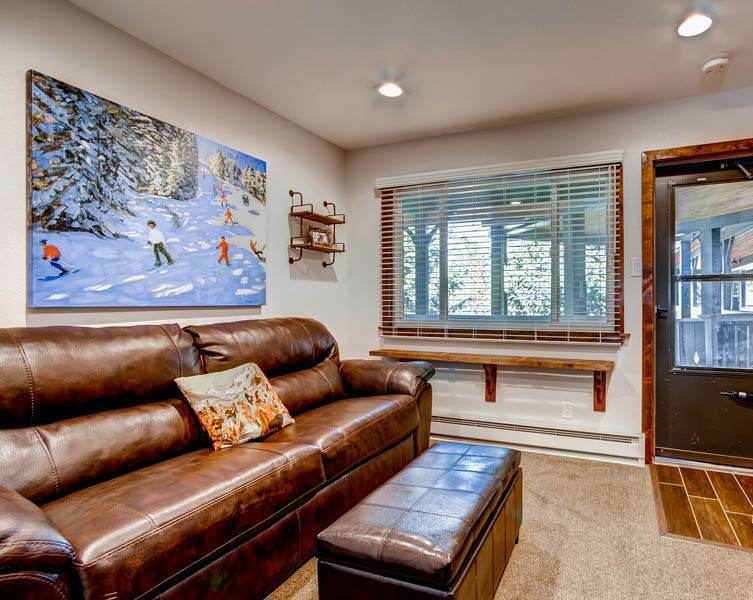 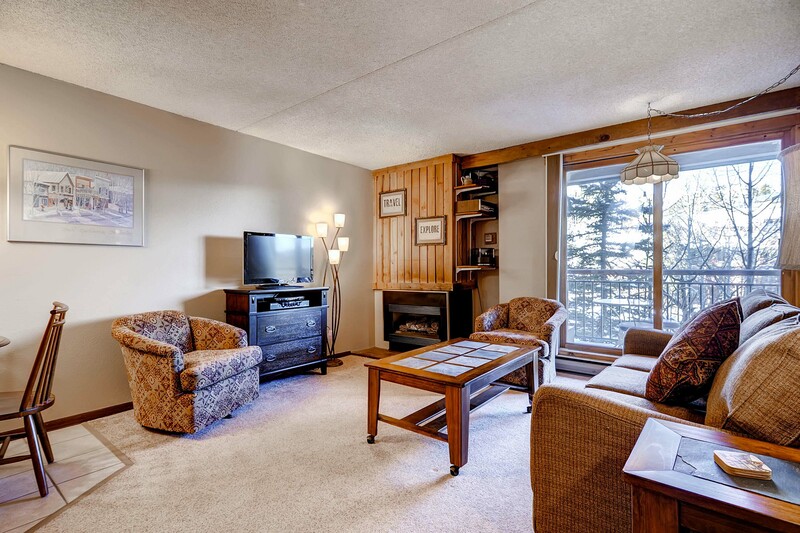 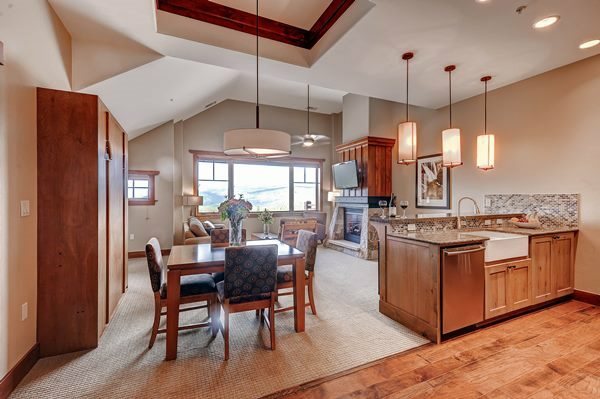 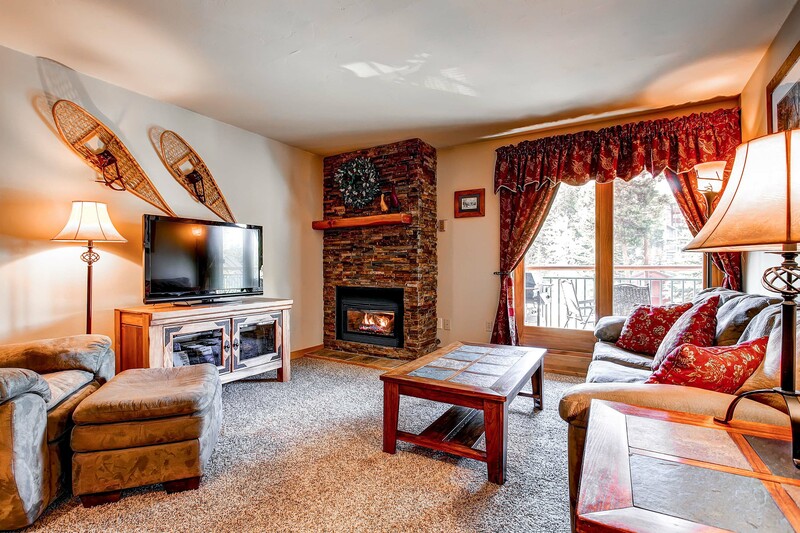 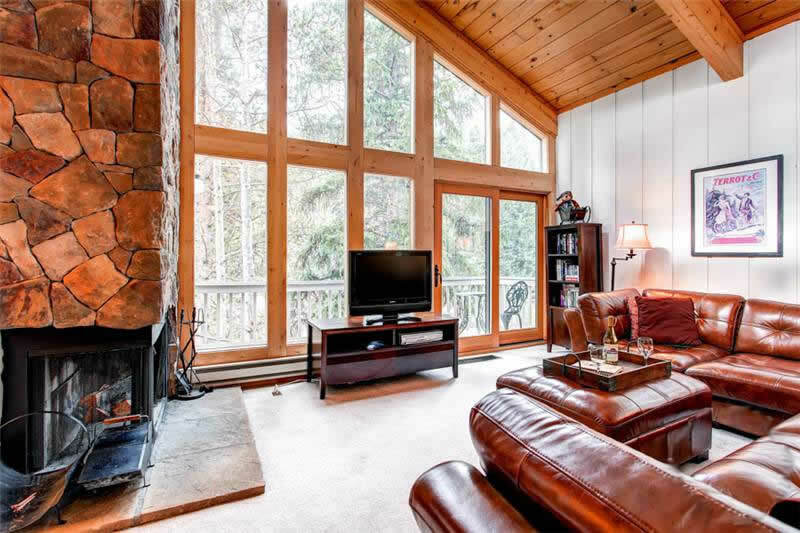 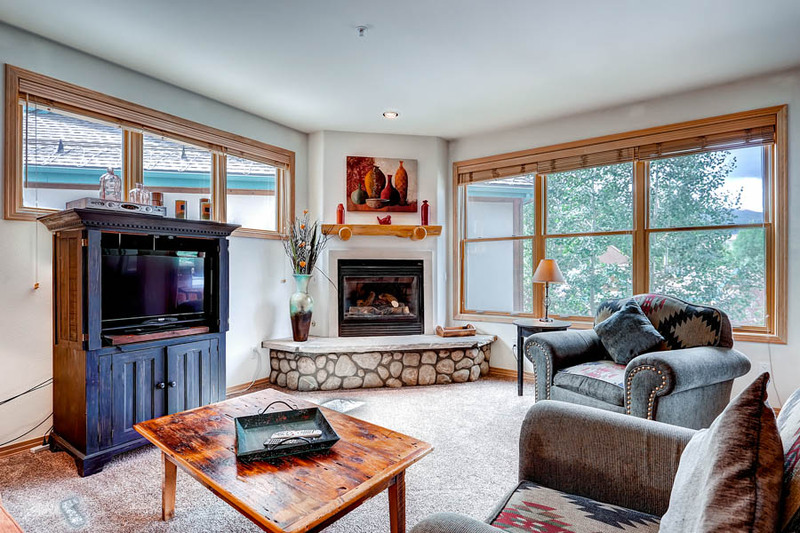 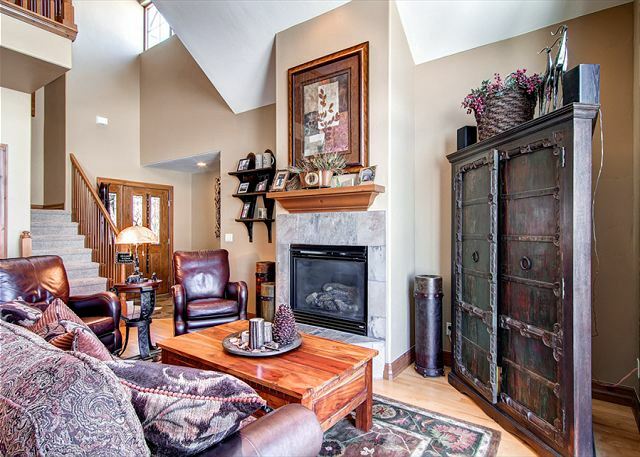 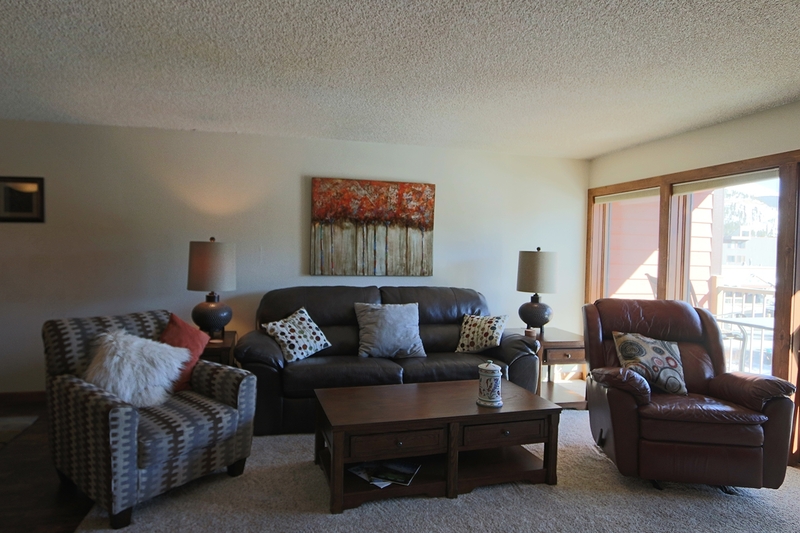 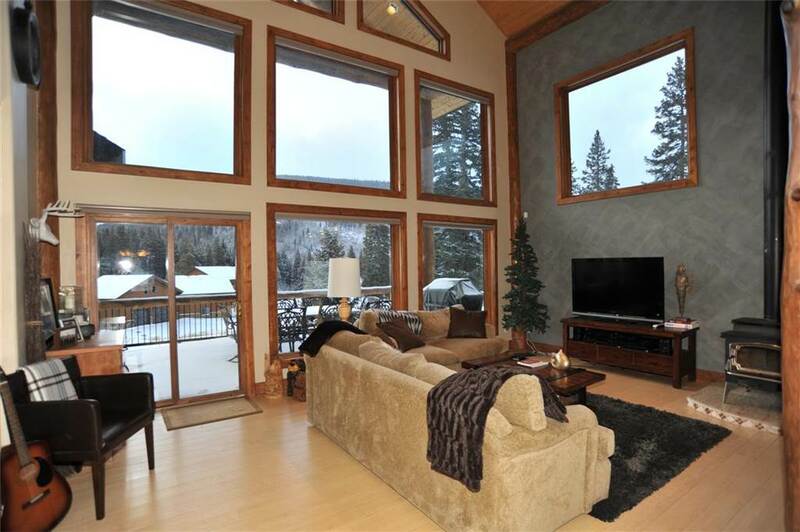 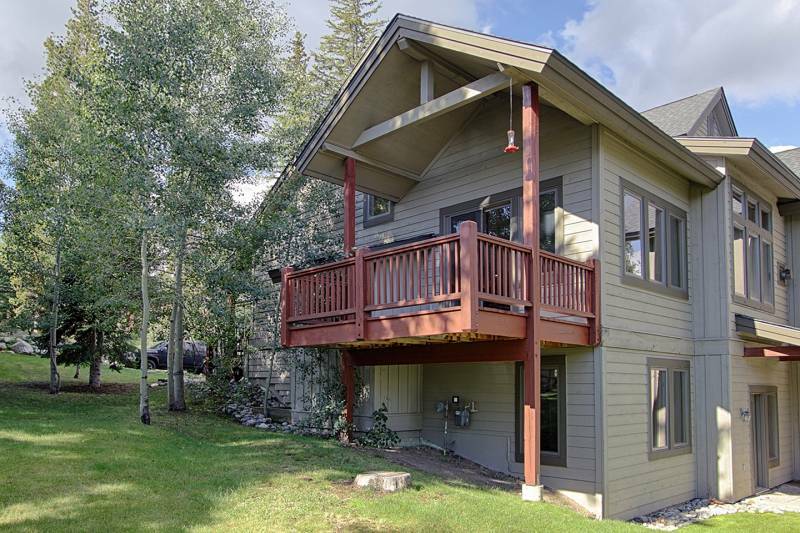 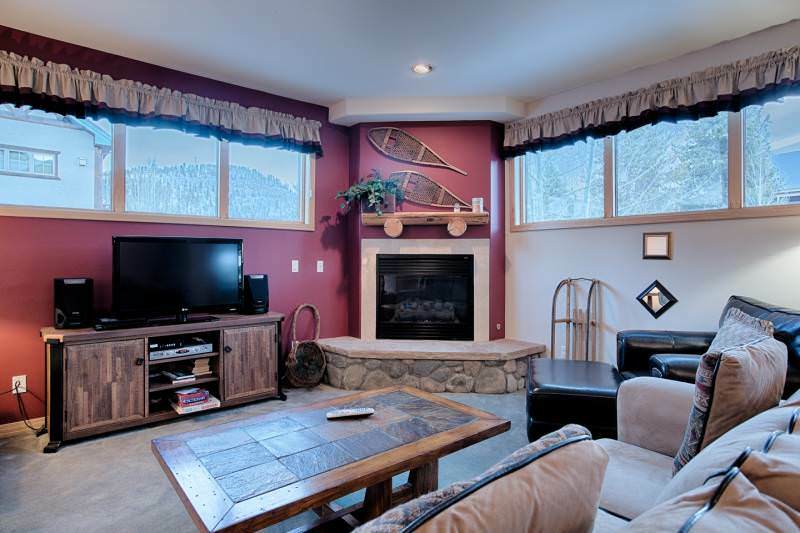 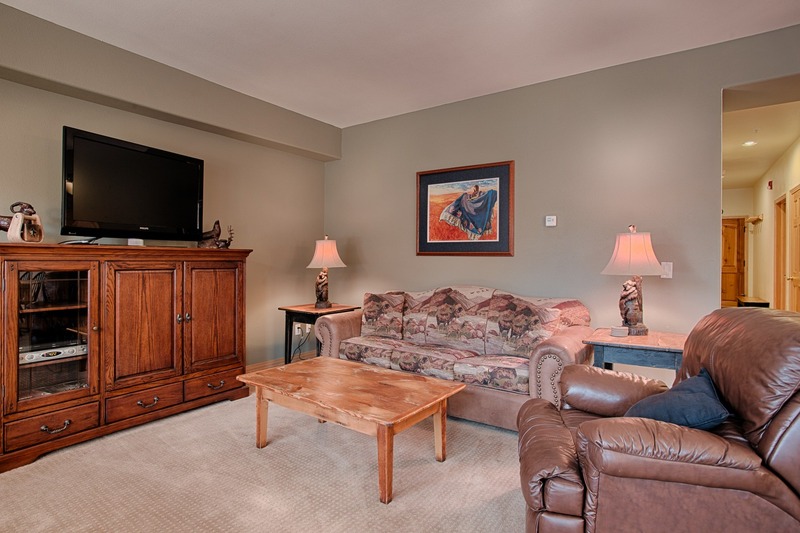 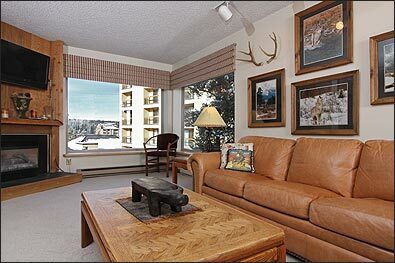 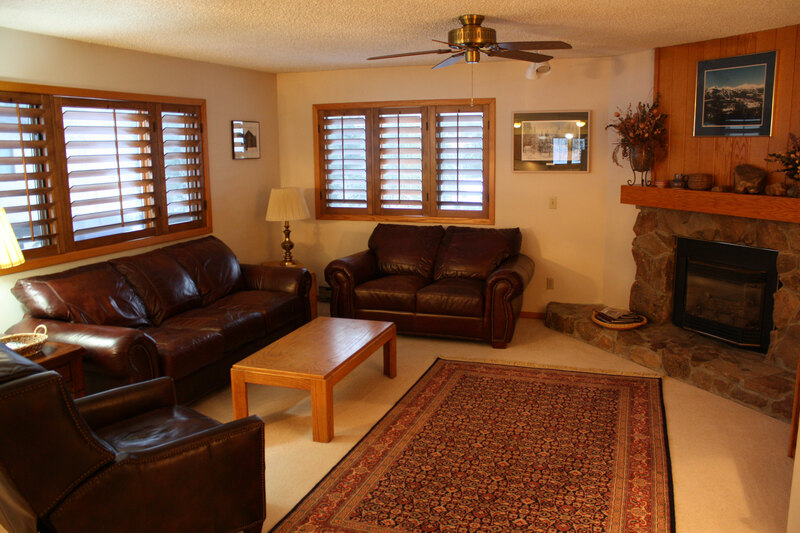 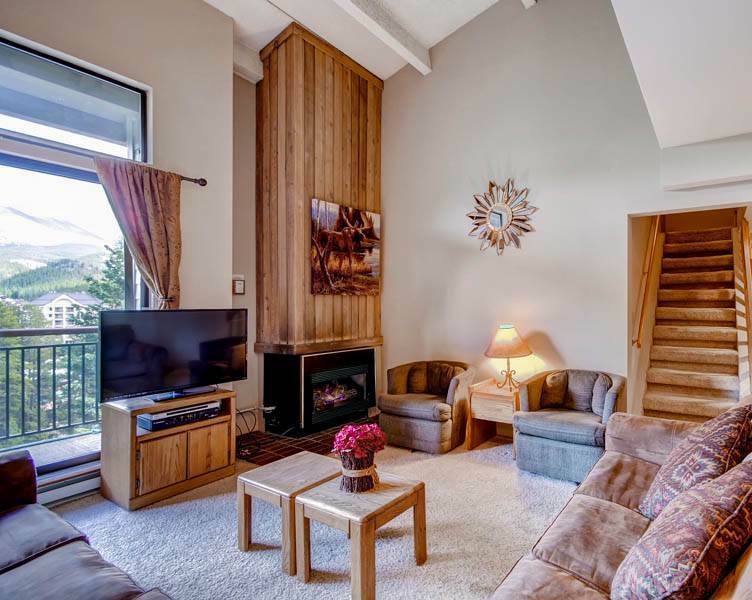 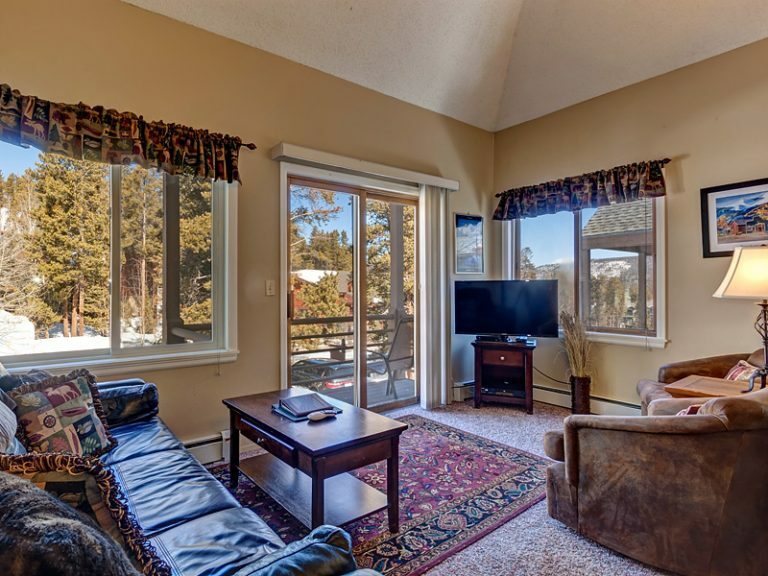 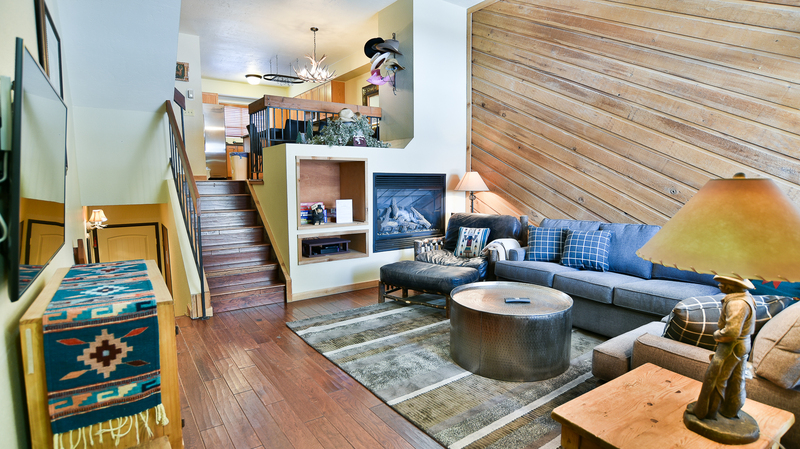 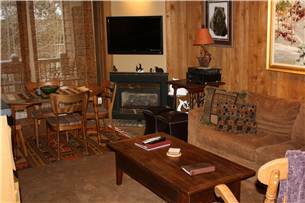 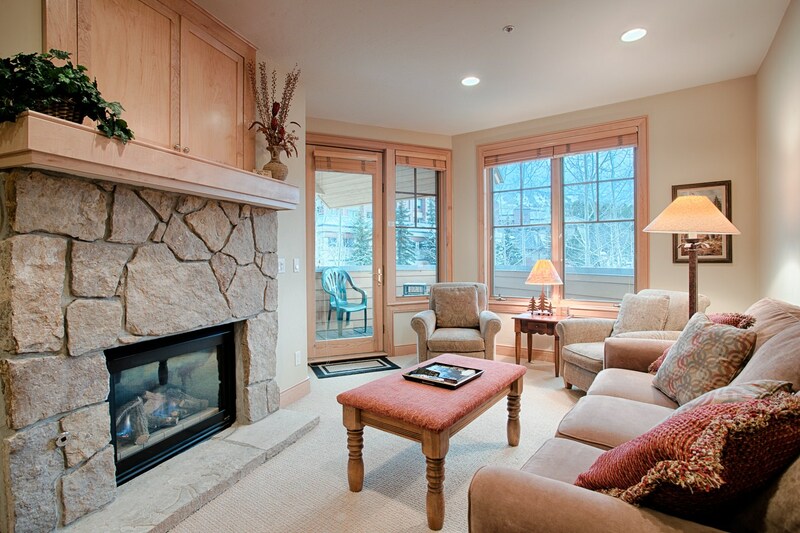 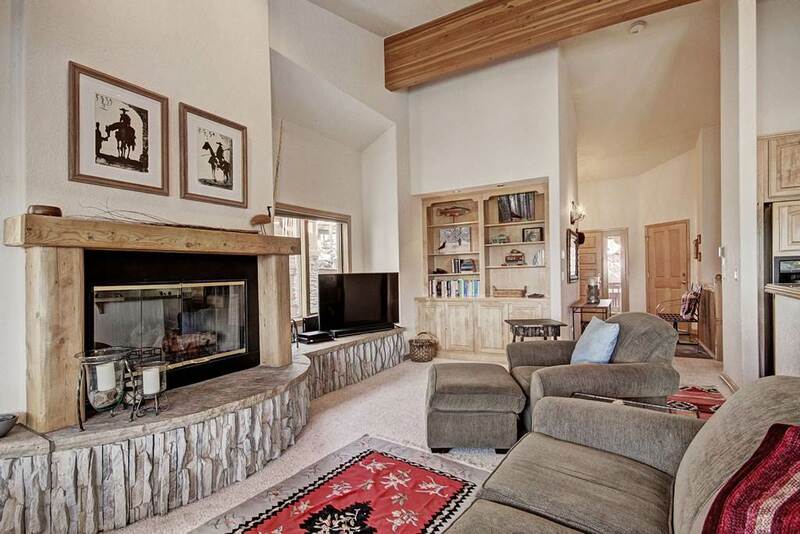 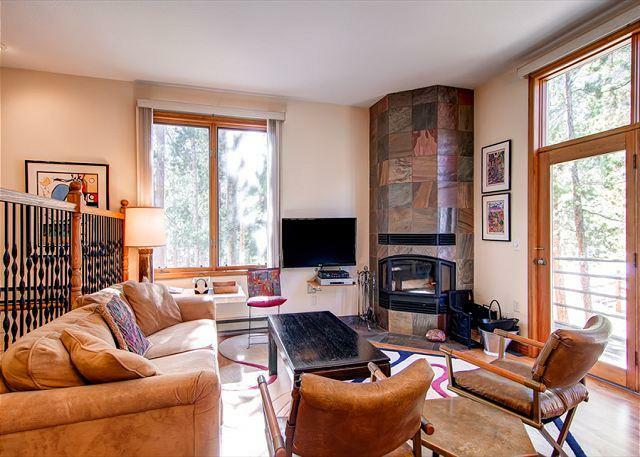 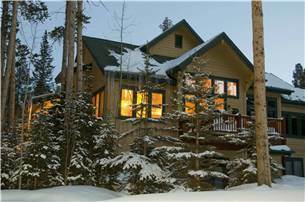 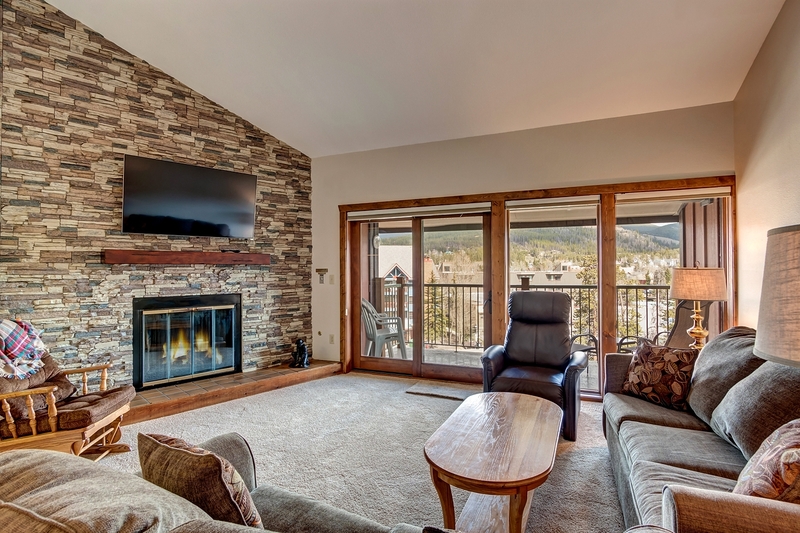 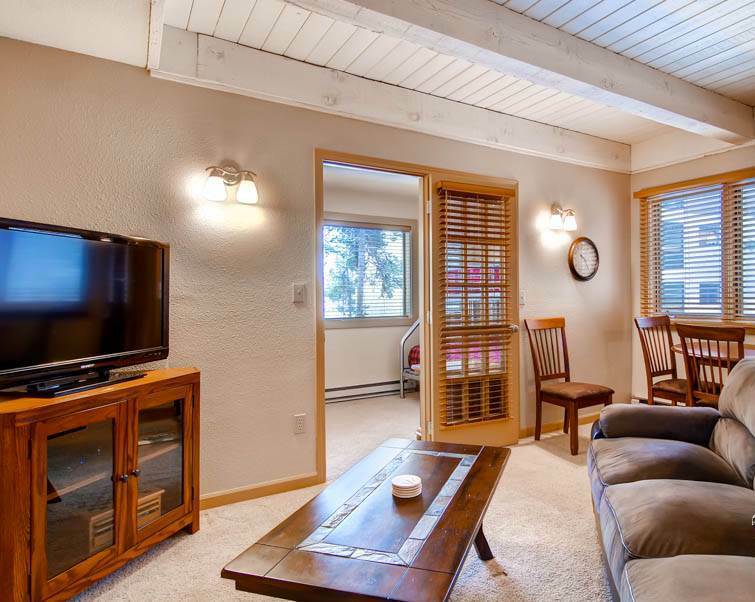 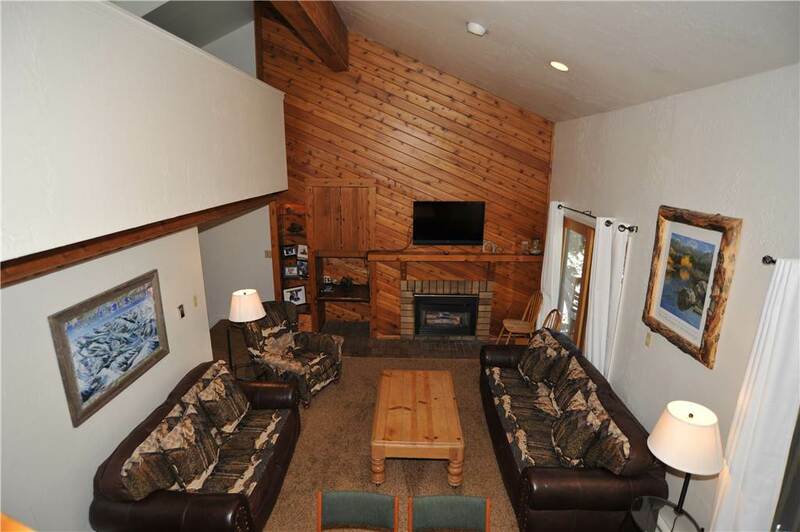 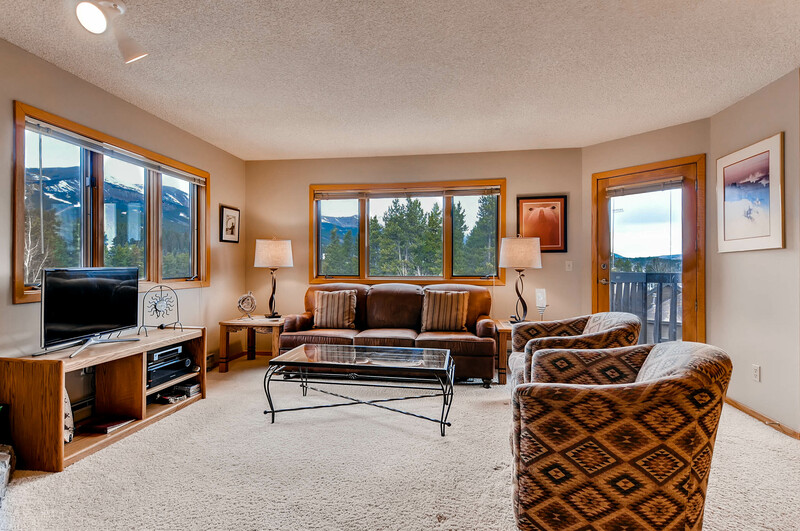 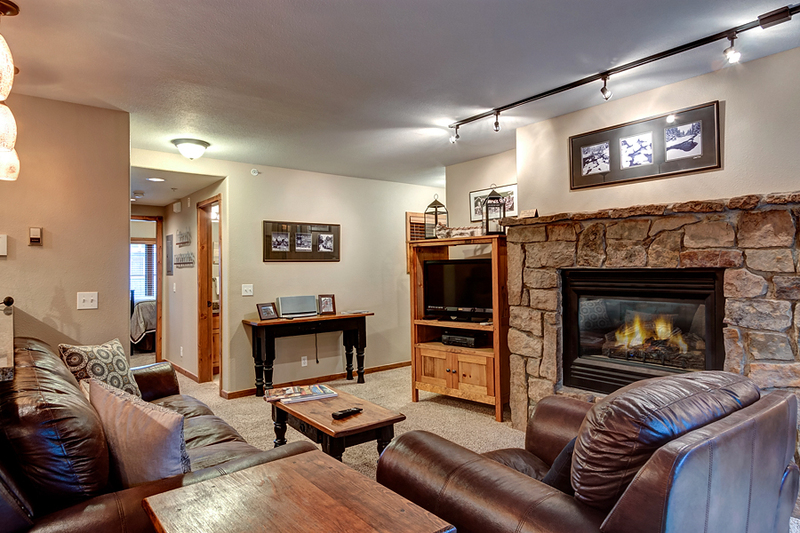 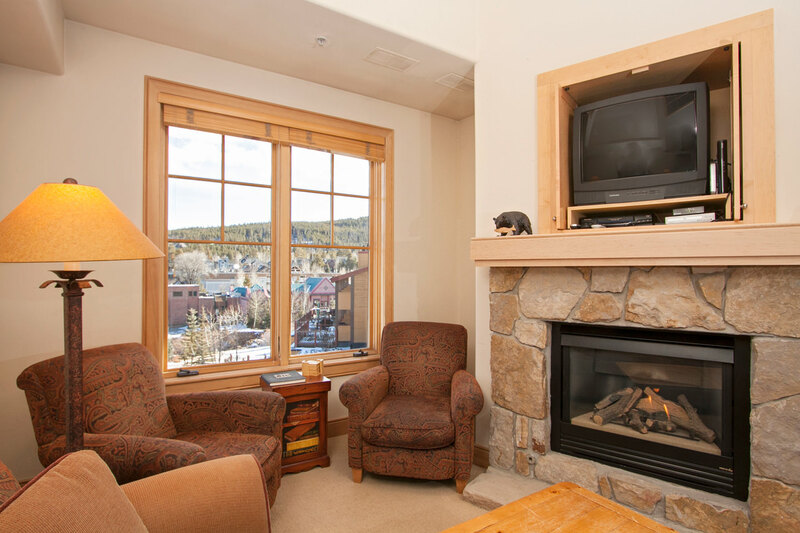 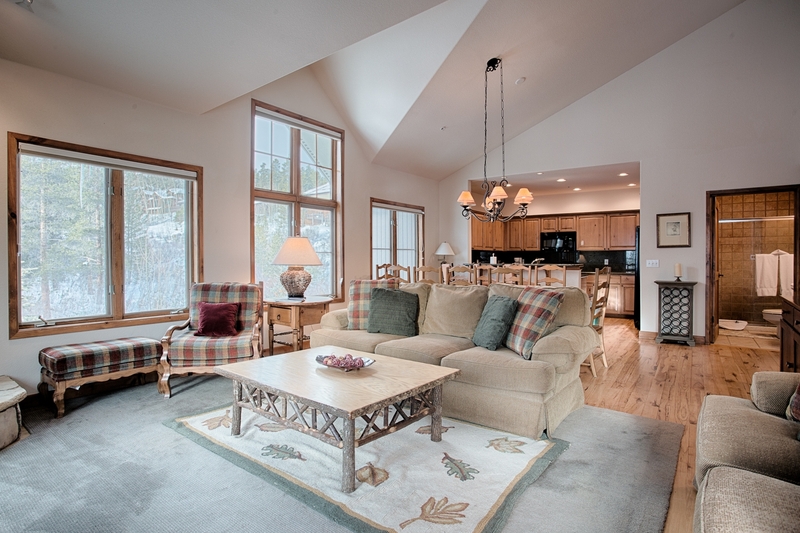 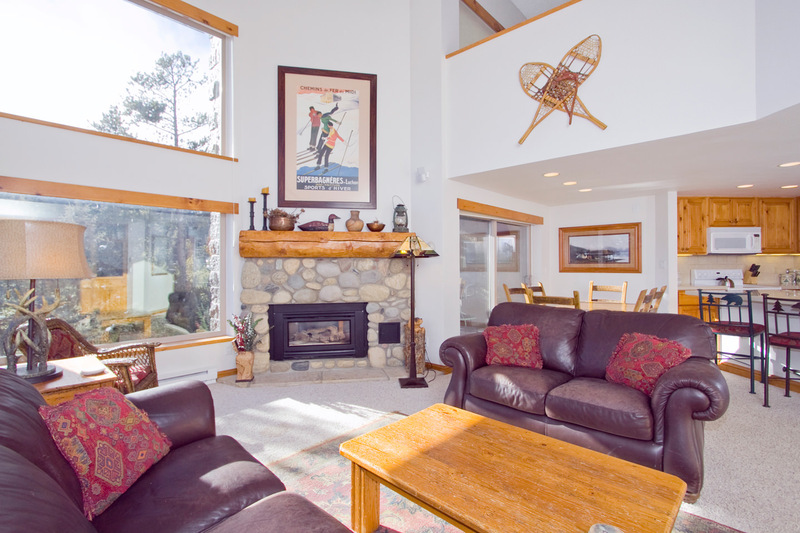 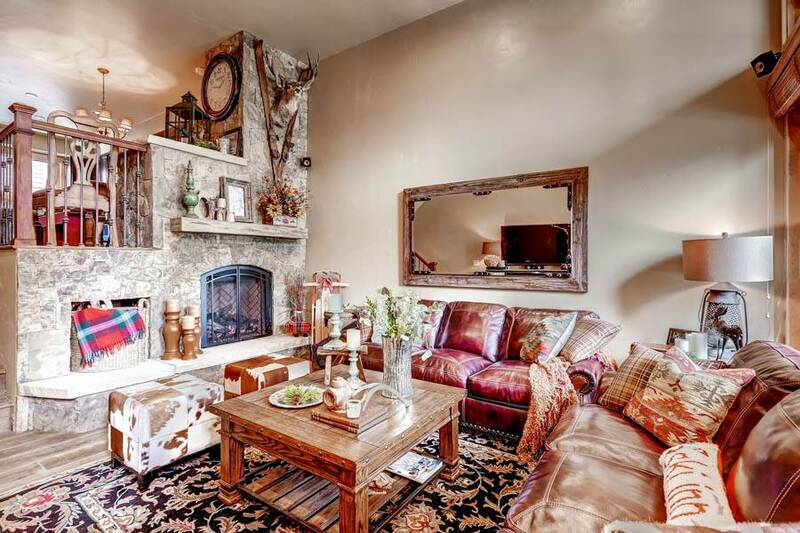 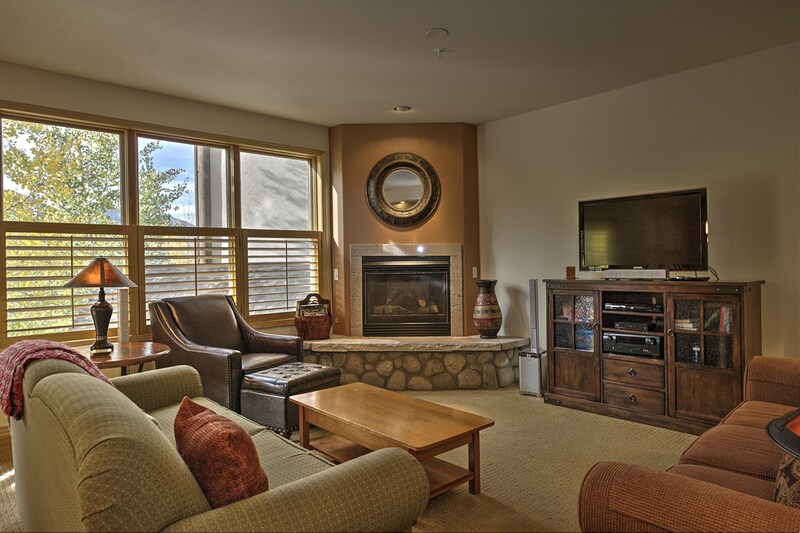 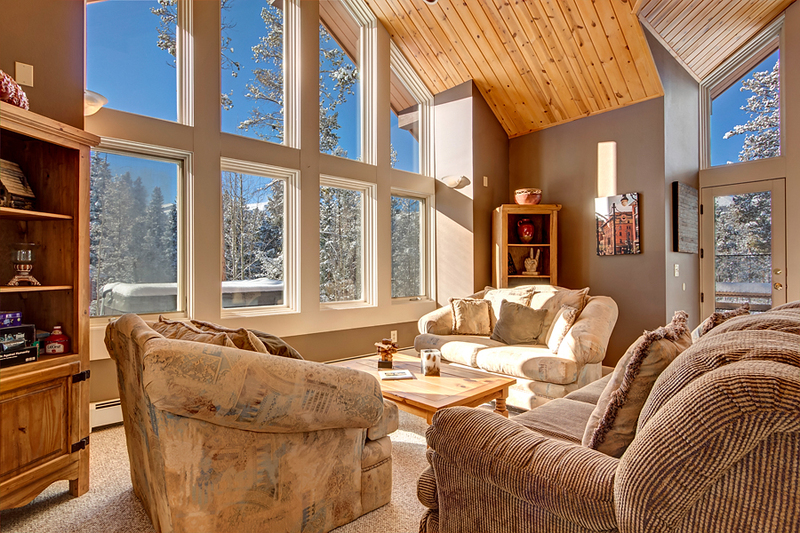 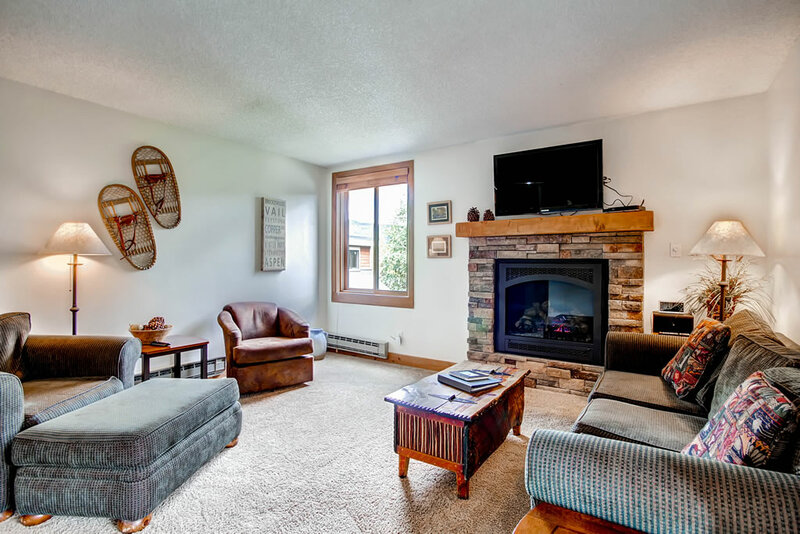 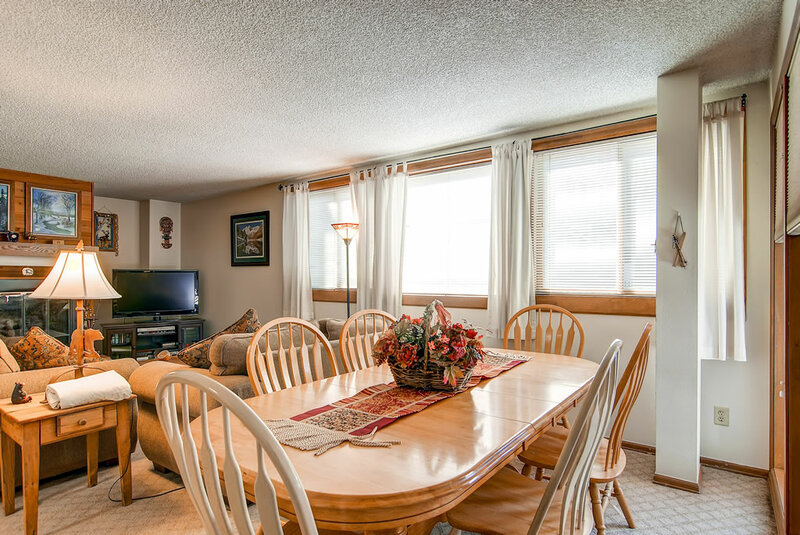 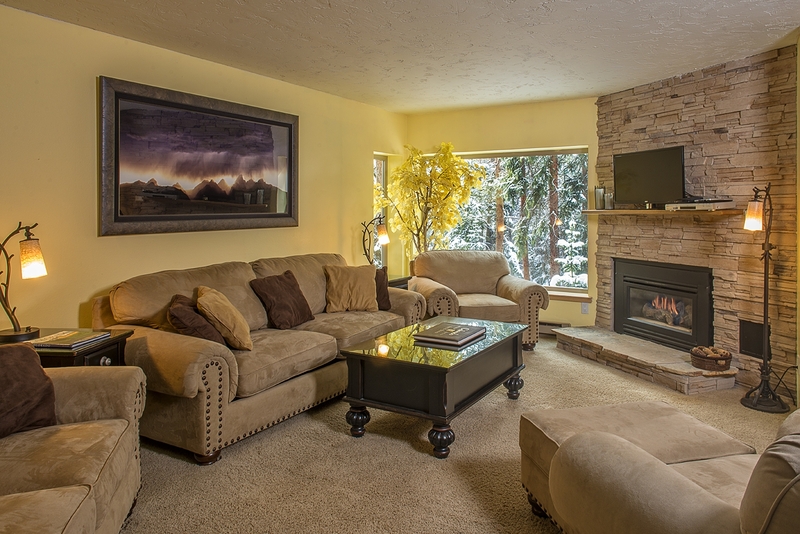 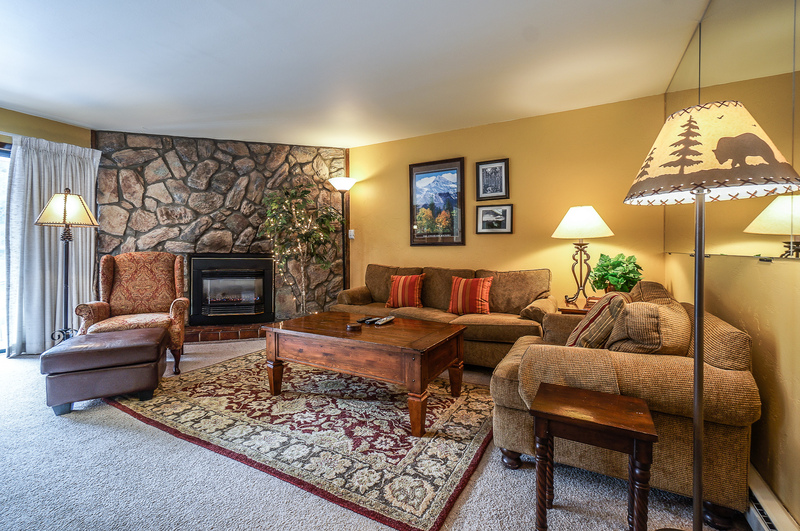 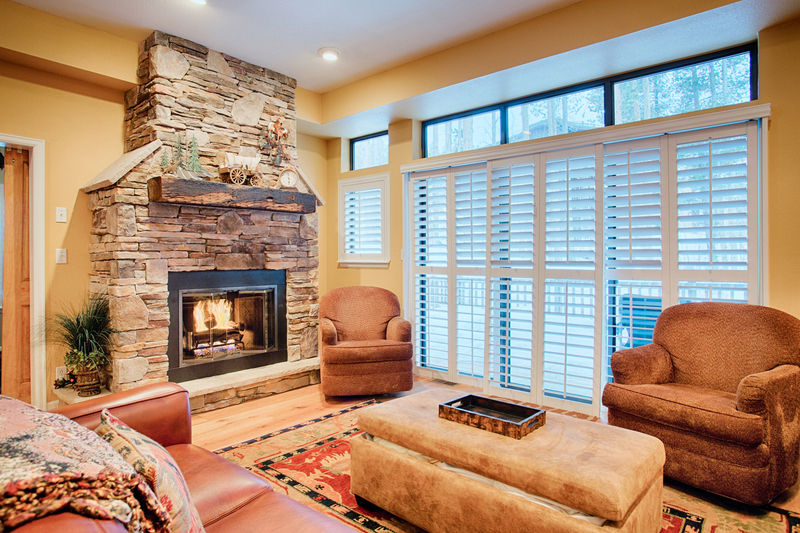 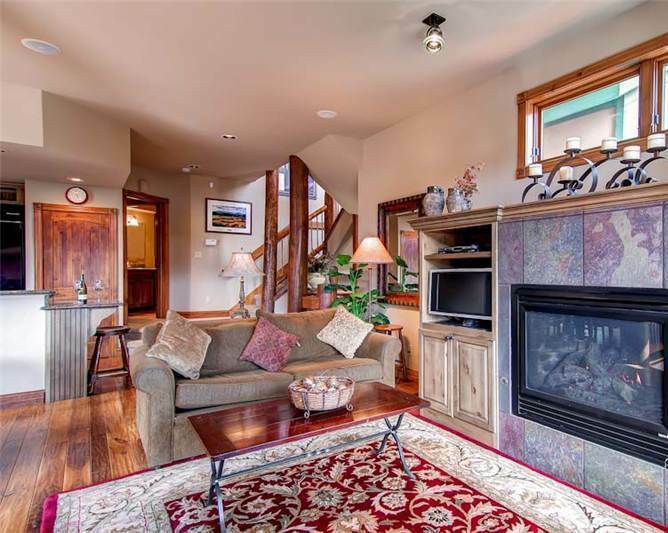 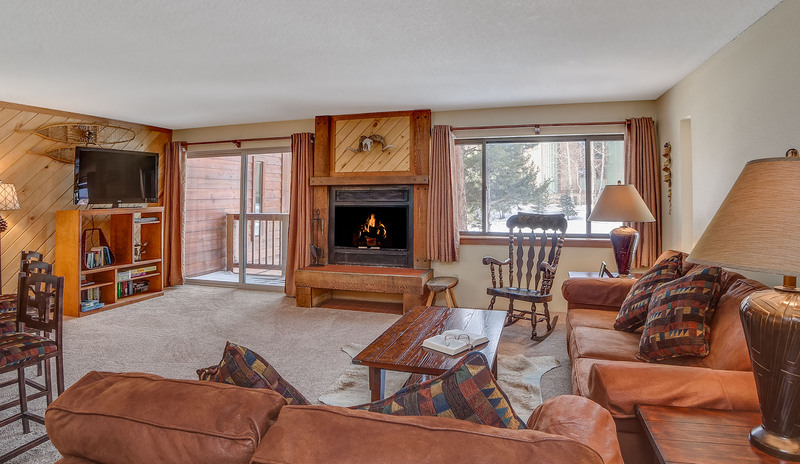 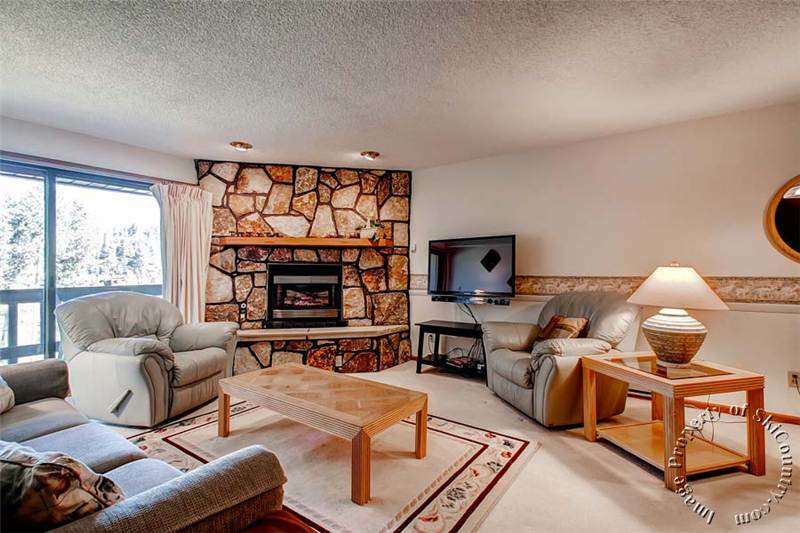 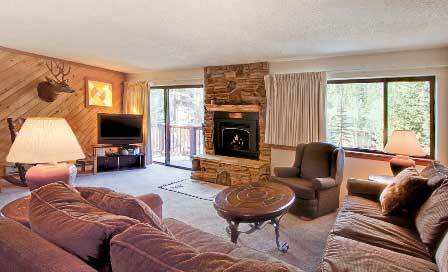 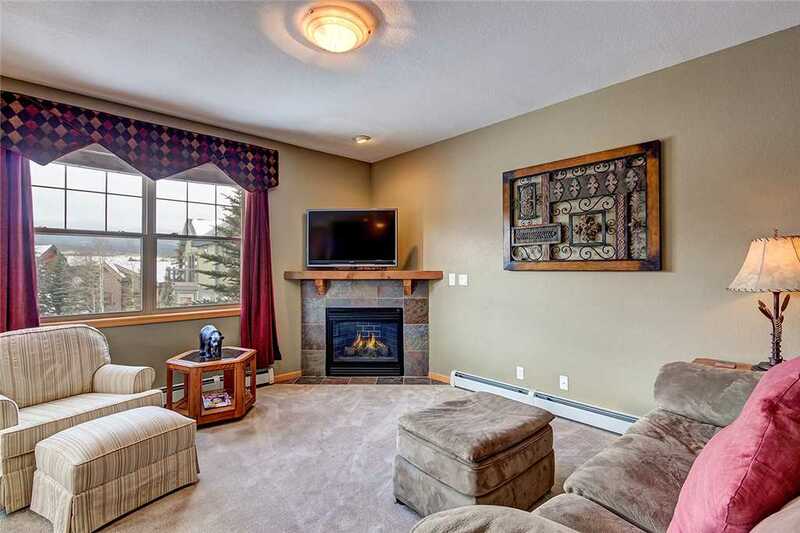 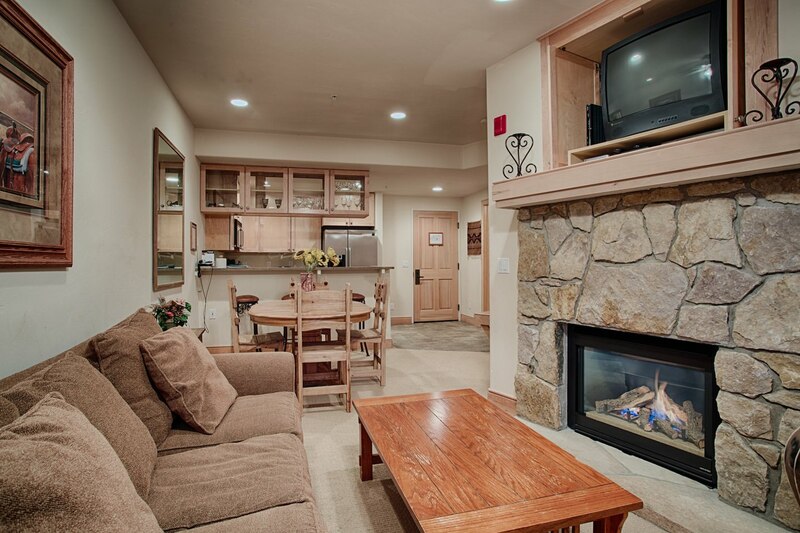 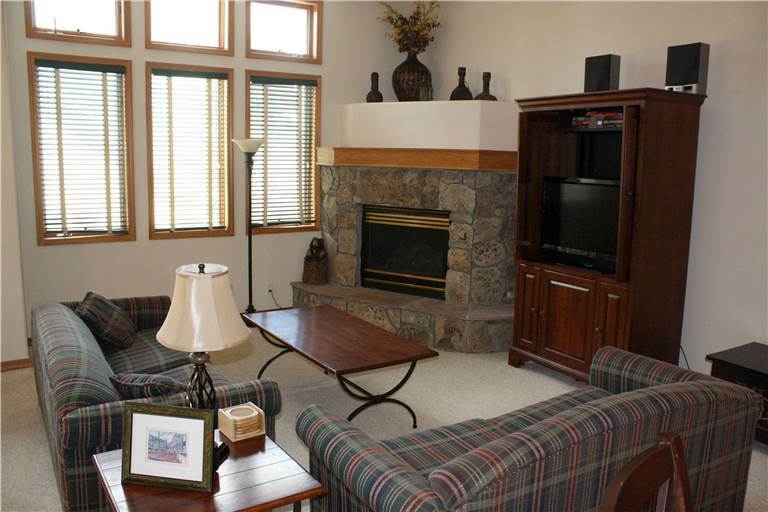 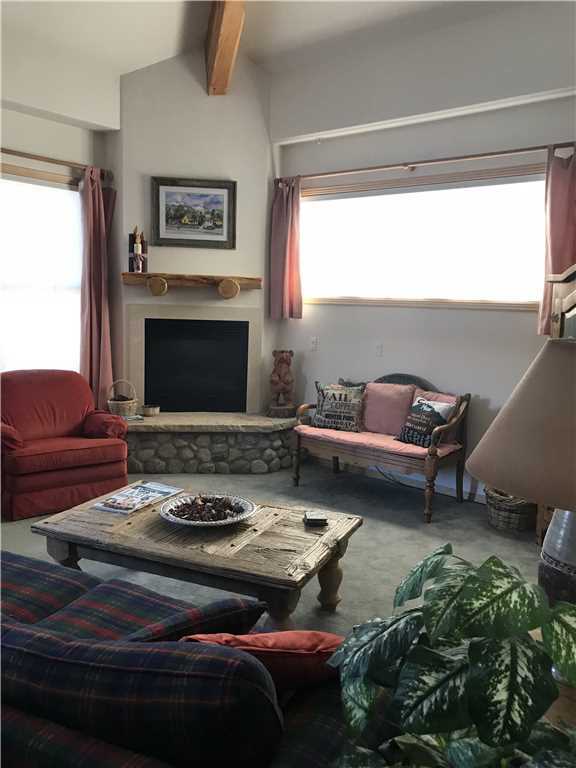 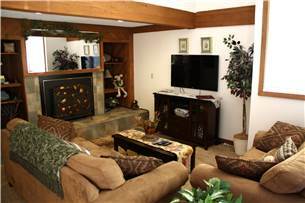 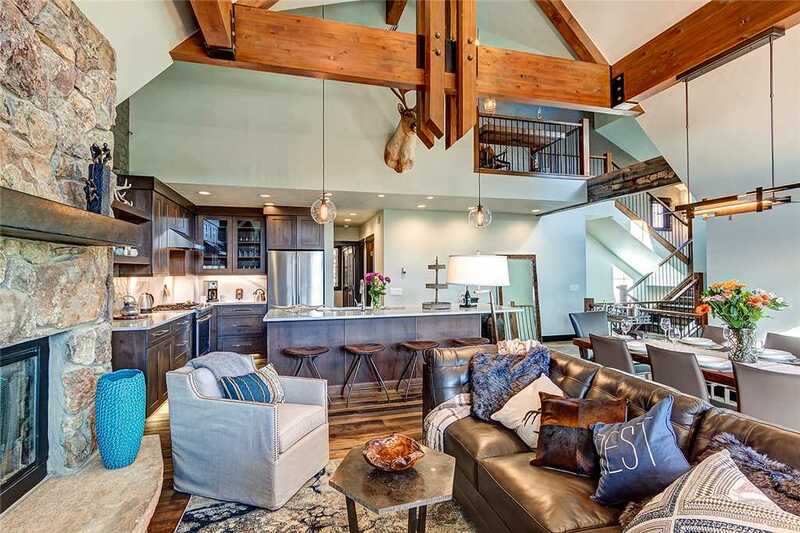 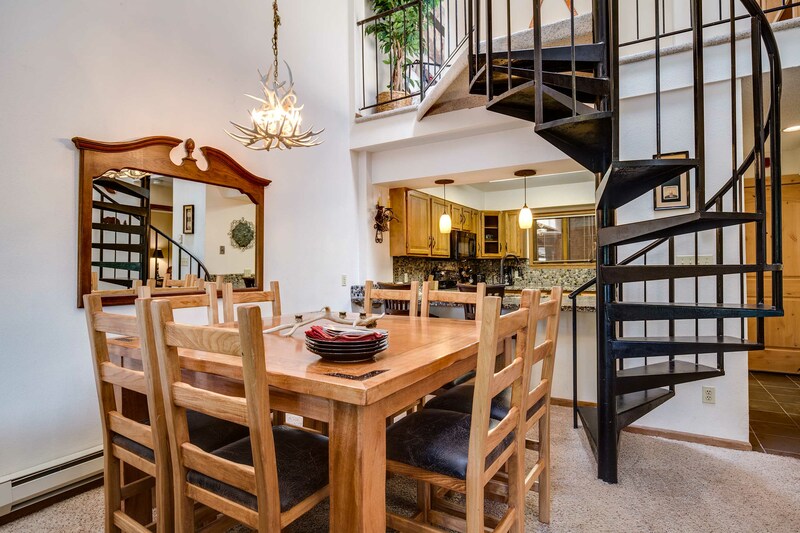 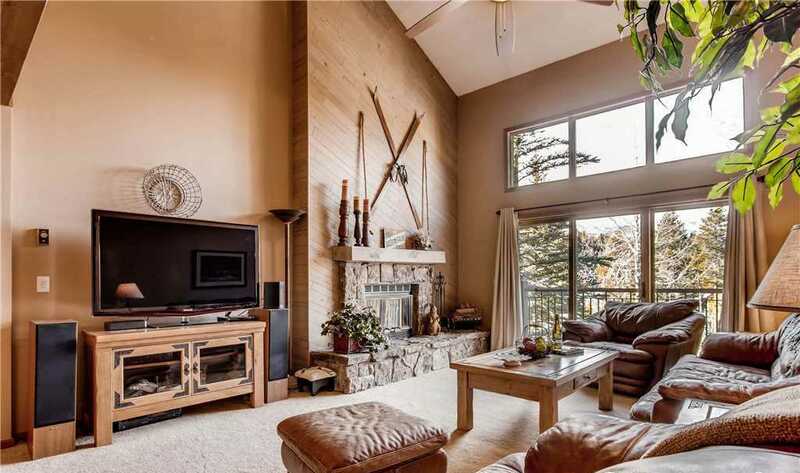 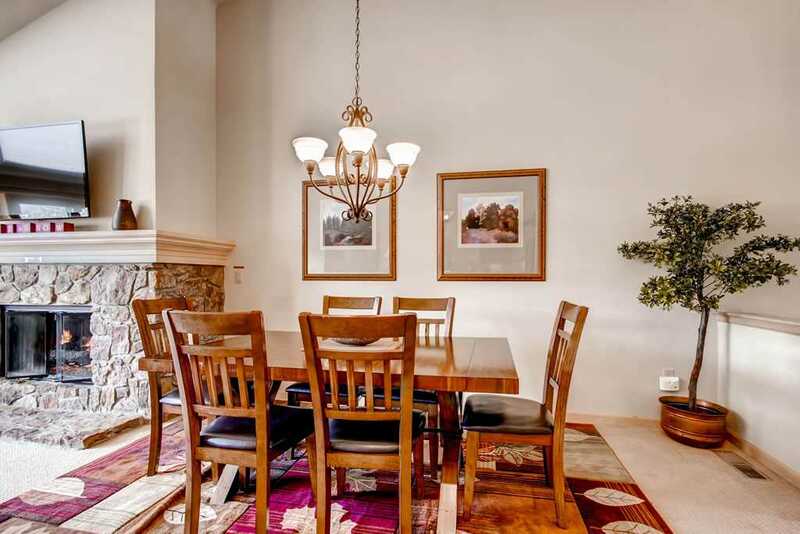 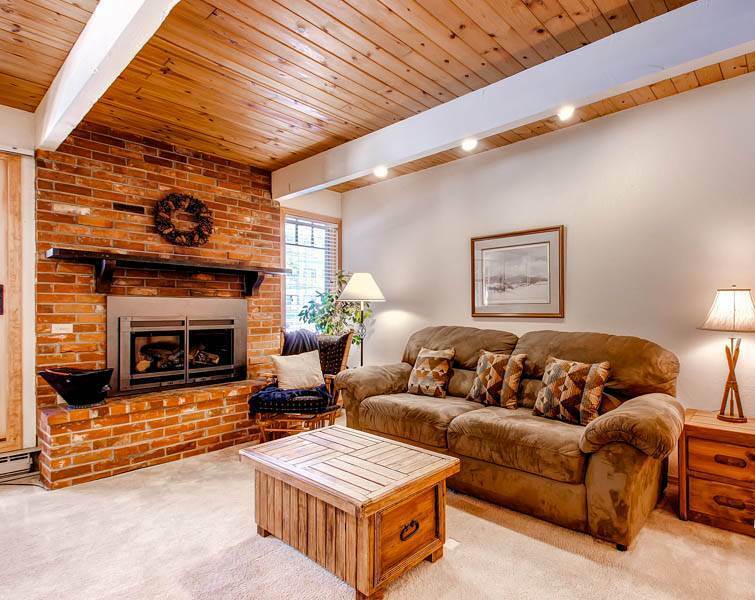 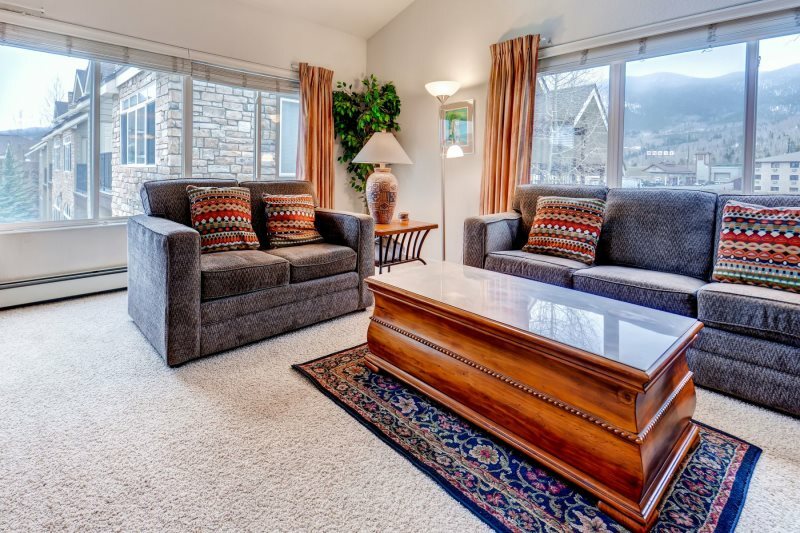 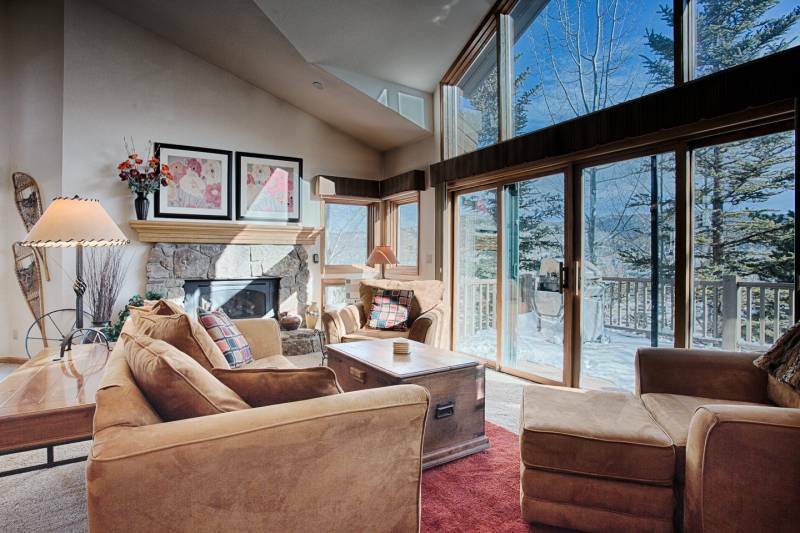 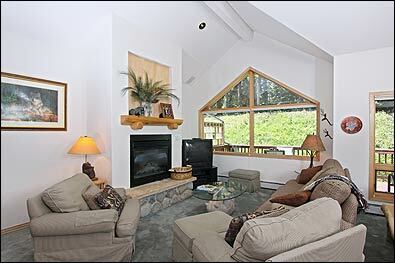 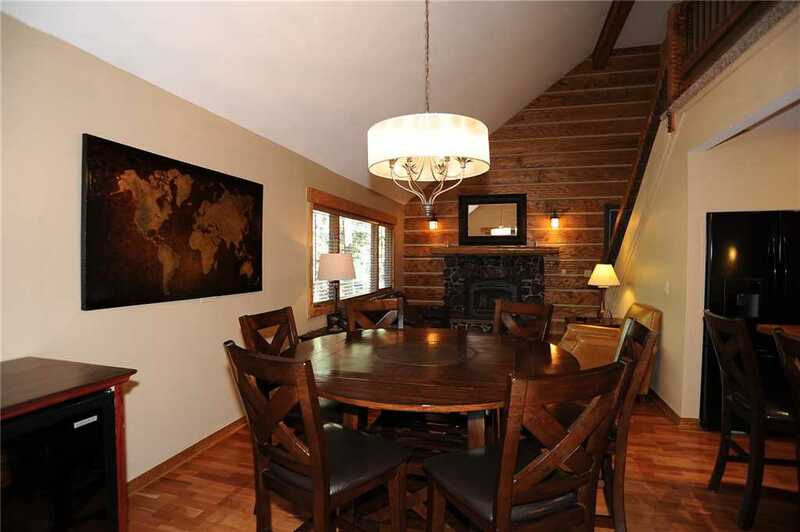 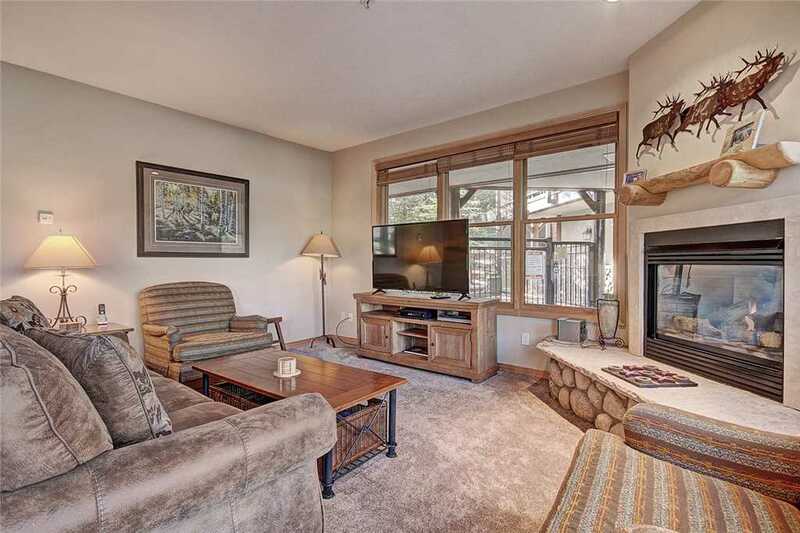 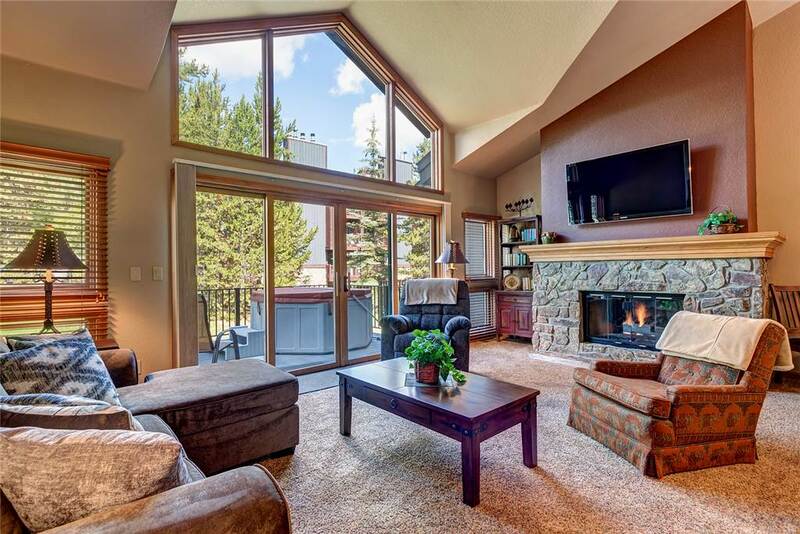 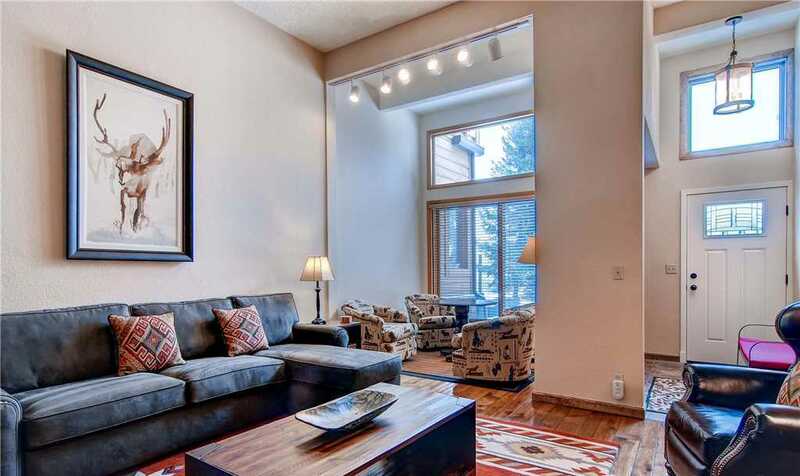 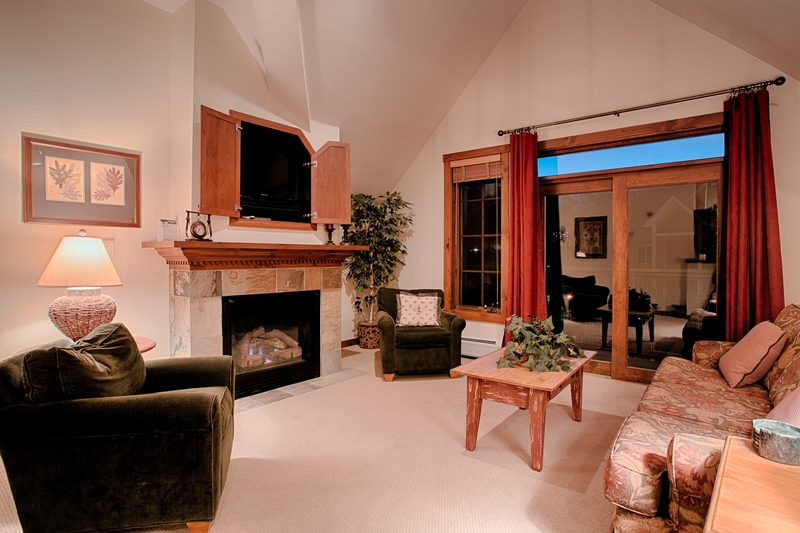 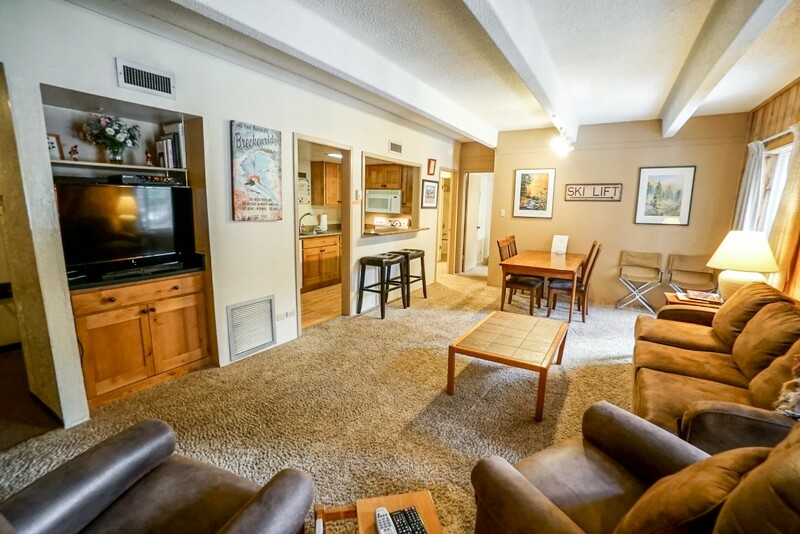 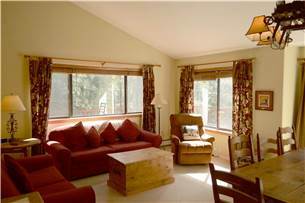 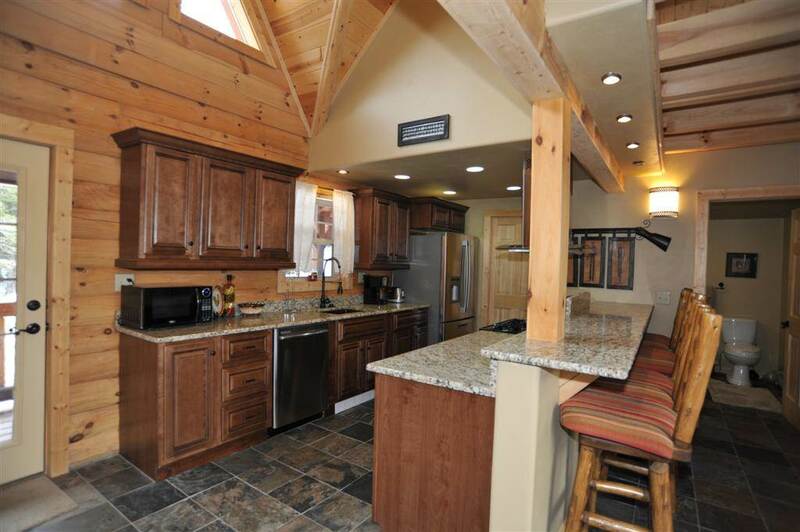 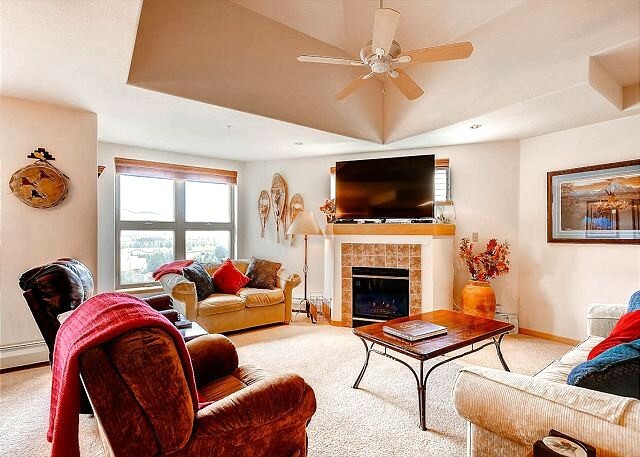 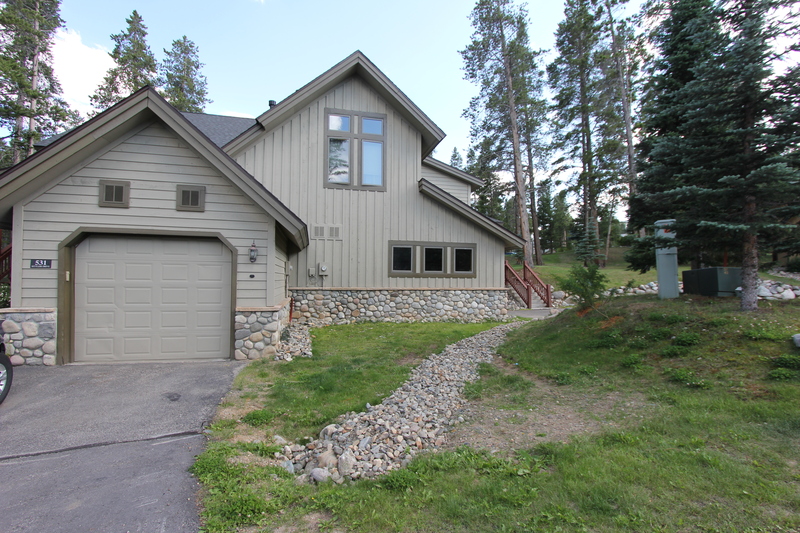 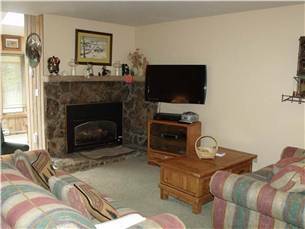 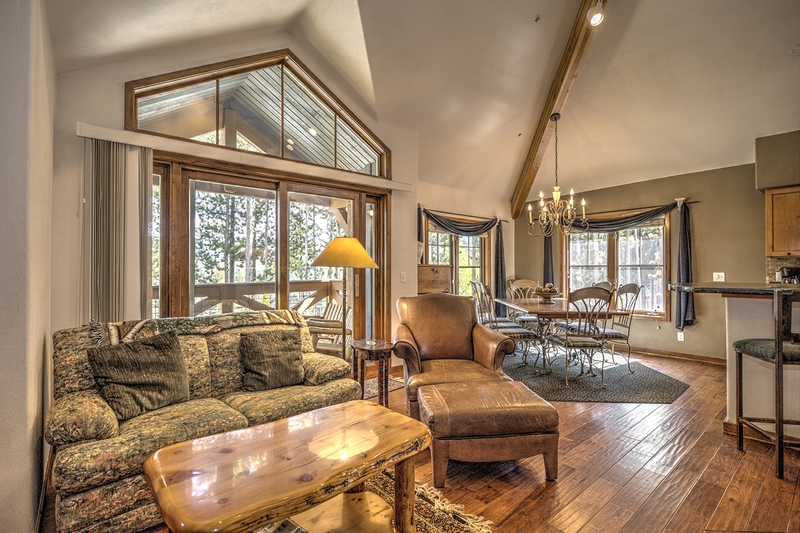 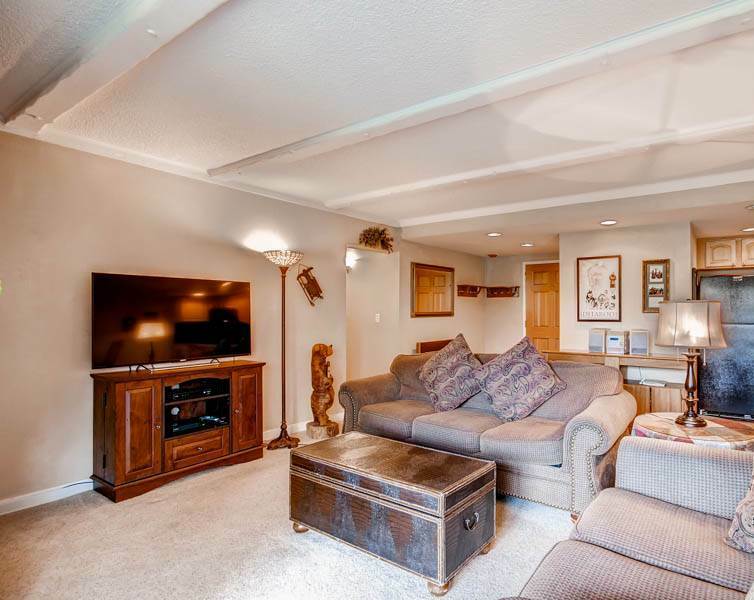 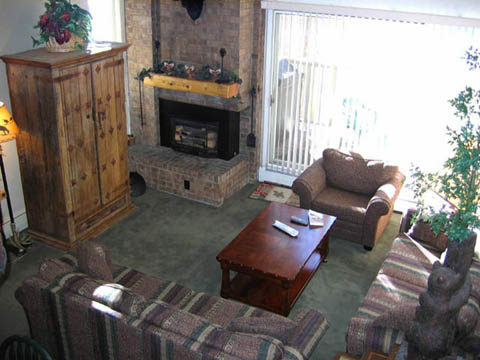 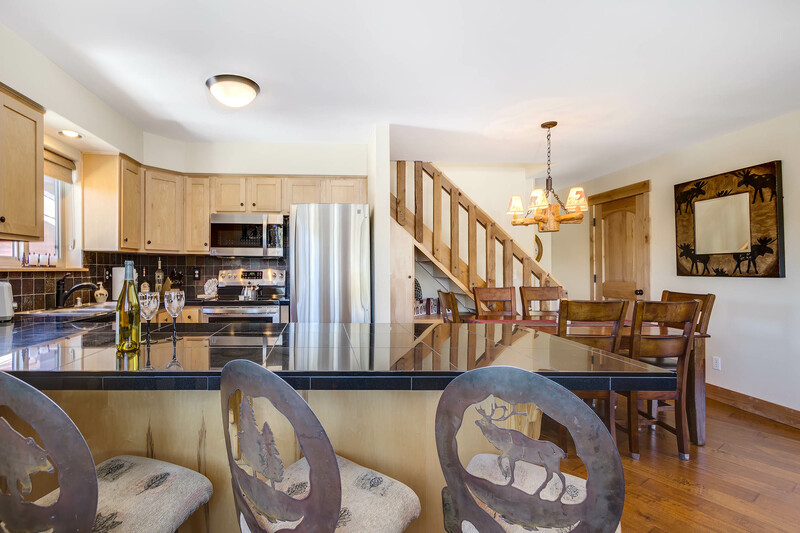 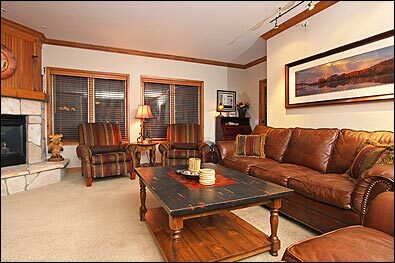 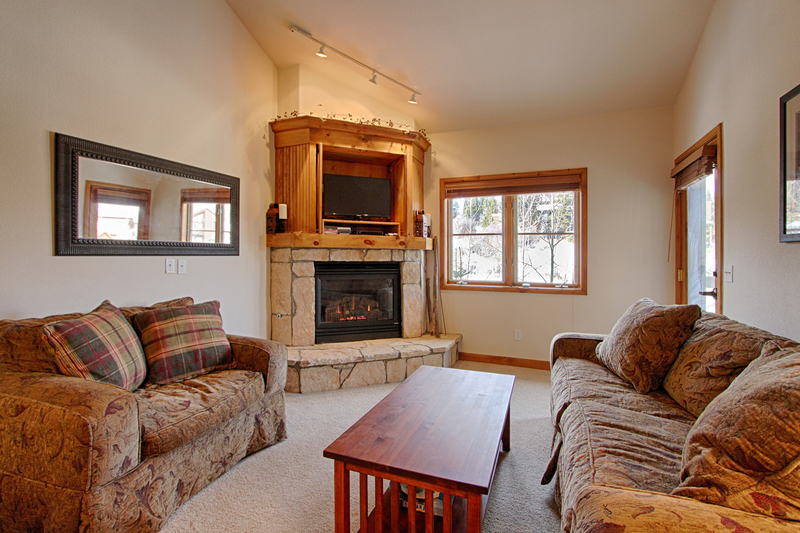 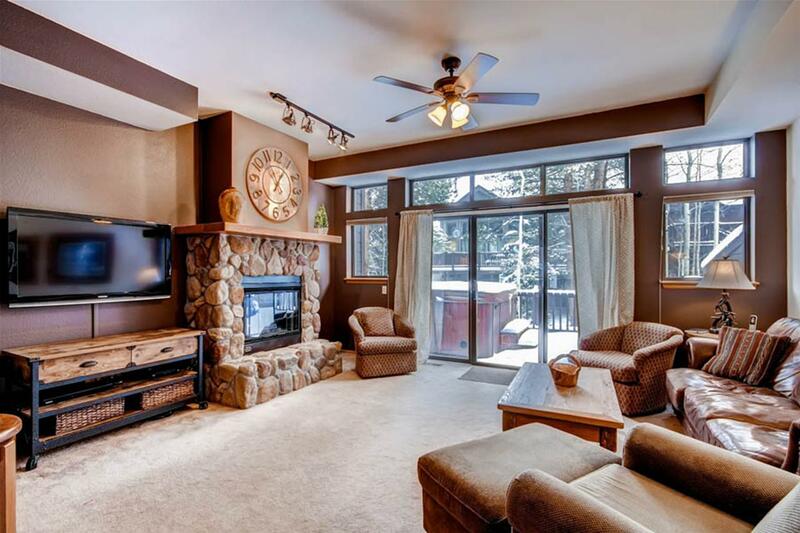 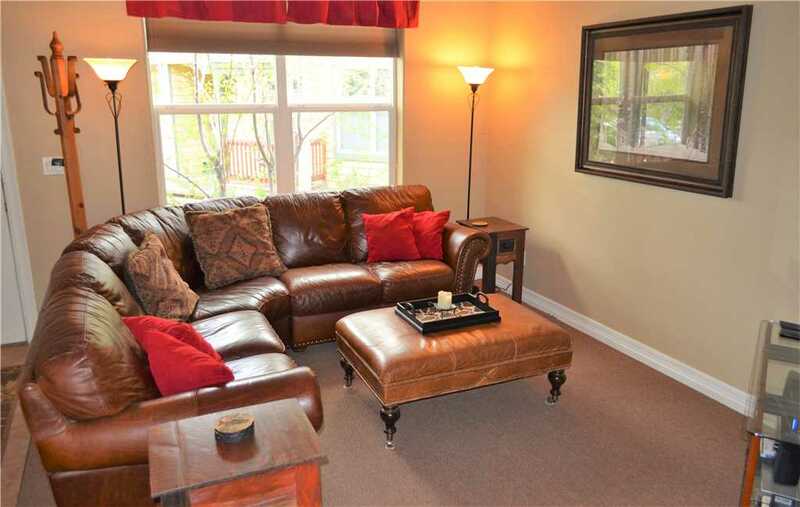 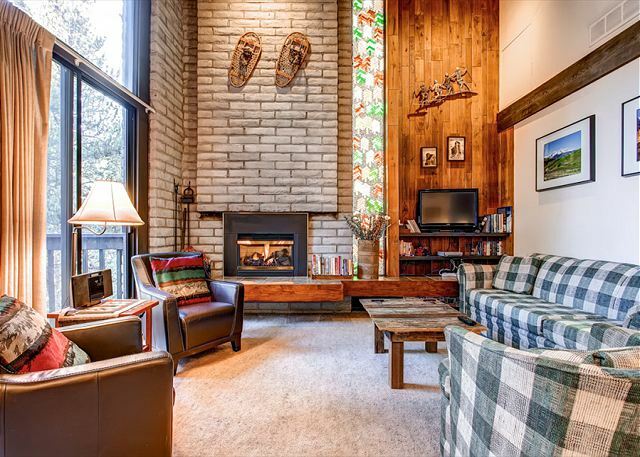 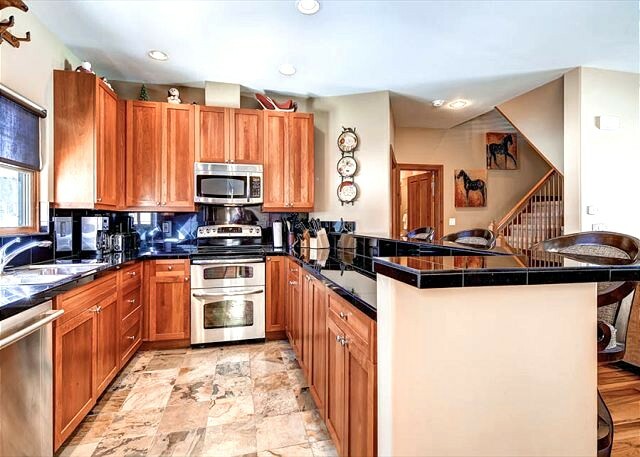 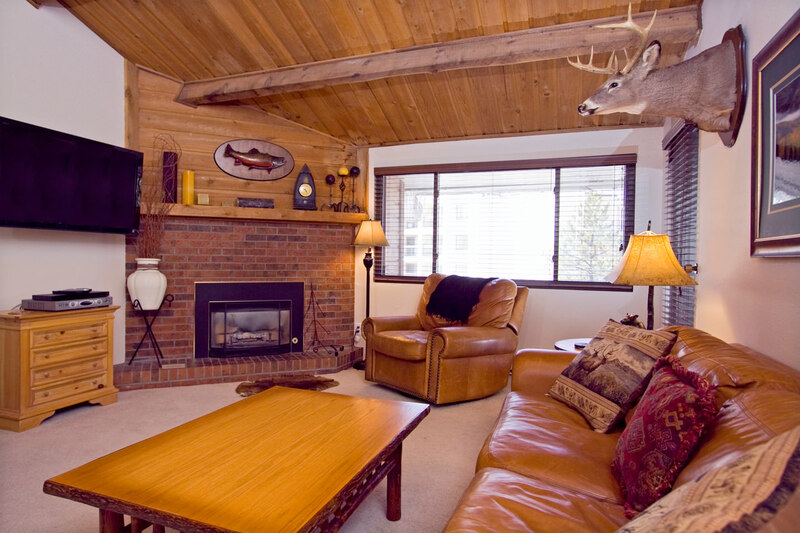 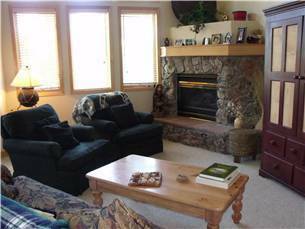 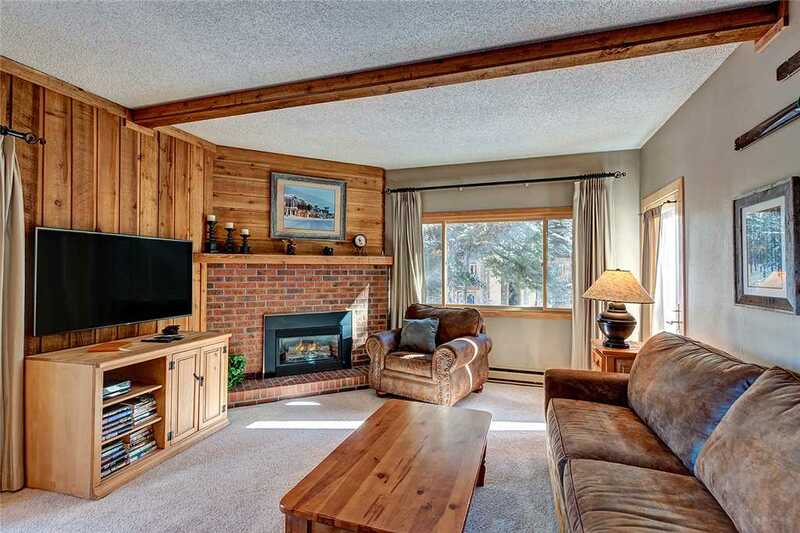 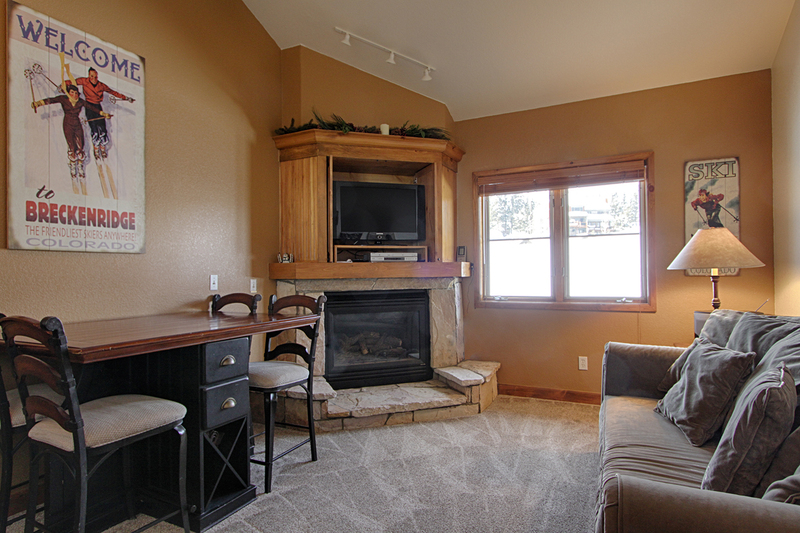 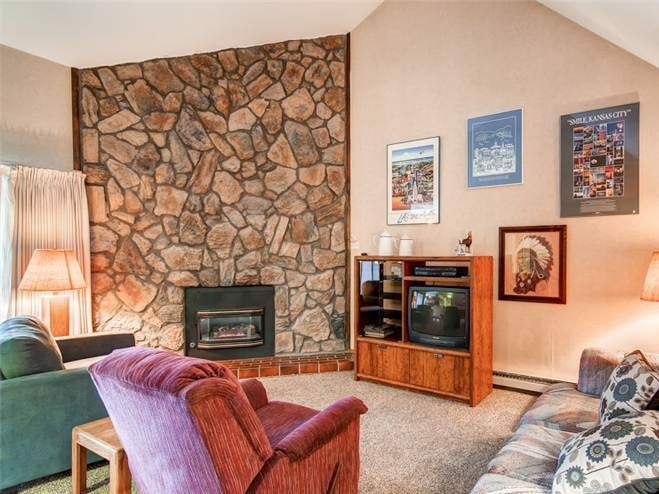 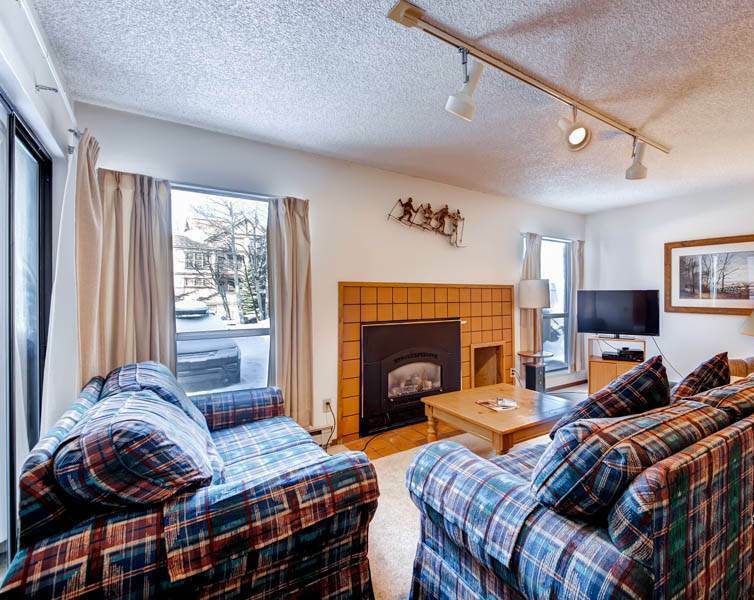 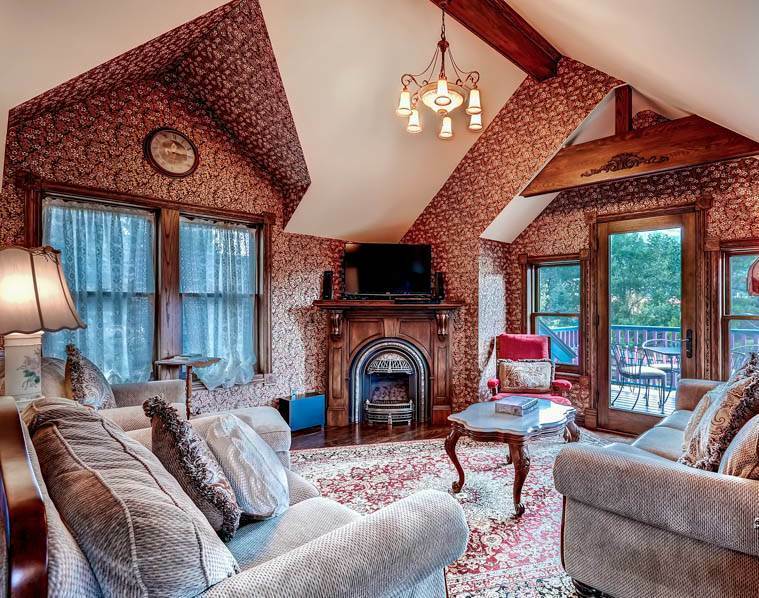 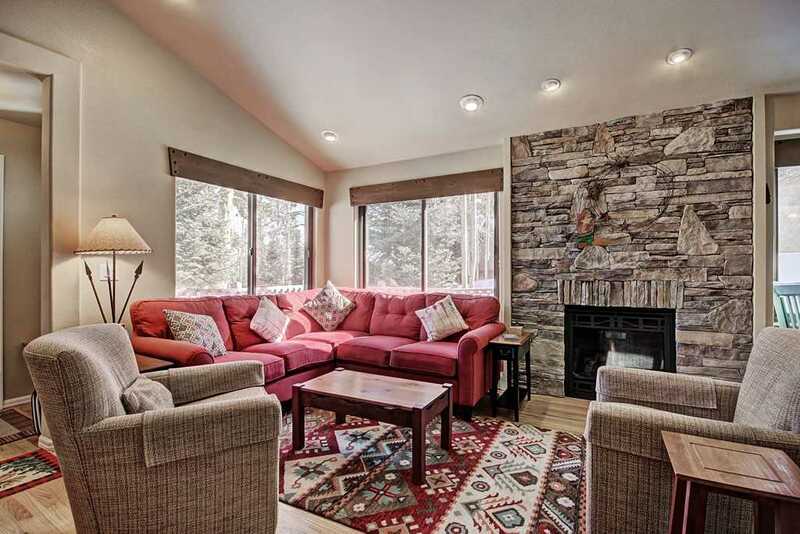 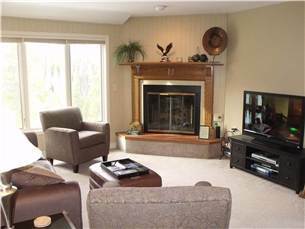 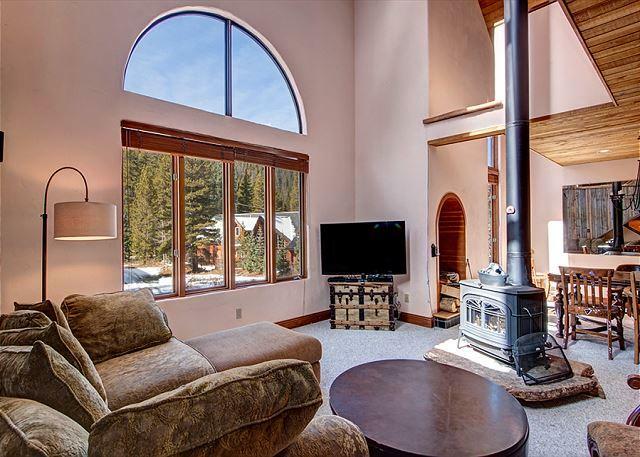 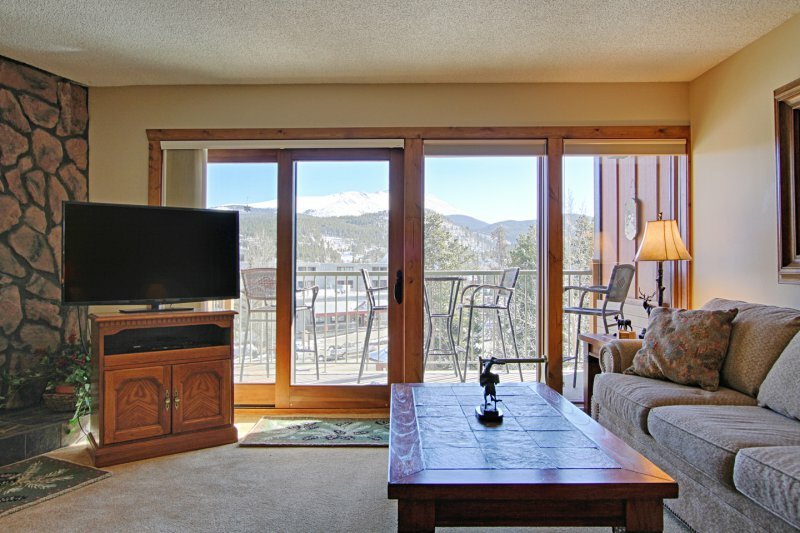 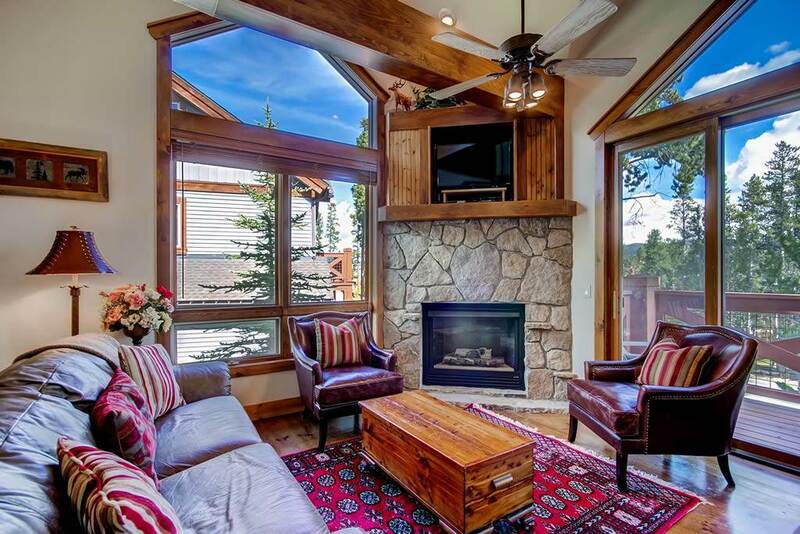 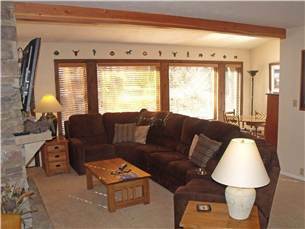 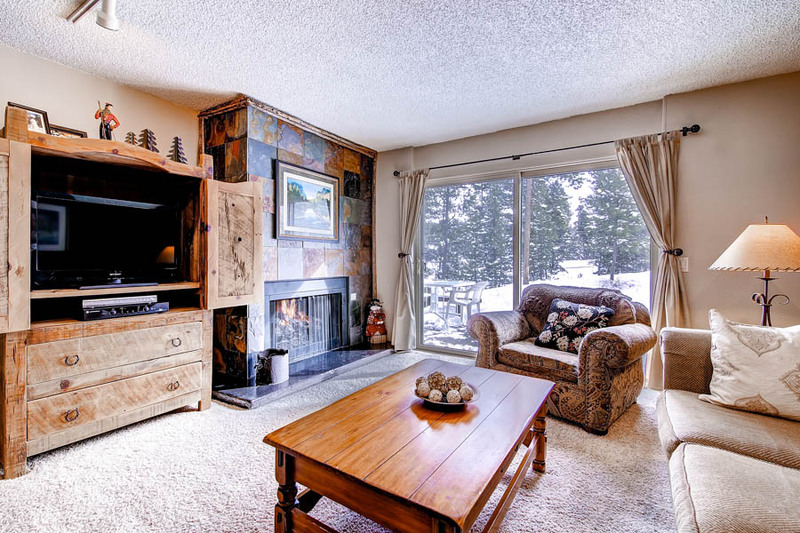 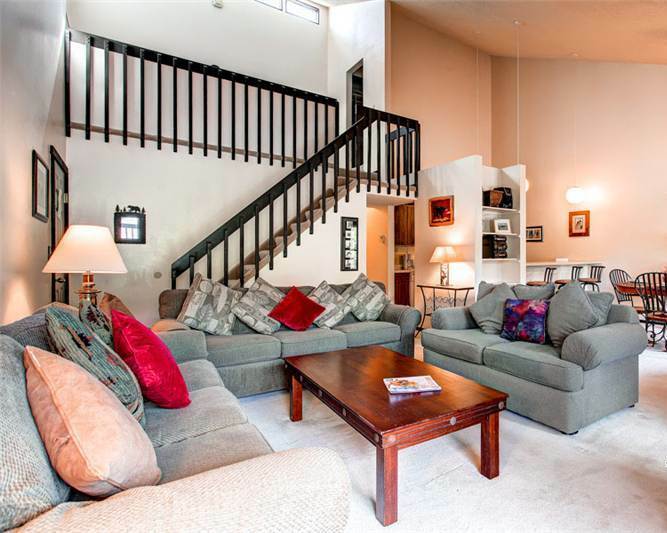 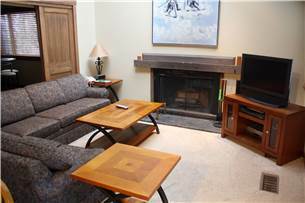 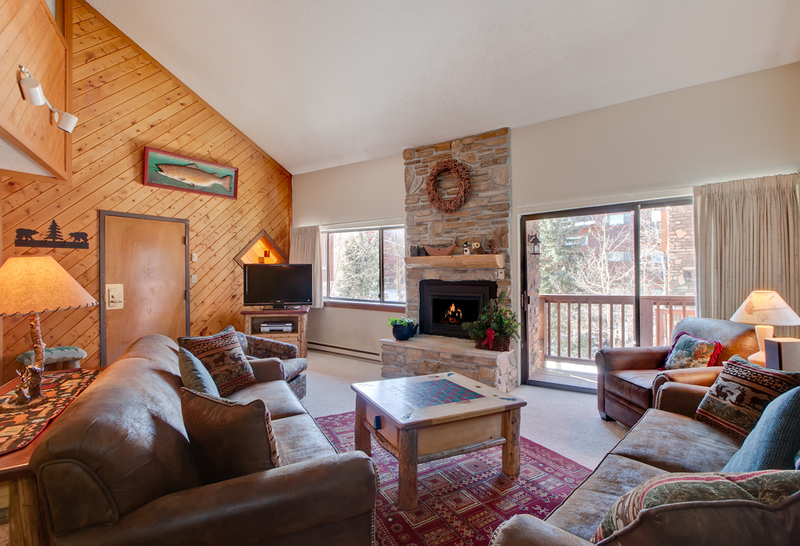 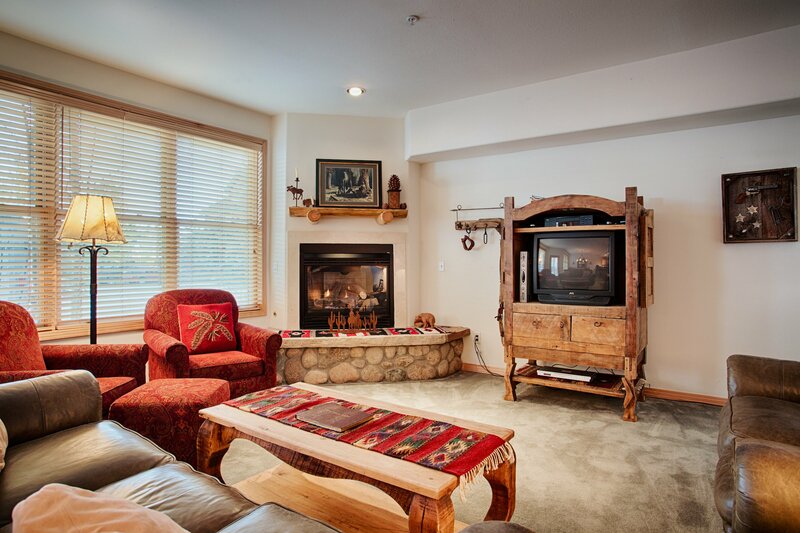 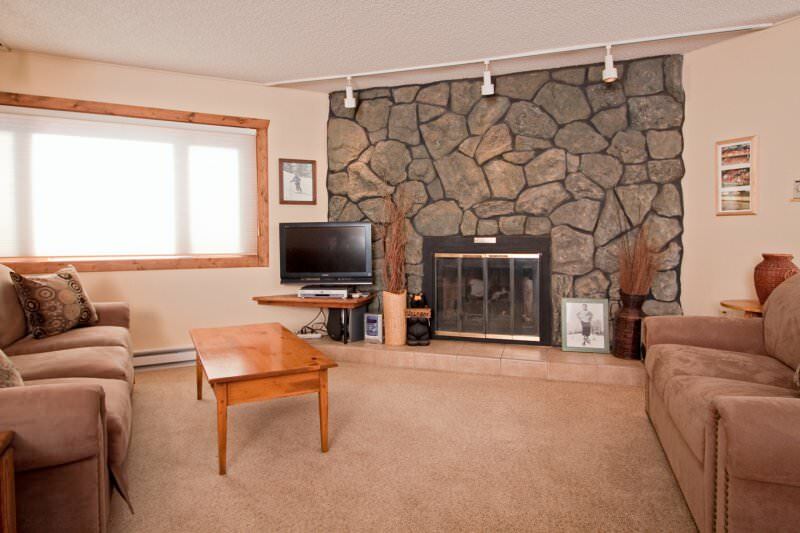 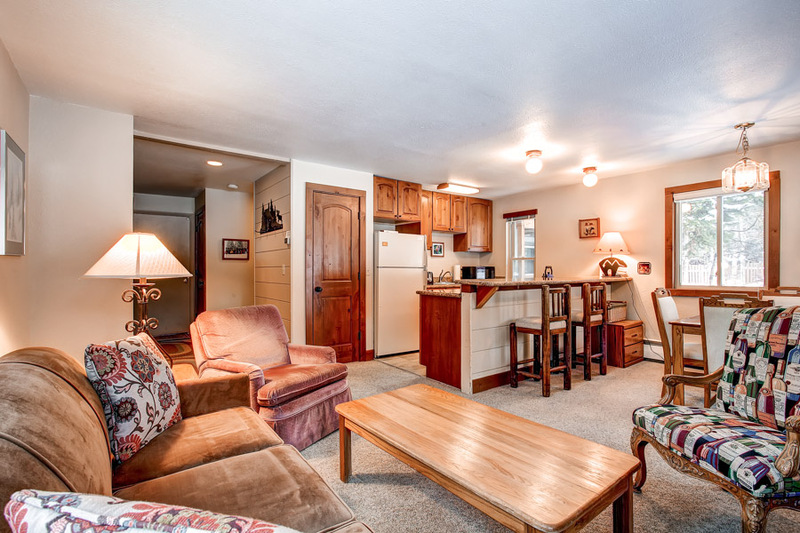 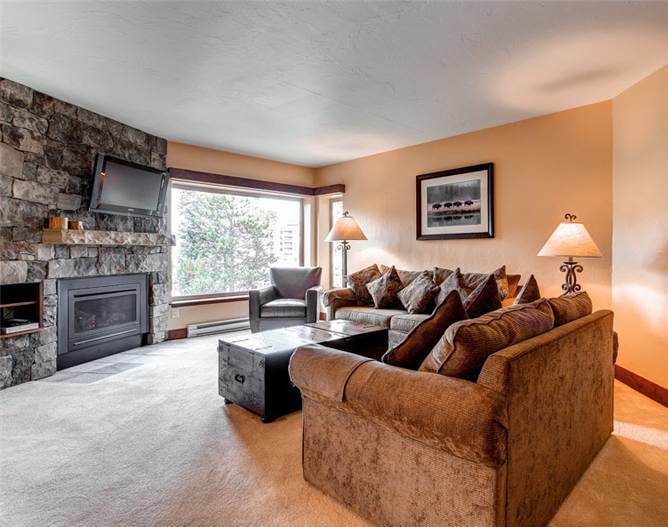 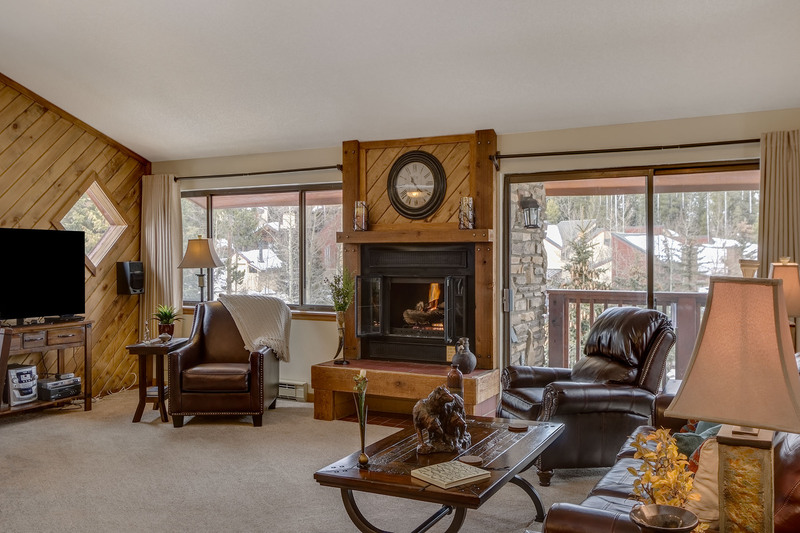 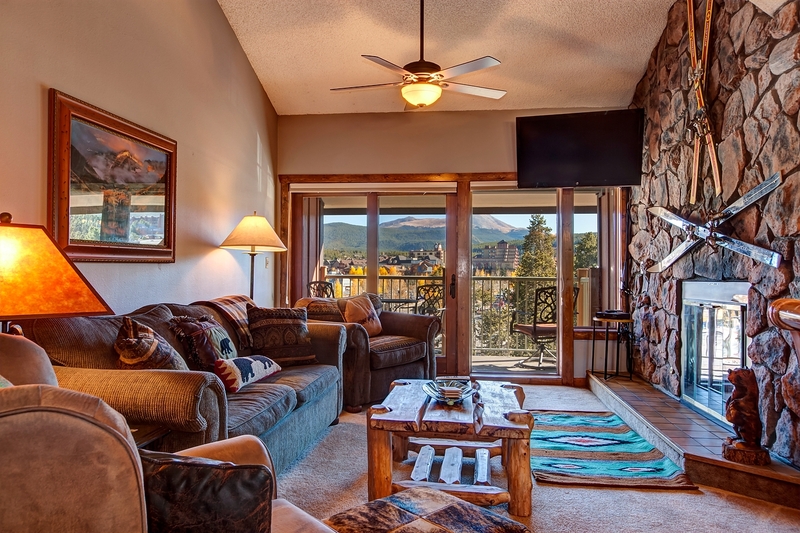 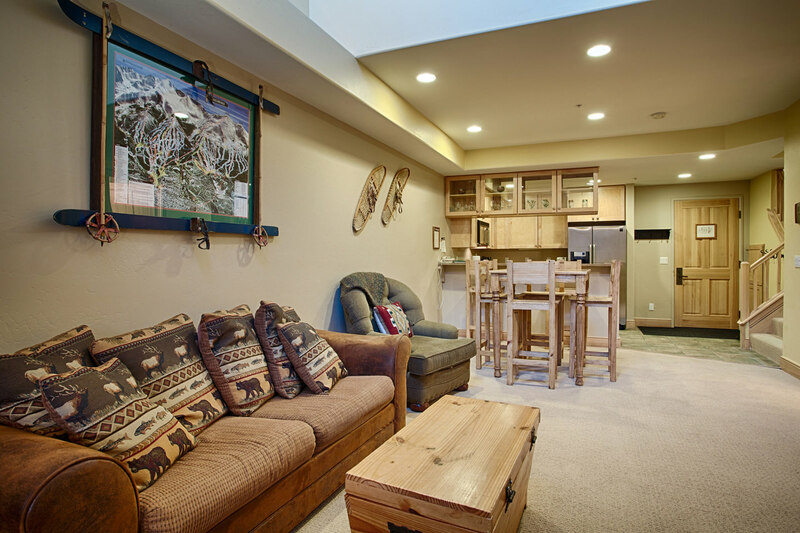 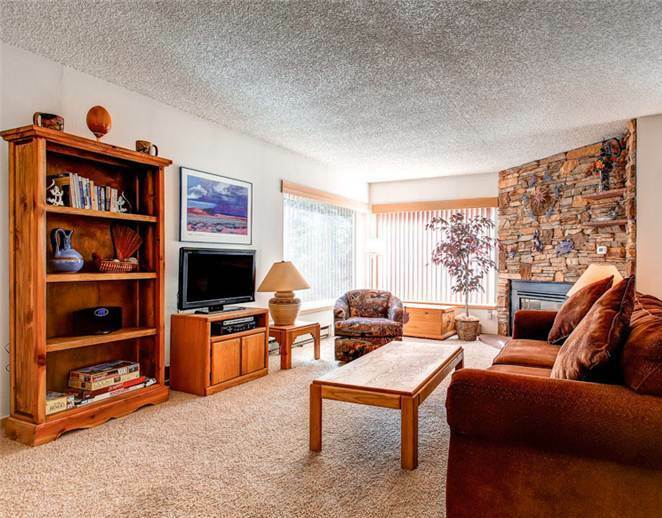 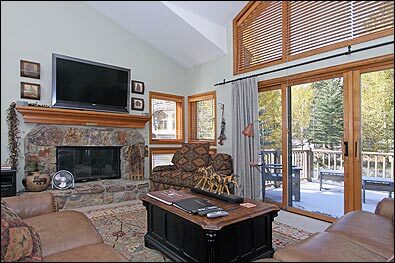 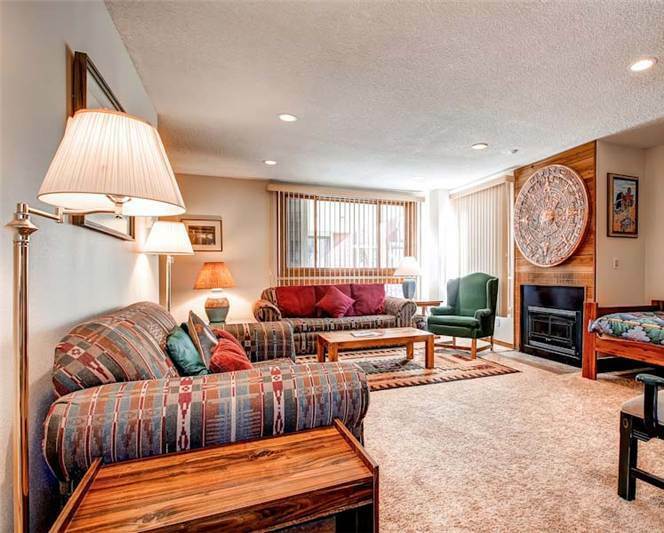 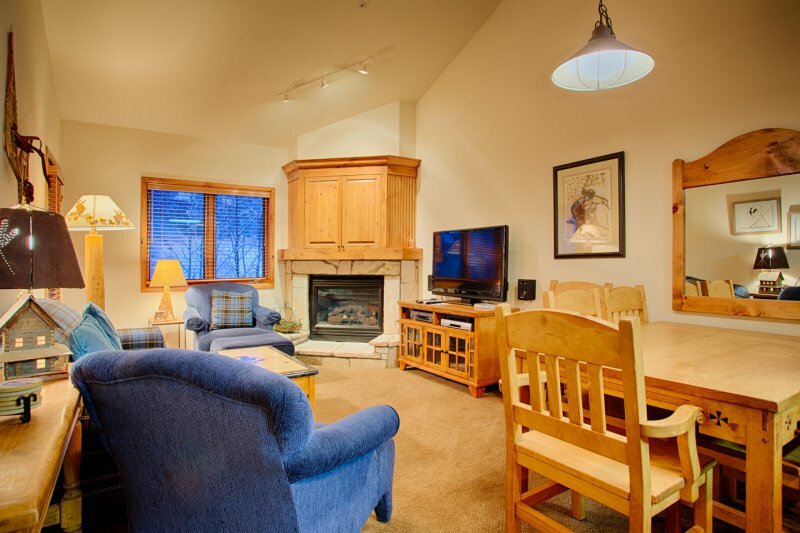 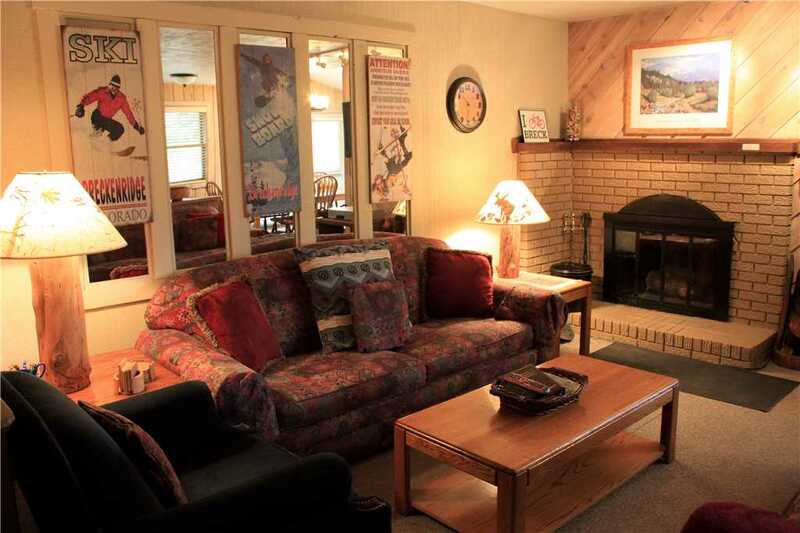 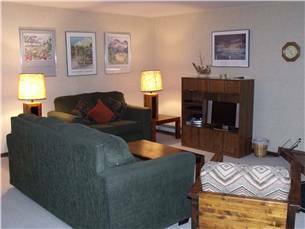 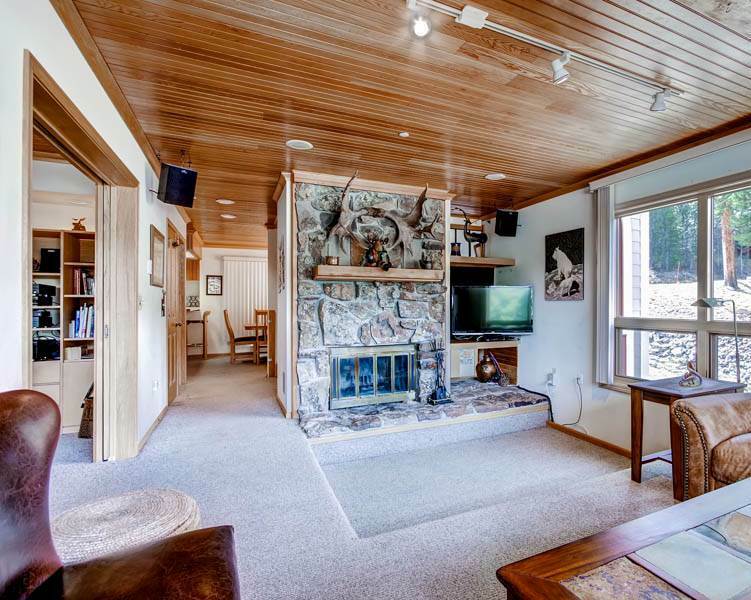 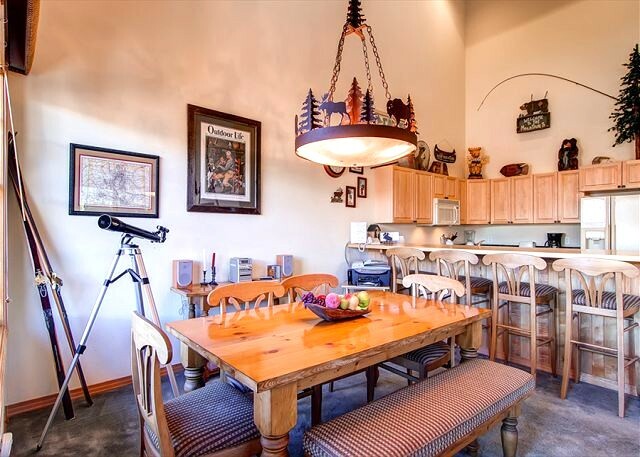 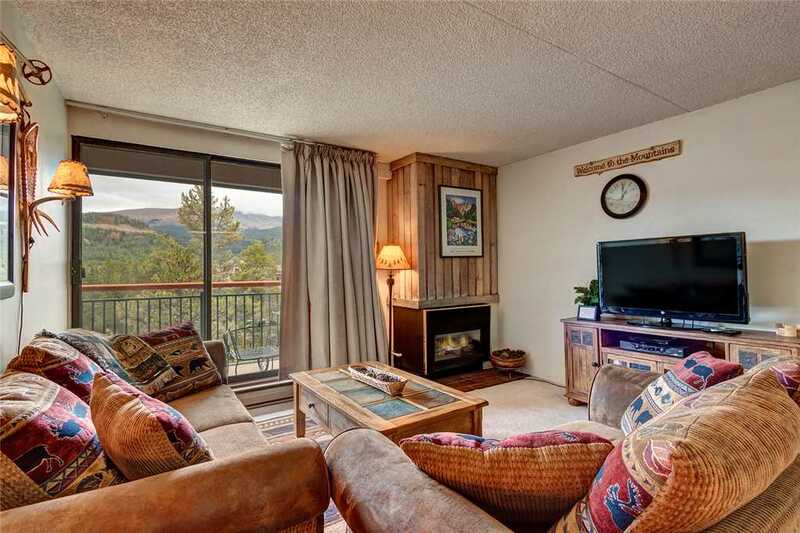 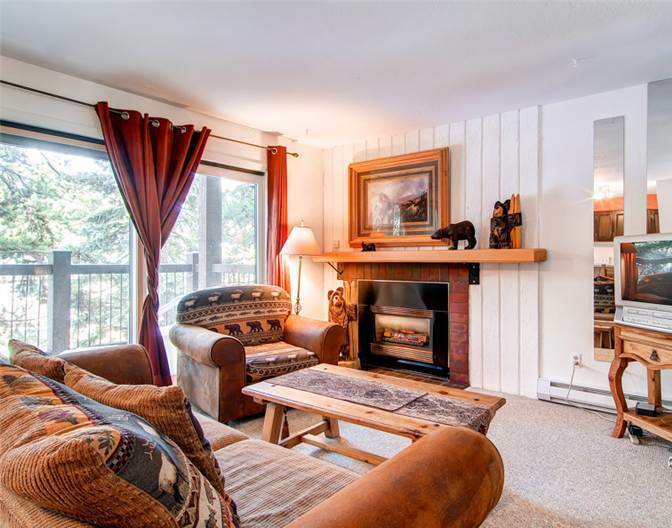 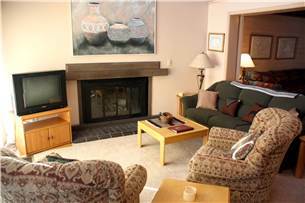 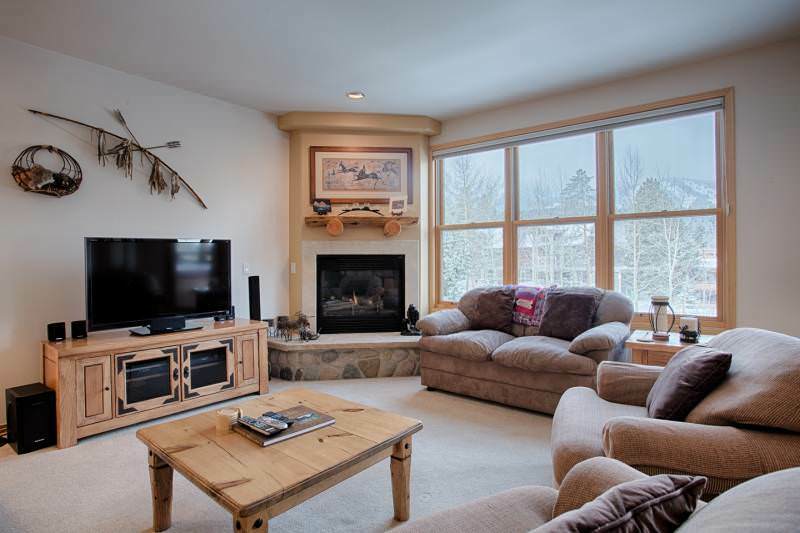 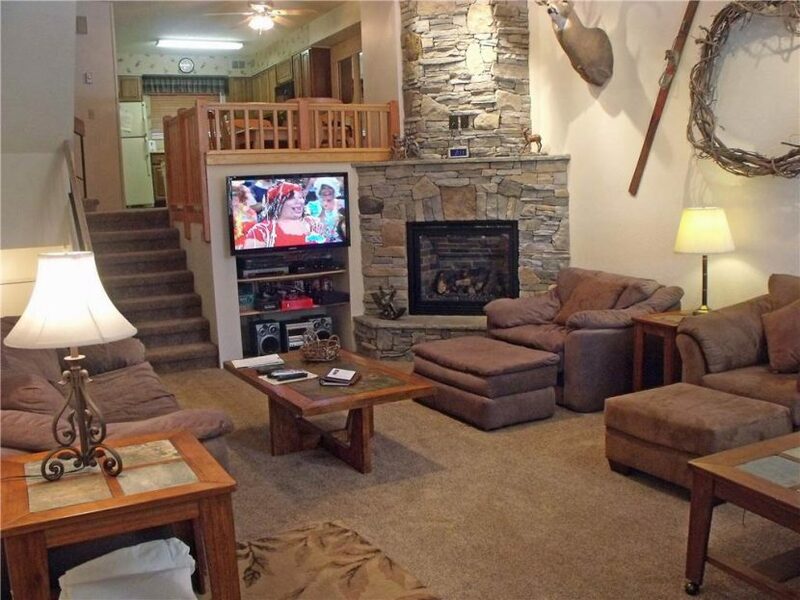 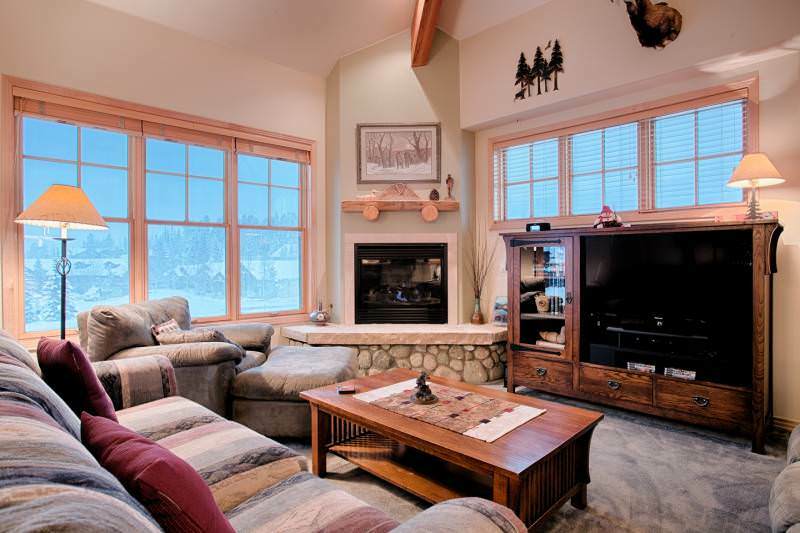 From there, a short stairway leads up to a narrow loft/sunroom with views of Breckenridge’s Peak 10 slopes. 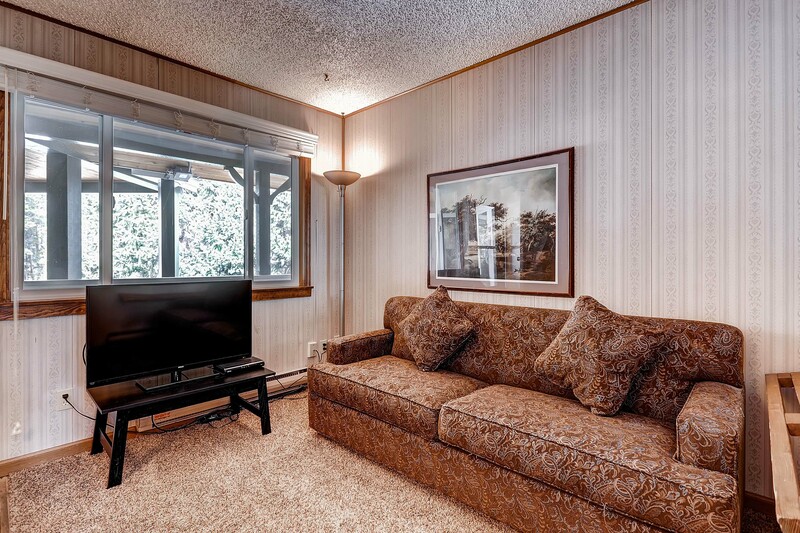 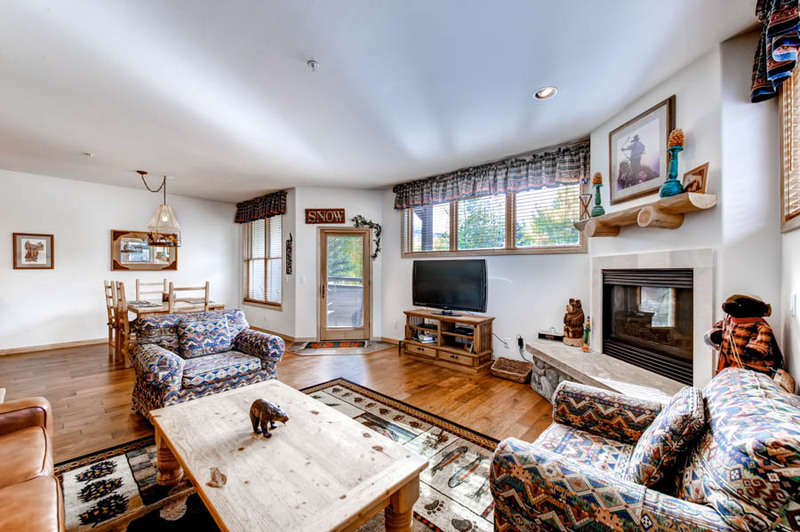 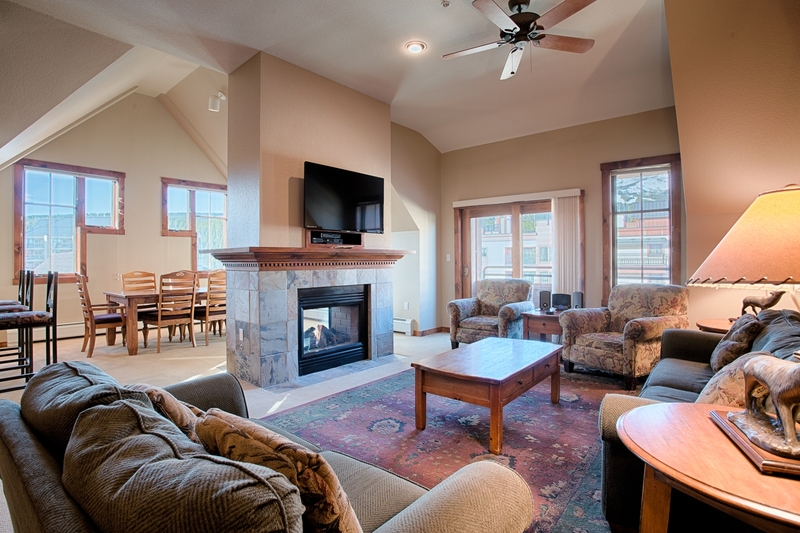 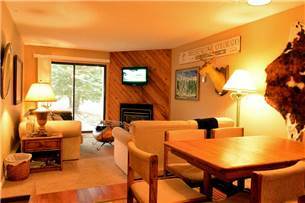 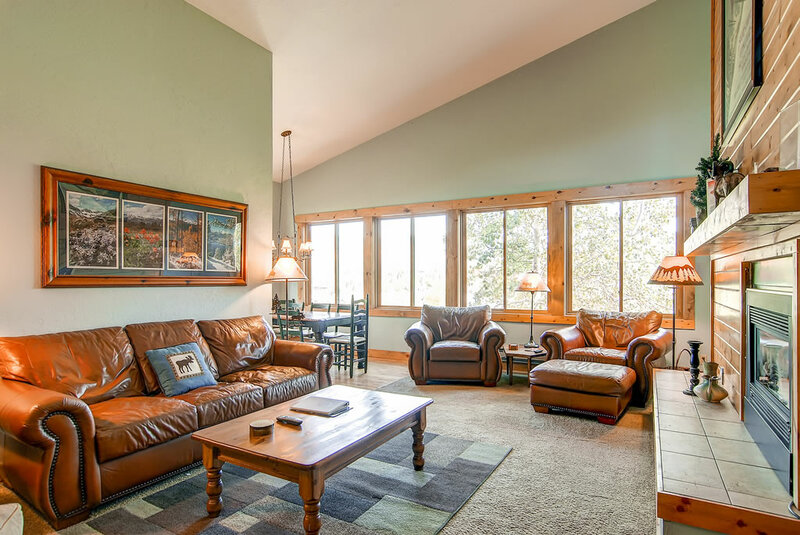 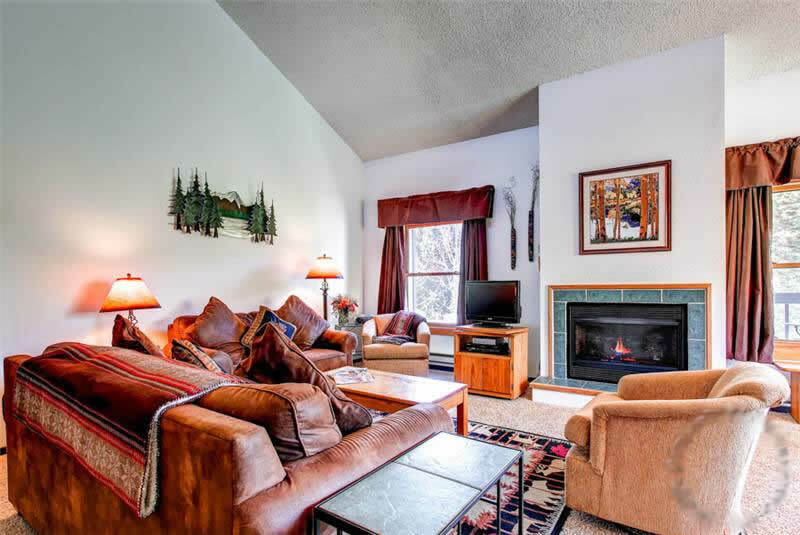 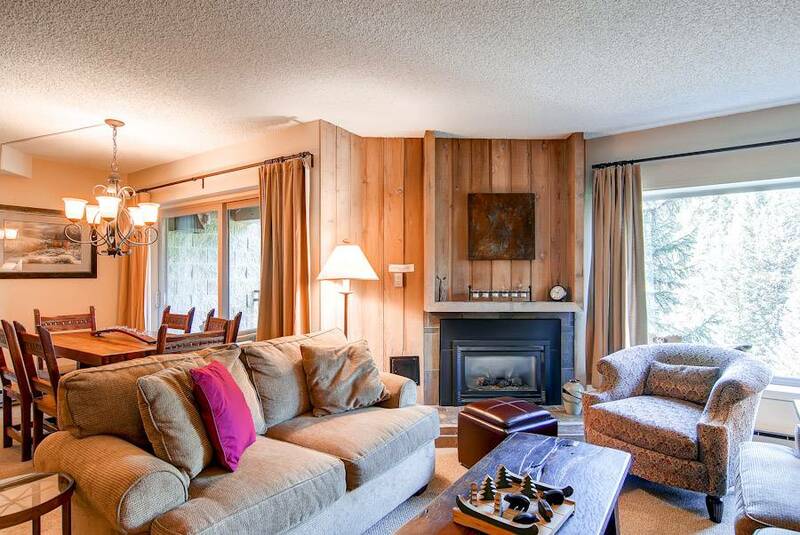 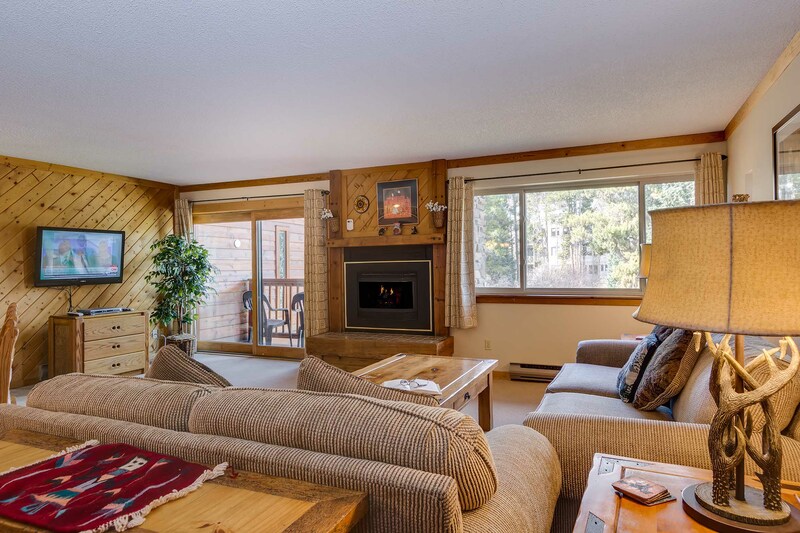 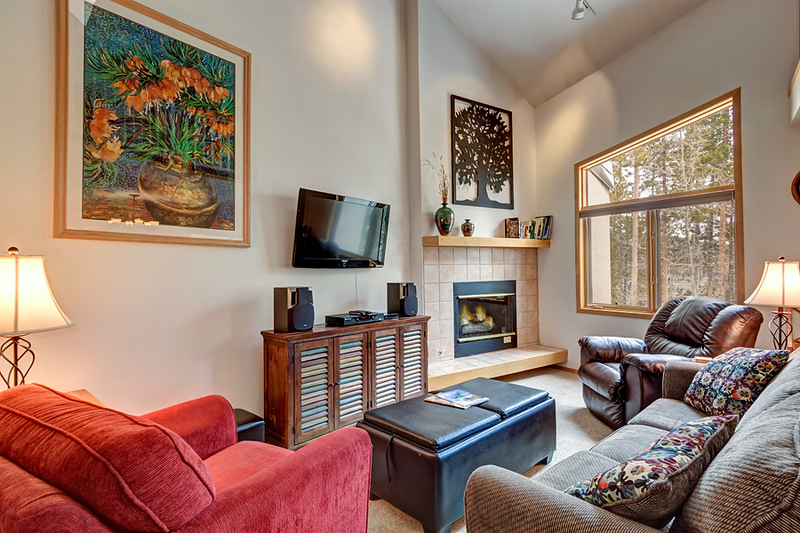 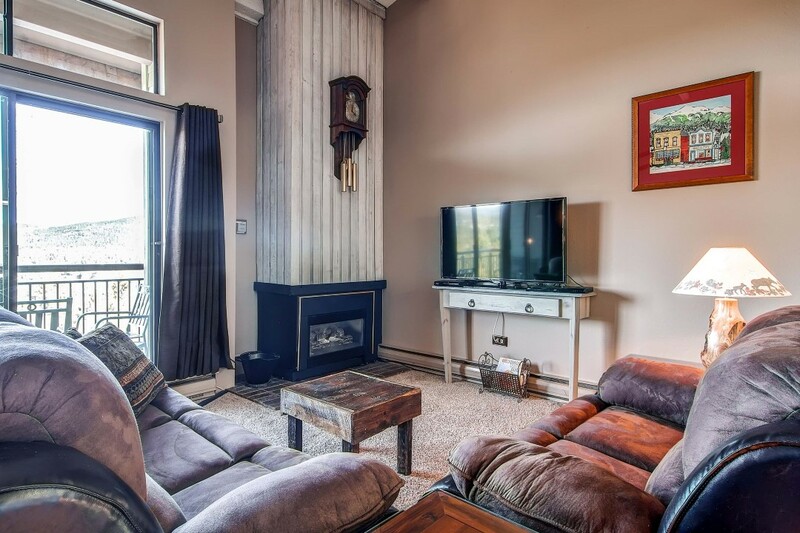 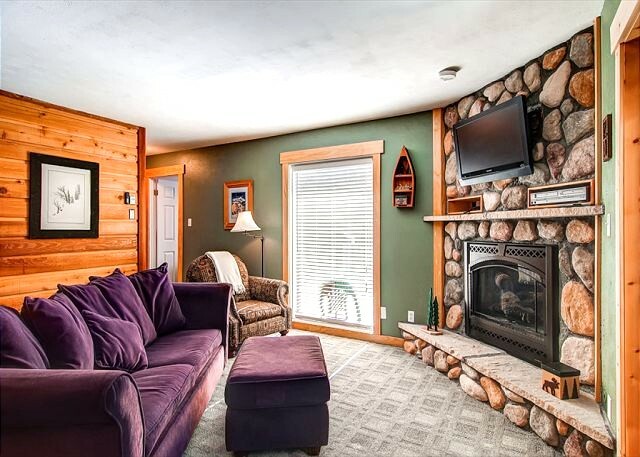 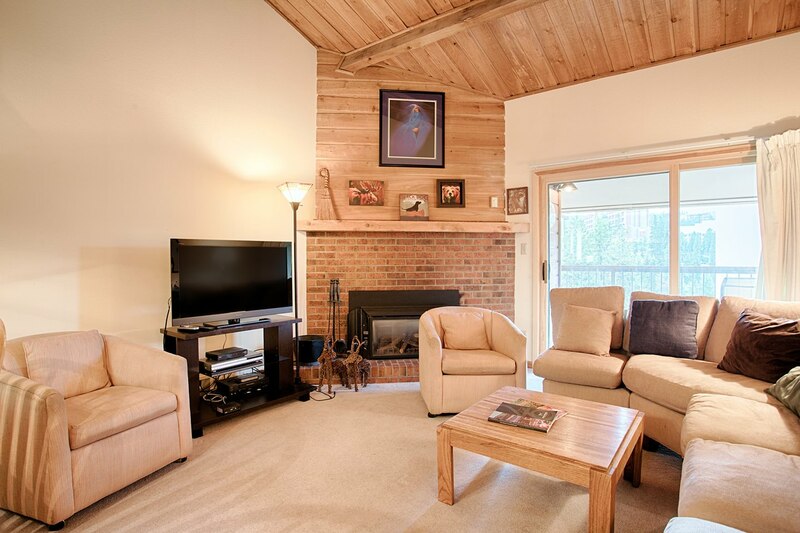 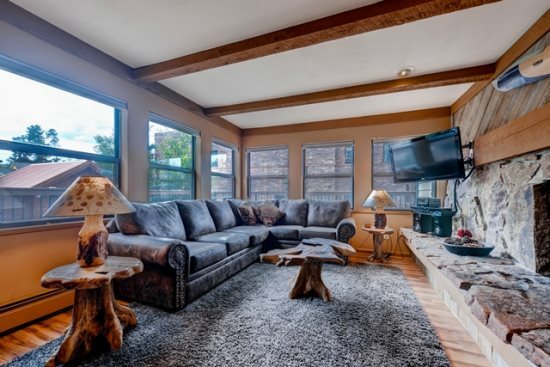 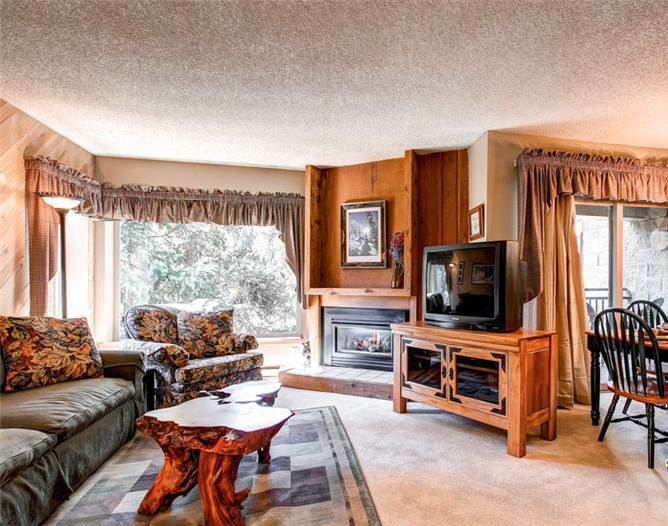 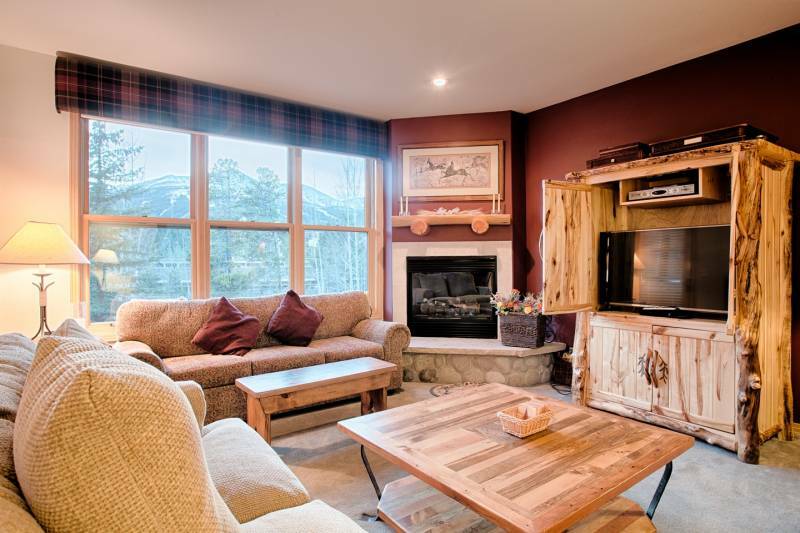 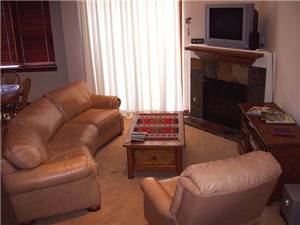 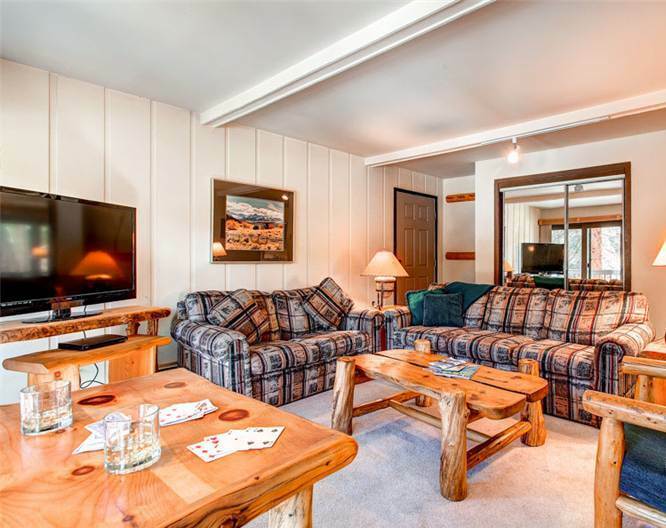 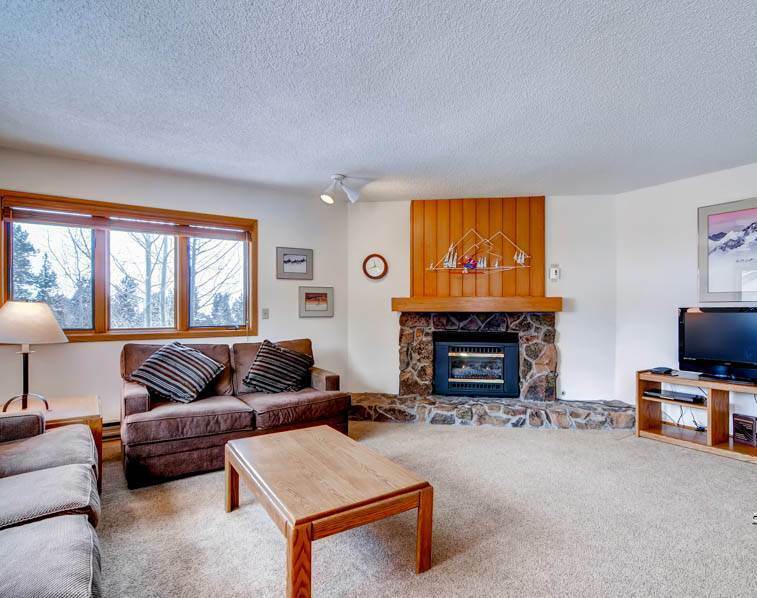 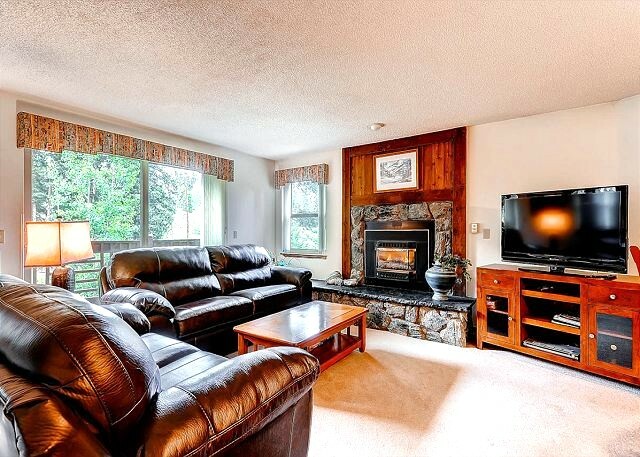 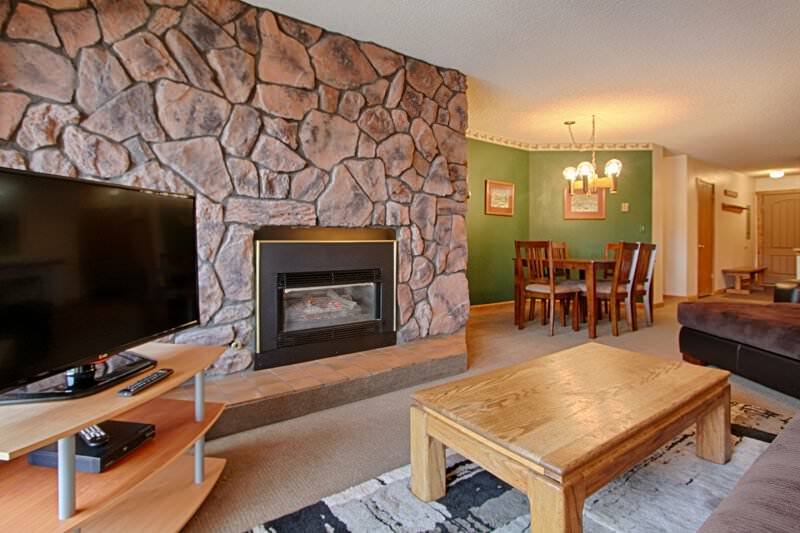 The main level is a bright, open gathering area for the whole gang with luxurious leather seating, a large marble gas fireplace, a 52-inch LCD TV/ DVD and stereo system, and large windows to let the forest light in. 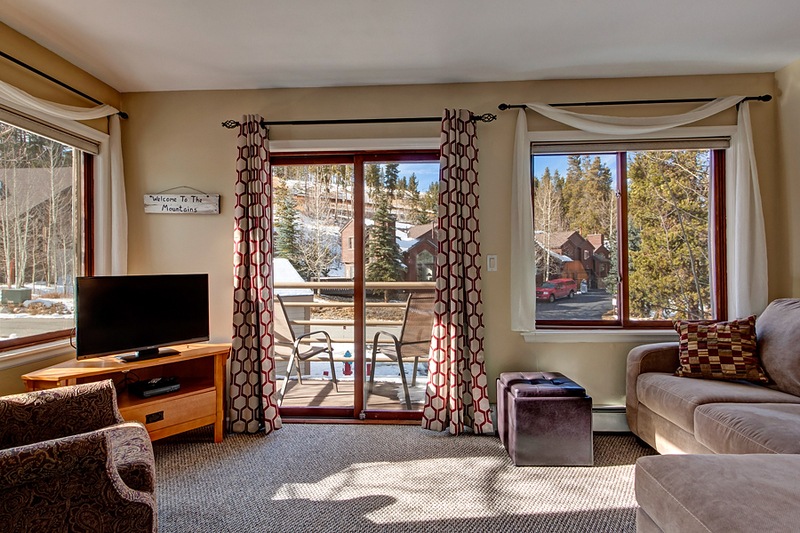 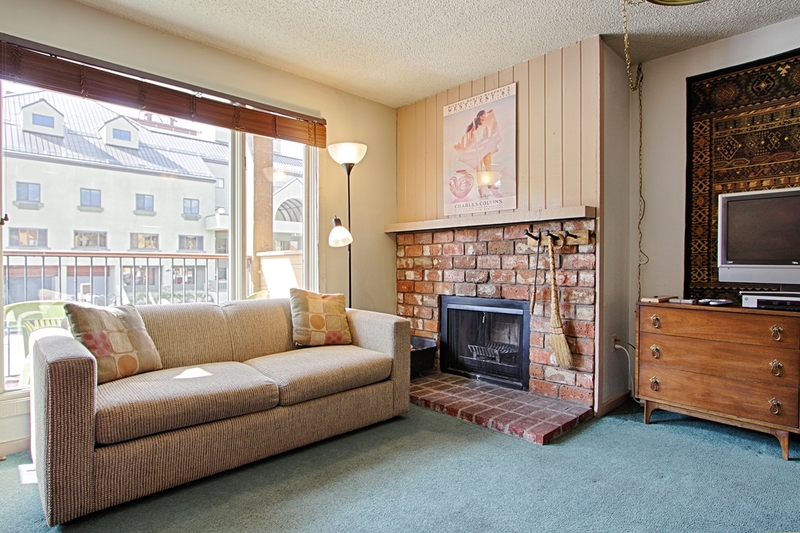 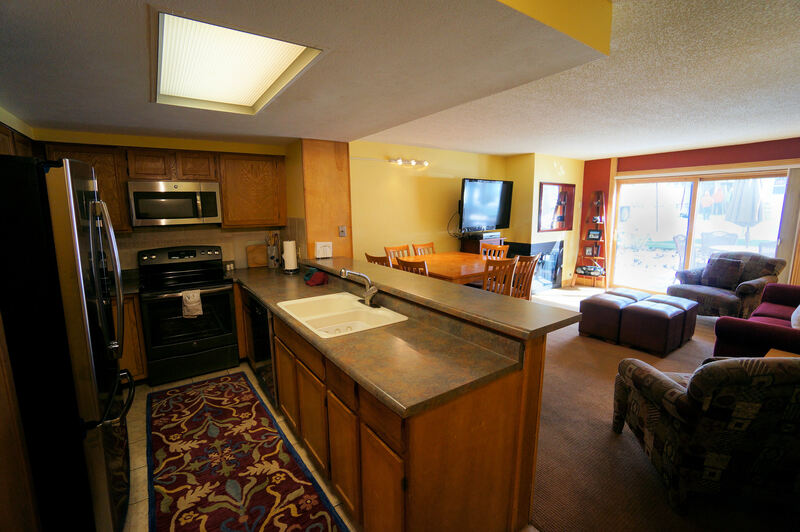 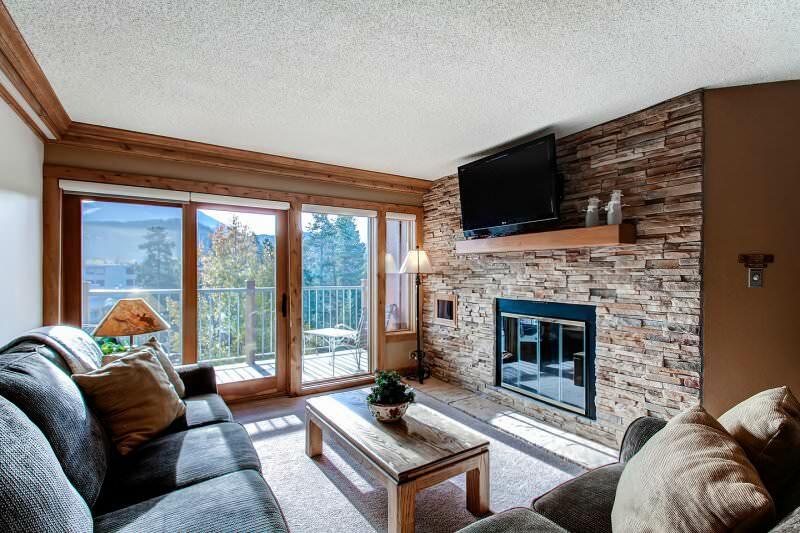 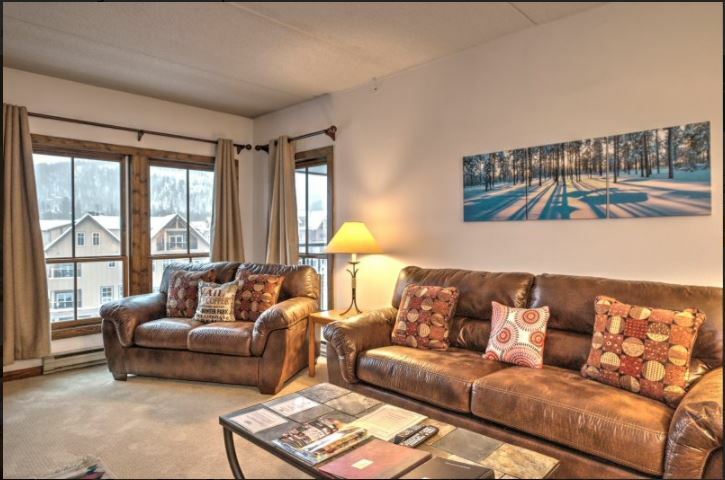 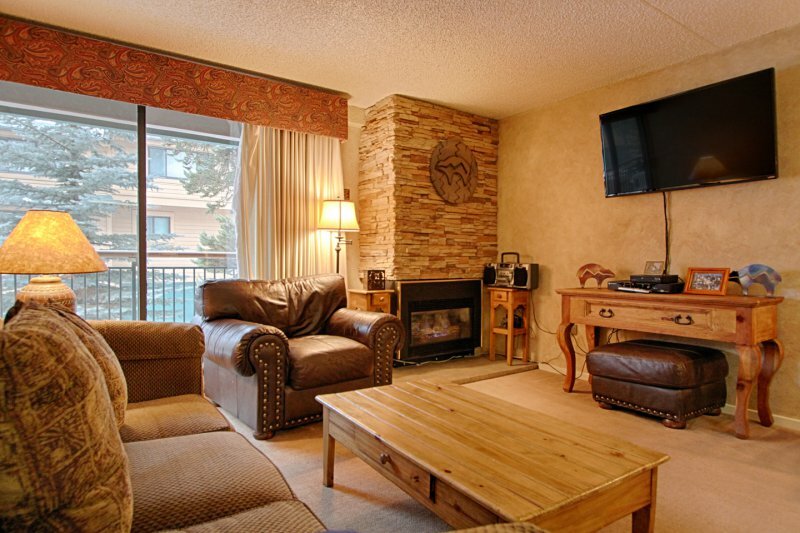 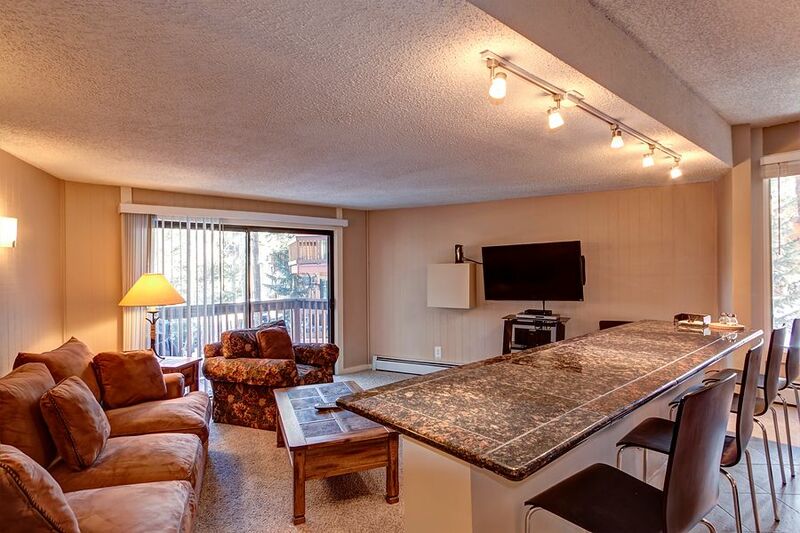 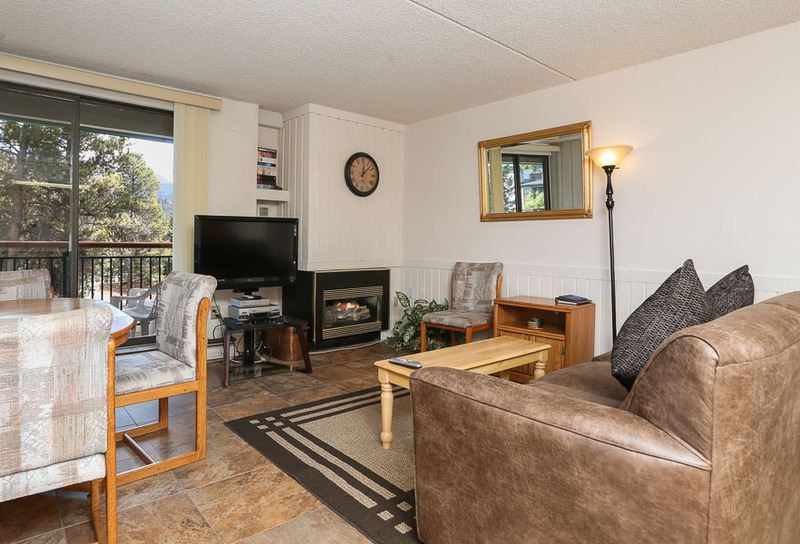 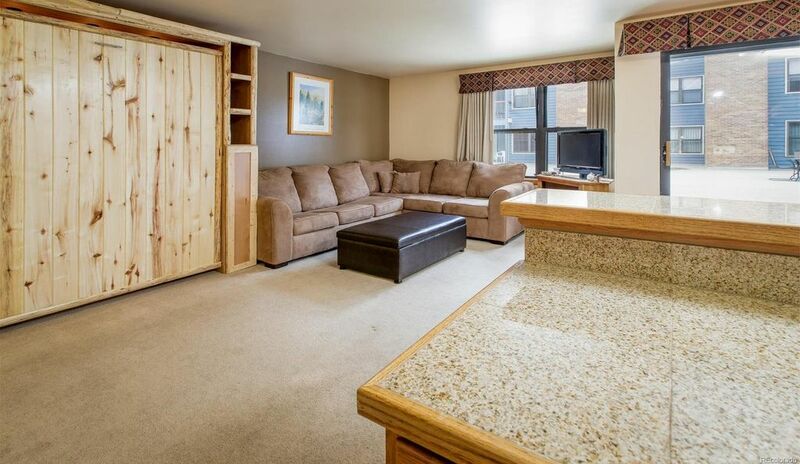 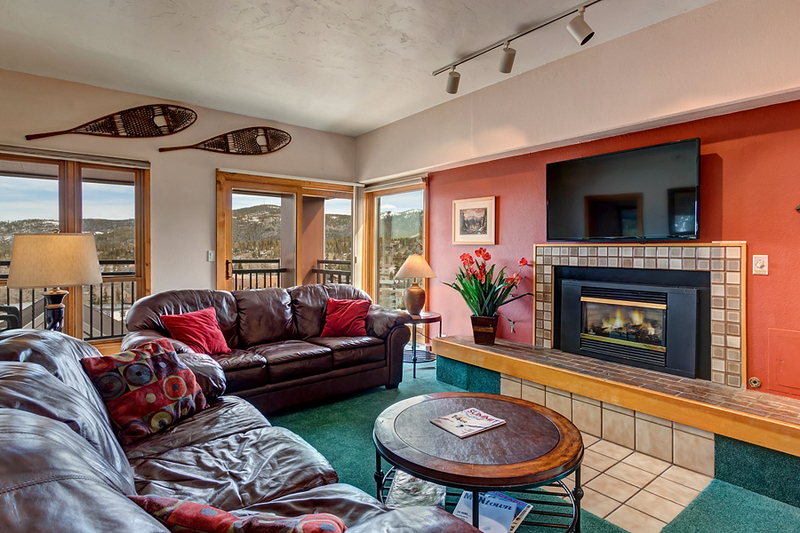 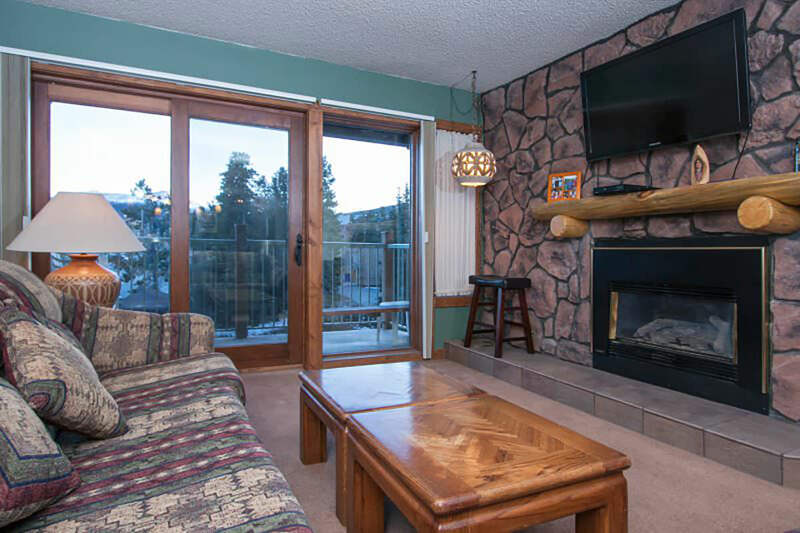 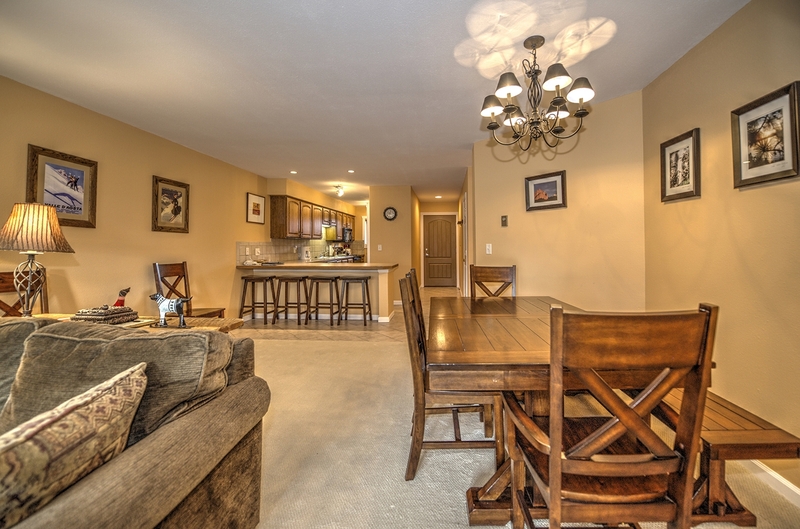 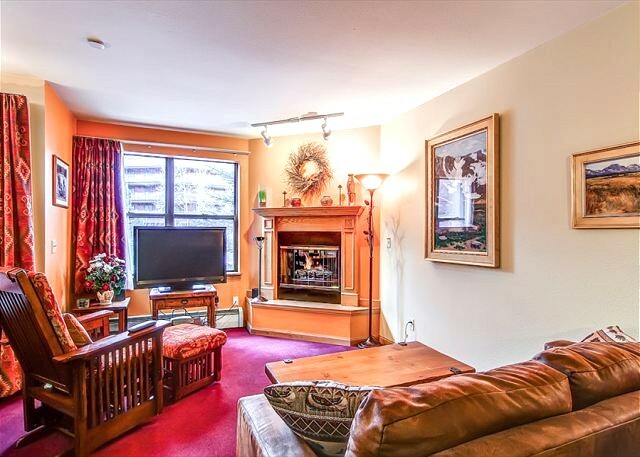 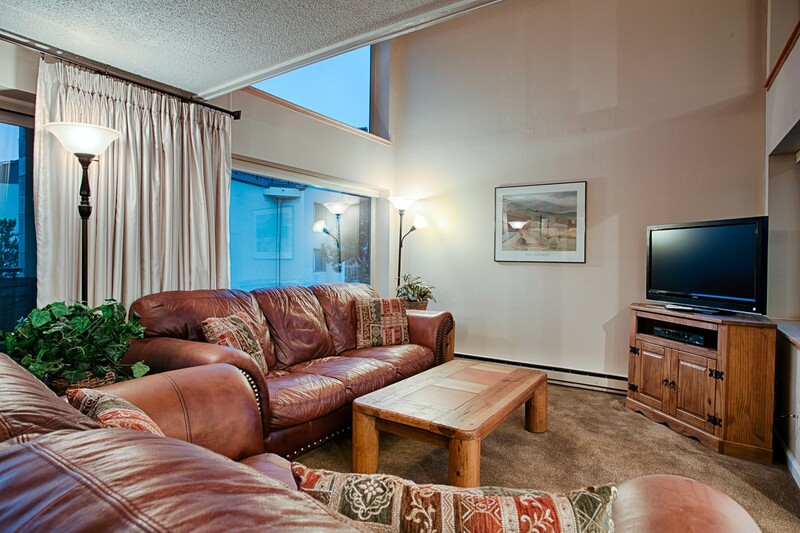 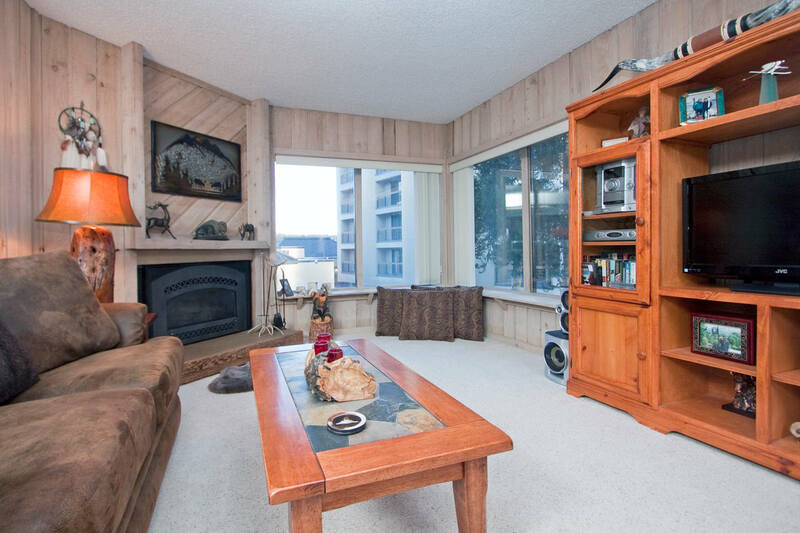 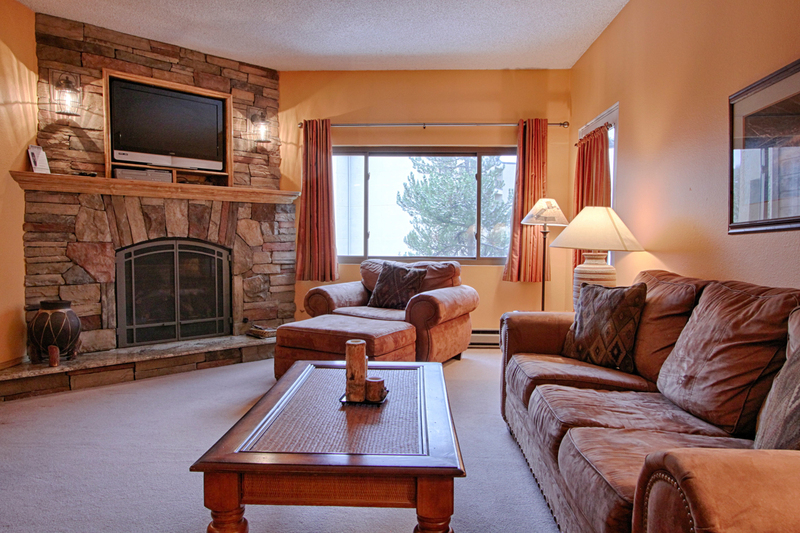 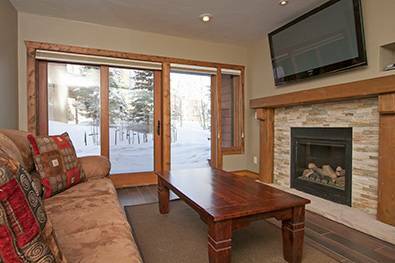 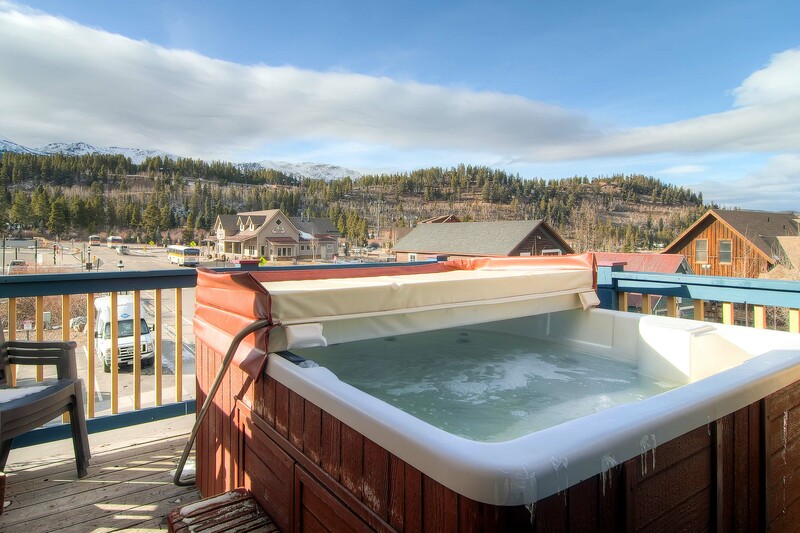 Step out the sliding doors to your private deck with a large hot tub and more views of Peak 10. 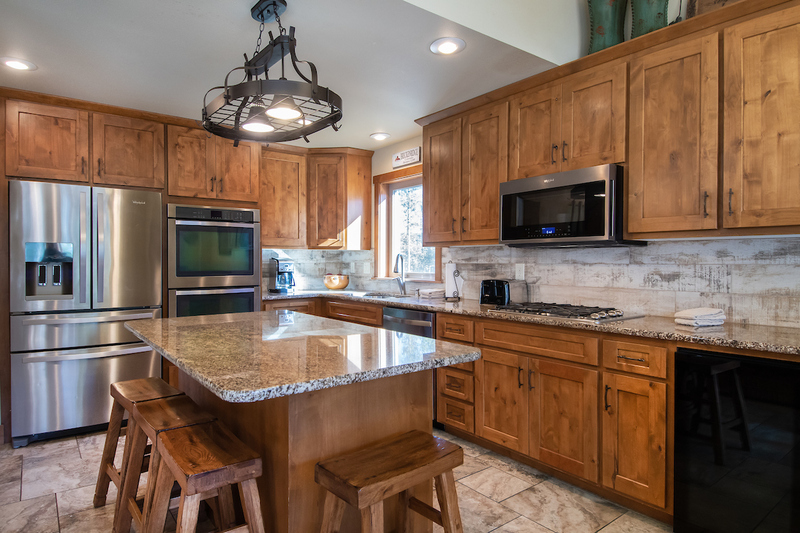 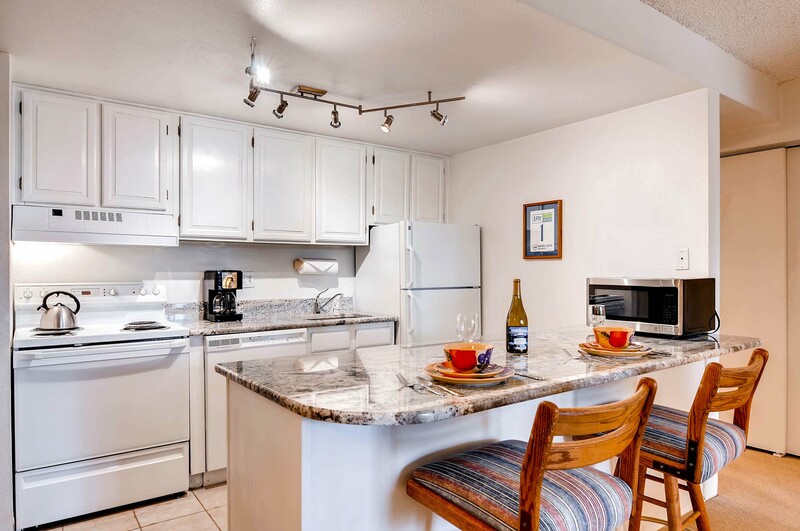 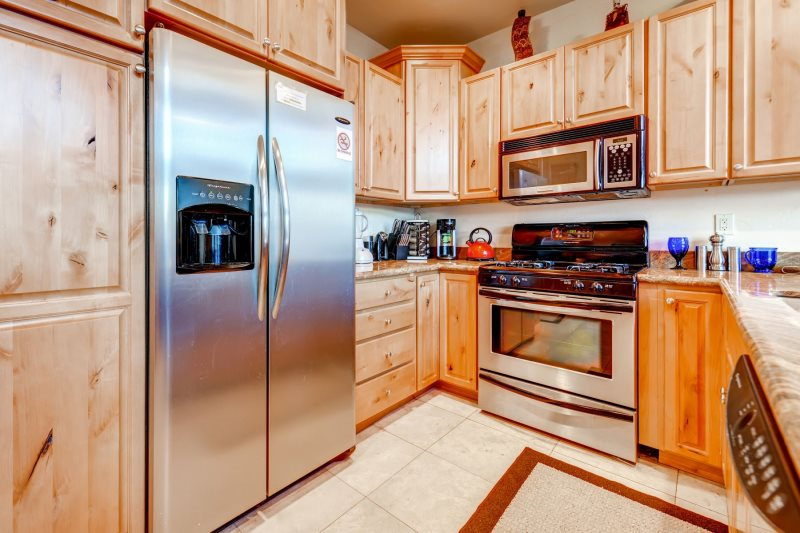 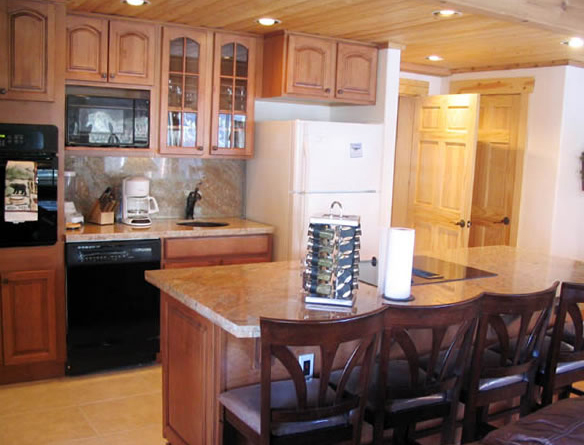 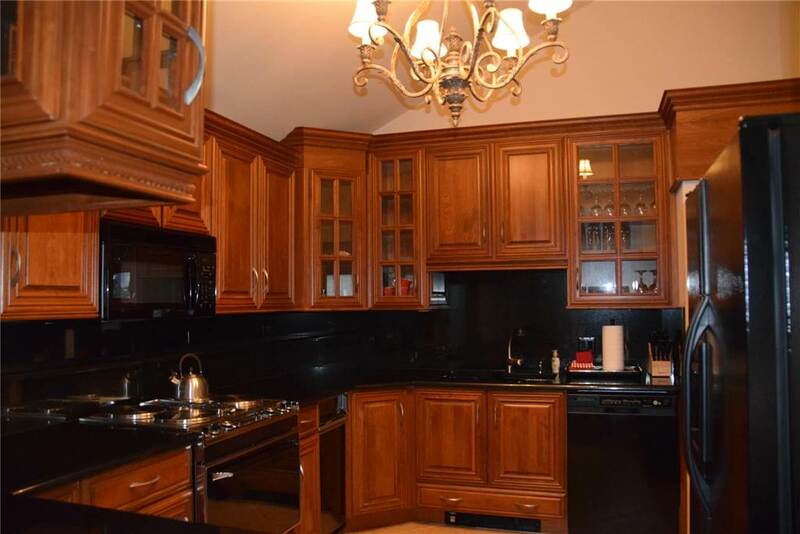 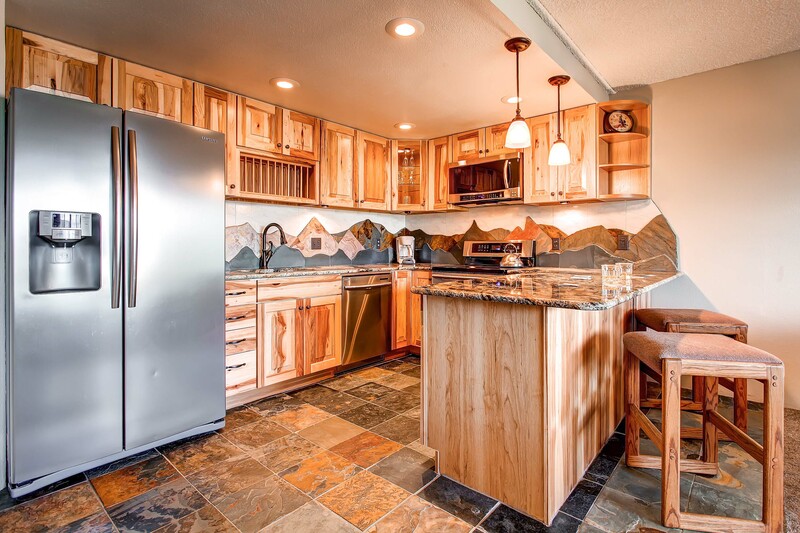 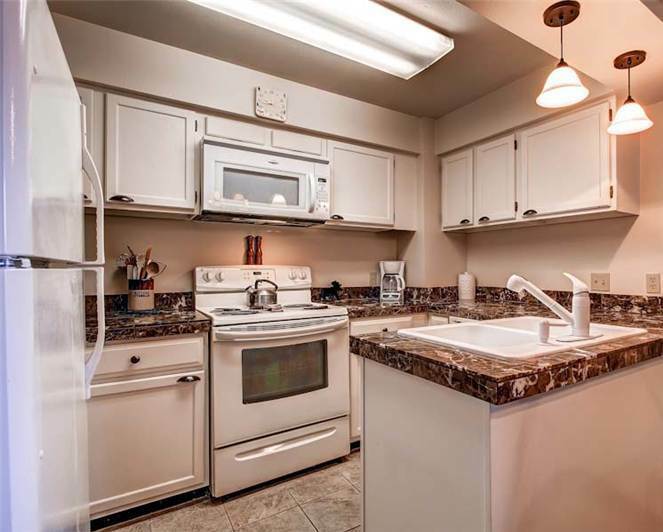 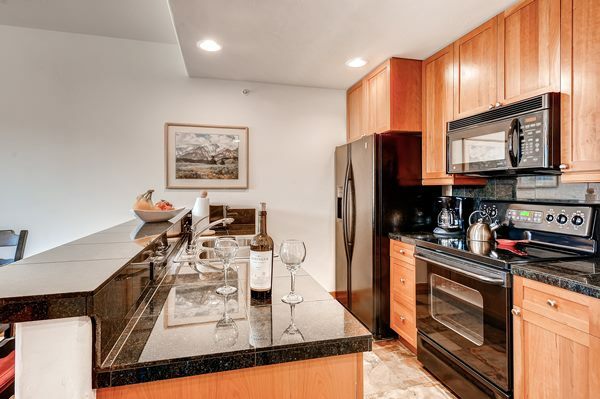 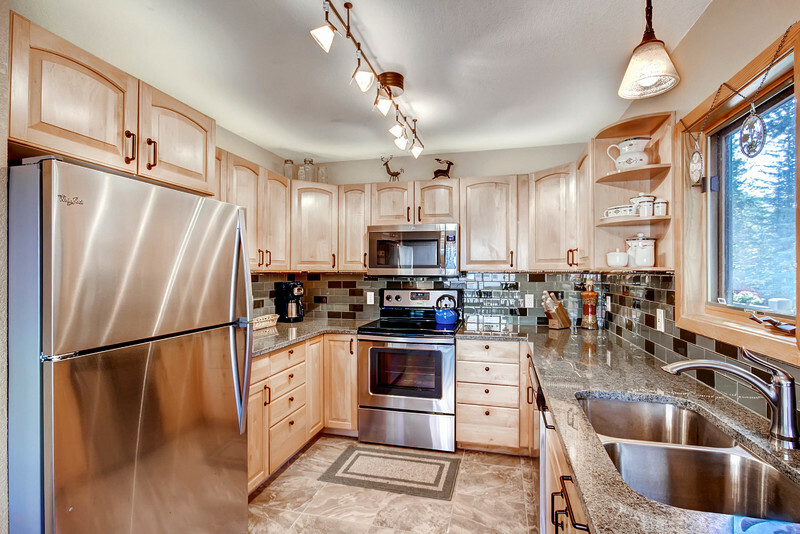 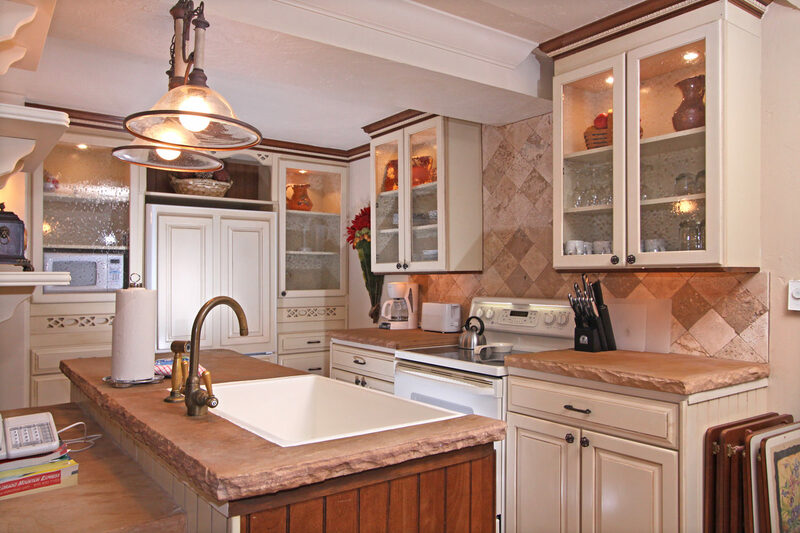 And look at that custom kitchen: a huge Viking gas range with double ovens, Viking refrigerator, granite counters, top-quality pots, pans and utensils — everything you need to make meals to remember. 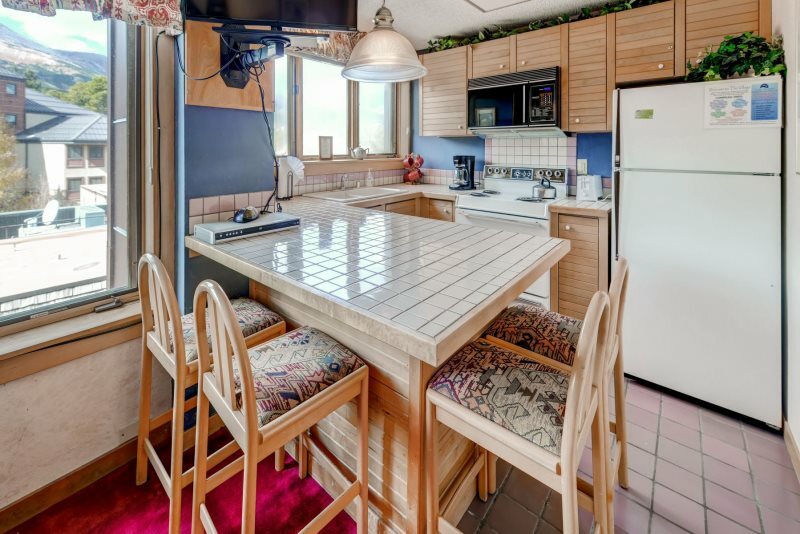 The dining table seats 12, and there’s room for three more at the counter. 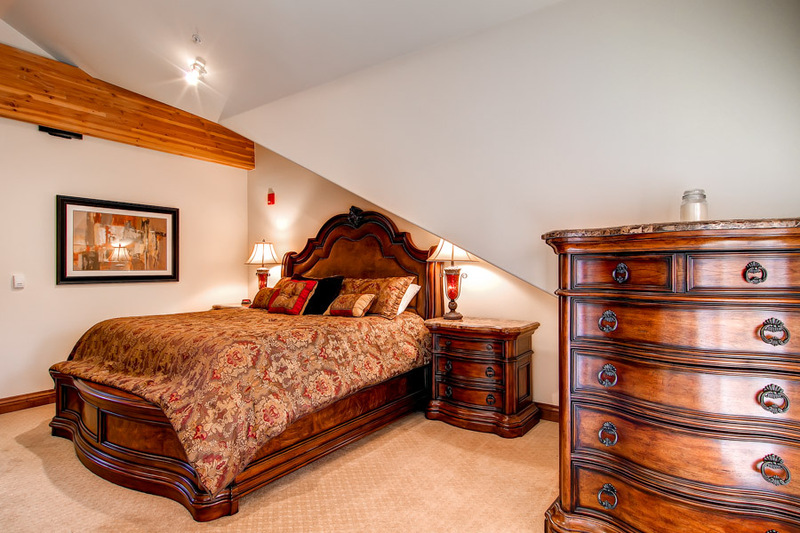 Also on the main level: a king bedroom (with private bath) and a queen bedroom. 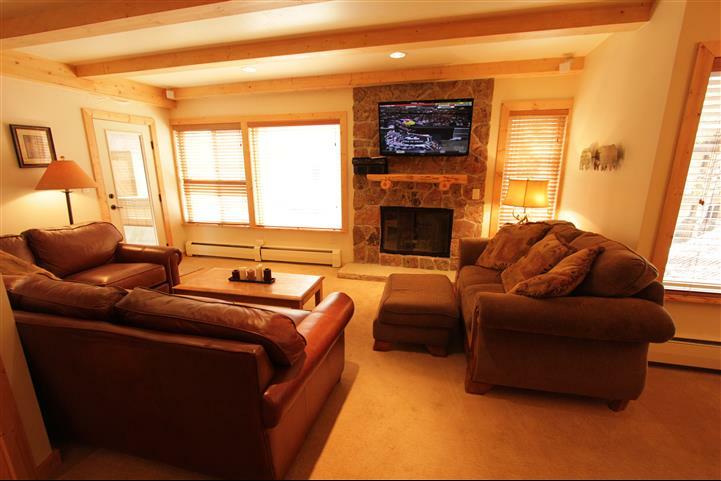 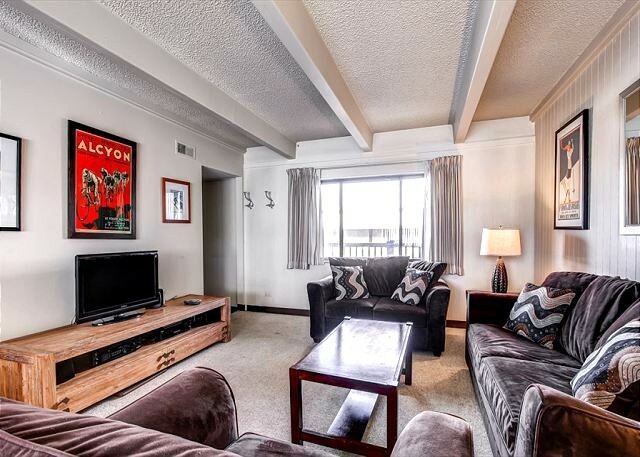 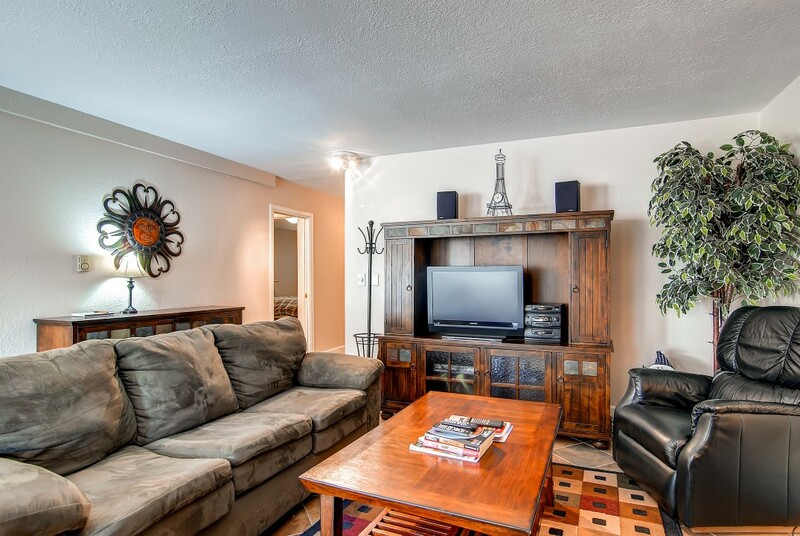 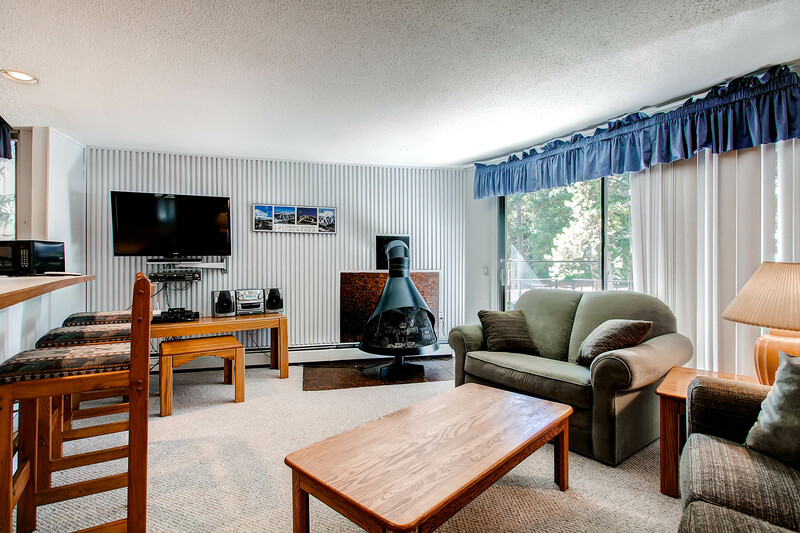 Downstairs you’ll find a fantastic game room with a pool table, bar-table seating and another large LCD TV. 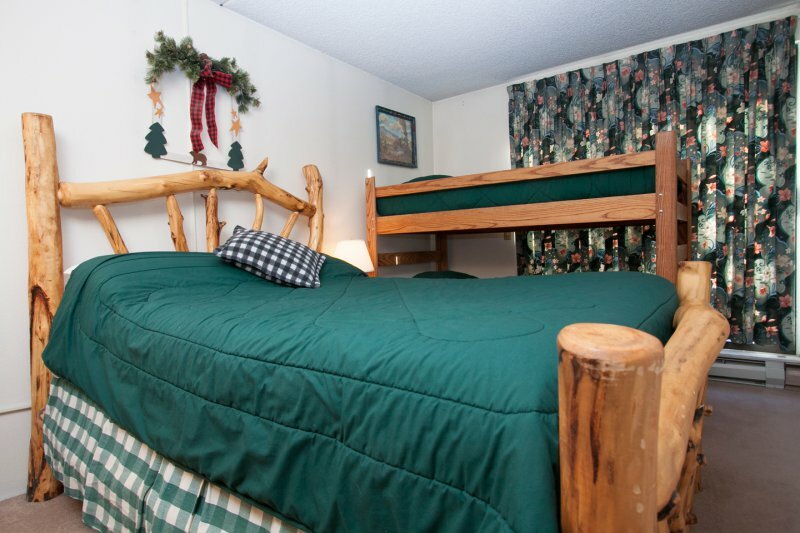 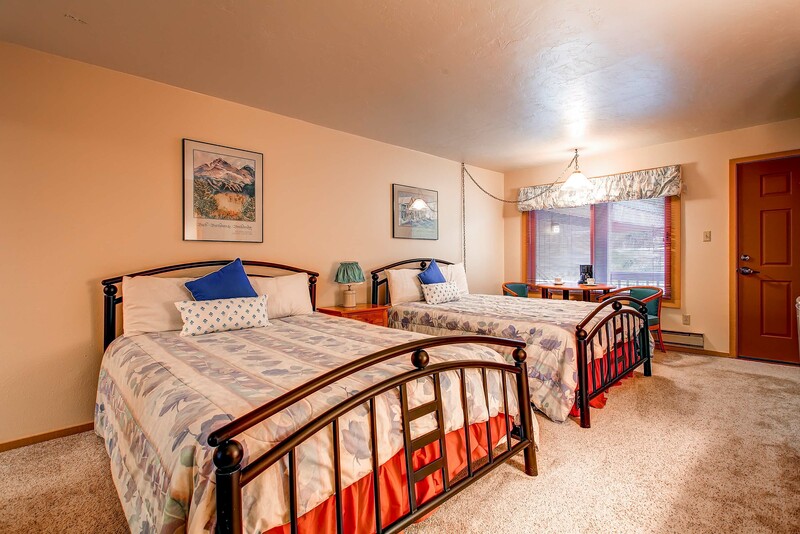 There’s also another king bedroom with a private bathroom, as well as a great “kids’ room” on the lower level that sleeps six — and another bathroom! 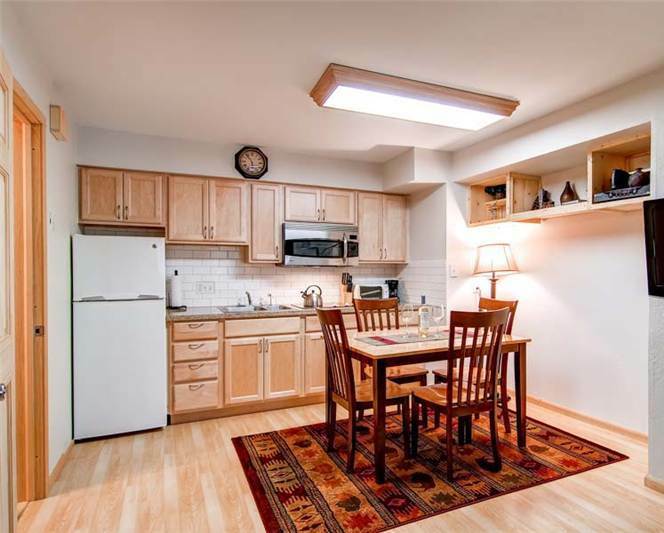 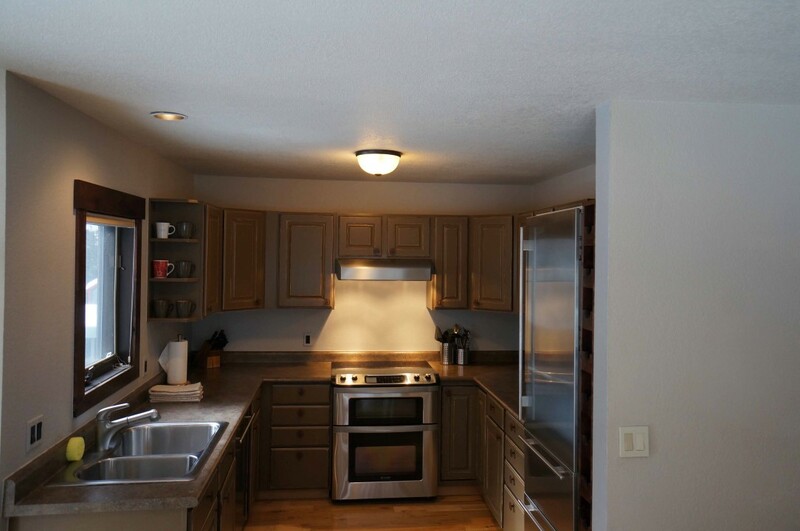 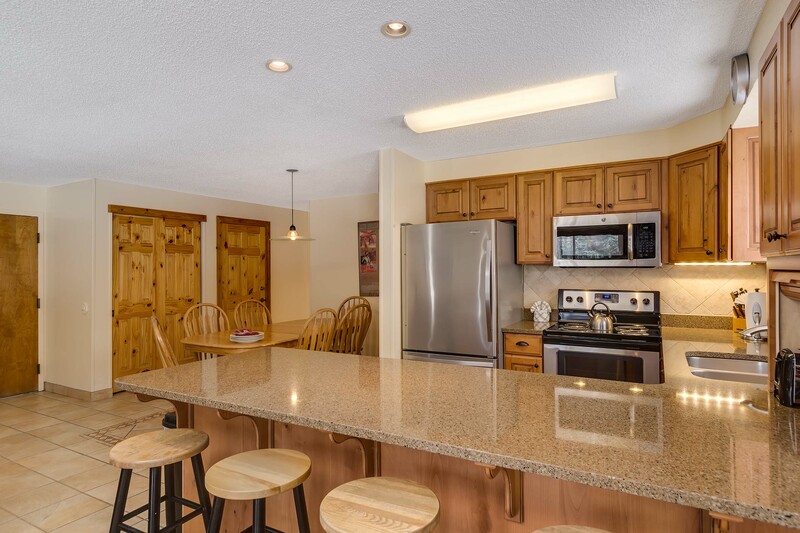 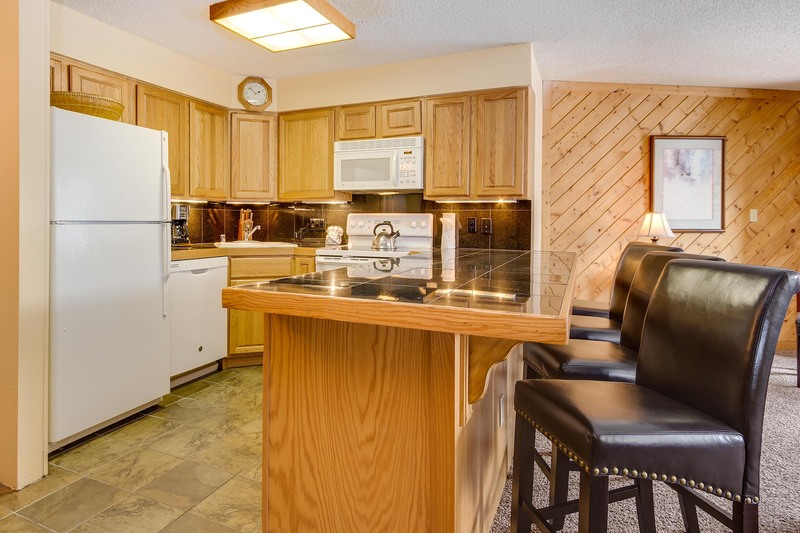 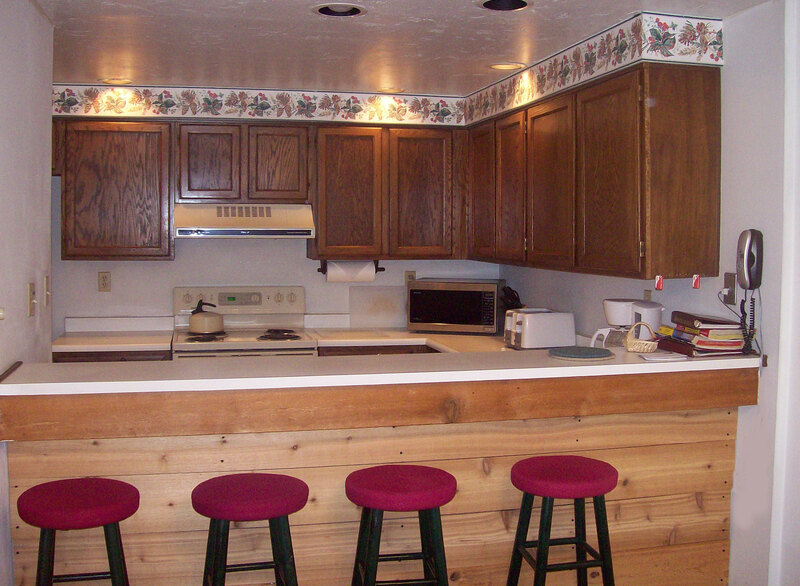 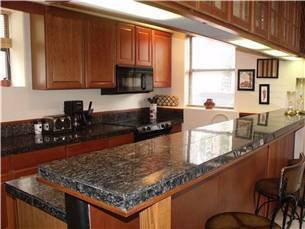 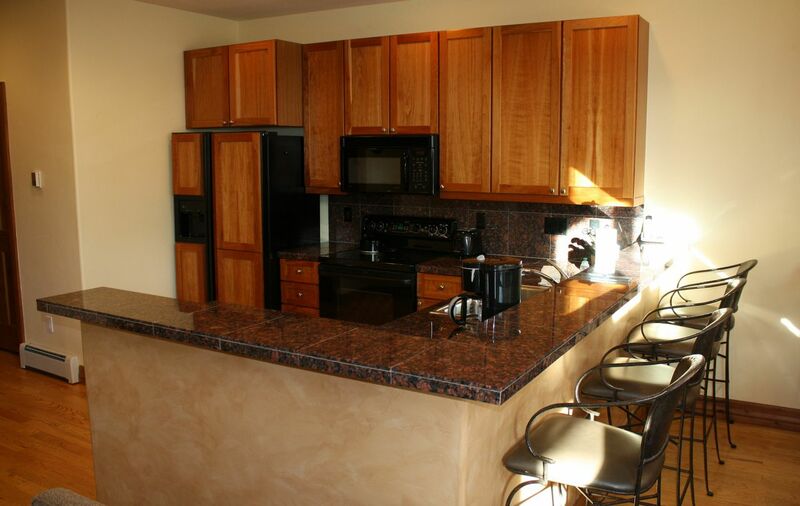 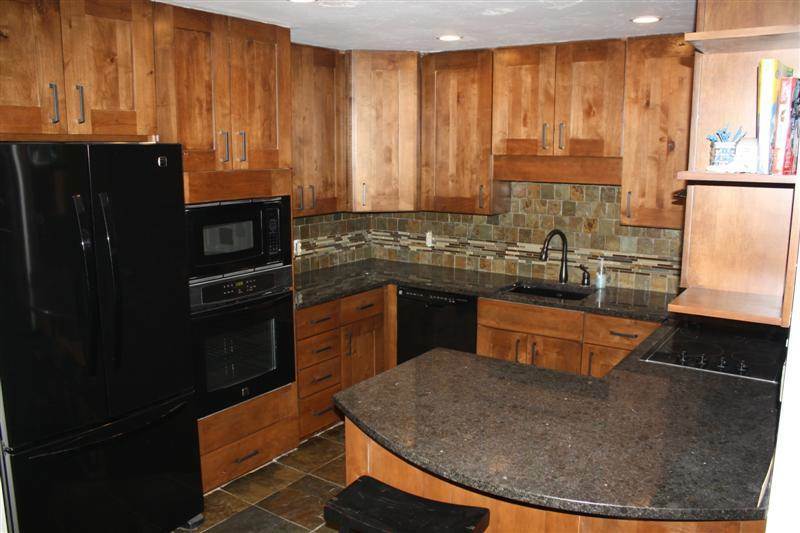 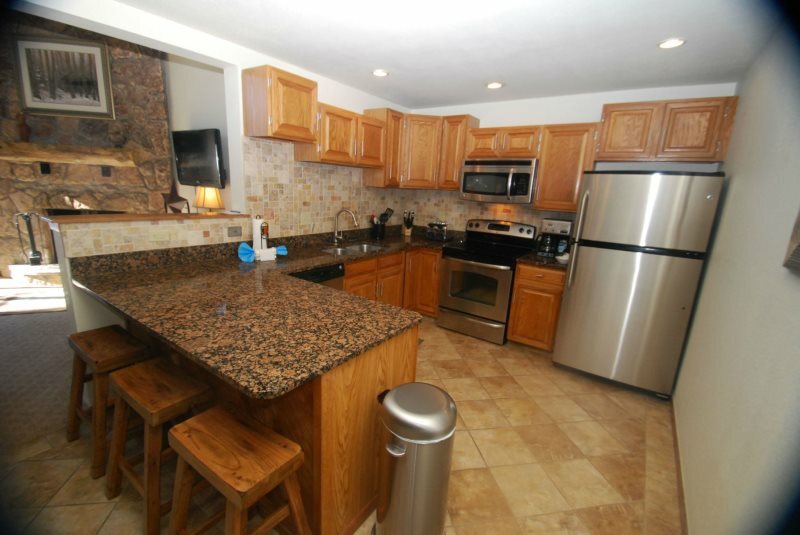 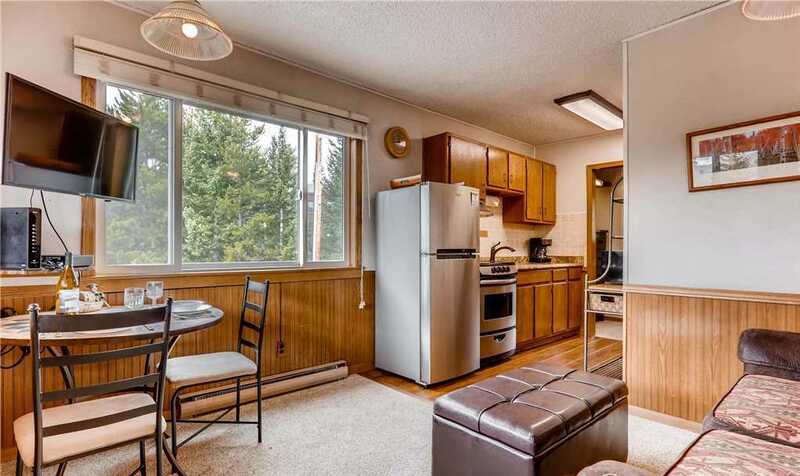 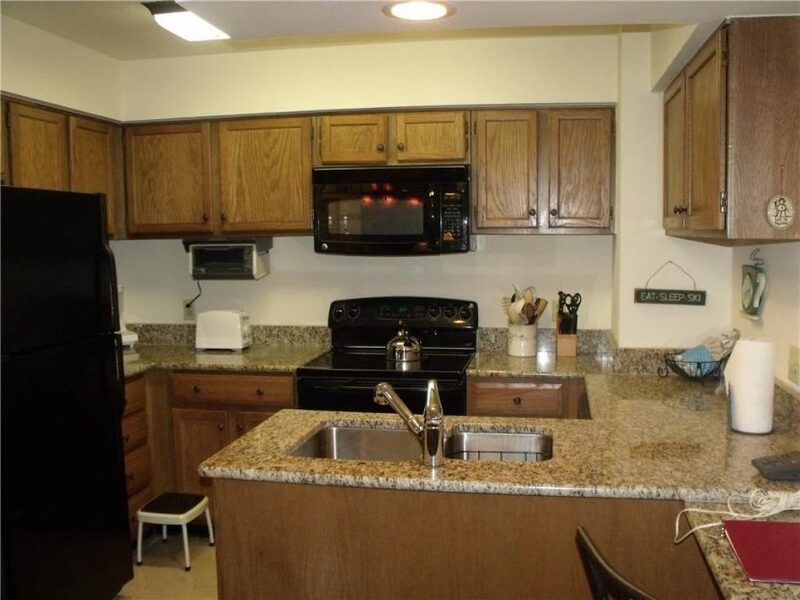 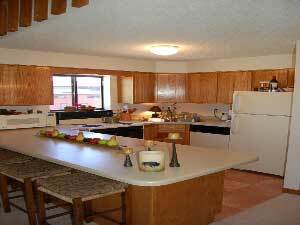 For groups this size, you’ll appreciate the laundry room with an oversized washer/dryer. 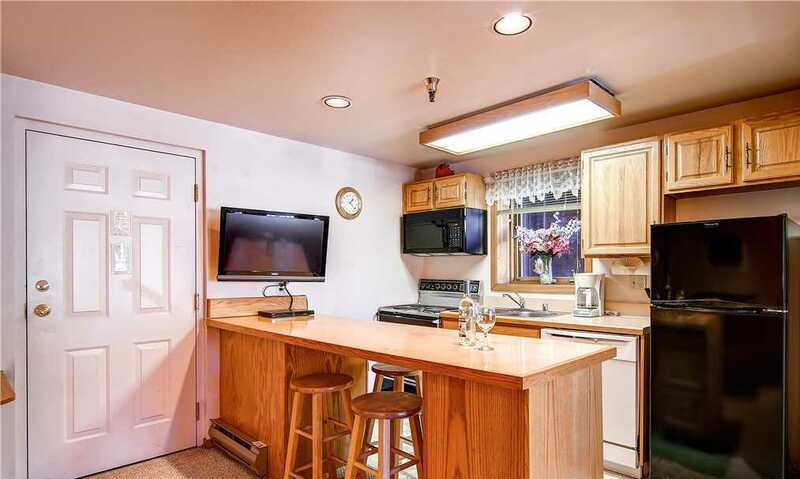 Other amenities: an oversized two-car garage (with plenty of additional driveway parking), a gas BBQ grill and complementary Wi-Fi throughout the home. 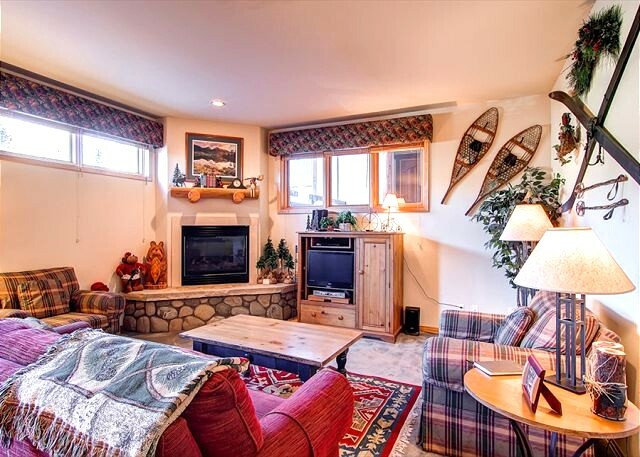 Oh, and the location is cool, too! 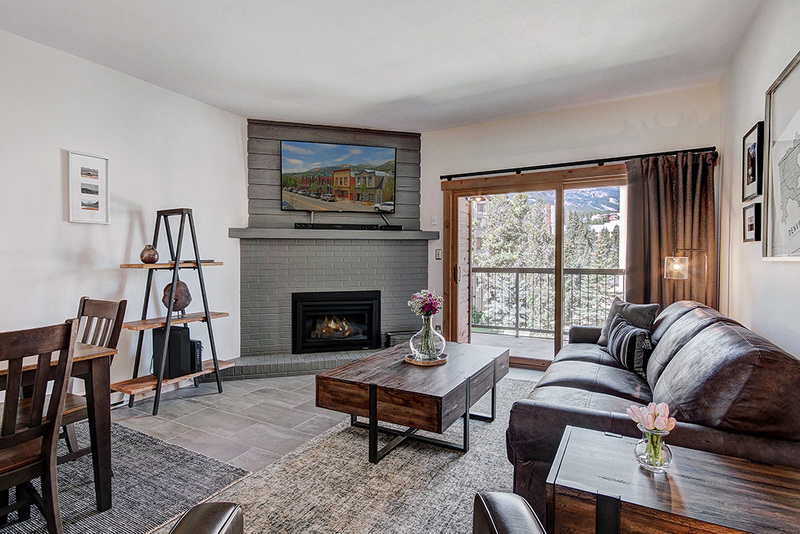 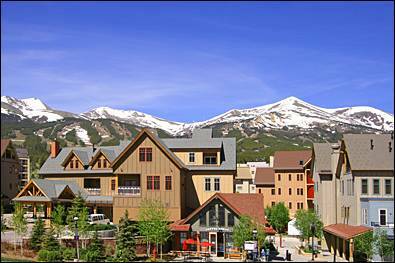 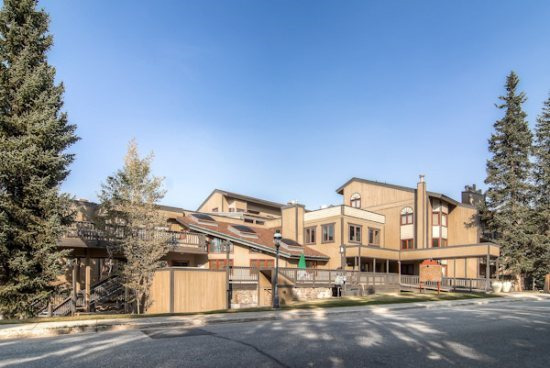 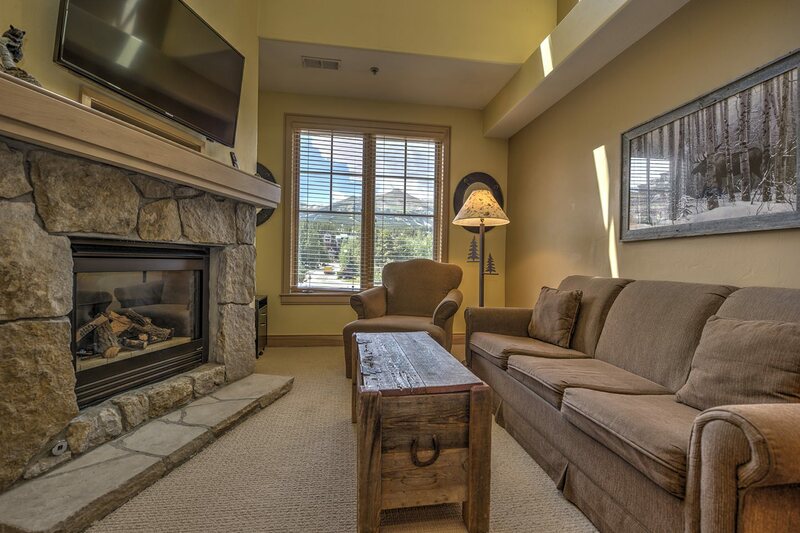 You get the privacy of a mountain retreat, but you’re just a six-minute drive from downtown Breckenridge and the ski area base. 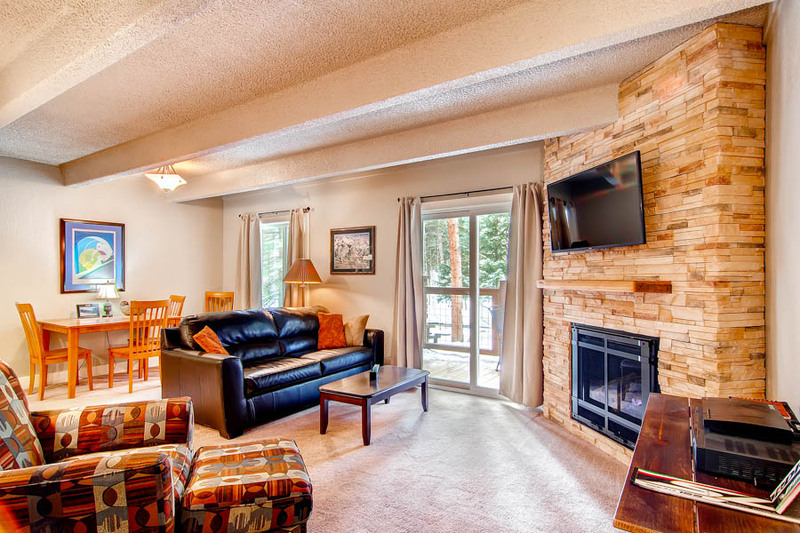 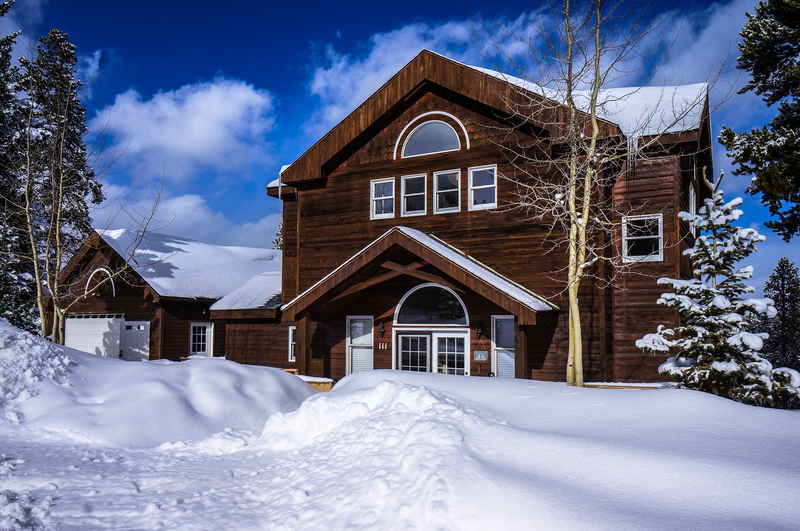 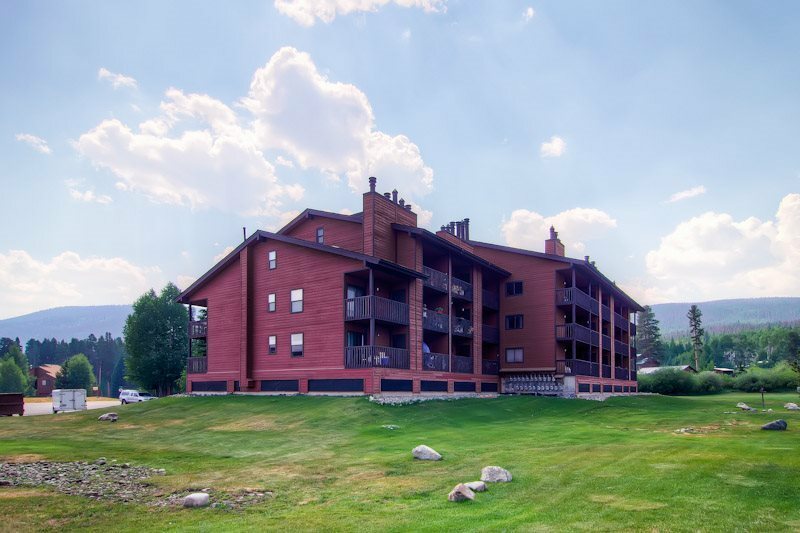 From your door, it’s just a short walk to the Arapahoe National Forest and several Nordic ski trails (and summer hiking trails). 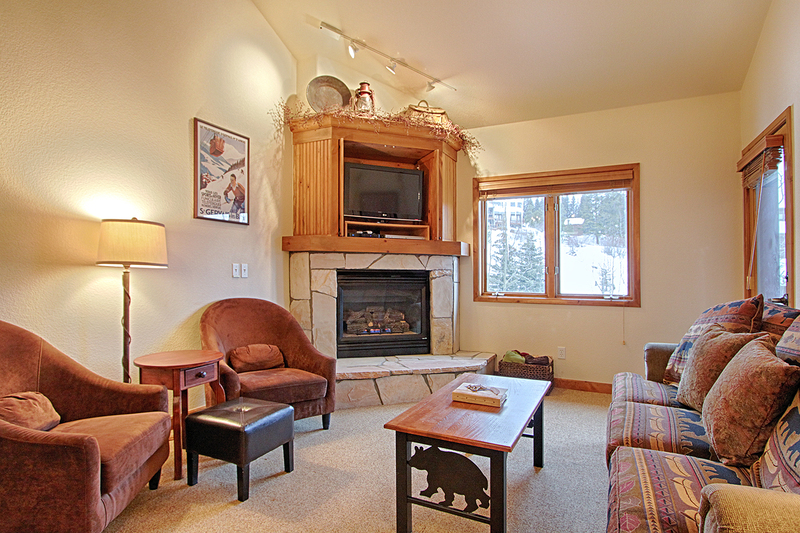 And, expert skiers can access the Peak 10 Falcon Chair slopes via a route a short walk away.